I’ve been writing Battle Reports since late July 2011. I played at least a dozen games (probably more) in 2005-2006 when I first got into Pirates CSG, but since getting back into it in 2011 I’ve recorded almost every game I’ve played in some way. 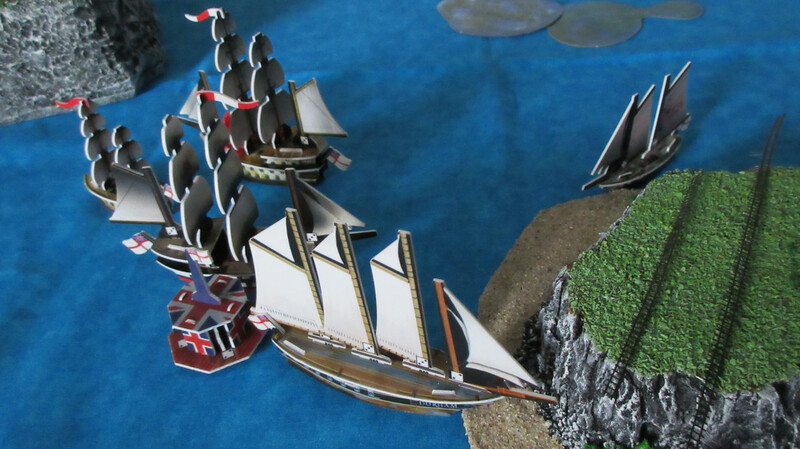 In this blog I will be posting battle reports of my adventures. I plan to release a battle report once per week every Friday. 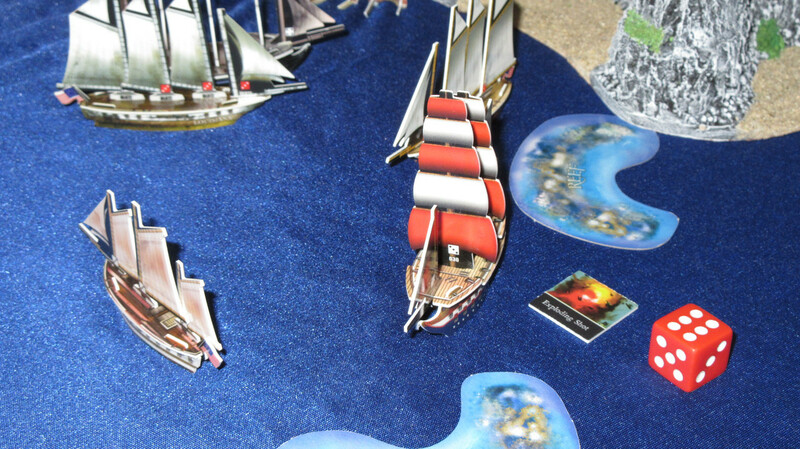 Check out my best battle reports in the Compendium and my biggest games in Huge Game Legacy. Please read the first post if you haven’t already! The first resource rolls! 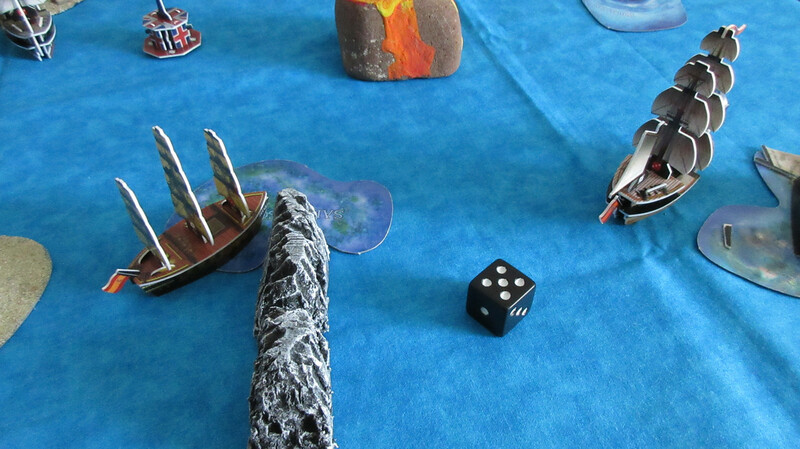 For the first 8 turns, fish would be the most valuable resource. 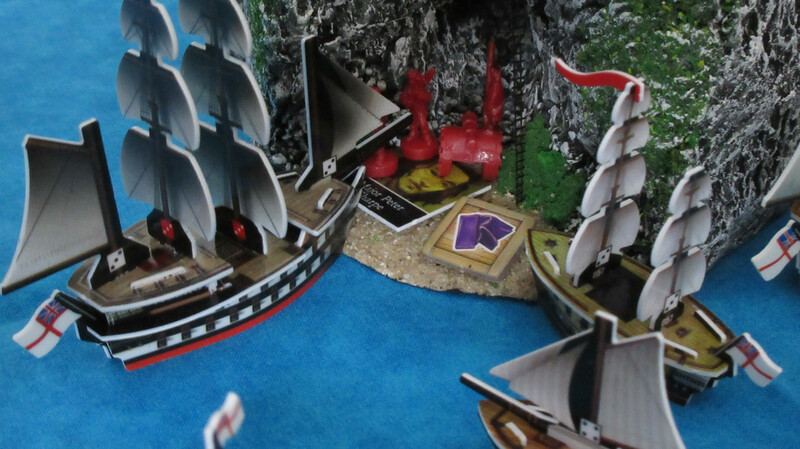 Introducing: Captain Mysion’s Pirate Kingdom! 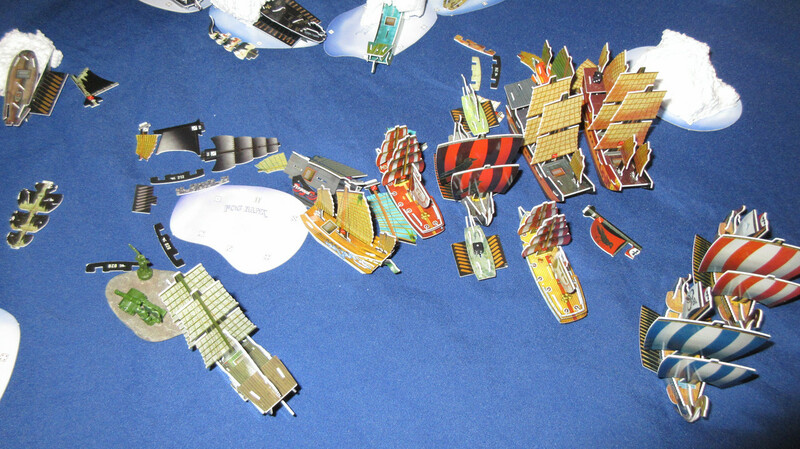 After being inspired by his flavor text, I made a Pirate Empire fleet to showcase what I thought of the idea. Now I’ve taken it a step further! 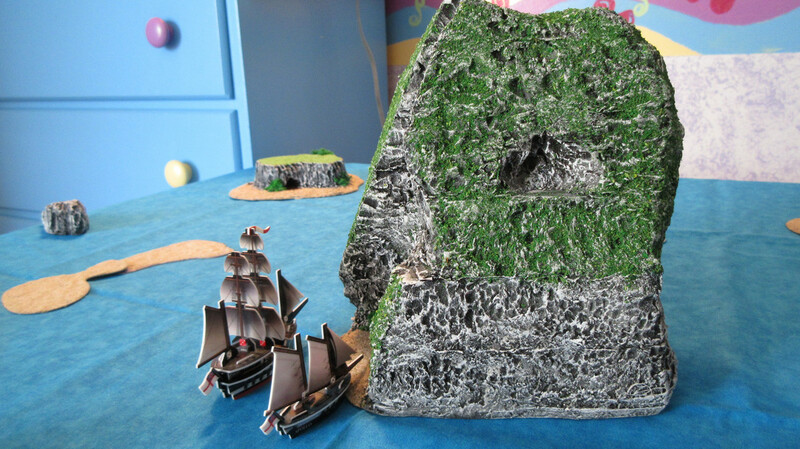 With a large piece of foam cut to form a hideout inside, as well as arch entrance and exit points, I now have a “Pirate Kingdom” in physical form!! 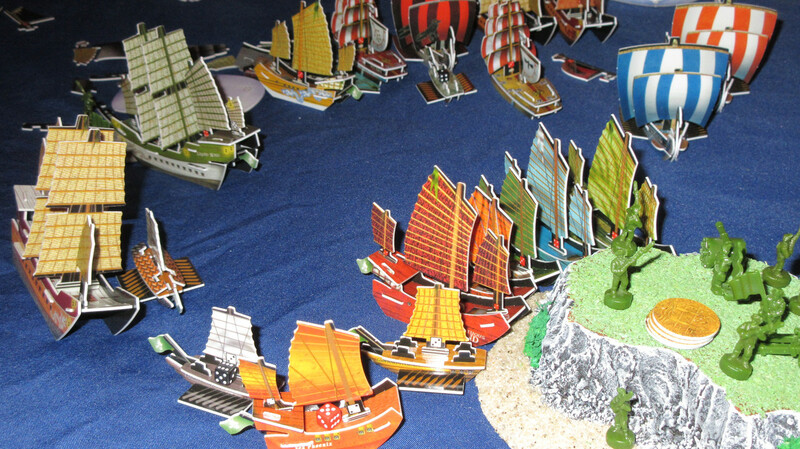 The self-proclaimed King of Pirates is either a genius or a buffoon, depending on which side you are on. Though many of his actions are inexplicable, they seem to work out for him in the end. 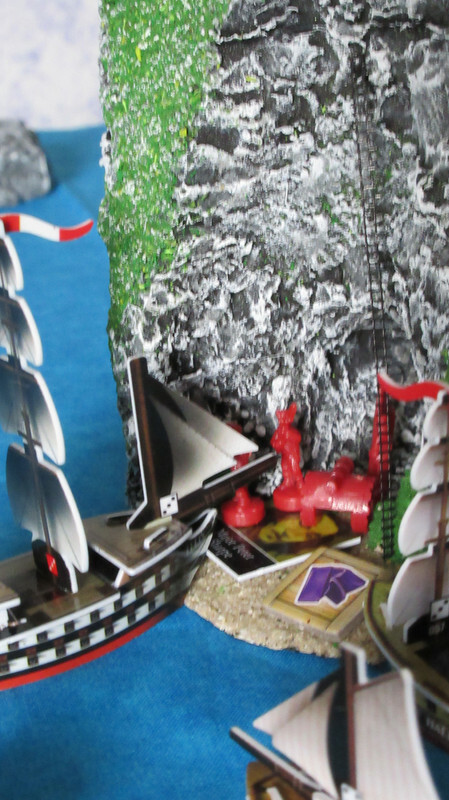 And when it’s all said and done he lords over the only defensive pirate haven in the world.A group of shipwrecked pirates stole a ship to escape their island prison, not realizing it was a secret Cursed vessel. 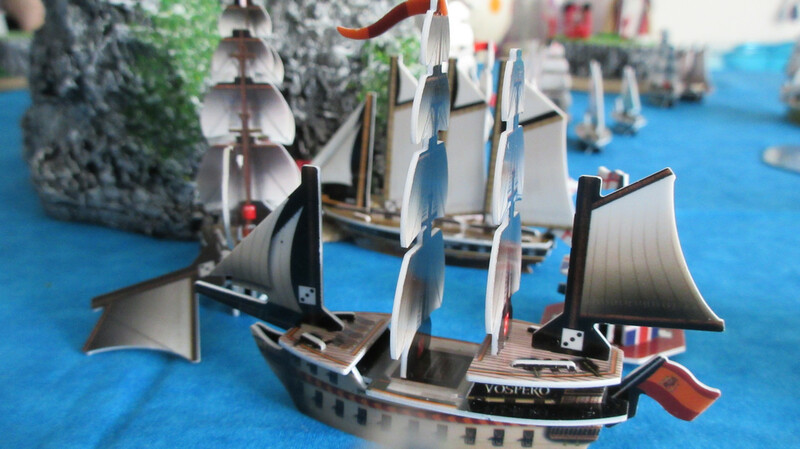 Taking it to Captain Mysion’s pirate “kingdom”, they received a hero’s welcome. At ship level now, this is the southern entrance (for this game) of the kingdom. Notice the imposing rocky walls that make up the archway leading inside. 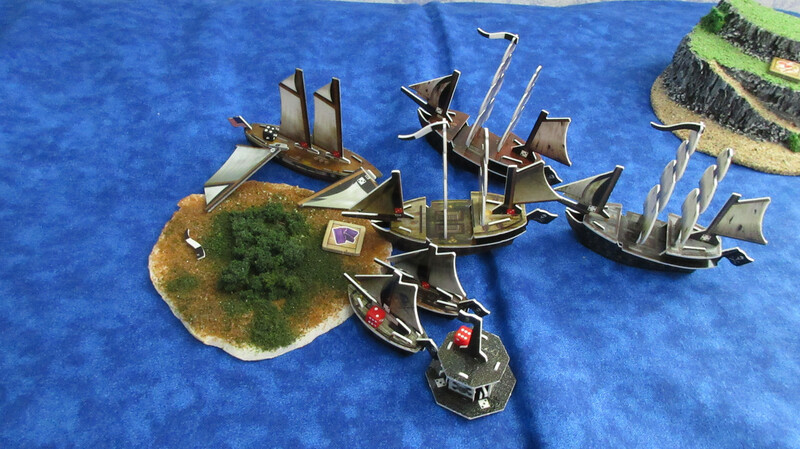 Sail too close, and yards may begin flying everywhere! Up close above the northern arch. This is just above sea level at the southwestern corner. 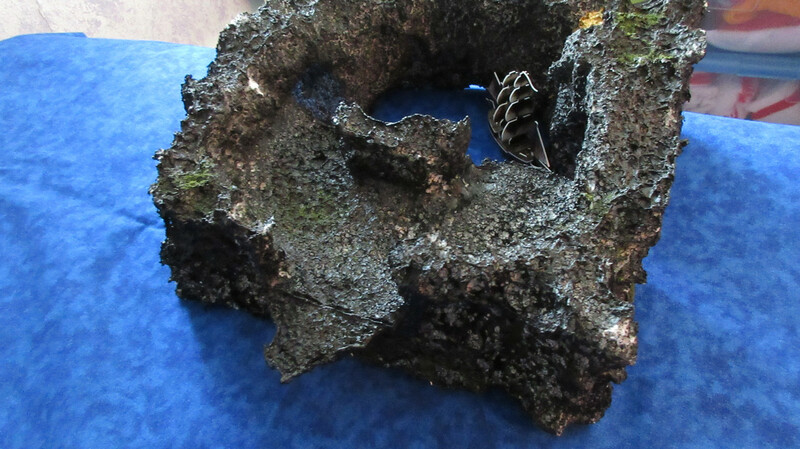 There is a foreboding deep cave, with some weeds and foliage growing in many spots of the formerly uninhabited rock. Another great view from above, showing most of the rocky haven. 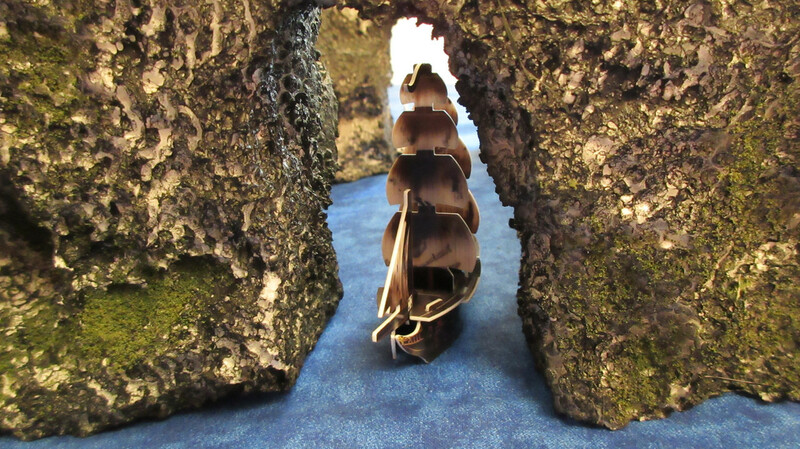 Notice the flat parts surrounding that high outcropping in the middle, as well as the shelf-like outcropping protruding from the western wall. A golden waterfall?!? Or, as Mysion likes to call it, his “goldfall”. 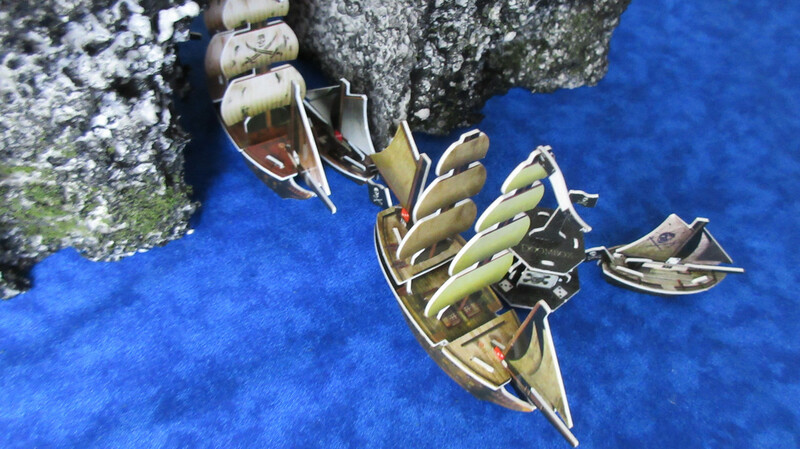 A view from the gold waterfall, showing the two Pirate sloops. As you can see, one of them is nestled in against the interior wall for superior defensive positioning. 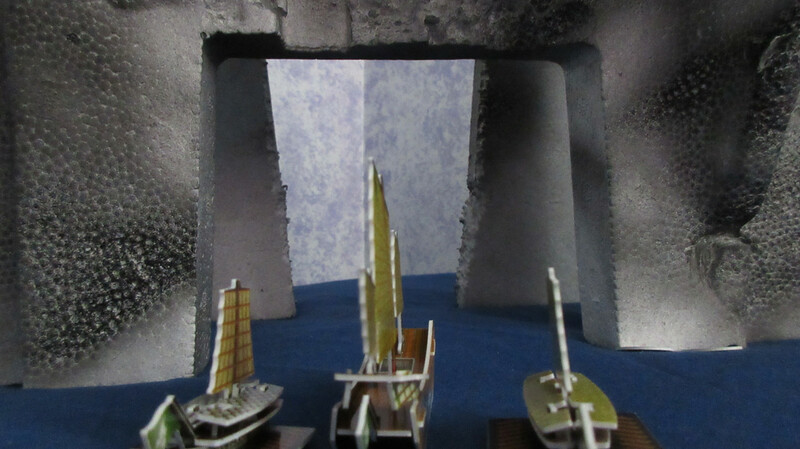 The other sloop is docked against one of the arch entrances, ready to sail out at a moment’s notice. 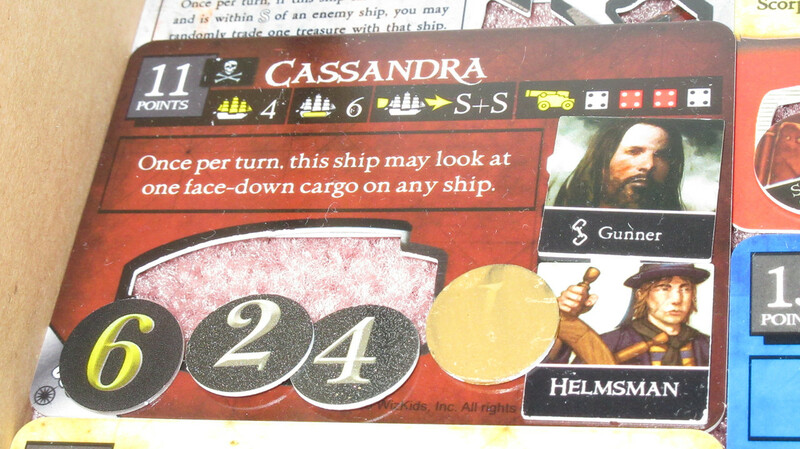 The “goldfall” leads straight to the Cassandra, and you guessed it – Mission is aboard! However, this is his Mysterious Islands iteration, and he’ll try to give extra actions to his new ship to make her extra effective. 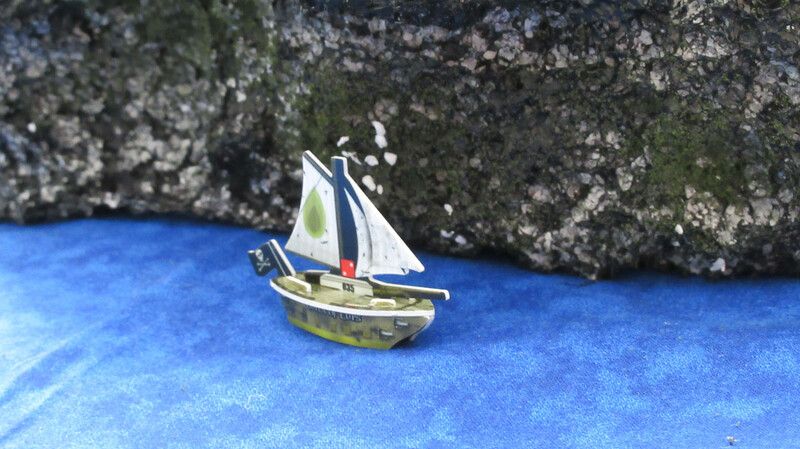 With great fanfare, Mission leaves his kingdom and sets out into the sea! What a great scene!! Mission’s helpers are currently the Smiling Jim and the Fancy. 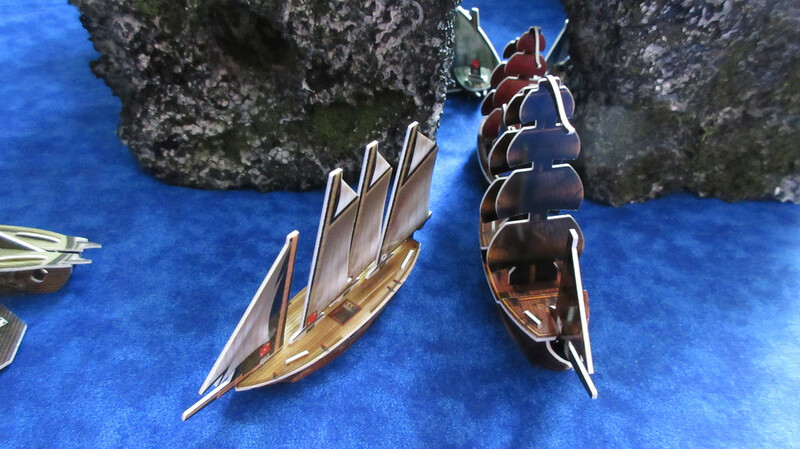 Both are speedy and accurate Pirate sloops, but neither can carry much cargo. However, the Cassandra certainly can! 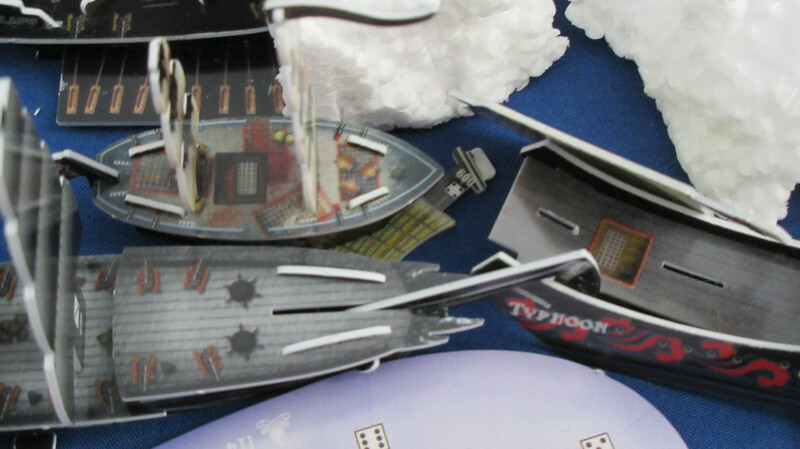 This was all part of Mission’s plan for such a new area – as long as he kept the goodies in his personal stores, the crew on the other ships couldn’t tempt the others into coming aboard and leaving Mission. A clever Pirate indeed. 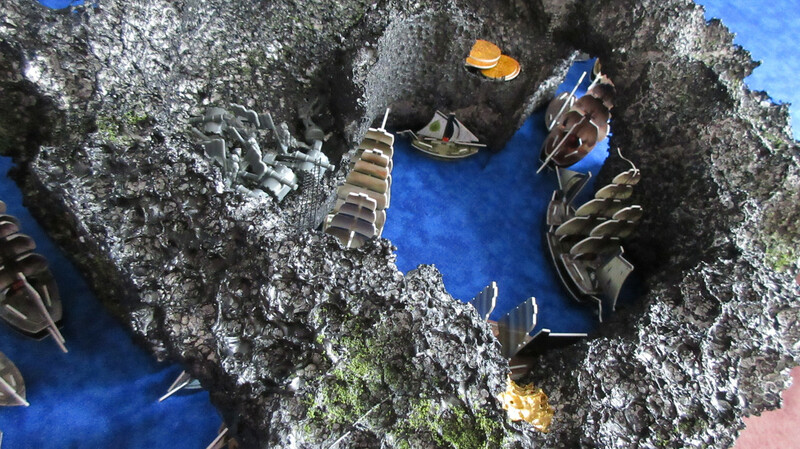 Clever enough to not only find such an amazing natural defensive structure, but exploit it to the point of making it a powerful pirate base. But this isn’t just a party for pirates, now is it?! Look who’s here: the Jade Rebellion is back!! 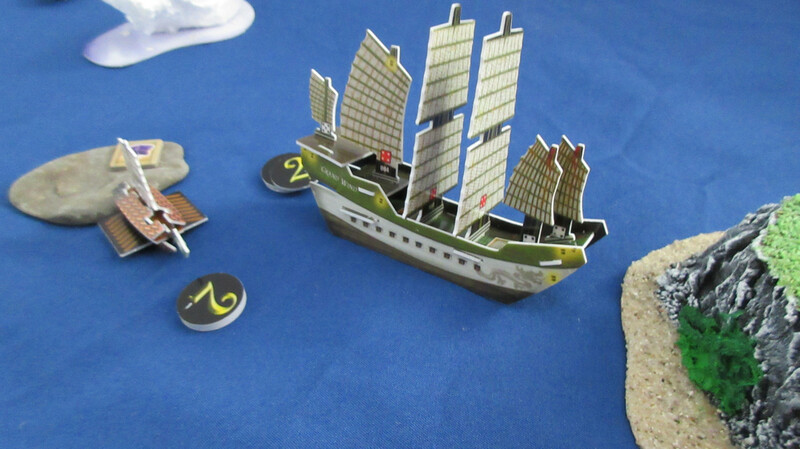 On their own once again, the Jade Rebels are looking to avenge a frustrating loss in their own home waters of the South China Seas during the Experimental cumulative game about a year and a half ago. 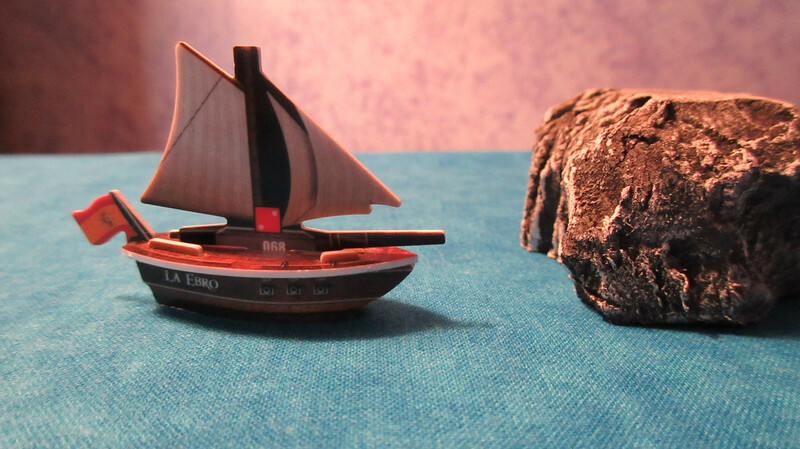 Leading their efforts this time around are two brand-new ships to my collection: the huge GRAND WIND and the Sea Snake! 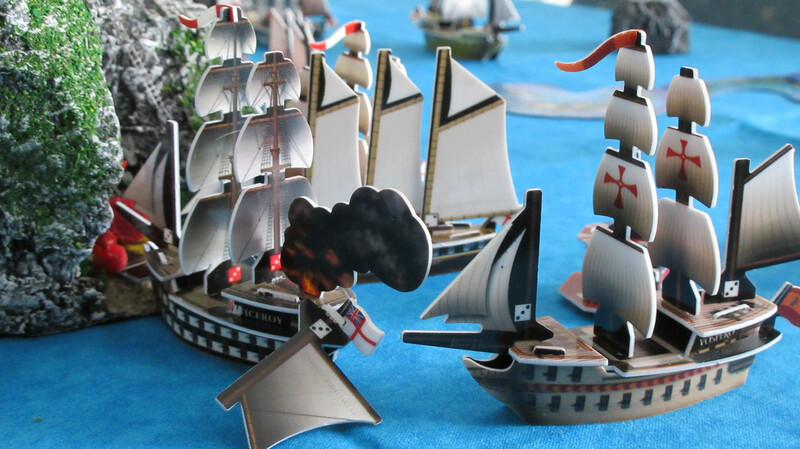 Warlord Cavendish commands the Grand Wind, with a helmsman aboard to make the ship sail at an acceptable pace. Well, kind of. 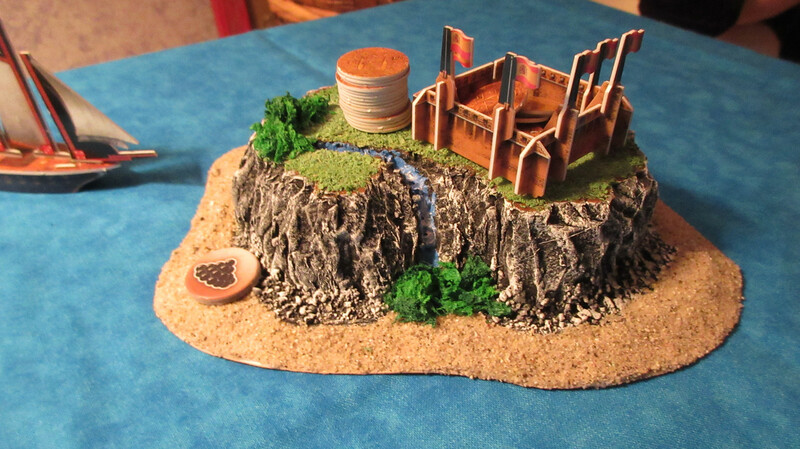 XD Due to space constraints and another factor, it doesn’t resemble the Caribbean at all, but more a tiny snapshot of one fictionalized area of the Caribbean. By fictionalized, I mean that there are a couple Caribbean-type things involved, but they aren’t in their regular locations and the scale is tiny. 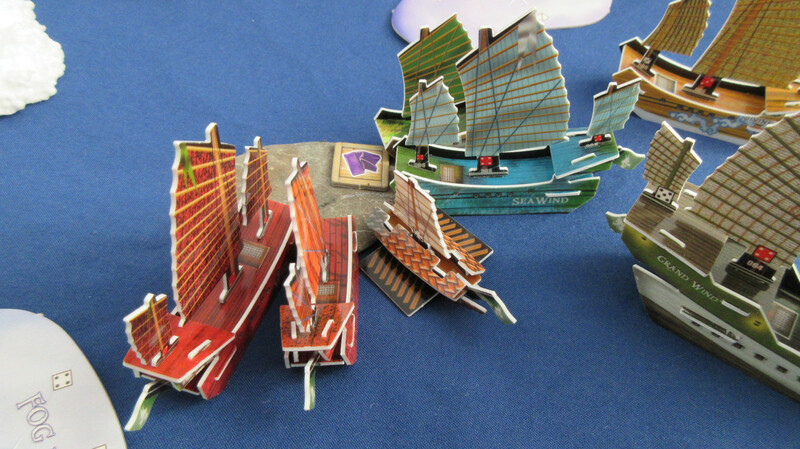 (as it had to be, unfortunately) For the purposes of turn order and sequence, this is also known as Ocean #2. Clearly the English have arrived! 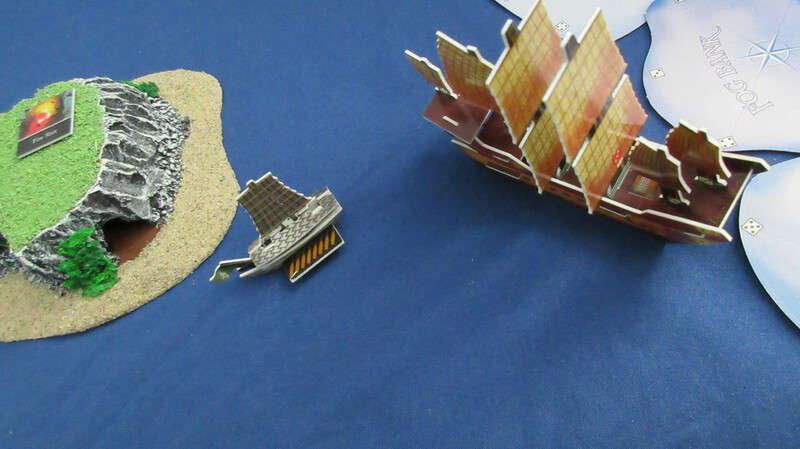 They sail in on two more ships that I built just before the game started, as I usually try to do with physical campaign games. 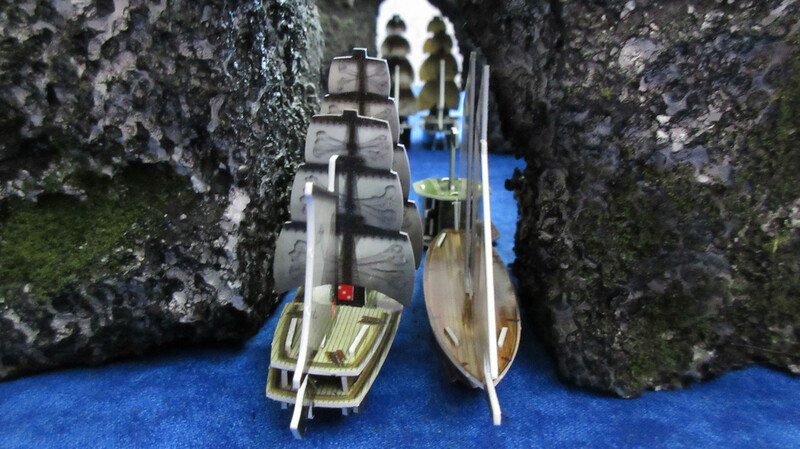 HMS Viceroy and HMS Apollo have officially entered Royal Navy service, and they are eager to prove themselves in such fine and beautiful waters. Speaking of beautiful, check out their home island! 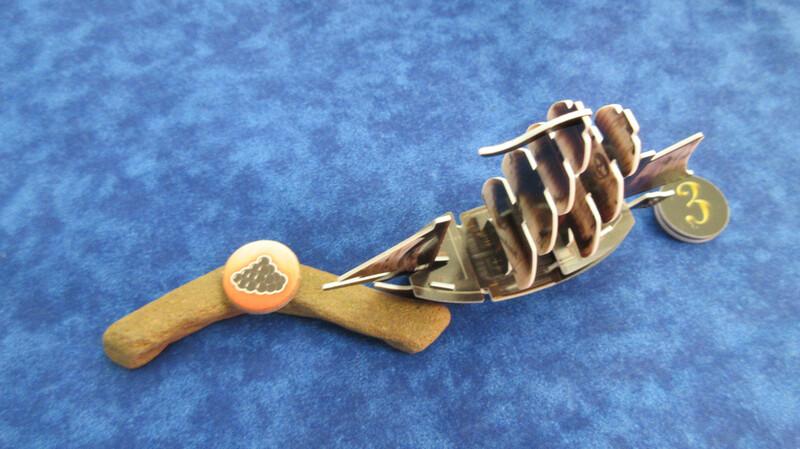 You may recognize the style and aesthetics of it, and indeed it is yet another creation from Ross in AZ. You are probably impressed, but don’t be jealous of me – you can get some too! He sells (and sometimes trades) them; check out details on his Facebook page. 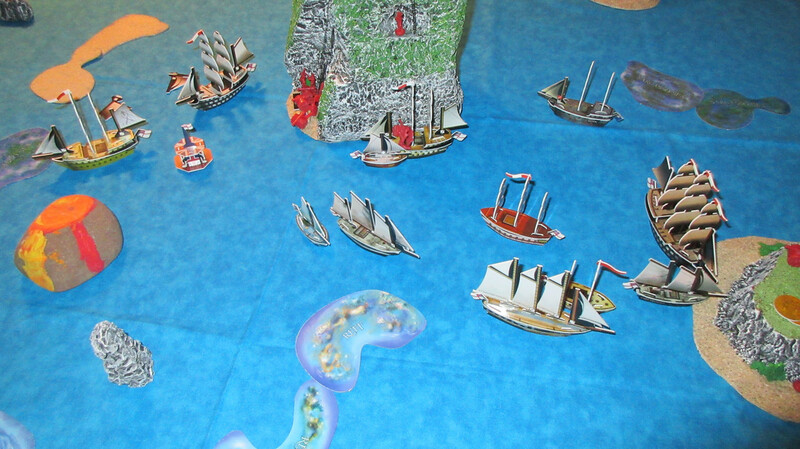 The English depart from Port Royal, looking for ways to maximize English wealth and territorial claims. Ohhh boy!! Spain is back in action! 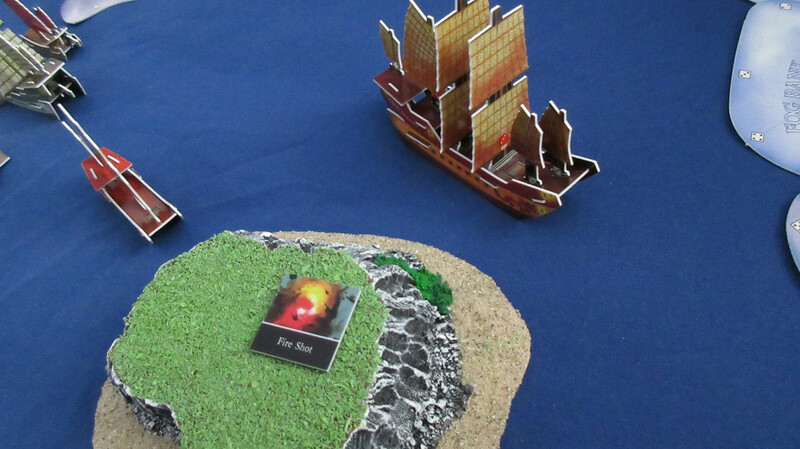 After a dominant showing in the first VASSAL campaign game, they’re off to a HOT start in the third one. 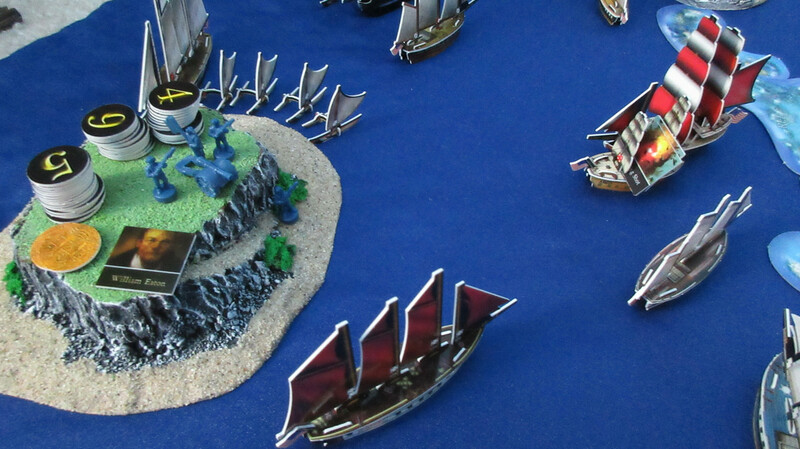 Now they’ve invaded the Caribbean and look for another victory! 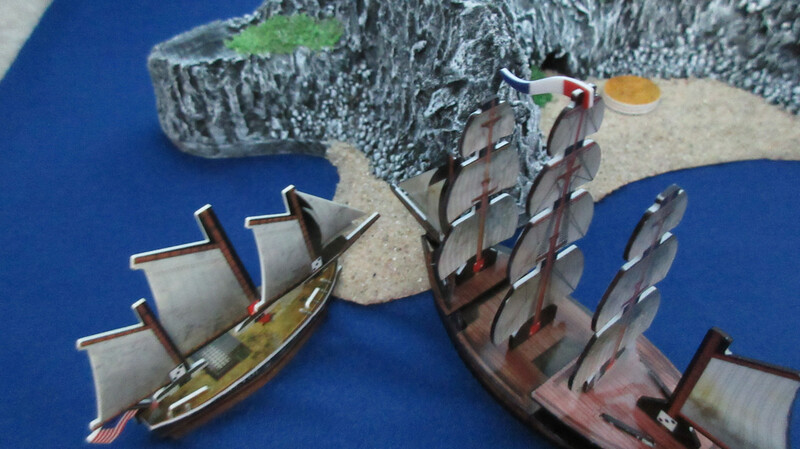 Setting sail from their home island of Hispaniola (thematically), the Spanish fleet contains a familiar ship: the San Estaban! 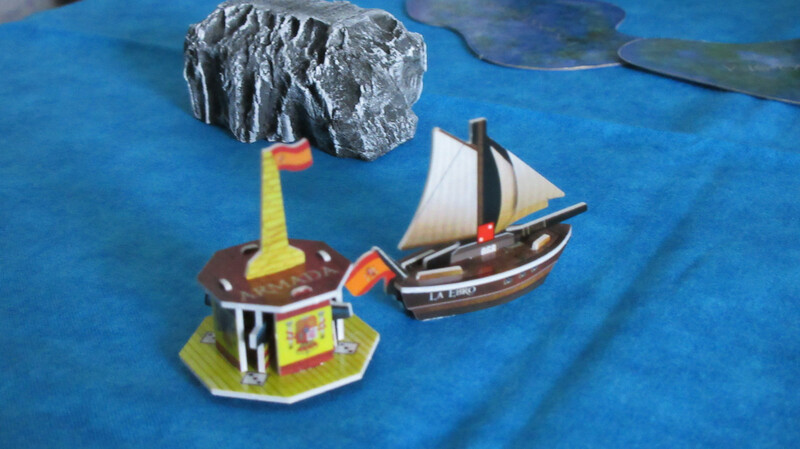 This ship was one of the luckiest ships ever during my Economy Edition game two years ago, so naturally the Spanish are looking to capitalize on the ship’s rich history and surprise unknowing opponents. 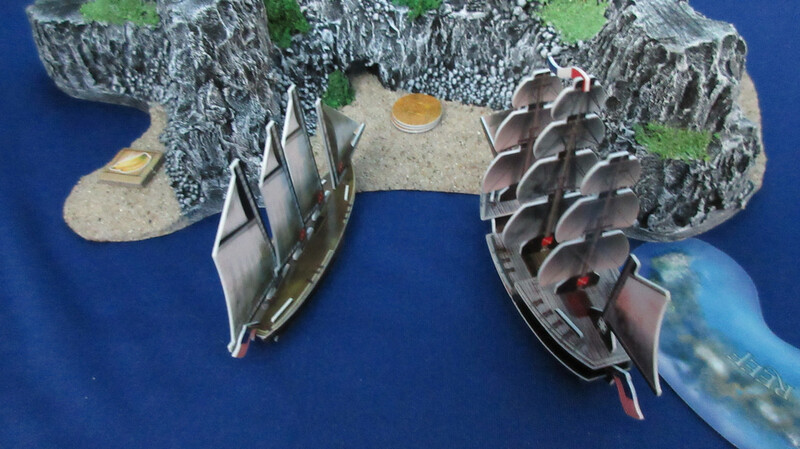 Joining the San Estaban are the Magdalena and La Ebro, good sloops from subpar sets. Obviously they are using another island from Rossinaz, while in the background you can see a little preview or “taste” of the Caribbean. 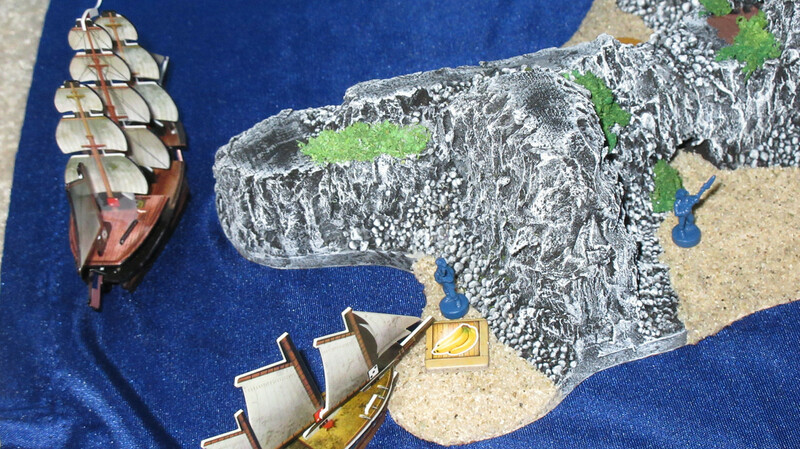 A dangerous rock lies in wait, while my handmade sandbars are to the right. 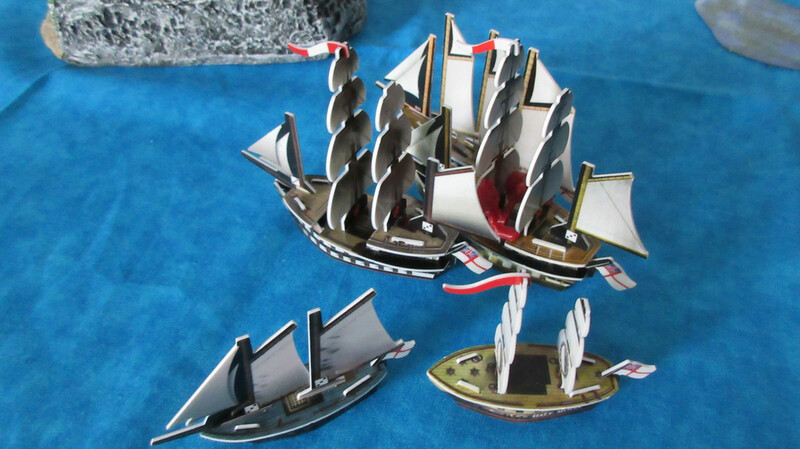 The Spanish split their fleet into three, so they can explore more than one area of the Caribbean at a time. The crew of the Ebro spot the imposing rock, whose height is nearly the same as the Ebro’s single mast! 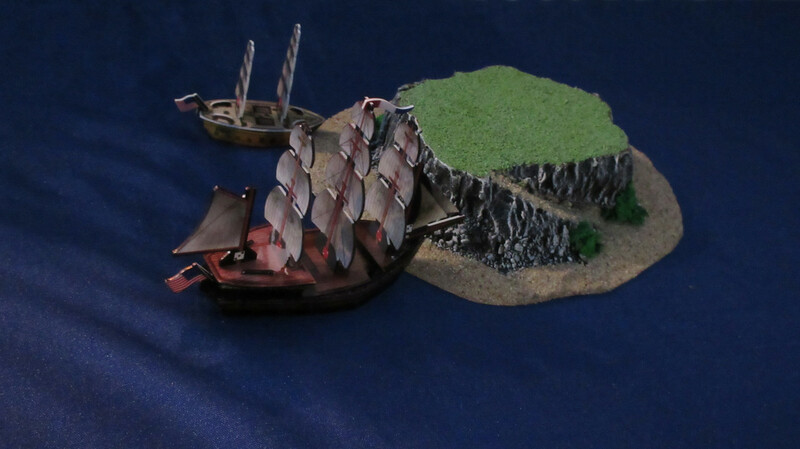 Before we leave the Caribbean for now, a note about the oceans: as you can generally see already, I am using a combination of completely fictional locations (Sea of Allost) along with a small but pseudo-historical real location (Caribbean). I realize this mix of reality and fantasy is not for everyone, but I can promise you that it will be worth it. Just keep reading. It’s here! With an absolute bevy of ideas percolating in my head over the past few weeks, the Harbor makes a grand entrance. 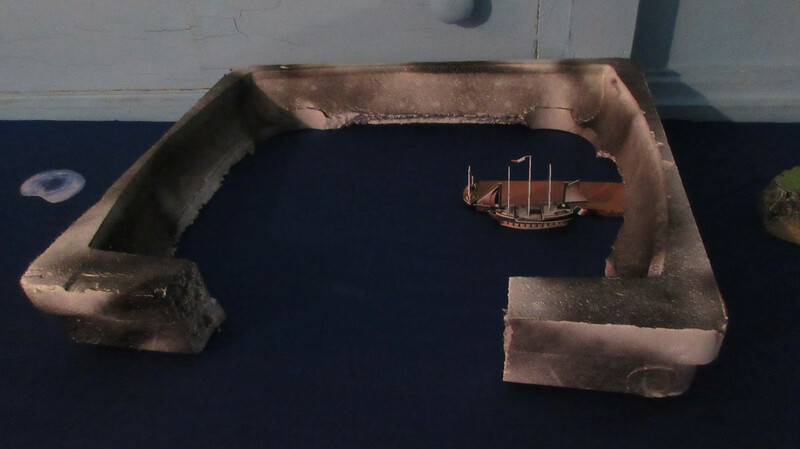 The Harbor was cut from a large piece of foam, as the middle chunk was easily removed to leave a massive frame that works great as a defensible harbor. 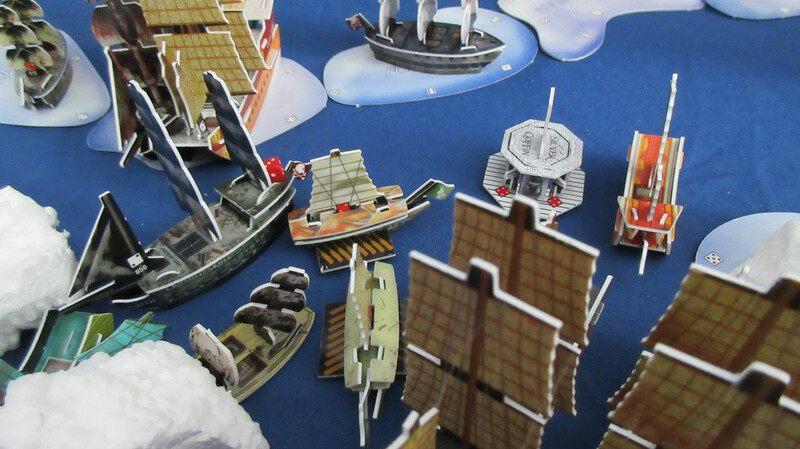 In this Sea of Karkuda (name subject to change, also Ocean #3 for playing purposes), the French have arrived to build a massive harbor complex that eclipses the engineering feats of just about all other factions in any “game” ever. 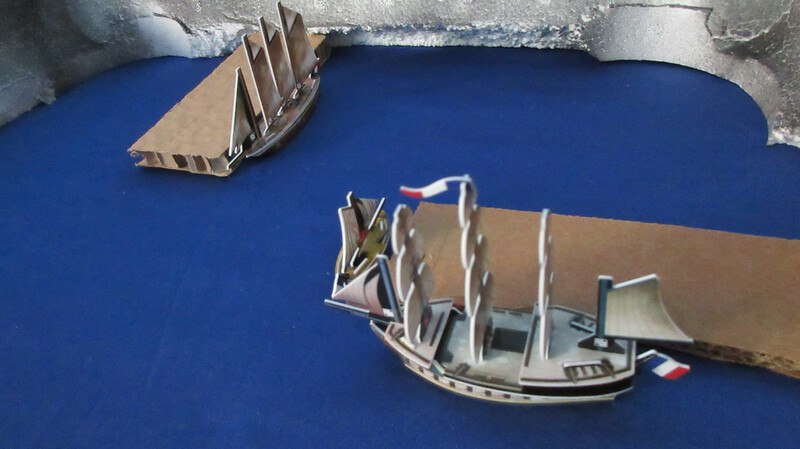 However, by the time they were done building it, they were nearly broke and could only afford a single dock for their ships!! Hahah! 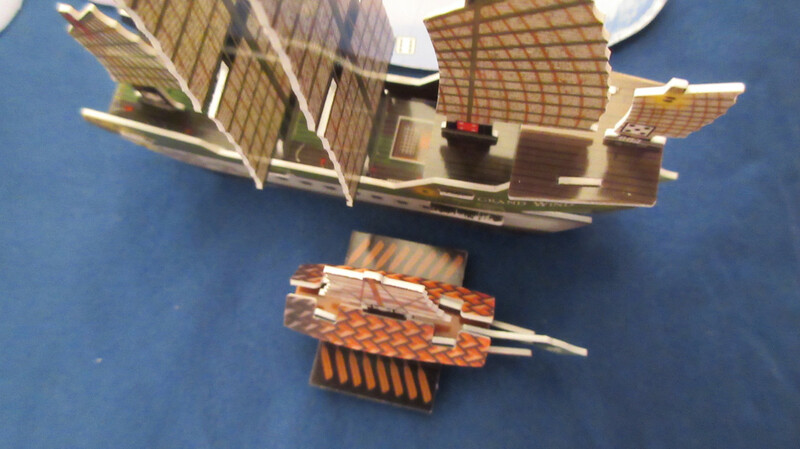 A slightly more overhead view, showing how large the man-made structure is. The main harbor rule is as follows: Harbor docks of any size cost 10 gold apiece. I’m hoping this will be a reasonable way to let the French expand their operations within their luxurious confines, without being too cheap to allow for easy exploitation since the French are VERY lucky to have even built it in the first place. 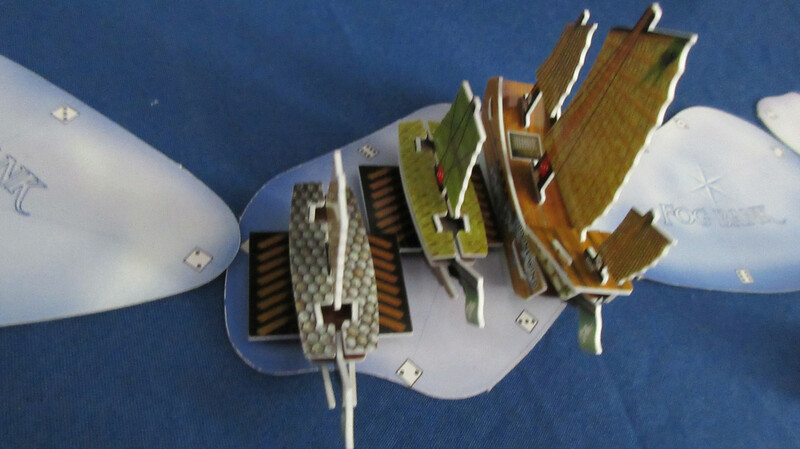 It’s capable of holding far more ships than Mysion’s kingdom, and may also be a stronger defensive haven. 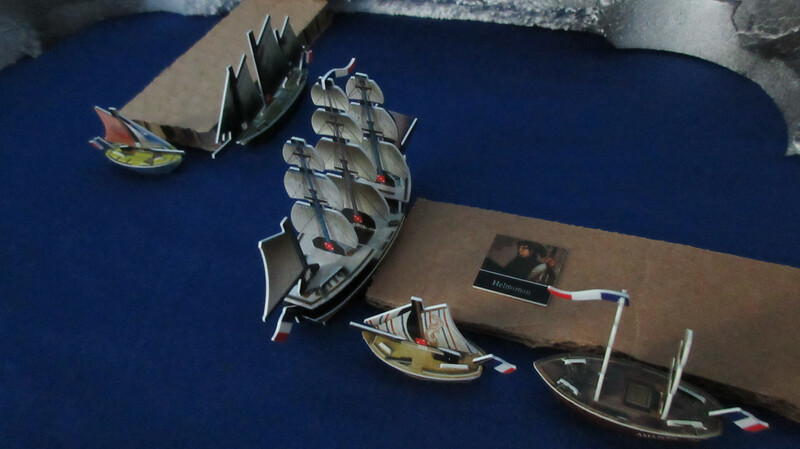 Therefore, it seems only fair that the French must build it up in order to have a drawback for using it from the beginning of the game. 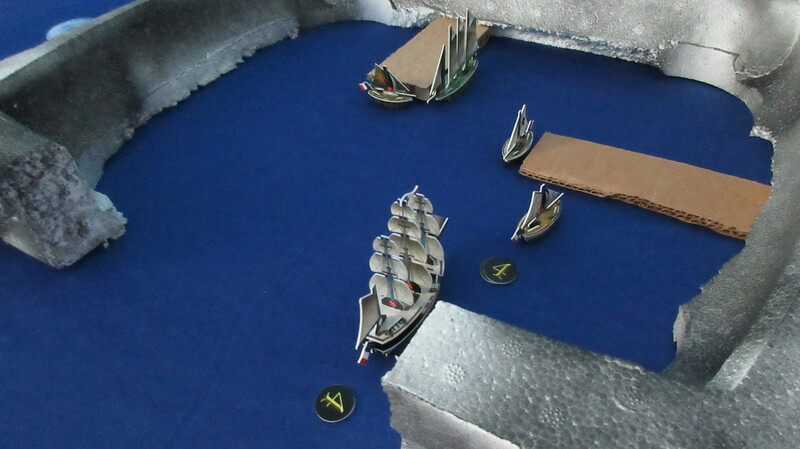 Oh, and another thing: ships must unload at docks within the Harbor, as the main walls cannot be docked at by any ships on the inside OR the outside. 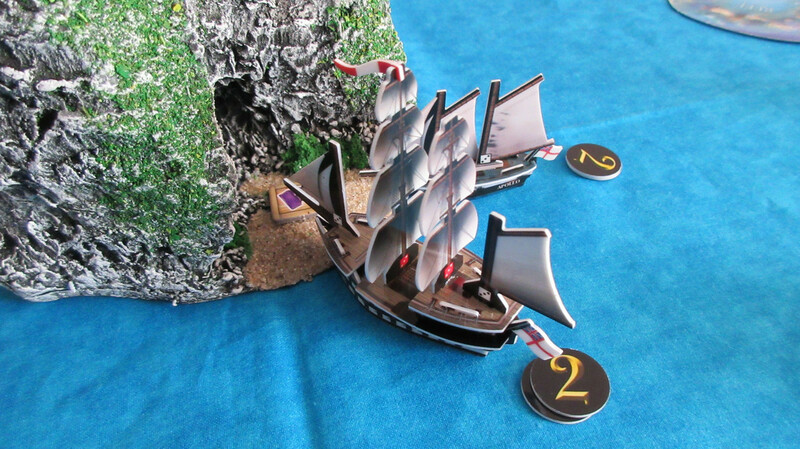 This forces the French to travel further inside to unload things, but also forces any potential home island raiders to brave arguably the most dangerous gauntlet of defense constructed in a Pirates game. I hope you enjoyed the introduction of my new Harbor area. I initially had some issues with it which I’ll expand upon later, but now that I’ve done some serious brainstorming and thinking (thus the word bevy, harhar! ), it has the potential to be an all-time great. Well! Let’s not forget about the faction who controls the Harbor, shall we? The French! 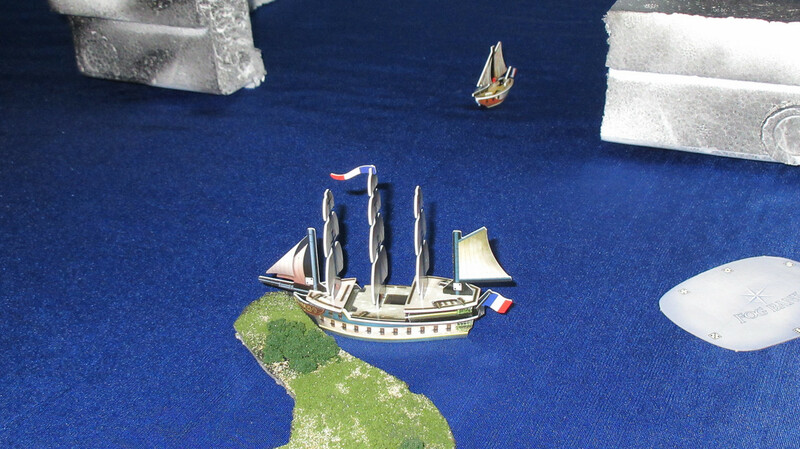 Sailing out with an Admiral’s Action to start the game provided by Amiral Gaston de St. Croix, the Soleil Royal is back in action! 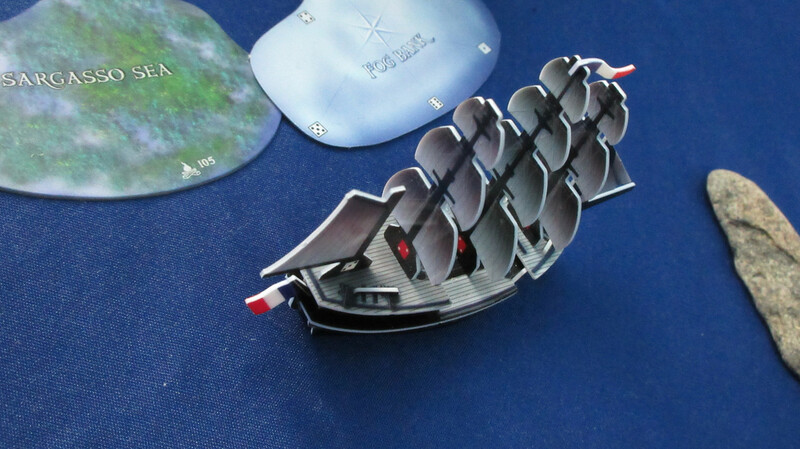 After a lengthy hiatus, one of my favorite French ships ever returns to physical play. 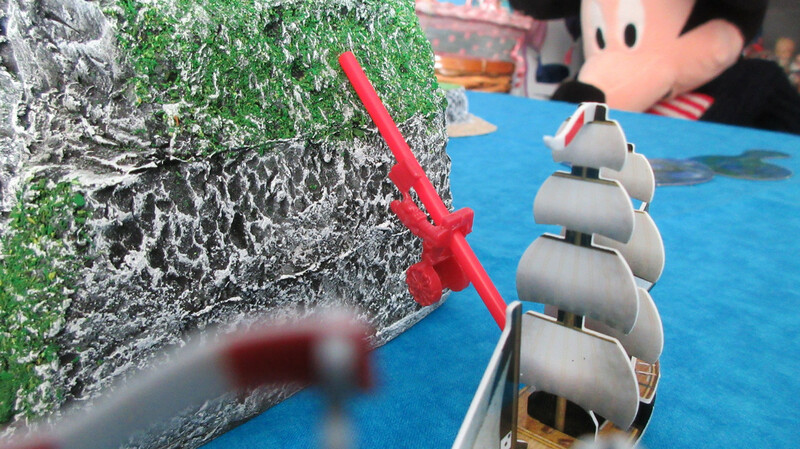 A triumphant return indeed, for she is already sailing at a good clip with Gaston’s help. Speaking of help, Gaston has some of his own. 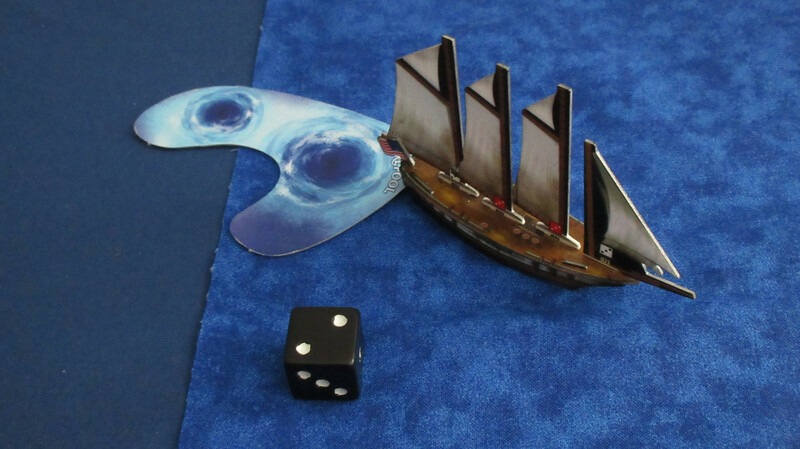 Duncan Rousseau is excited about sailing around the Sea of Karkuda, and provides a nice reroll for the AA ability. His Parley can help to keep the Soleil Royal safe if she gets into a quarry with an enemy, while a helmsman has also been hired to make the ship sail with the best of them. 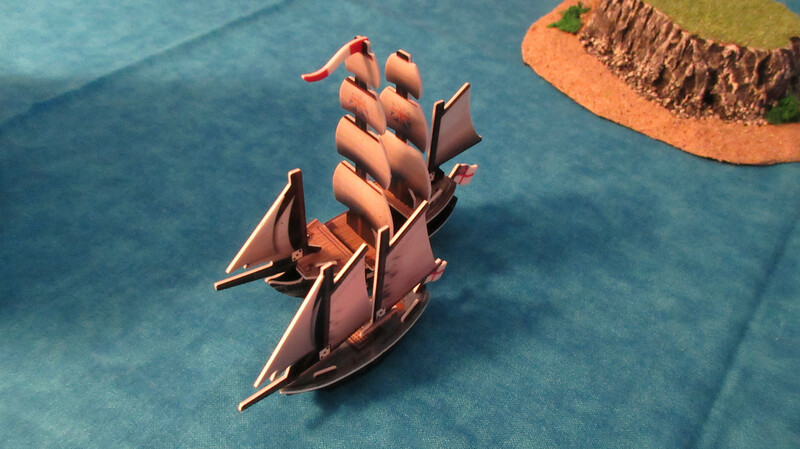 Trailing the SR is the Marianne, a slow but underrated sloop. I will be making attempts to play this game during peak natural lighting, but some turns (especially those in Karkuda) may have some darker shots. The flash will come in handy, though I’d like to avoid using it a lot because it can look rather strange and unnatural. 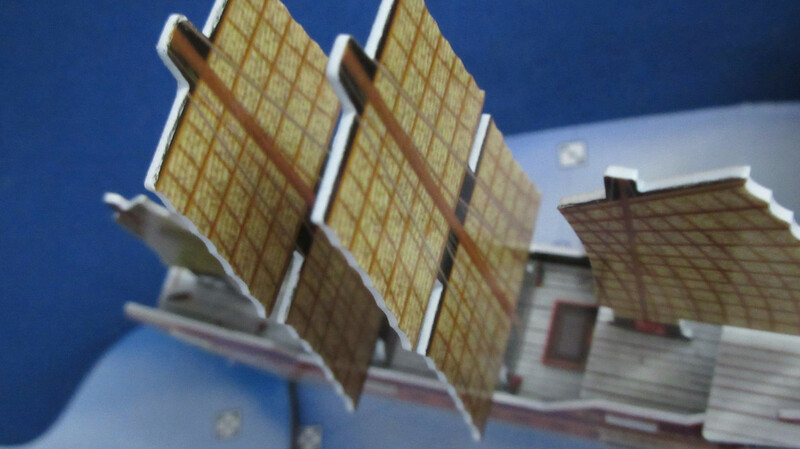 In this case it helps to illuminate the beauty of the Soleil Royal and show off the basic cardboard I used for the dock lol. 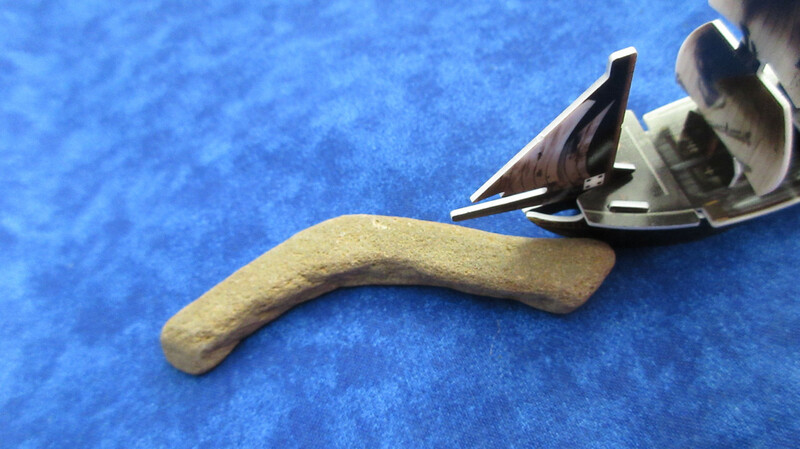 With a thick enough piece it can be very durable and comes with a nice wooden color, so I can just cut it and use it without further modification! Making an entrance similar to the Jades, the Americans are here! 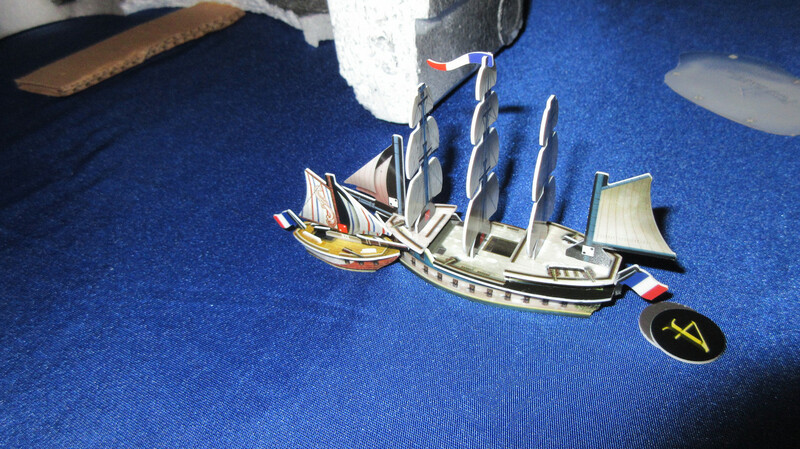 They sail into the Sea of Karkuda on two ships: the Bonhomme Richard, legend of the North Sea, and the Argo, legend of nothing. 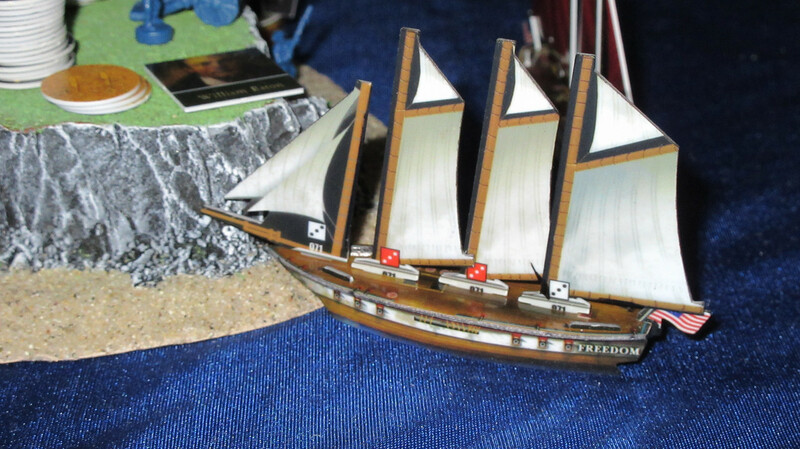 XD Brent Rice and a helmsman crew the Bonhomme Richard, a ship that unfortunately had a very loose mizzenmast when I received her constructed in an eBay lot some years ago. 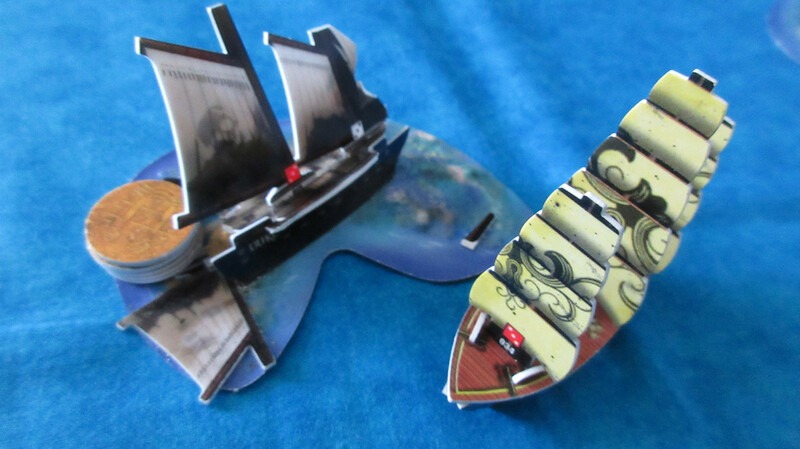 I have not used either ship as much as I’d like to have, especially the BR, so they comprise America’s starting fleet. 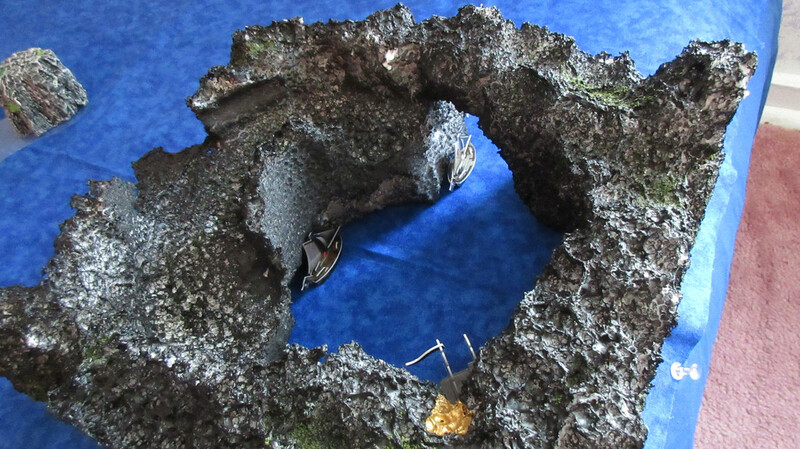 The Argo has already spotted an island, but it looks very rocky and inhospitable, at least to humans. 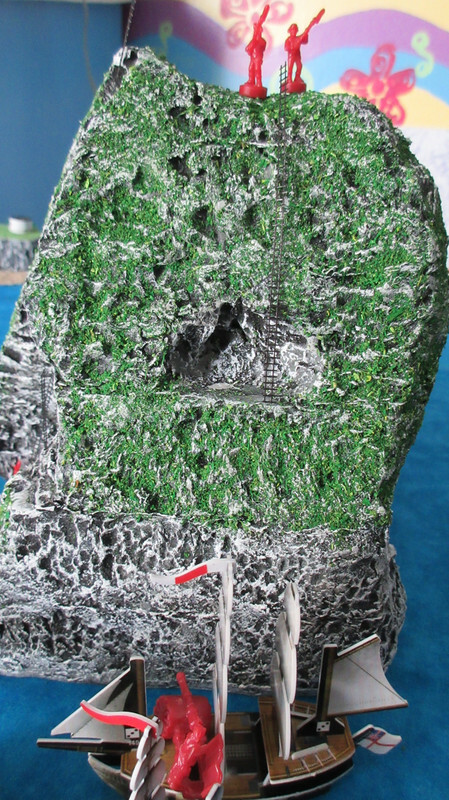 However, it has been named “Luck Island” due to the “lucky stone” on top of the main outcropping. 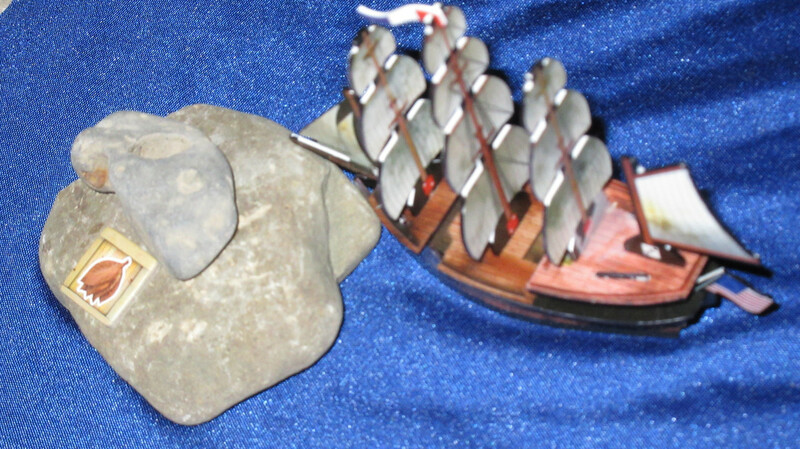 (note: In my childhood, summer vacations on a local lake with a rock-filled beach led to the finding of some “lucky stones”, which are simply stones that have a clean hole all the way through) The Americans don’t want to settle on Luck Island, but they also don’t want to go through that dangerous-looking swirl of water off the starboard side of the BR…. If you’ve been keeping count, we are now up to 3 oceans (Allost, Caribbean, Karkuda), 2 rooms (Karkuda is in a different room), and 6 factions. Not to mention some fun new creations!! And don’t worry, the fun nearly hasn’t even started yet! XD We’re only one turn in! Another round of turns begins! Mysion on the Cassandra sees a familiar sight he saw on his trip in, but he’s been busy “renovating” the now-active Pirate Kingdom base. 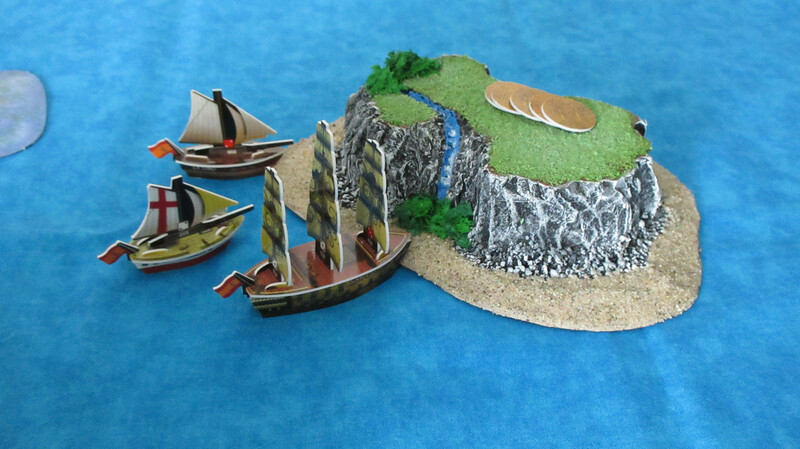 It’s Pistol Island, so named for its distinctive shape. 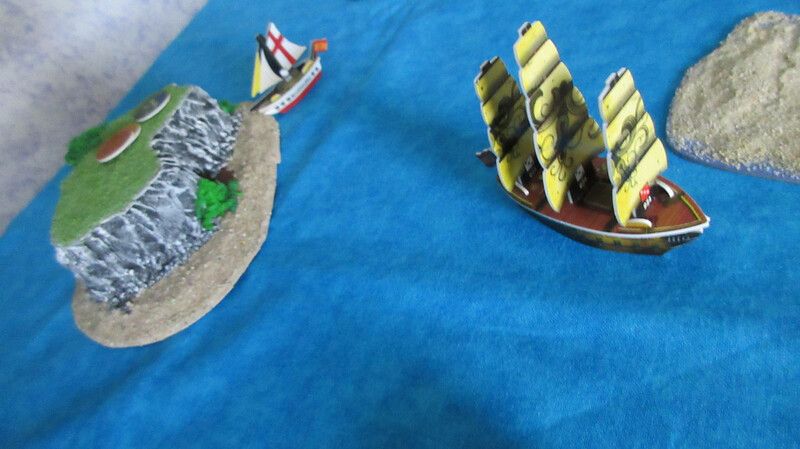 (long handle at the left, with a barrel at the right and even a bit of a flared muzzle like a flintlock to boot!) Note: This is a rock I discovered at the aforementioned lake many years ago, but this is the first time I’ve used it in a Pirates game. 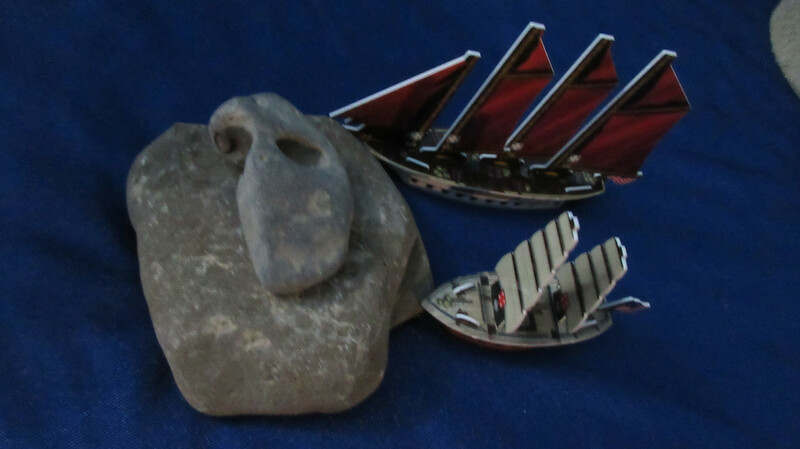 It’s further proof that I’ve been at this nautical stuff for a while, since I may have found it before I got into Pirates and possibly even before the first Pirates of the Caribbean movie came out! 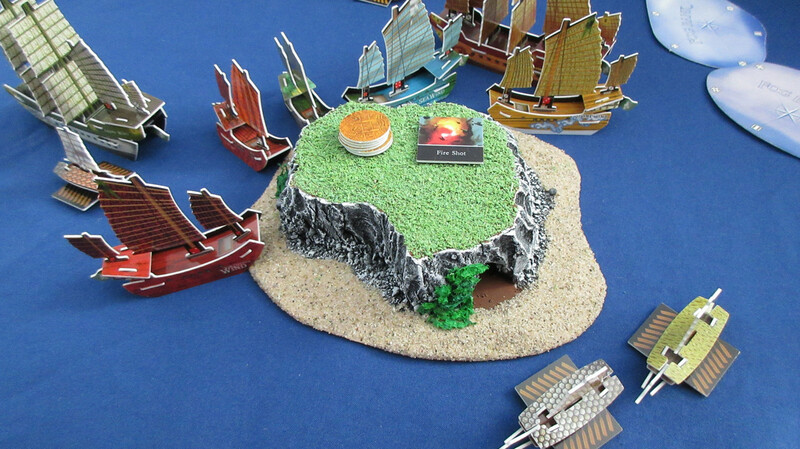 The Jade Rebellion has quickly found a perfect island to call home in the Sea of Allost! 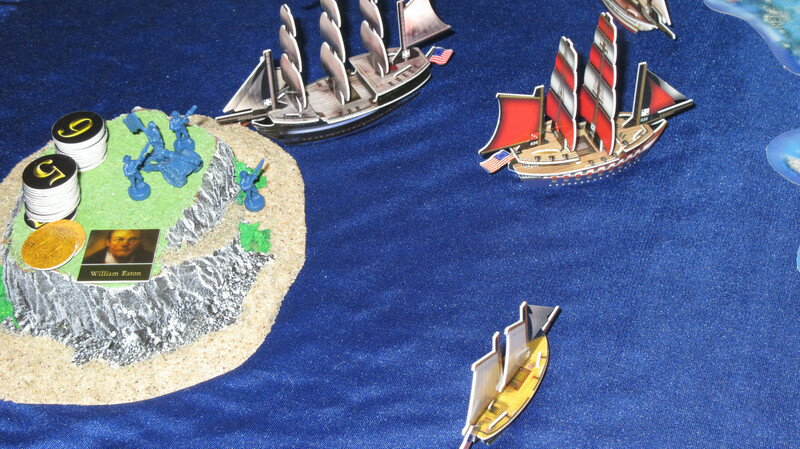 Both ships dock at the beach, but they’re still organizing parties for exploratory purposes. 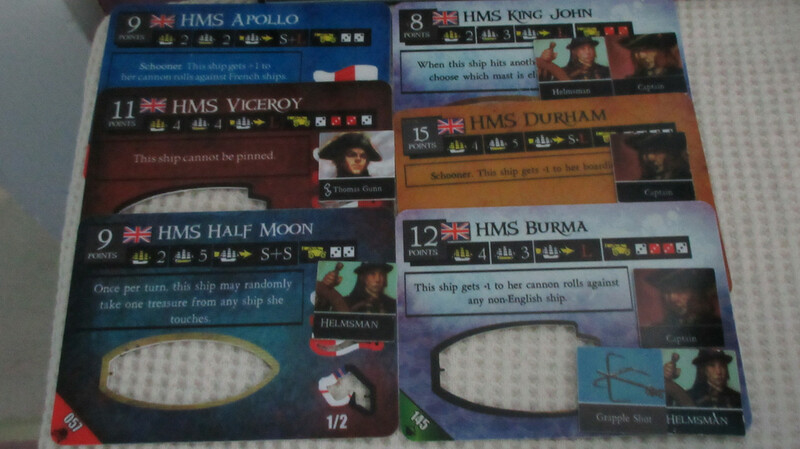 An imposing sight: the Viceroy carries not only Thomas Gunn, but also Major Peter Sharpe, a bargain-priced marine in the employ of England. 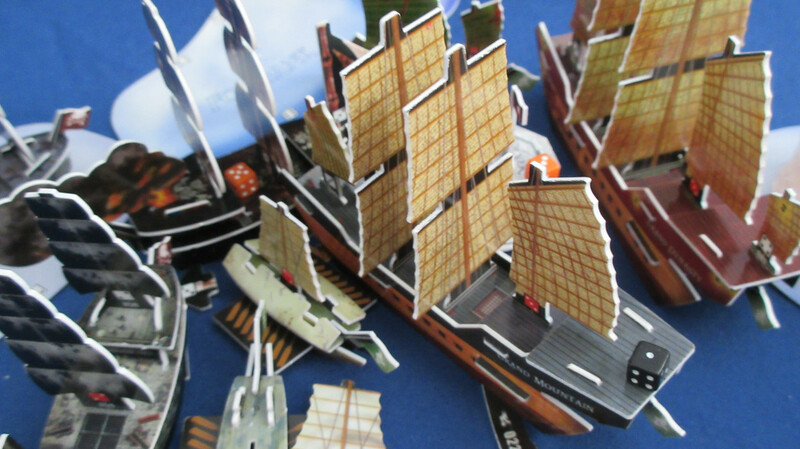 The name Gunn is probably familiar to most readers, as the most effective Admiral of the Age in many respects. His new post has him in control of just two ships, but if fortune smiles upon his fate he will command many more before too long…. Oh no! 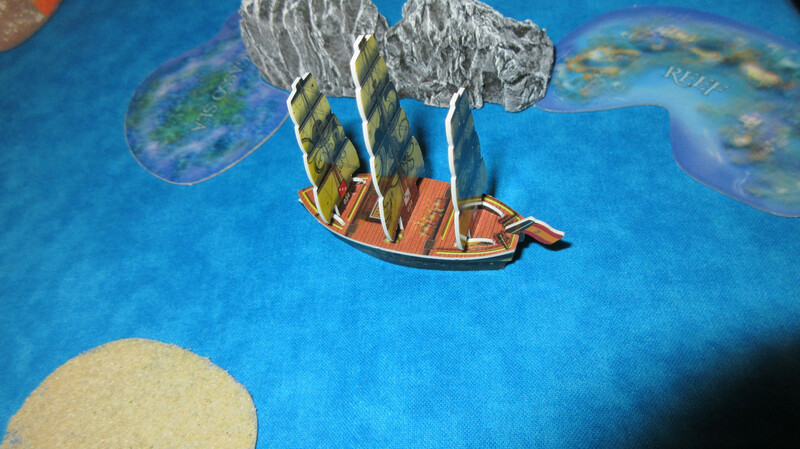 The San Estaban’s luck appears to be more pedestrian already than it was in EE, for the Spanish captain and helmsman aboard the vessel only find some rocks and reefs blocking their path. 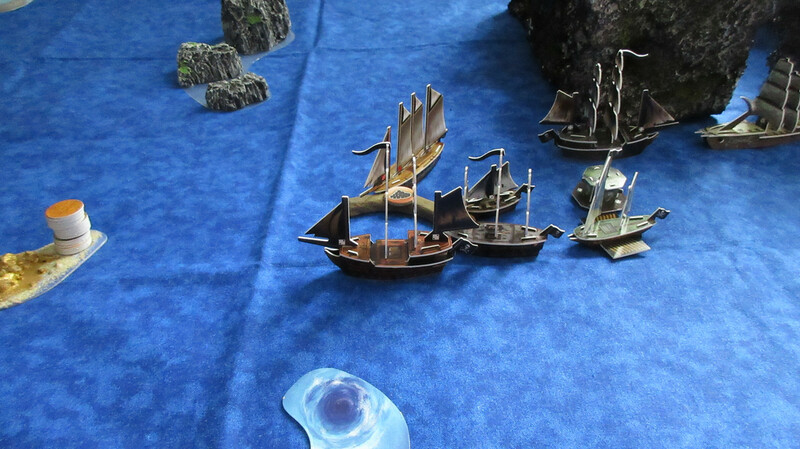 The Ebro meets a similar dilemma, and her crew sticks with the plan of meeting with her fleetmates instead of forging ahead with her ability to ignore terrain while moving. 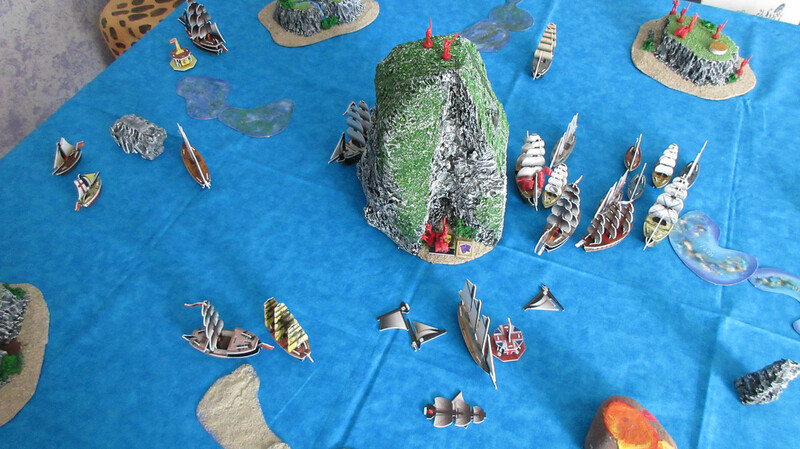 The entire Spanish fleet, showing a good chunk of the Caribbean. Back to Karkuda: what beauty! 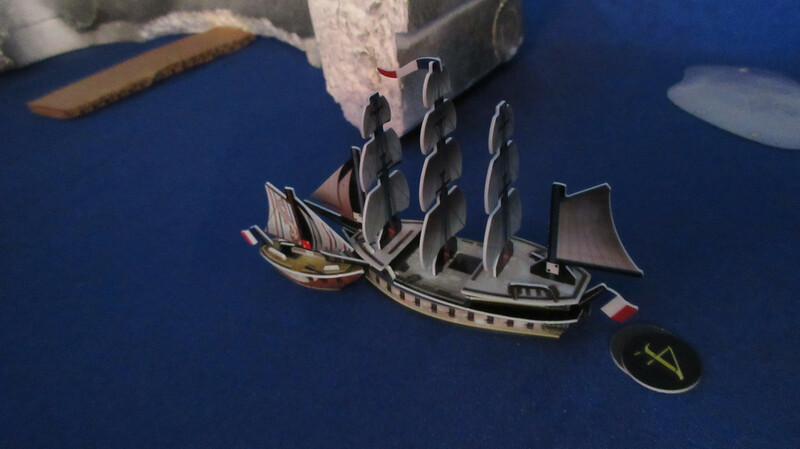 The French flagship gets a second consecutive AA from Gaston, allowing her to dock at a nearby wild island and explore it! 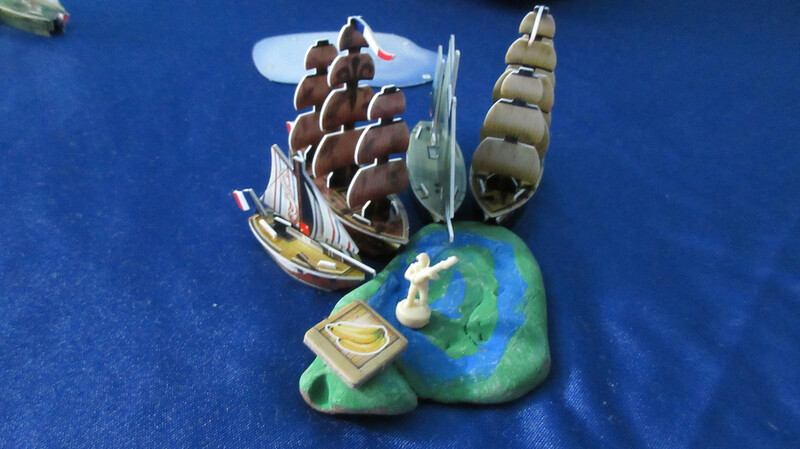 With the first island resource roll of the game, the French discover yummy food on the nice island! 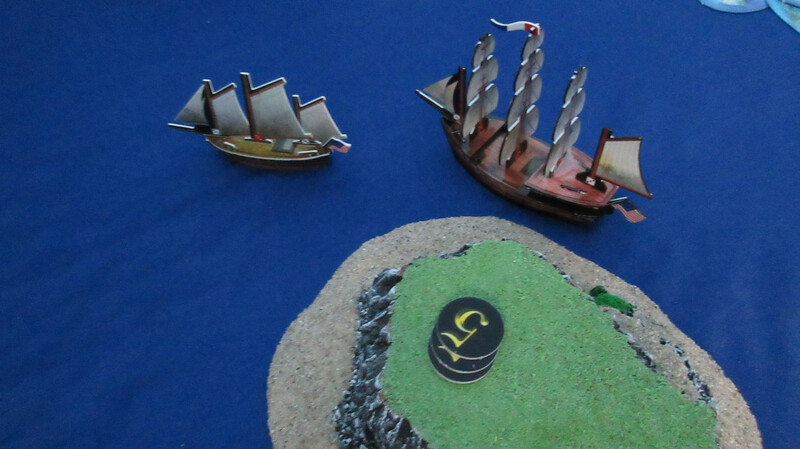 Here you can see the Merchants and Marauders token I’ll use, along with a French pennant marker. The Americans discover an island much more “human friendly” than Luck Island! They plan to make it their home after exploring it, similar to the Jades in the Sea of Allost. That is all for the time being, but I’ll be back with more very soon. 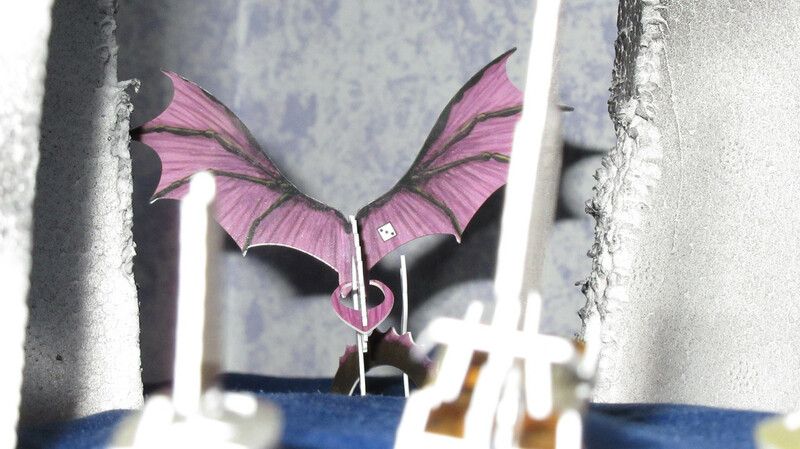 However, in the meantime I thought I’d leave you with a final picture, a preview of sorts. 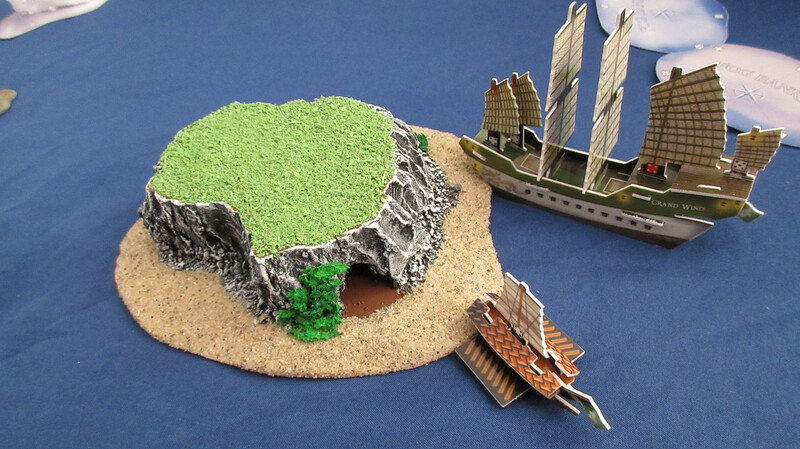 This is an undiscovered wild island, which will be called “The Flat” for obvious reasons. 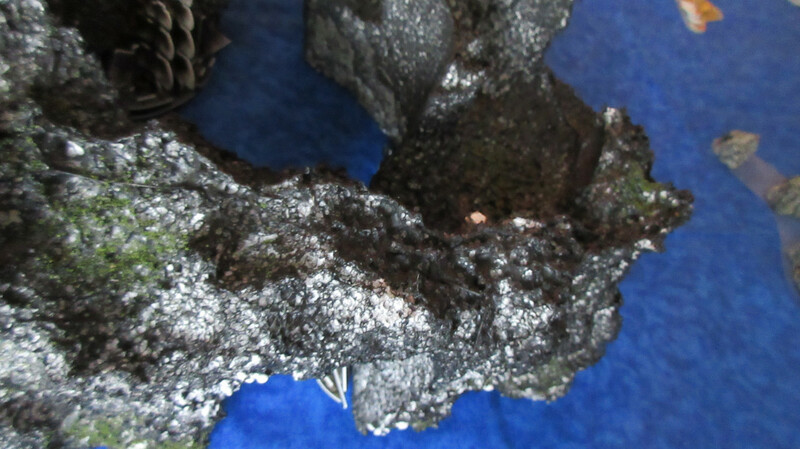 It’s another old rock from a long time ago, but in this case it was recently glued back together to look the part for this game! Haha. 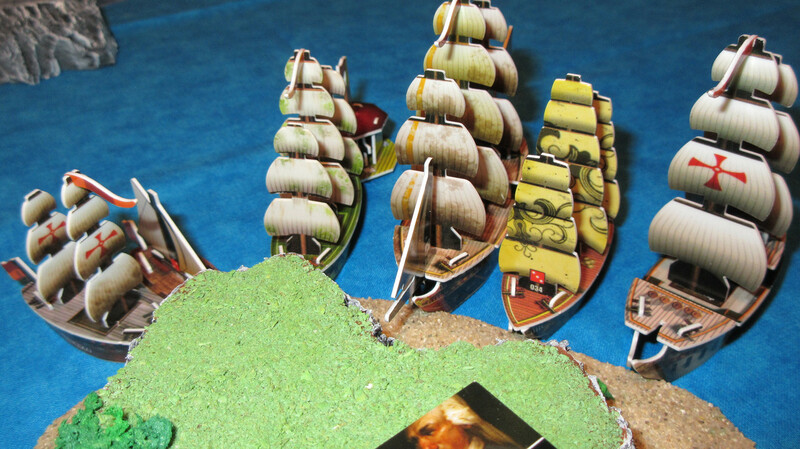 I hope you enjoyed the start of Command the Oceans. CTO for short, the name was partially inspired by a book I read a few years ago. Wow! 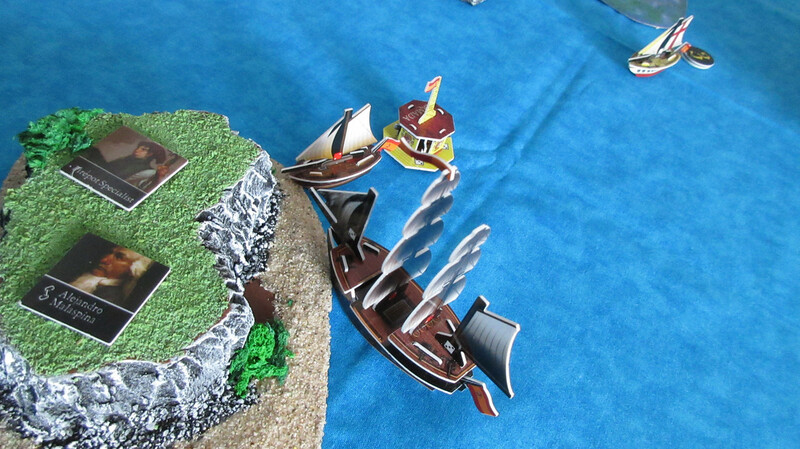 All three Pirate ships reach wild islands in the same turn! 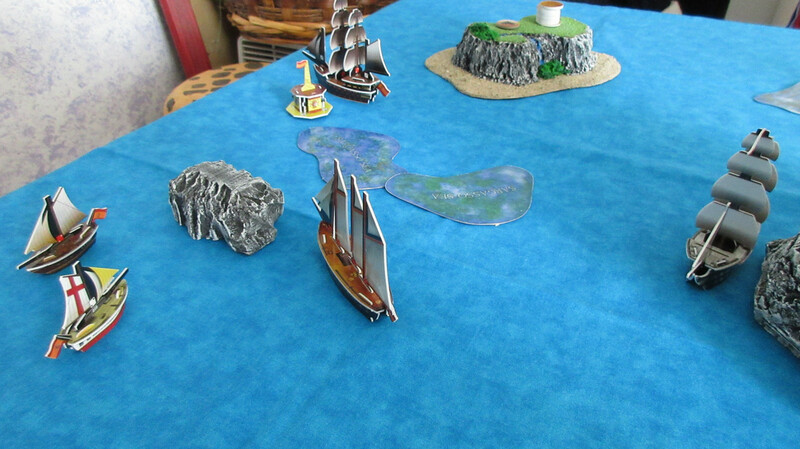 The Smiling Jim reaches one of my older custom islands while the Fancy docks at a classic from Rossinaz. 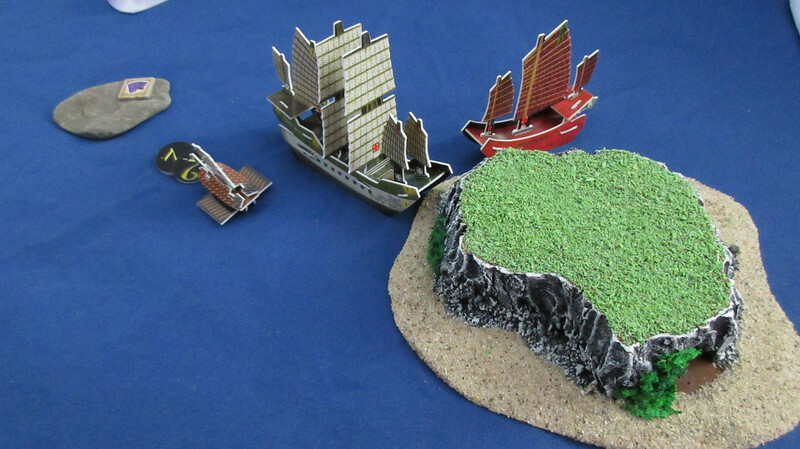 The Jade Rebels explore their island, making it their new home! 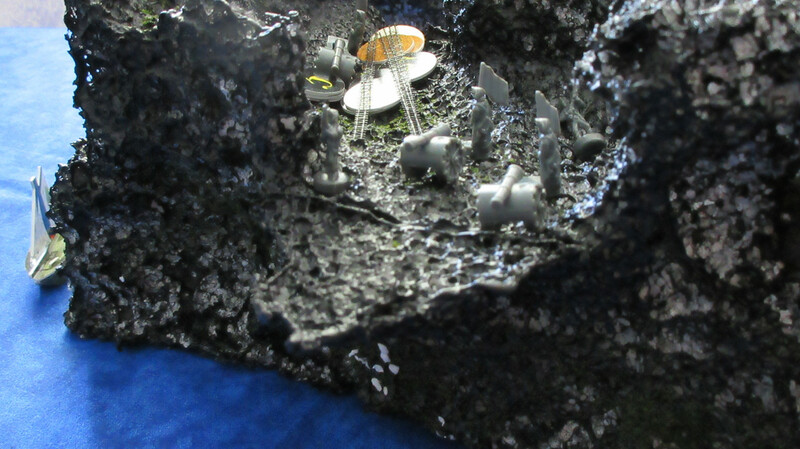 They are slightly disappointed to not find any resources or gold on it, but they like the thought of using that cave to hide valuables…. The incredible historical creation is here!! This had been an idea of mine for quite a while. 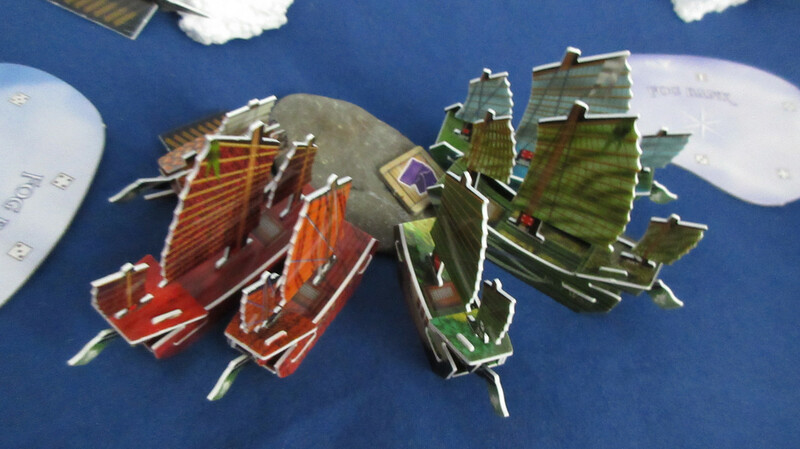 After creating a custom fort for use in my RISK game back in 2012, I had considered trying to make a physical version of the rock. 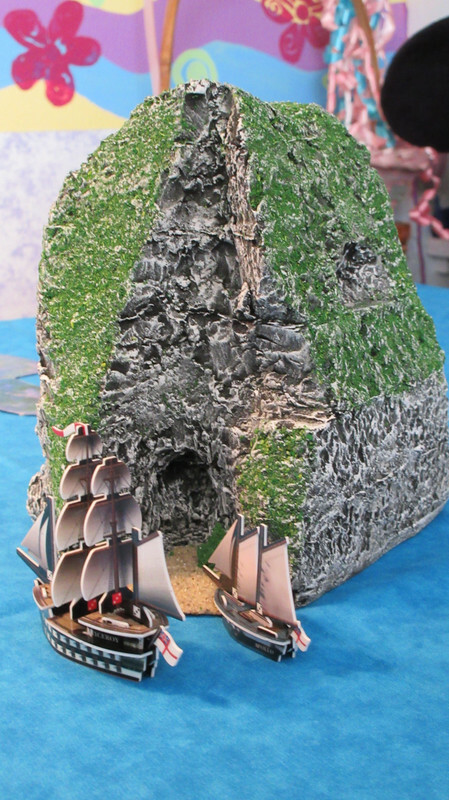 However, between my lack of desire to spend many hours attempting to create a realistic copy, and the similarities between the stuff created by Ross in AZ and the pictures of the rock, I decided to reach out to Ross and ask about potentially making a physical copy of Diamond Rock for use in Pirates games. 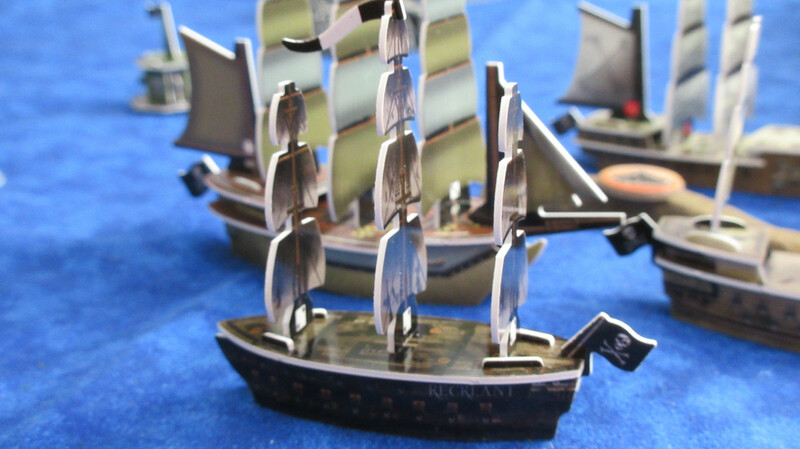 Shortly afterwards I now own one of the coolest custom game pieces ever made for this game!! 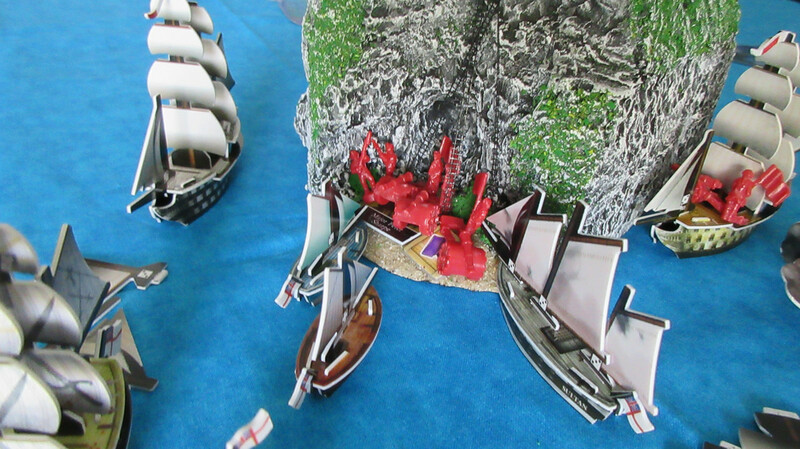 HMS Apollo docks at the massive rock, while the Viceroy stands guard. 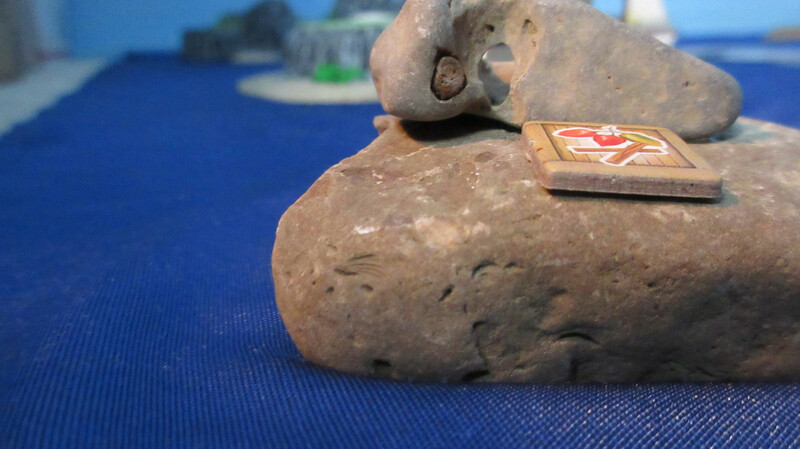 Ross did a fantastic job making a lifelike Diamond Rock, and I’m extremely excited to use it in my games! Note the cave on the side, which is where the Royal Navy was able to install some artillery on their “ship” during the Napoleonic Wars. 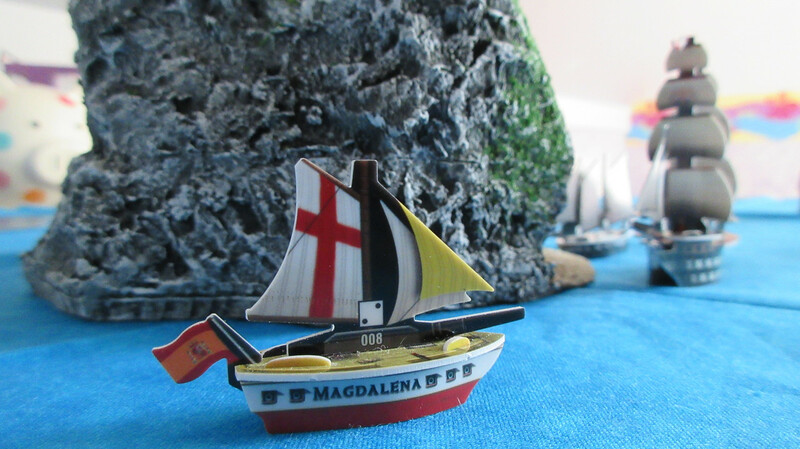 The Magdalena was approaching the rock, but with the dangerous Viceroy in position, the Spanish may think twice about attempting to land at the single beachy area (another historical touch, as most of the island was inhospitable to ships). 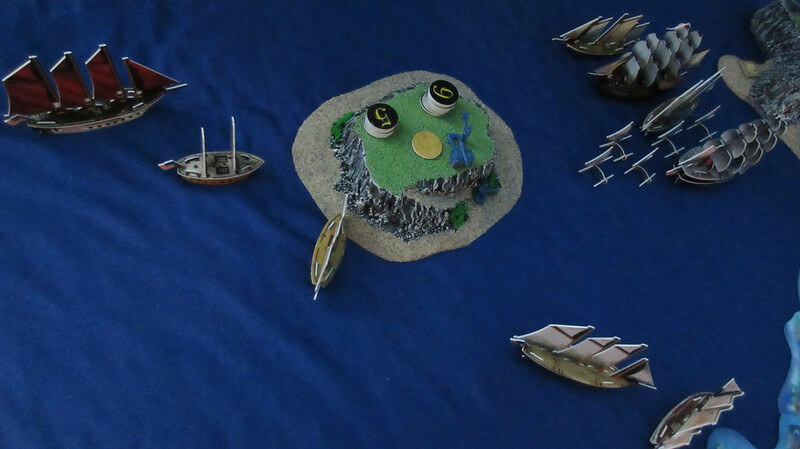 As Mickey ironically watches over his own Caribbean franchise, wondering where the Pirates are…. Deja vu! 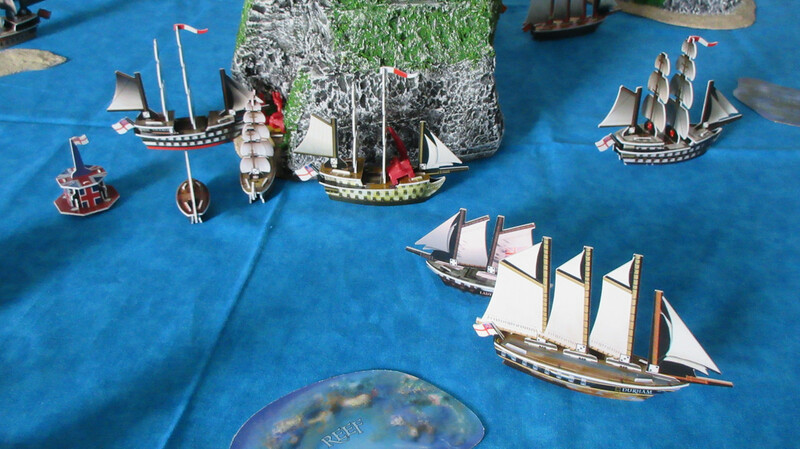 The Royal Navy reaches Diamond Rock first, and claim it as their own. 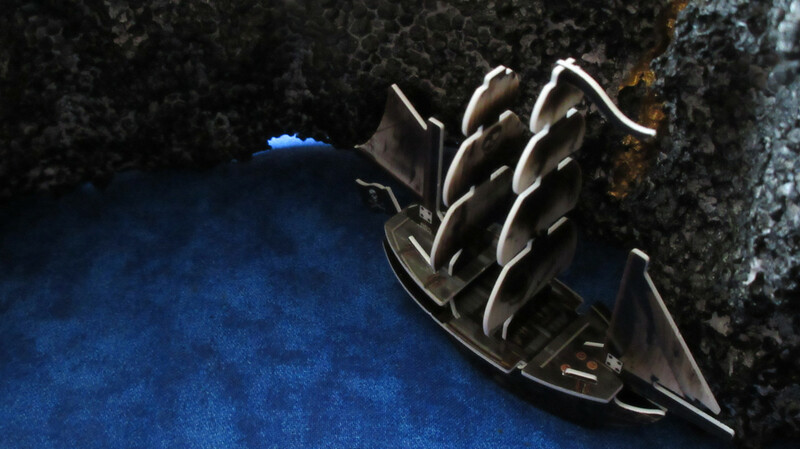 The Viceroy’s rows of bristling guns serve to back up that claim. The Spanish arrive!, but alas they appear to be too late. I turned the camera to get this cool shot, which I feel is one of the most realistic of the game so far. 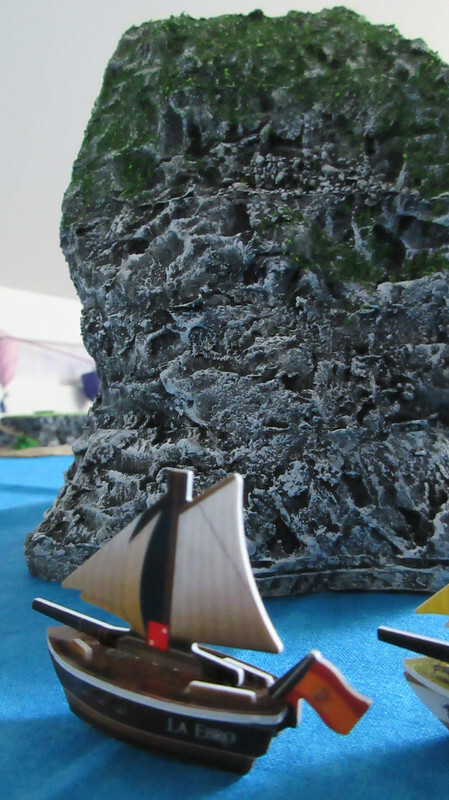 A sloop comes around the side of Diamond Rock, whose bulk obscured a large English warship lurking beyond. 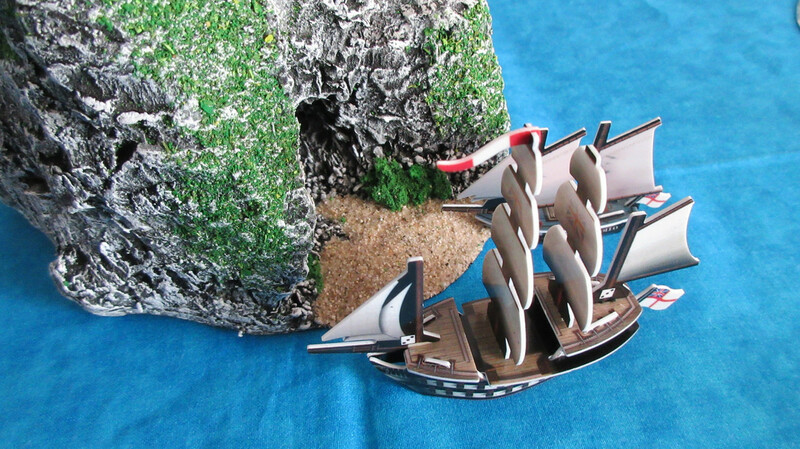 Almost makes you feel like you’re actually sailing around the rock! Obviously I can’t get enough of this awesomeness! 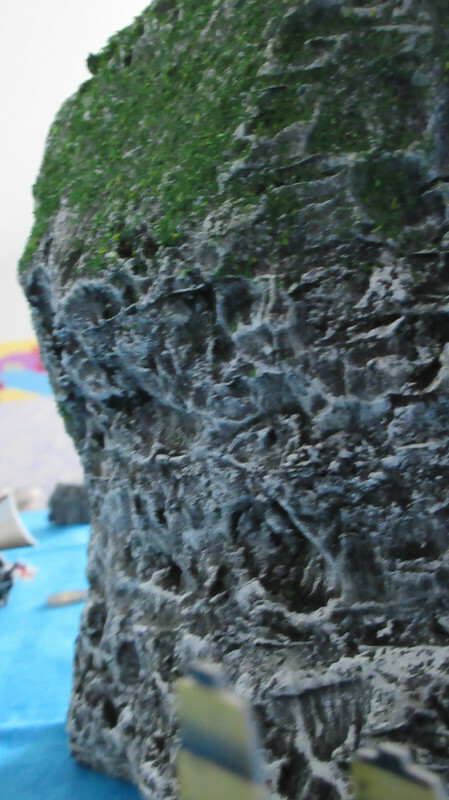 However, that is all of Diamond Rock for now, and I hope you enjoyed it as much as we already have. 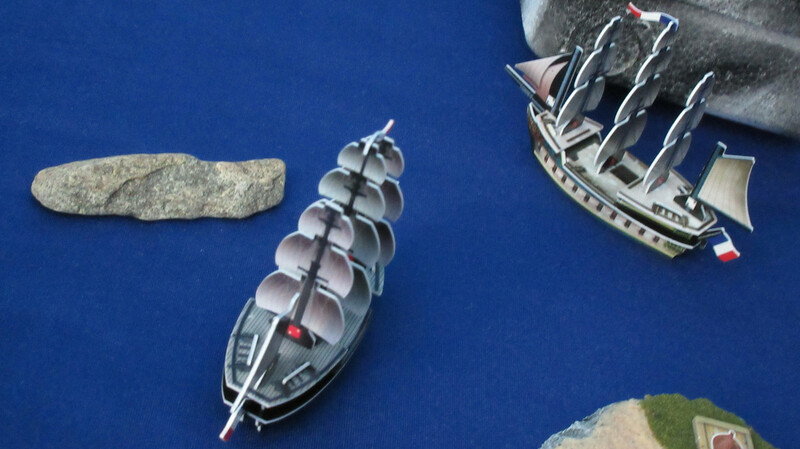 The San Estaban turns around, hoping to meet with her other ships and discuss their findings of the area. 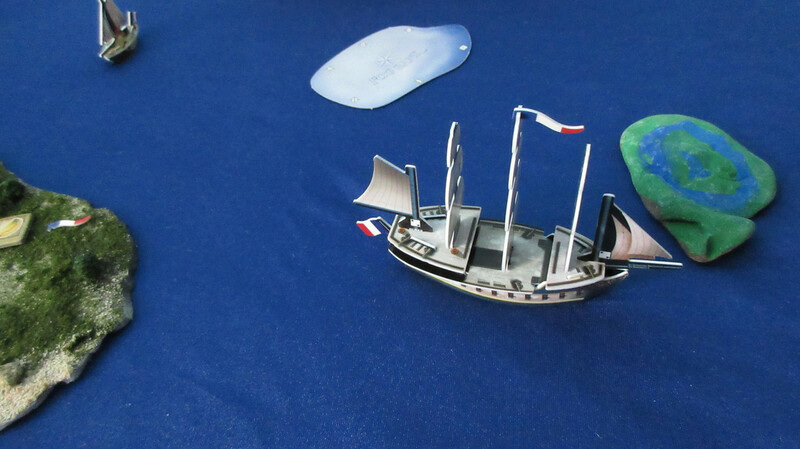 The Soleil Royal prepares to give her fish to the Marianne, allowing her to return to the island and get more and maximize French logistics. 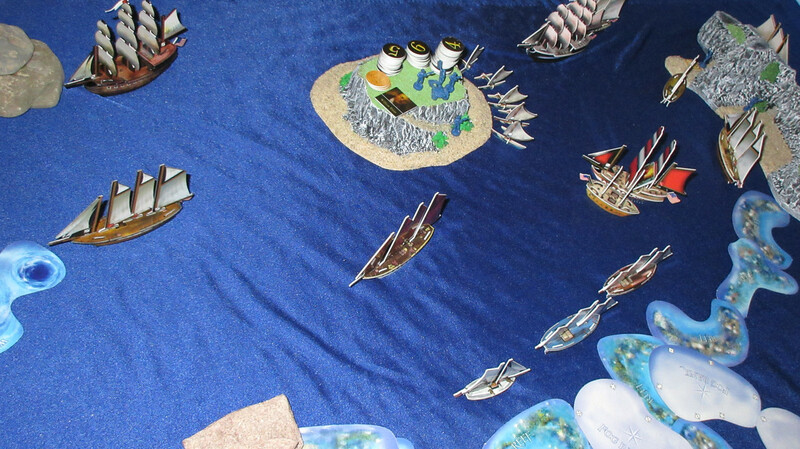 The flash makes it less natural, but it does show the pretty colors of the French ships and the “deep blue” sheen of this unique silky ocean fabric I also used in the Experimental cumulative game. 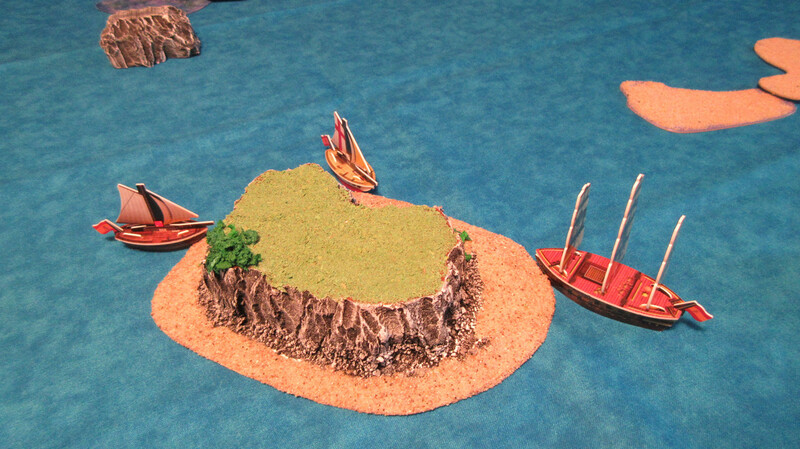 The Americans explore the wild island and make it their home! 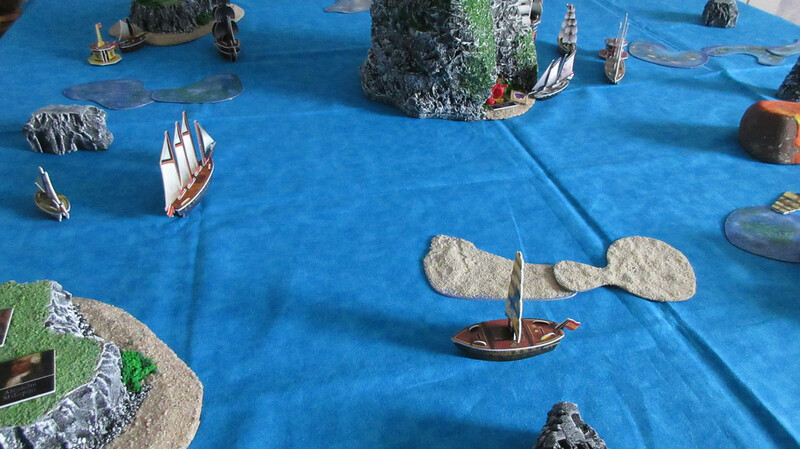 Back in the Sea Allost, turn 4 begins with a Pirate exploration! 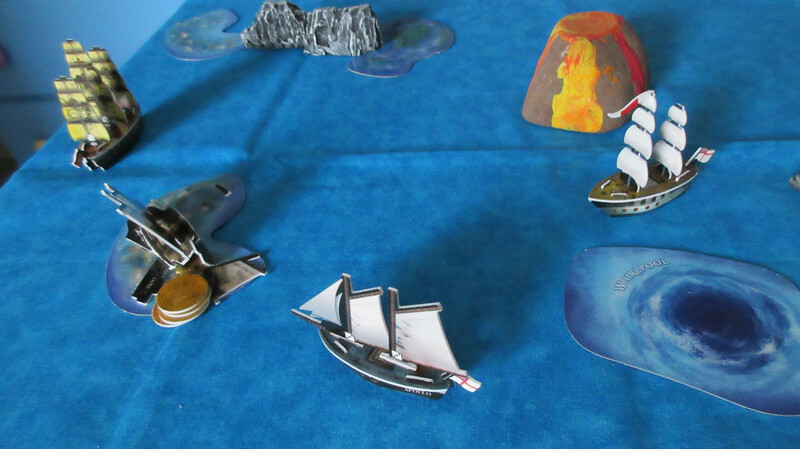 Mission fittingly uncovers metals on Pistol Island, filling the Cassandra to the brim. 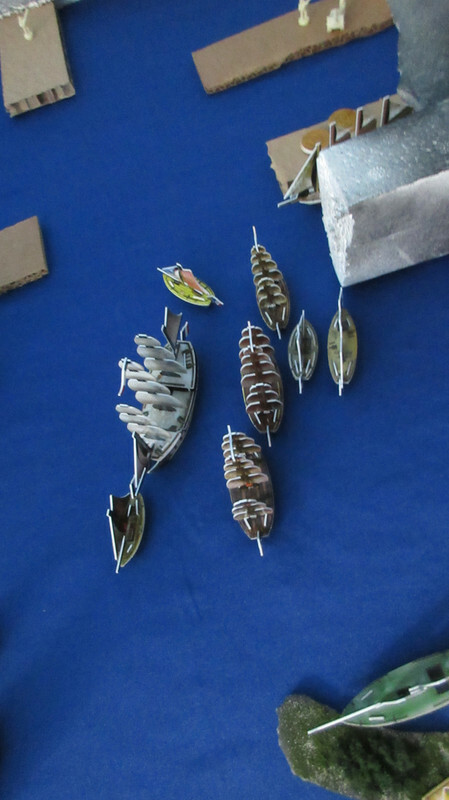 And the Fancy finds Spices! 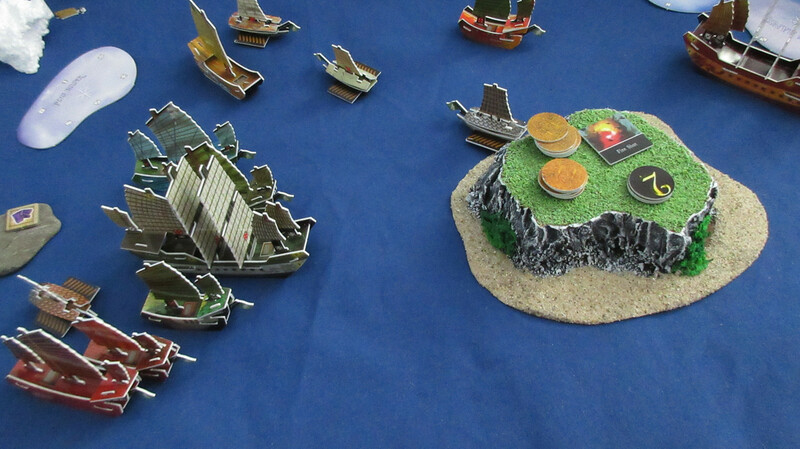 With three different resource types on nearby islands, the Pirates are now set up for long-term wealth. A great start for them indeed! 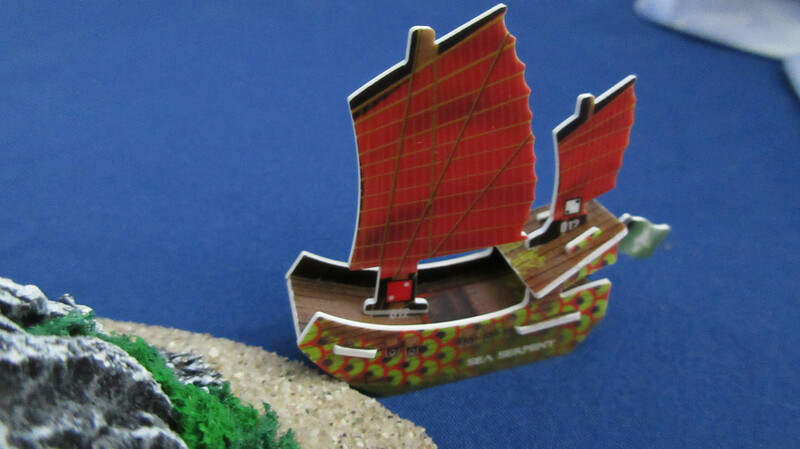 The Jade Rebels sail away from their home island for the first time, heading west. The eastern path is blocked by a giant wall of dense fog…. 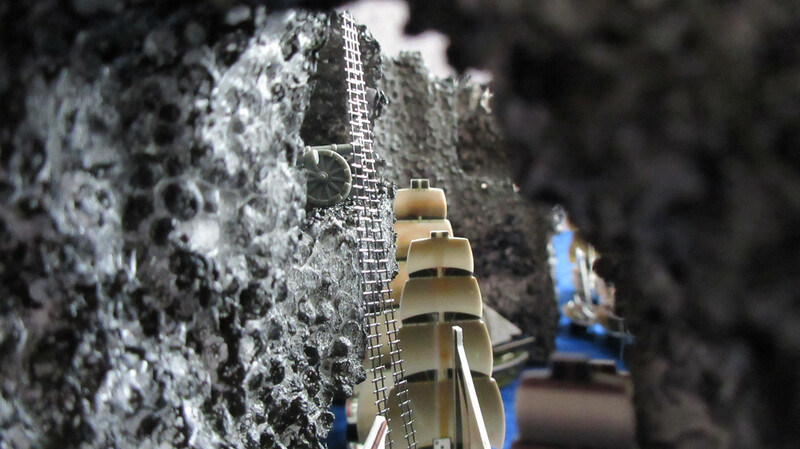 Back in the Caribbean, the Apollo explores and finds textiles! The Viceroy docks at Diamond Rock to load some as well. Now the Spanish are just plain jealous! LOL! 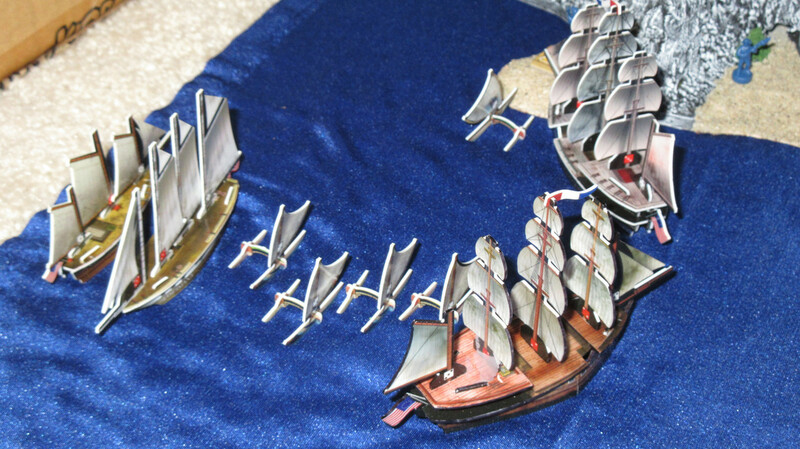 The Spanish have a fleet meeting to discuss their exploratory operations. 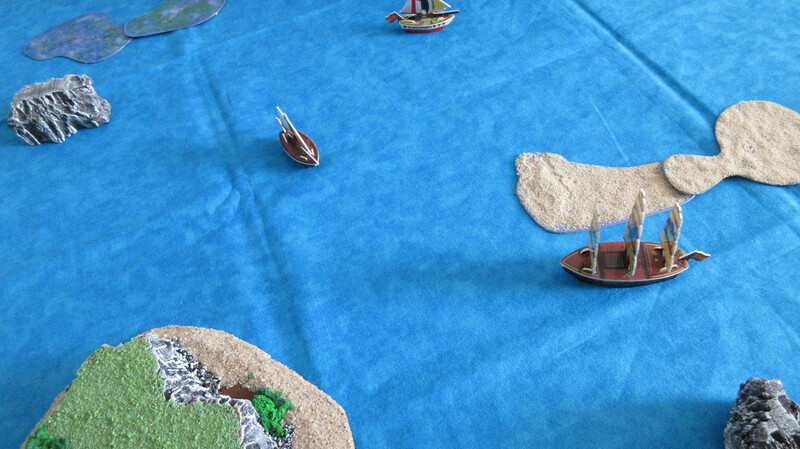 The San Estaban’s captain remarks that he found reefs and rocks and turn for home. 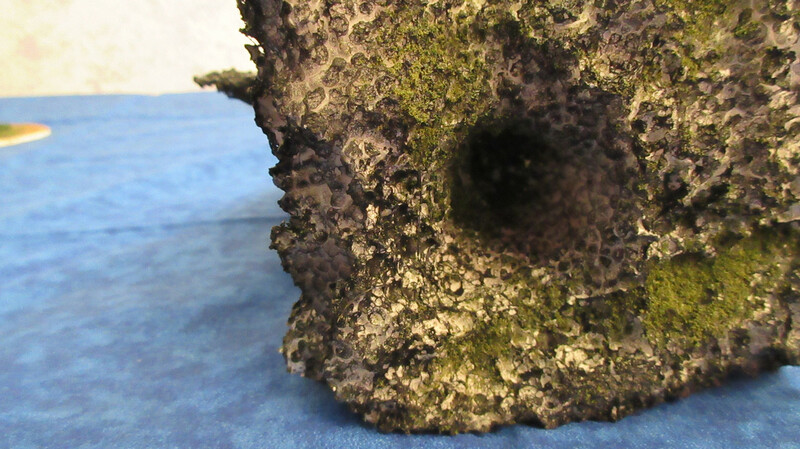 The Ebro found similar things, but also a mysterious weedy mixture in the ocean to the northeast of their HI. The Magdalena reported on finding the gigantic Diamond Rock, as well as the English who had gotten there first. 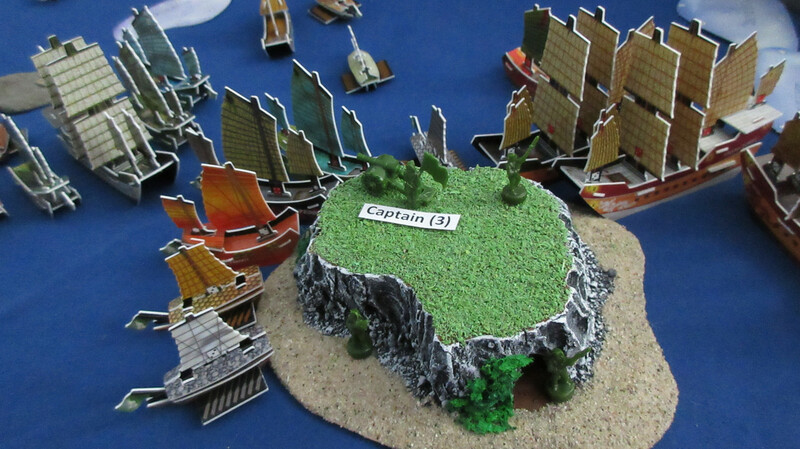 The captains began brainstorming ways to get resources and simultaneously force the English out of the region…. 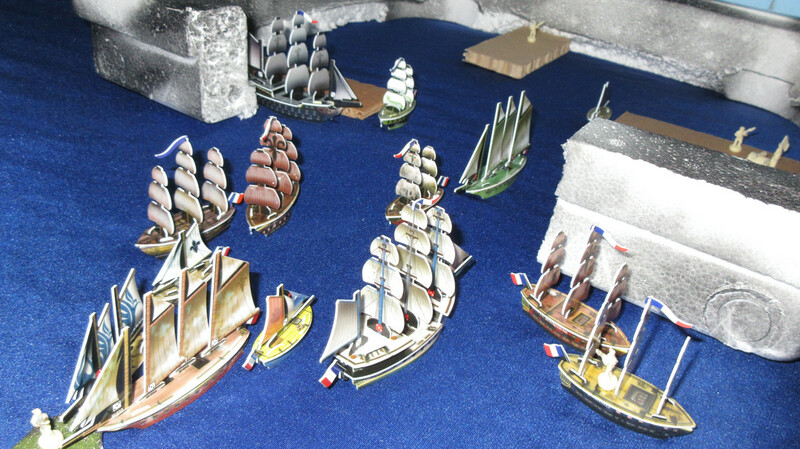 With an eastern viewpoint this time, we are back in the Sea of Karkuda where the French are hungry for more food! 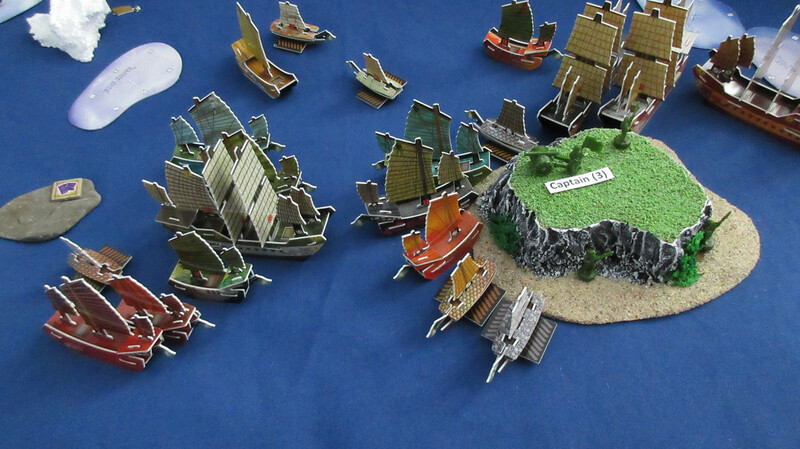 Shimmering blue waters surround beautiful ships and a similarly beautiful, “fruitful” island. The Americans do some exploring of their own! 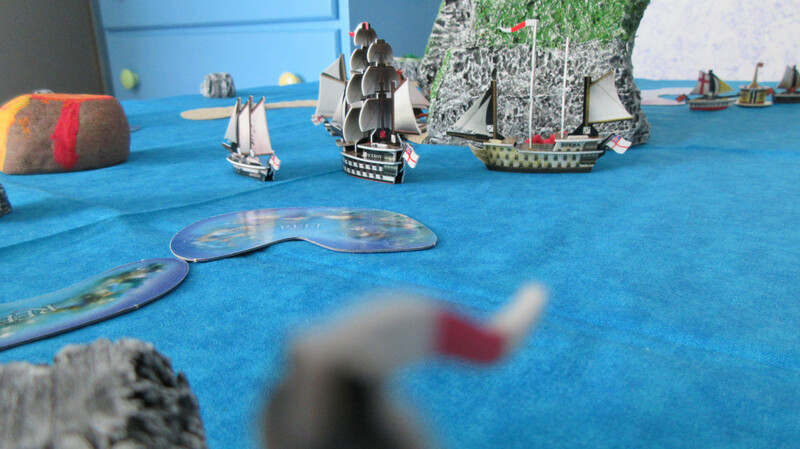 The Argo heads back to Luck Island so she can investigate it, while the Bonhomme Richard quickly discovers a new island. Although small, Brent Rice names it Ruby Island due to the reddish hue that appears near the island’s edges. Thank you for reading. Please let me know what you think of the game so far, and stay ready for more! Play has continued! For the most part, it looks like my schedule will allow me to play at least one turn per day for the foreseeable future, which in this case is about two weeks. Looking west for a change, you can see the Pirate fleet returning home to their kingdom. 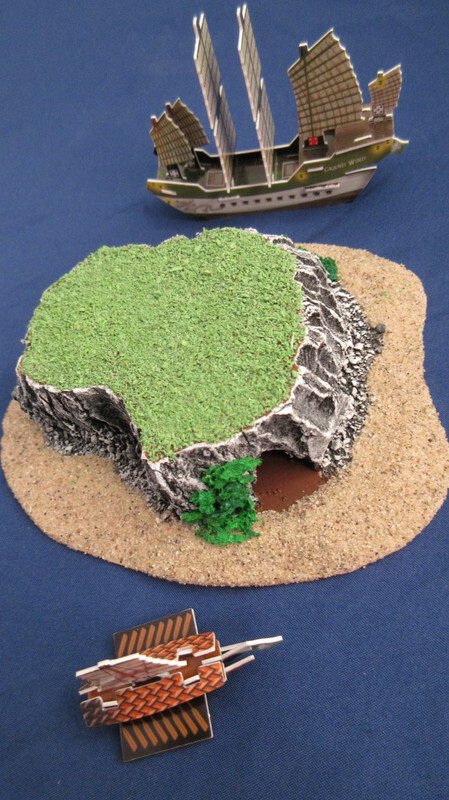 The Jade Rebellion has found a wild island near their home island! 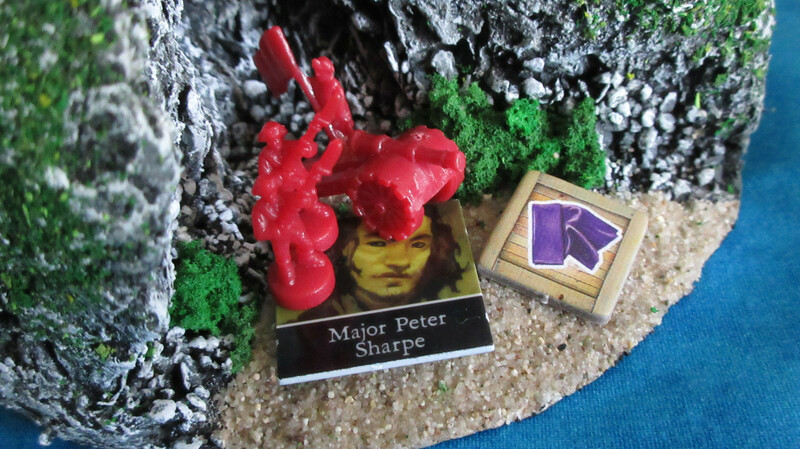 The English leave a little surprise for any potential comers – Major Peter Sharpe is stationed on Diamond Rock’s only beach! Thomas Gunn dropped him off with instructions to stay hidden but shoot at any opposing ship that tried to dock. 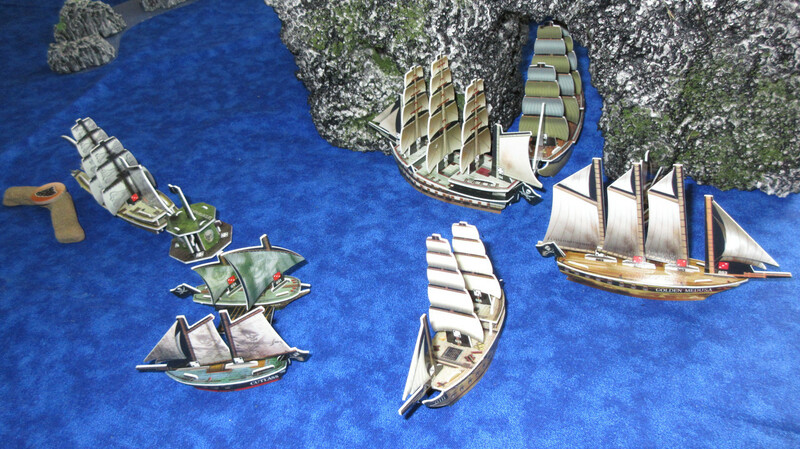 With the Ebro in the lead, the Spanish form a line and start sailing along the side of Diamond Rock. 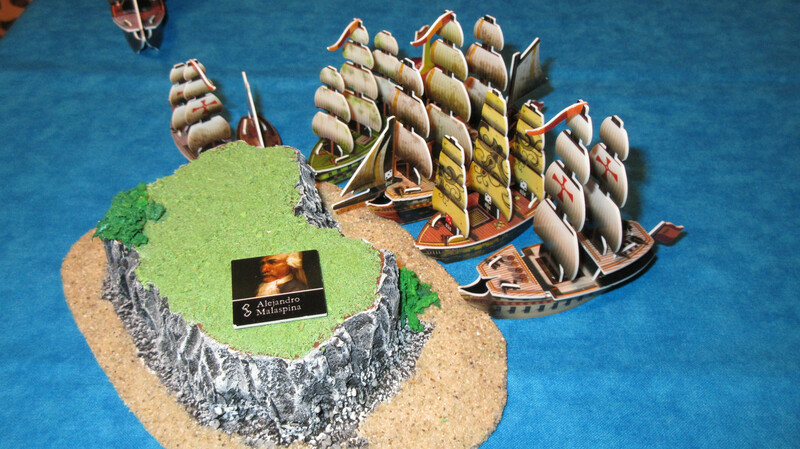 The San Estaban is prepared to defend her gold runners from the English if necessary. 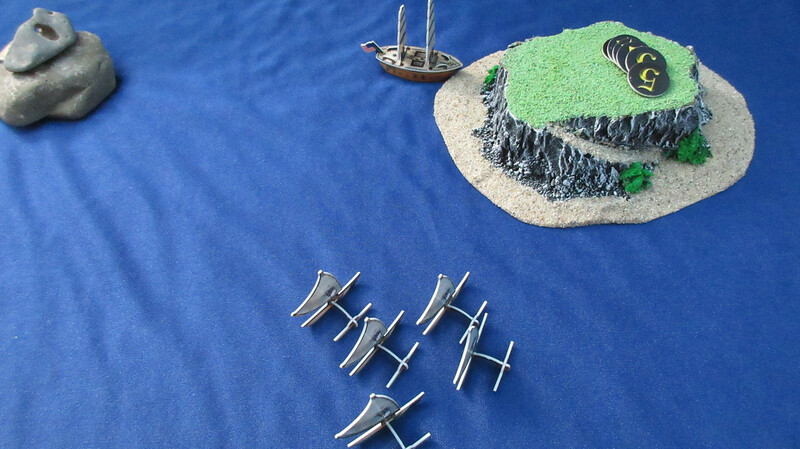 The Spanish are continuing their somewhat cautious strategy, not sending their gold runners out too far by themselves and now not going where the English just sailed. They don’t know about Sharpe’s presence, but they seem to have made a good decision so far…. 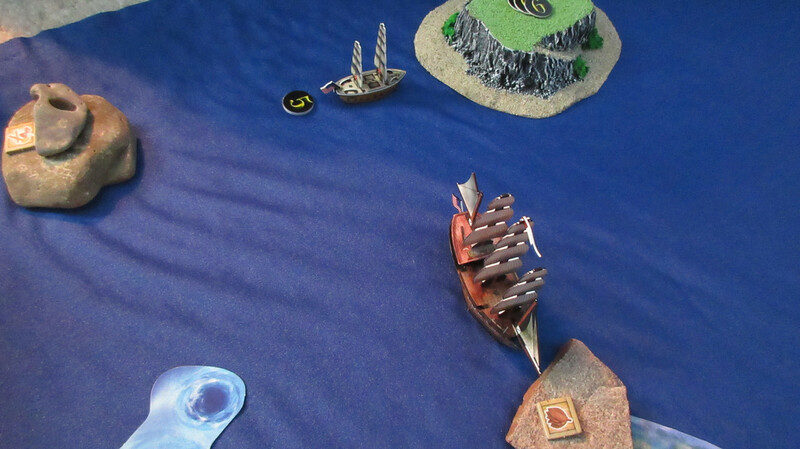 The Argo reaches the low point of Luck Island while the Bonhomme Richard explores Ruby Island, finding luxuries! I’m using a tobacco token to represent luxuries for now. Back to Allost, where the Pirates are about to get home. 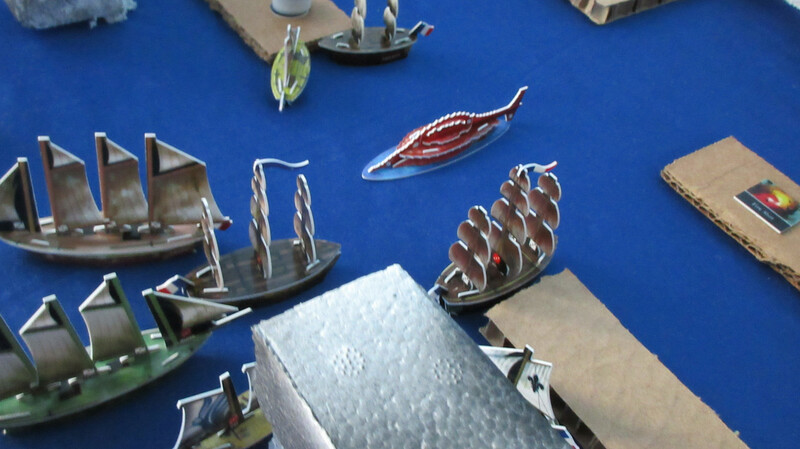 From the main topmast of the Cassandra, the Fancy unloads her spices at the northern arch of the kingdom. 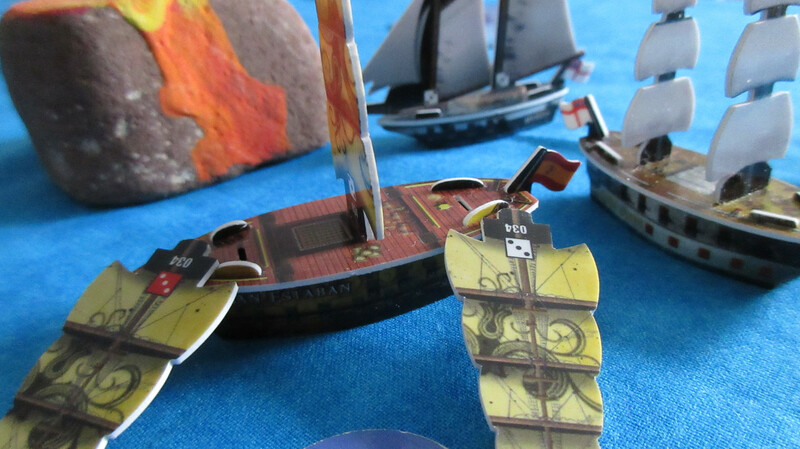 Spices are still nearly worthless, so Mission’s Pirates have to wait another turn to think about launchings. 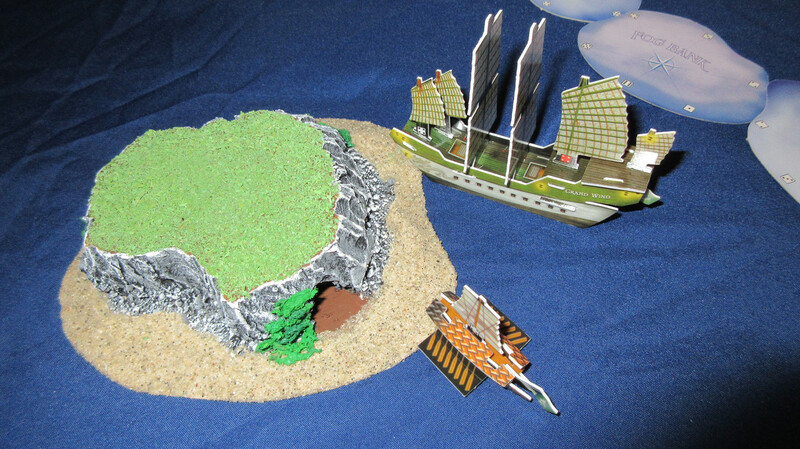 The Grand Wind explores the island and finds textiles! The power of the Royal Navy, seen at deck level. Run out the guns! The Ebro leads the Spanish around the sargasso sea she found earlier, and you can glimpse the Apollo beyond Diamond Rock to the right. 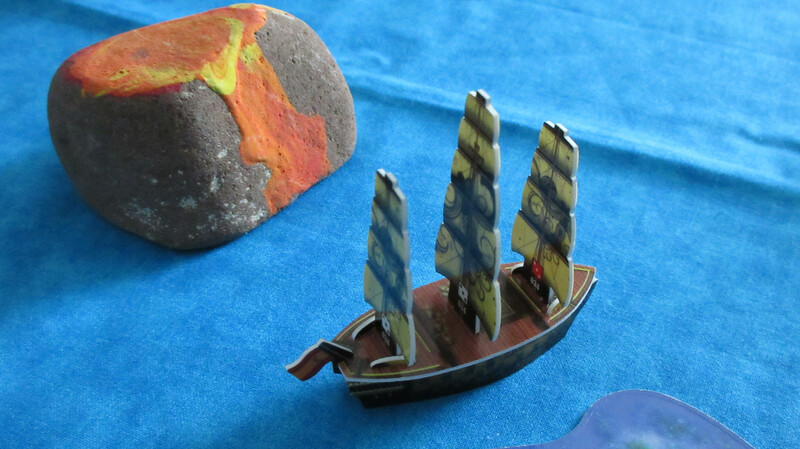 In search of new islands, the Spanish forge onward in the shadow of Diamond Rock. 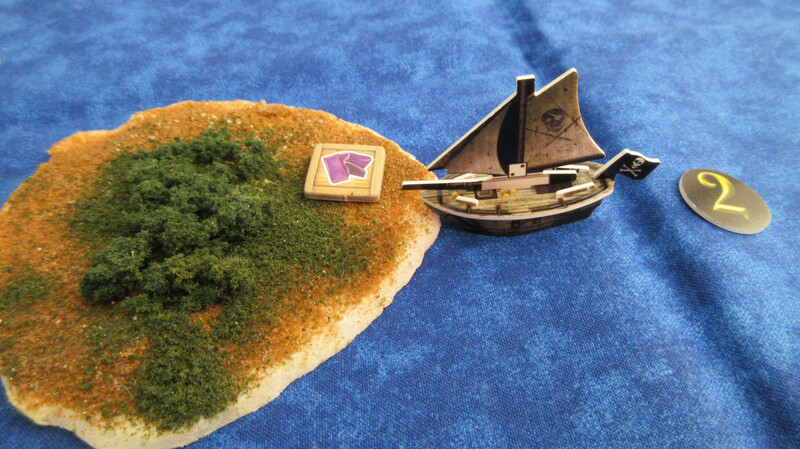 The Argo finds spices on Luck Island! 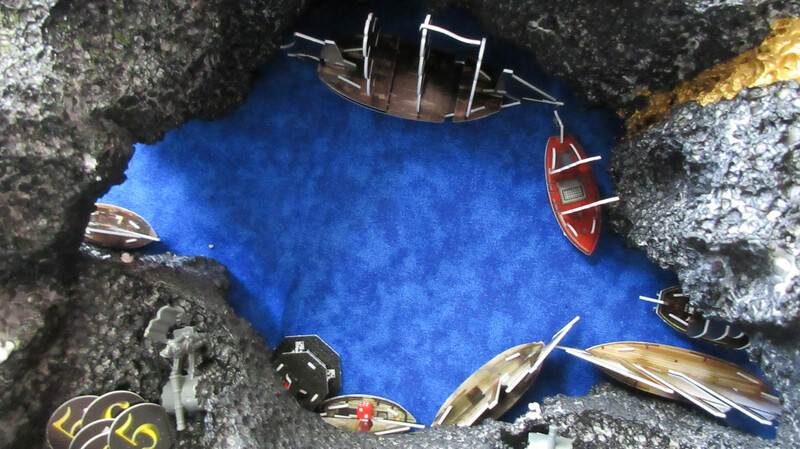 Tough to get these shots since the hole is so small, but you can glimpse the Argo’s mizzenmast sail from the hole in Luck Island, where spices have been found. The first launching of the game! The Cassandra and Smiling Jim docked home some good resources and cashed them in for 29 gold. 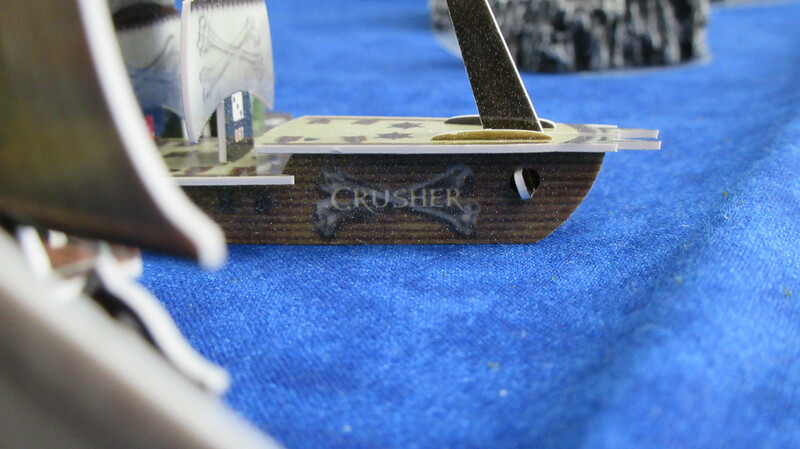 Mission gets his own ship at last, the Crusher! 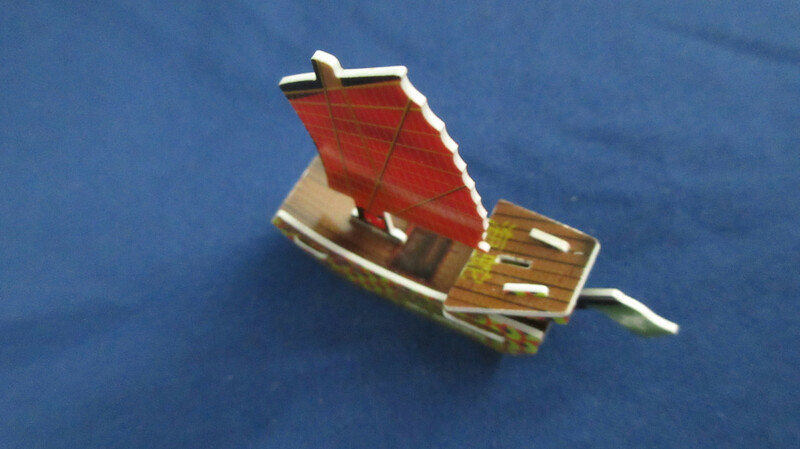 He also ordered construction of the Doombox, a nice flotilla from the same super rare pack. However, the Crusher won’t tow the Doombox since she’d lose the speed bonus provided by her new helmsman. 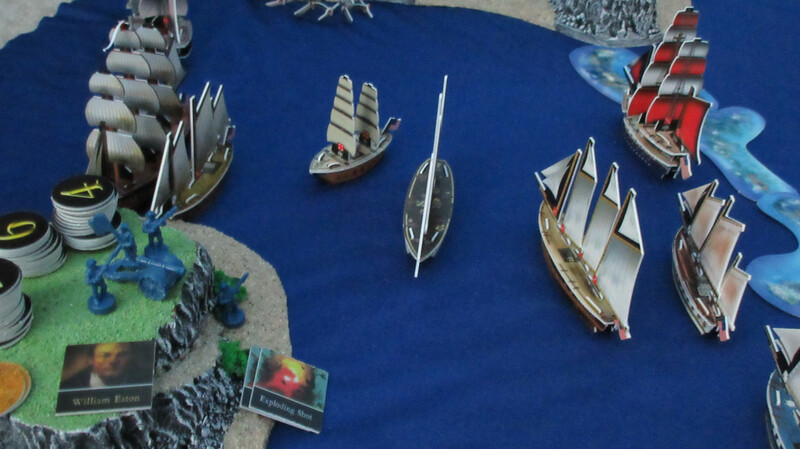 Mission transfers his flag from the Cassandra to the Crusher, as the Crusher is now the Pirate flagship. 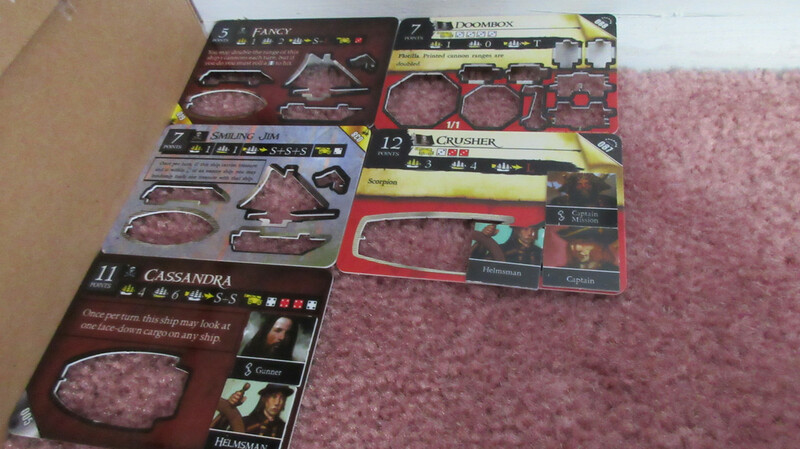 The Cassandra will continue to gather lots of resources, and Mission made sure to hire crew that would maximize her effectiveness in that role. Here you can see the shakeup. 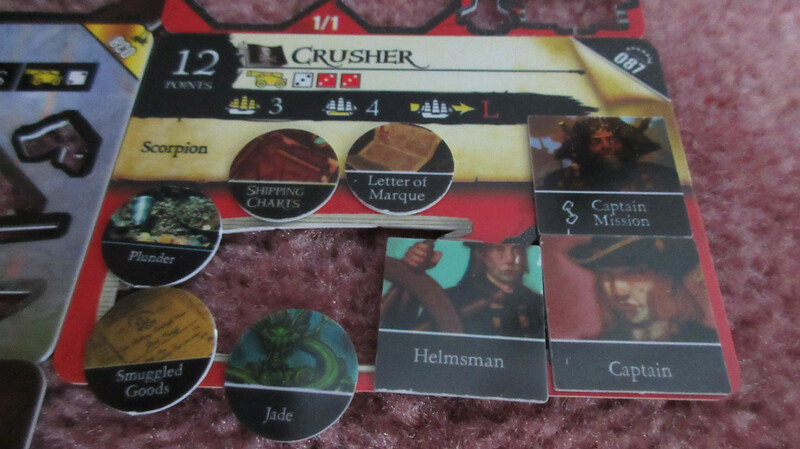 Mission boards the Crusher with a new captain and helmsman, but makes sure to outfit his old ship with good crew to not leave her forgotten. Indeed, the Cassandra is more effective than before, with potential for 6S speed between the helmsman and Gunner’s SAT ability. Grand indeed! Couldn’t resist this closeup. 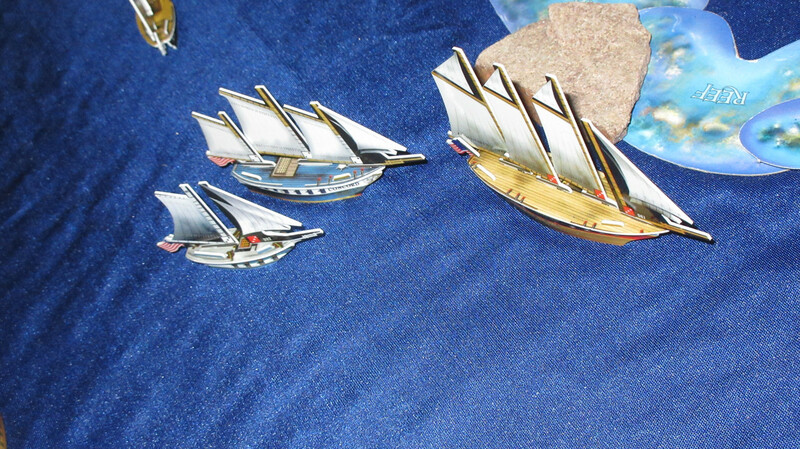 I’ve always loved how the 6 masted junks look. 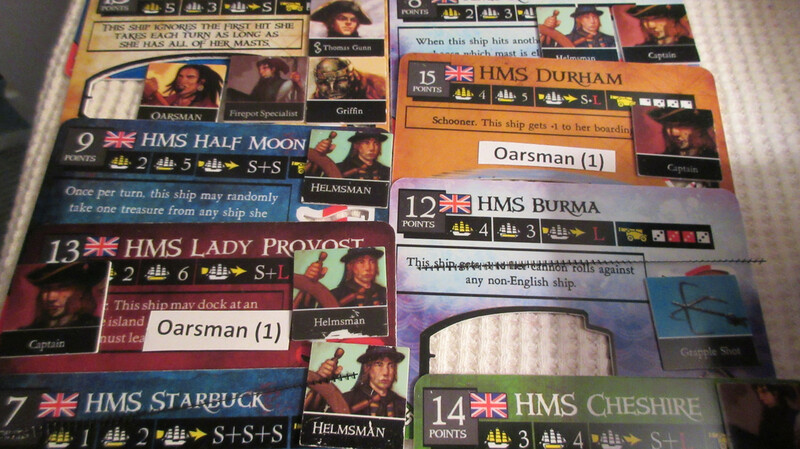 Spending 16 gold, the English purchase HMS Half Moon with a helmsman, as well as the first army units of the game! 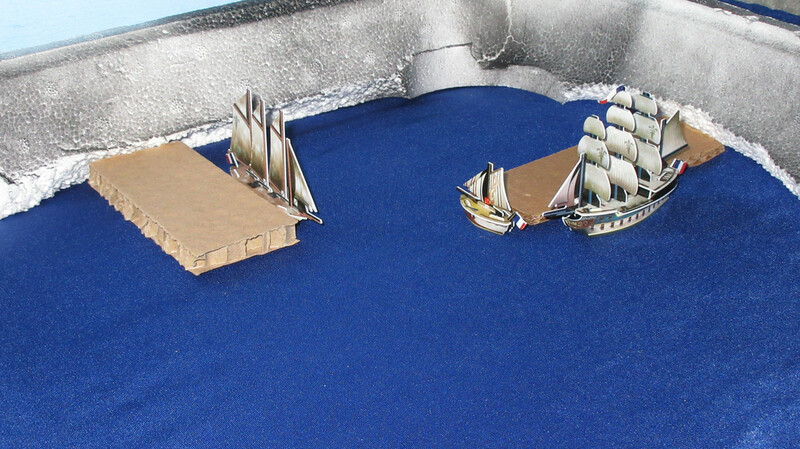 Two infantry units will board the Apollo, while the artillery cannon has been taken aboard the Viceroy. The current Spanish view of Diamond Rock, showing the imposing back area and the impressive height. Paradise found? Perhaps, but the Spanish will have to spend some time exploring it to discover what the island has in store for them. Finally we are back in the Sea of Karkuda! 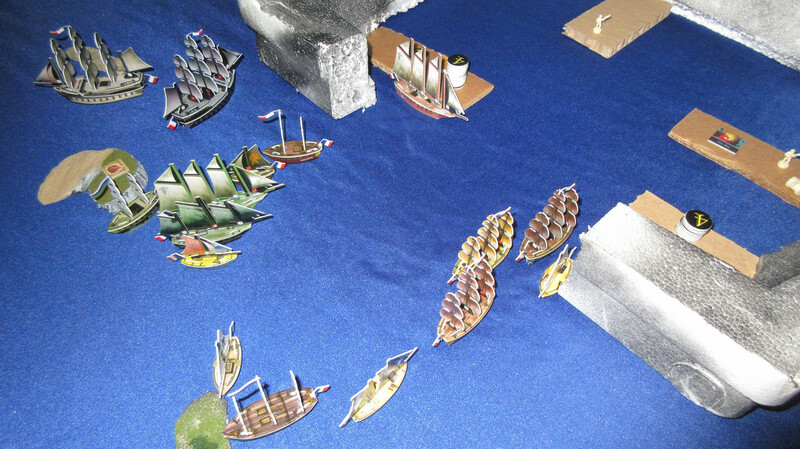 The French dock at nearly the same spots they started the game at, and cash in their fish/food/bananas for 24 gold! 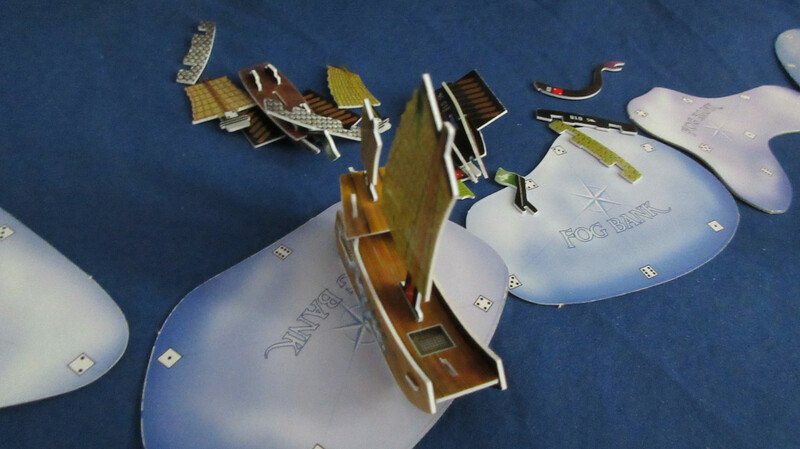 They spend it all on two basic things: Le Lyon, a 4 masted schooner with good speed and cargo space, and their first dock purchase! 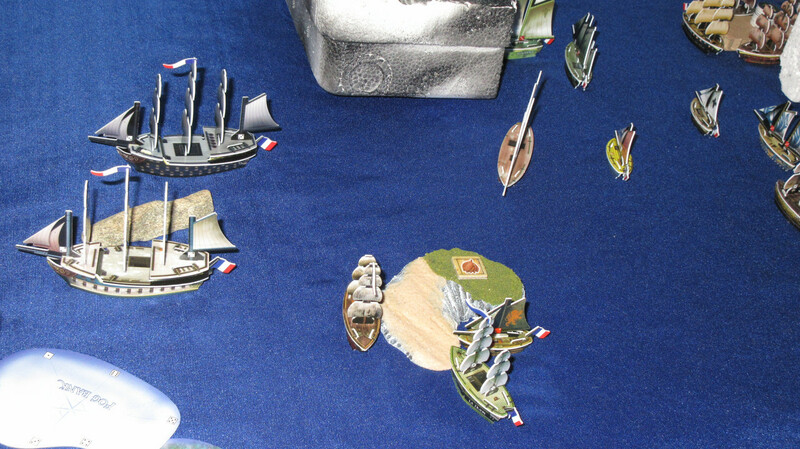 The French have much more room to expand, but are happy with their progress so far. For now, we end with the Americans and their resource gathering. However, it won’t be long until more things happen. I was only able to play one turn today, but there should be an absolute intensive flurry of turns over the next 3-4 days. 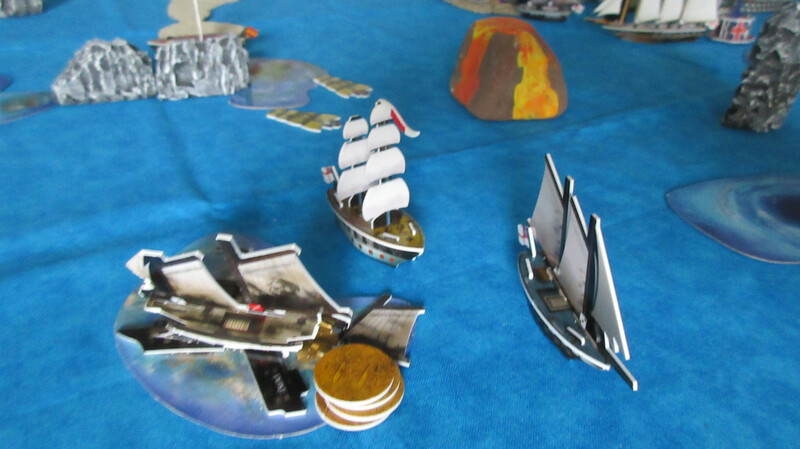 Gunner succeeded on his first SAT roll, allowing the Cassandra to leave Mission’s Pirate Kingdom at 6S and reach Pistol Island again! 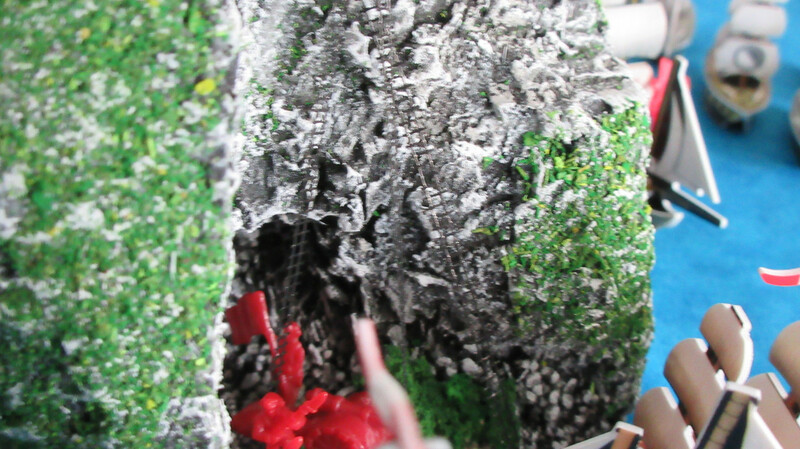 You can also see Mission leaving in the Crusher. 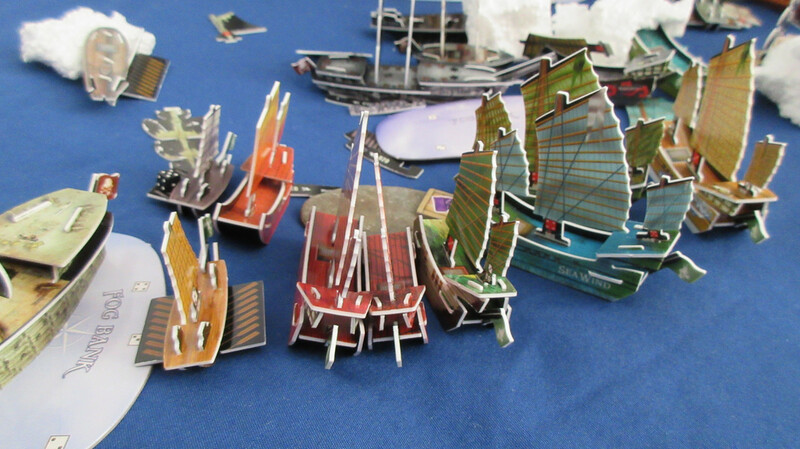 On the northern side of the kingdom, the Fancy loads more spices while the Smiling Jim sails out with Doombox in tow. 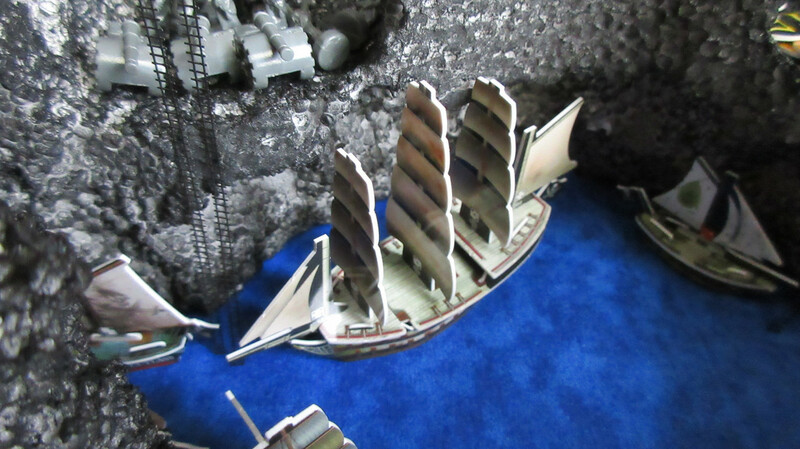 The Grand Wind returns home with textiles and the Jade Rebels have their first launch! 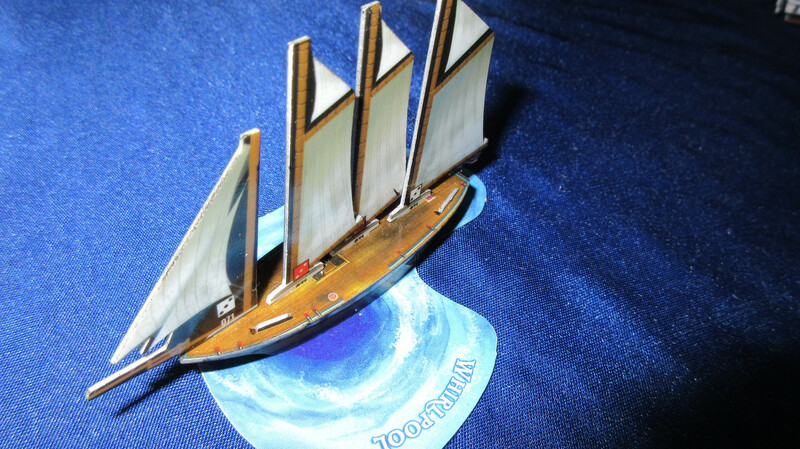 The Virtuous Wind is built, and crewed with a helmsman for now. 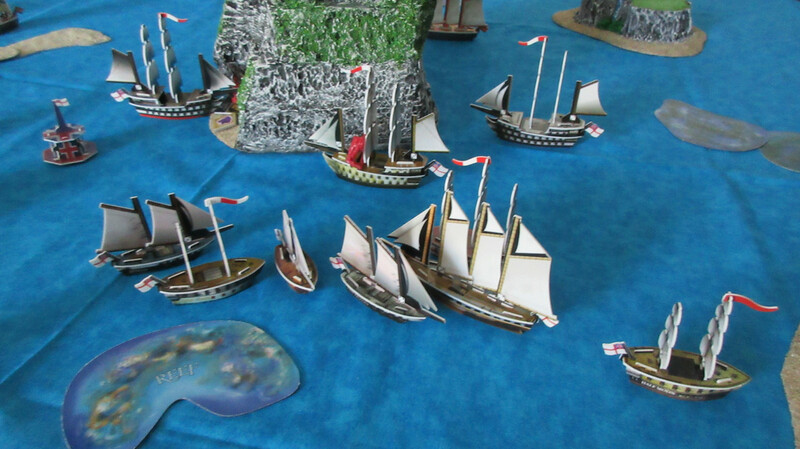 An impressive sight: the English, sailing straight back to Diamond Rock with their new ship and the first army units in play. Paradise indeed! 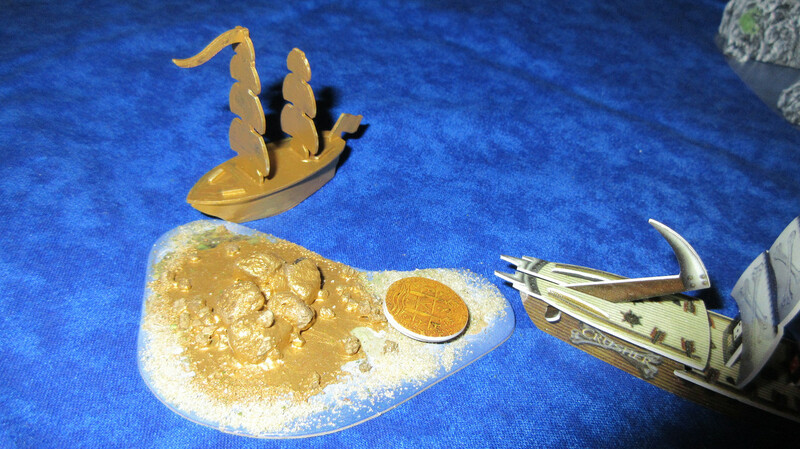 The Ebro explores Paradise Island, finding not just gold, but metals as well! 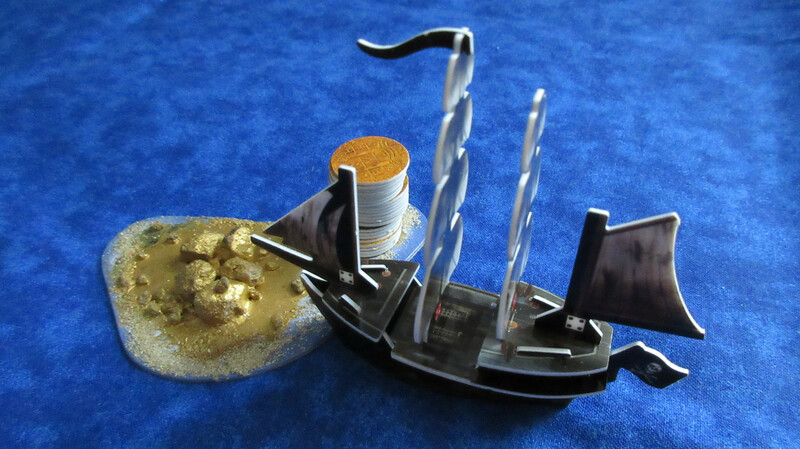 She and the San Estaban load some coins, while the Magdalena loads a coin of her own and a metal token. 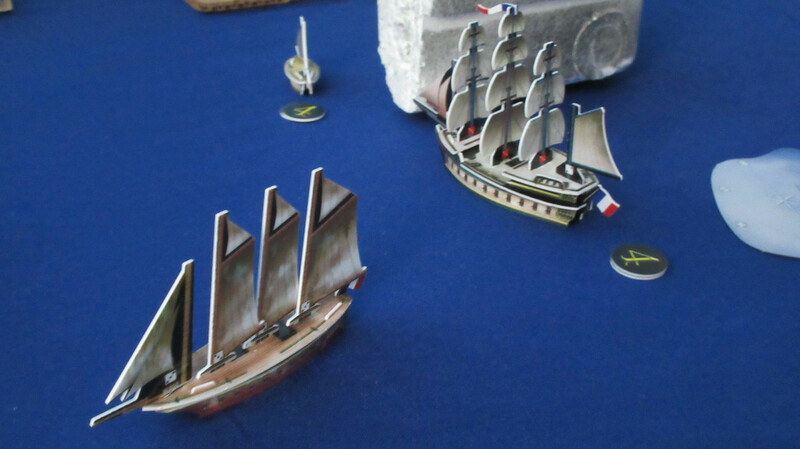 With an Admiral’s Action given to the newly launched Lyon, the French set out in force. 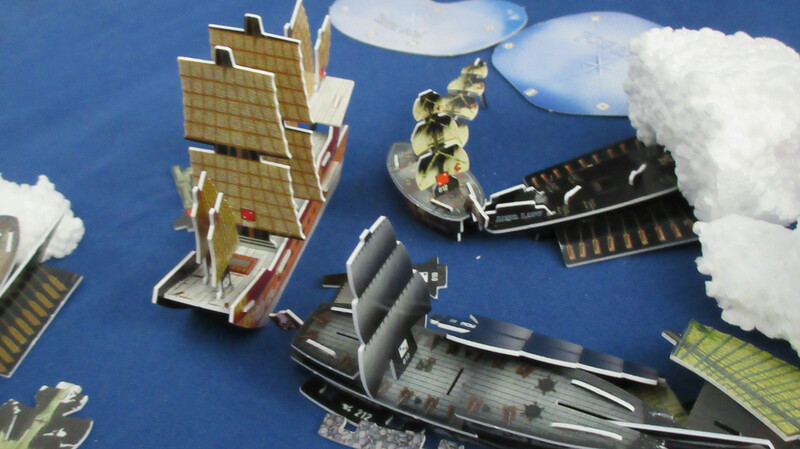 The Bonhomme Richard loads more luxuries from Ruby Island and the Argo docks home her spices. Those resources are the least valuable right now, but this was the last turn of the first 8, and the first resource change will occur on the next turn! 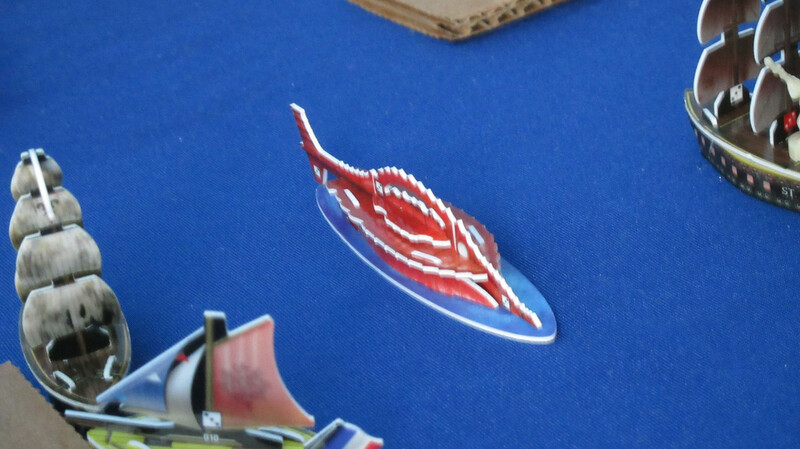 Today I was able to play a whopping 10 turns!! Naturally this will be one of the longer reports. The day of play started with the first resource change of the game! 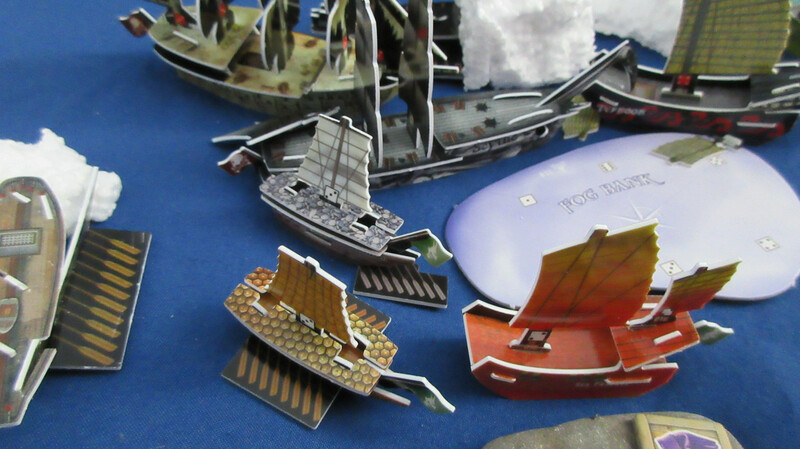 A 3 was rolled, meaning that textiles were the most valuable resource and completely tanking and metals and fish markets. 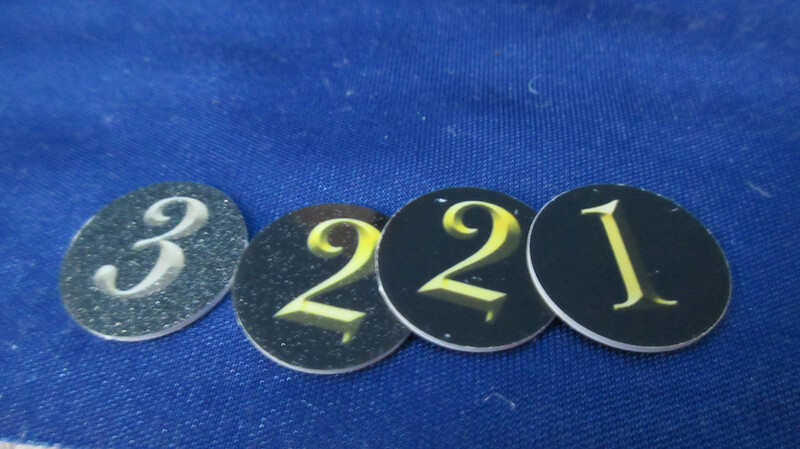 These values would hold for 7 turns, another average duration roll after 8 turns for the first roll. An overhead view of Mission’s kingdom. 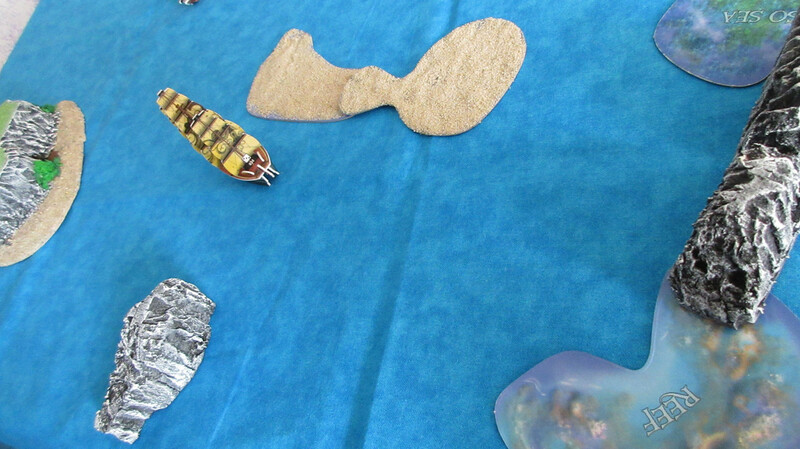 Their resources have changed, with textiles now being more valuable than metals. 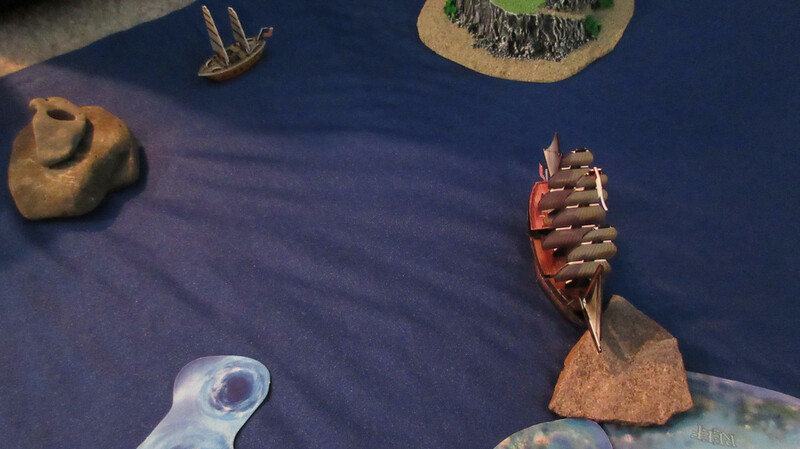 The Jade Rebels launch another ship, the Sea Serpent. She is tasked with finding new islands in an exploratory mission. 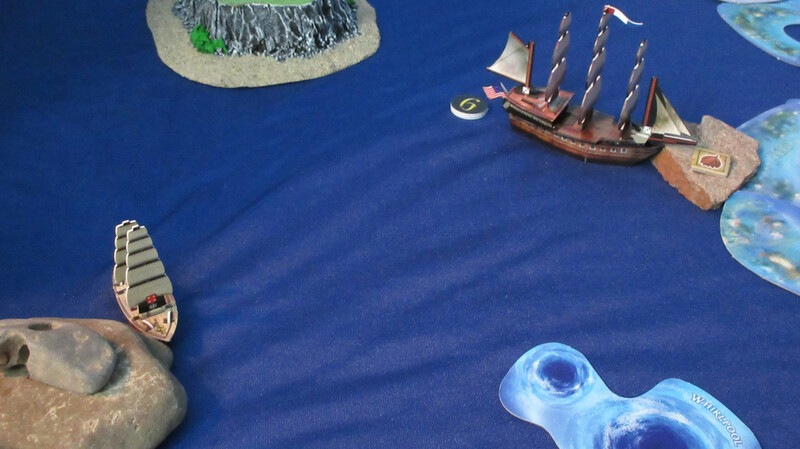 Crewed with a cannoneer and smokepot specialist, she can use her reverse captain ability to duck into a smokebank if she gets into trouble. The English approach Diamond Rock again. 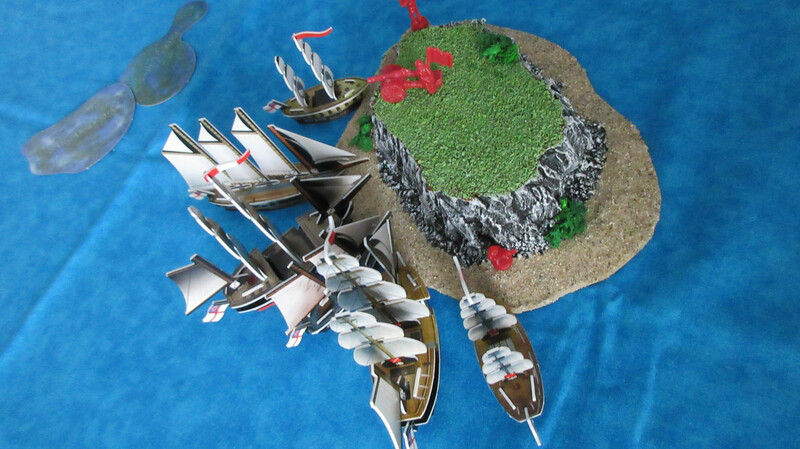 They already consider the island theirs, and want to make that clear to any who sail Caribbean waters. 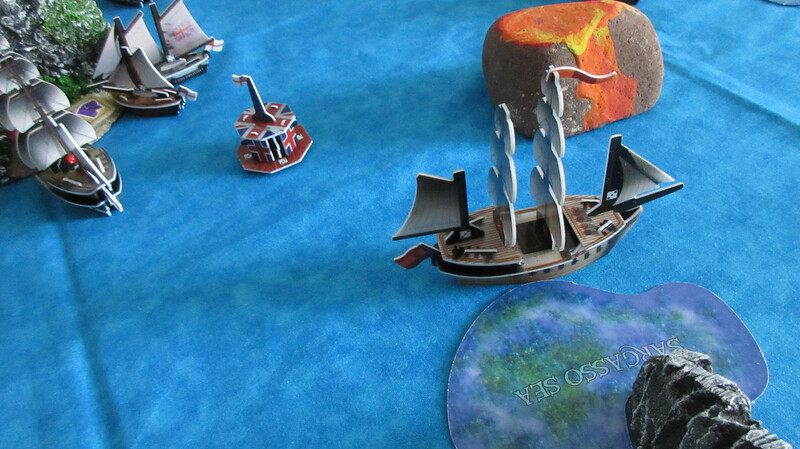 To the left, the Ebro uses her ability to take a shortcut home over the sargasso sea. In the Sea of Karkuda, France’s newest ship, Le Lyon, loads fish from the wild island. 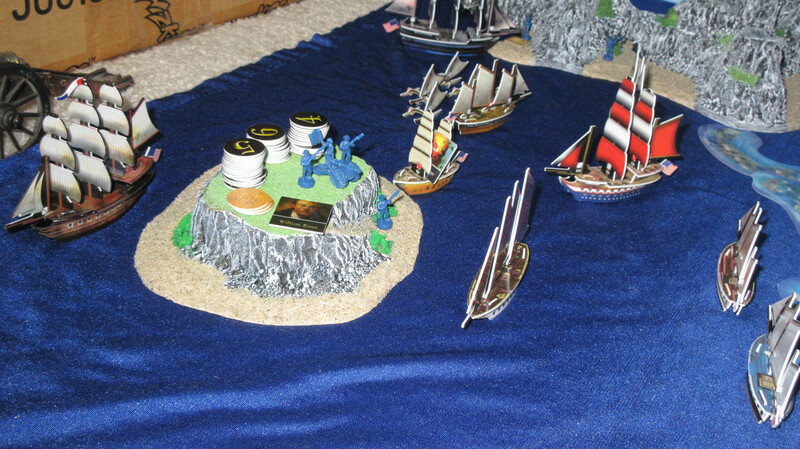 Another turn begins, and it’s a profitable one for the Pirates! 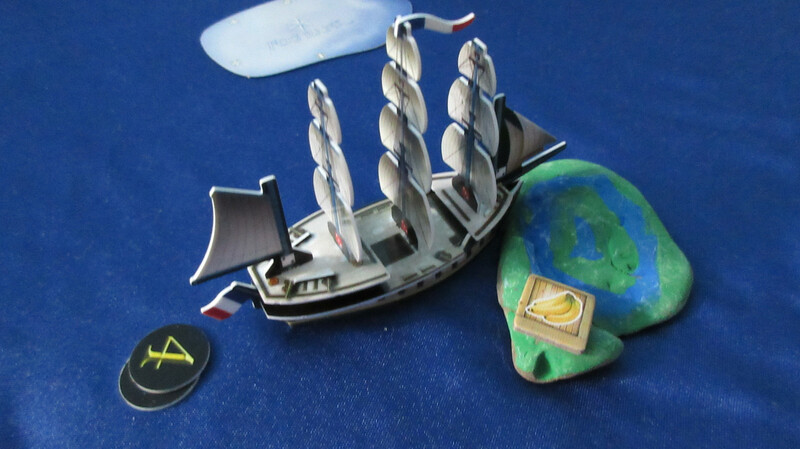 Mission gets an extra action, allowing the Crusher to dock at and explore a golden island! 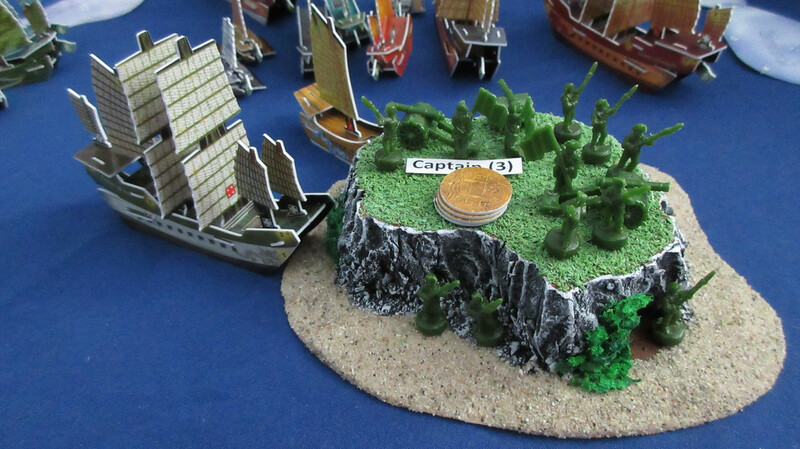 First used in my Economy Edition game but no longer within the Lagoon, this island will feature replenishing gold stores once more. 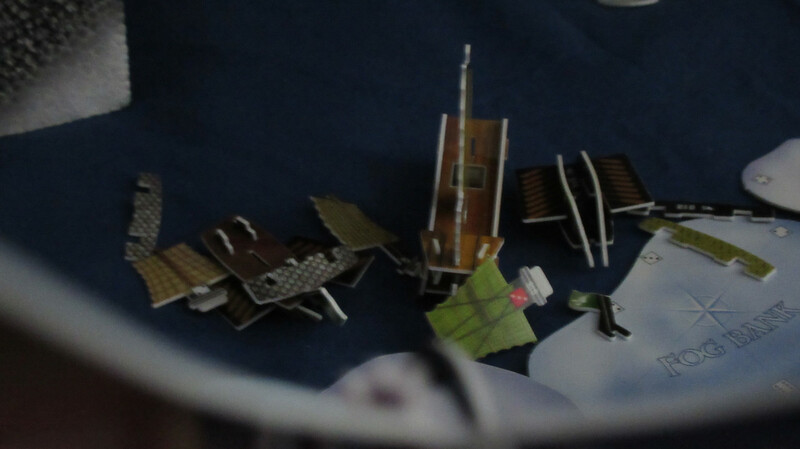 You can see part of the haul Mission got, which also included the Jade UT. 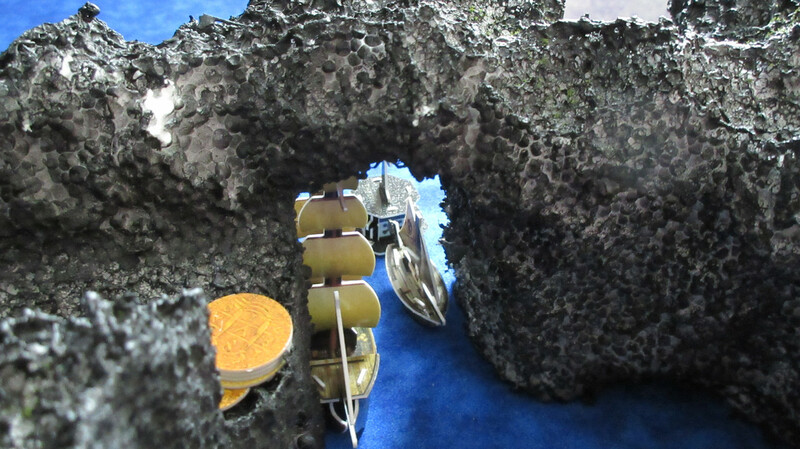 With 3 spaces already occupied by crew, this unfortunately meant that the Crusher couldn’t load any actual gold coins, but Mission certainly had plans on what to do with the other UT’s. Wow! 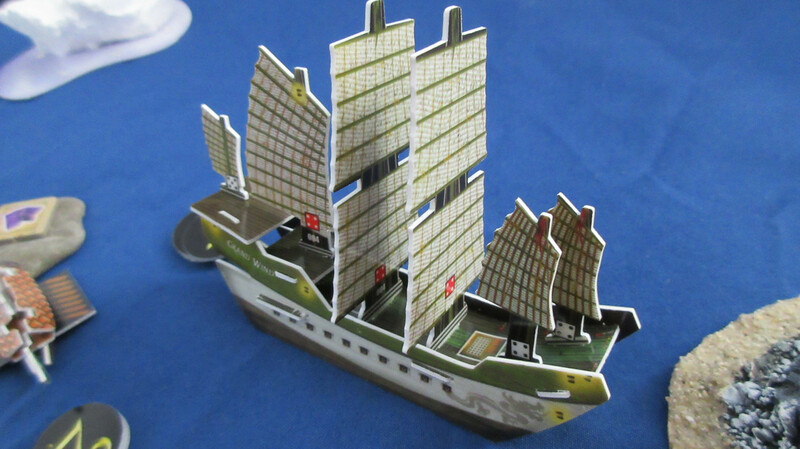 The Jade Rebellion spends some gold to purchase the Grand Dynasty, the first ship in the South China Seas set and unofficial flagship of their faction. 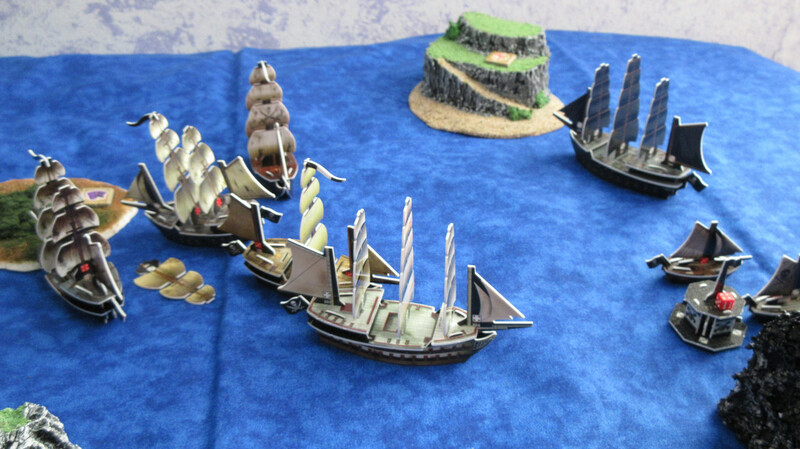 The English dock all three of their ships at Diamond Rock, and true to their objective, unload all three army units there as well! 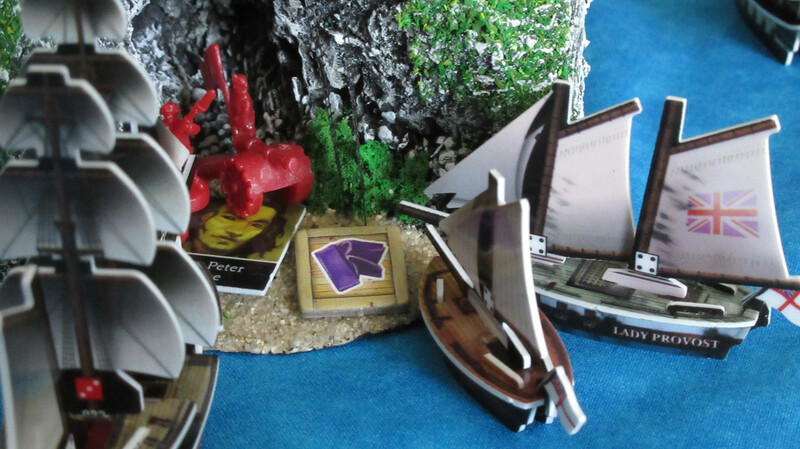 Now Peter Sharpe has some company, and can breathe a sigh of relief. He won’t have to defend the lone beach all by himself anymore. 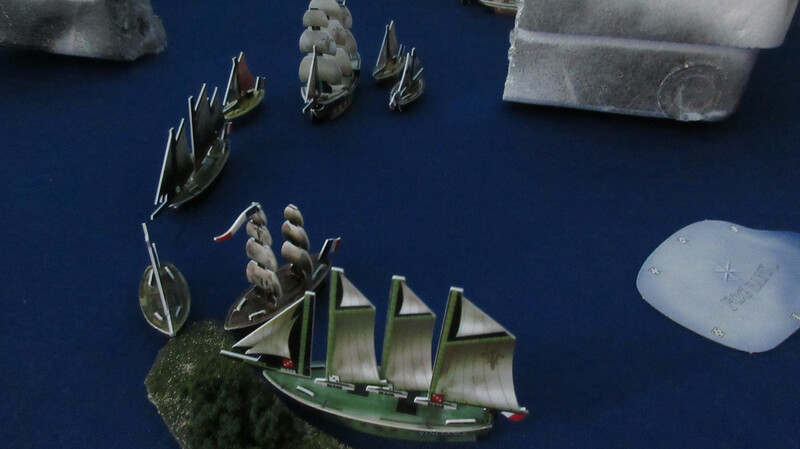 Remember that while shooting at ships, the infantry act as a 3S cannon that can only eliminate crew, and the artillery acts as a regular 2L cannon fired from the shore. 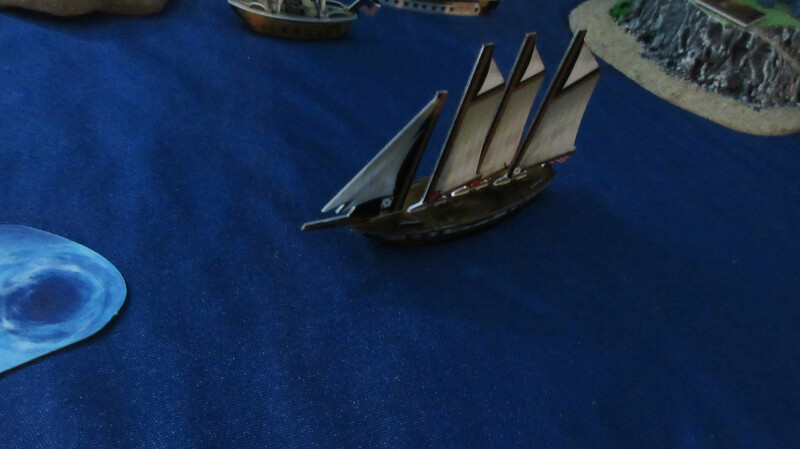 Pretty good firepower to defend a small beachhead with, especially if the Spanish are the first to contest it as the Spaniards are off to a bit of a slow start. Speaking of the Spanish, there they are! 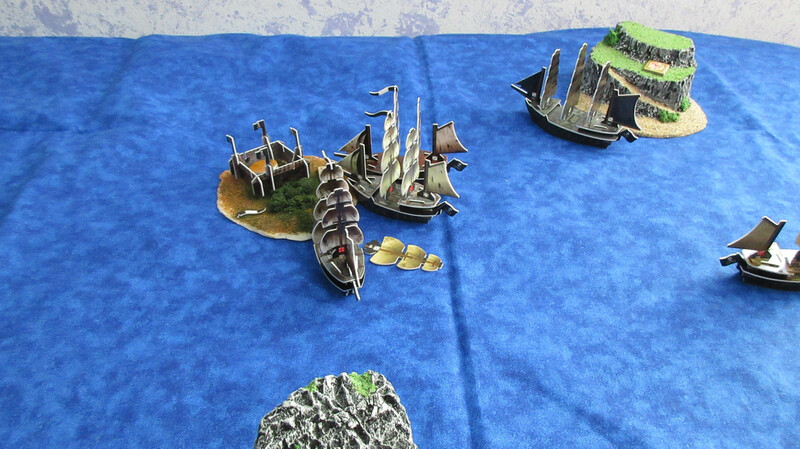 All three ships make their way home from Paradise Island. 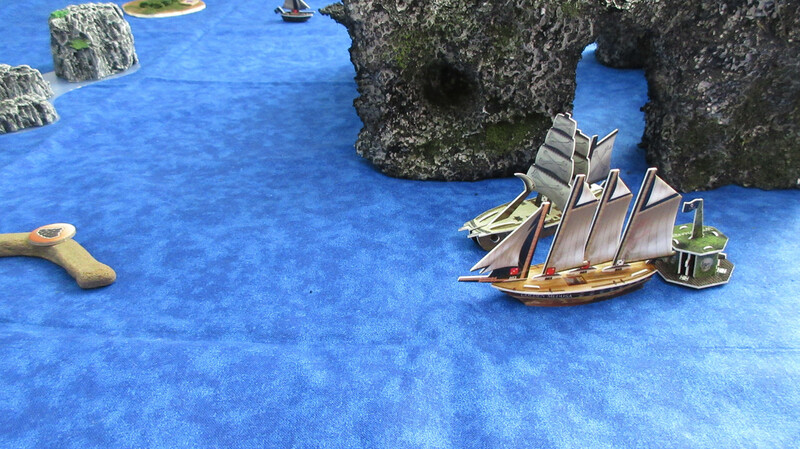 Yes the Americans are still sailing about! 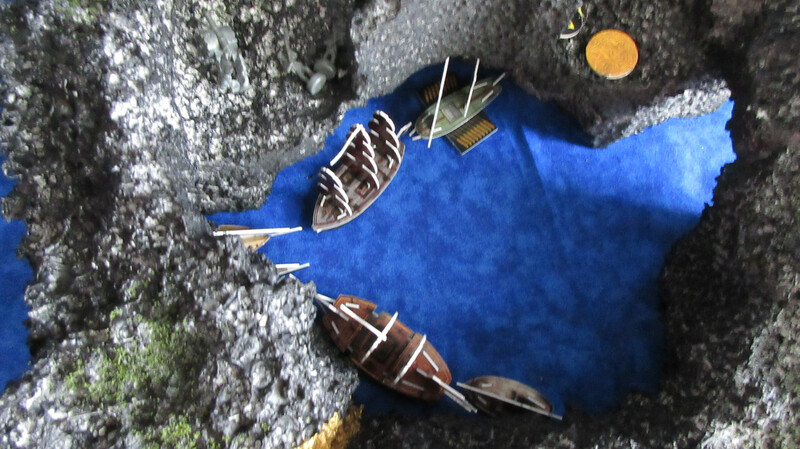 In fact they are doing quite well for themselves, having launched the Bellevue with a chieftain and helmsman along with a set of their incredible native canoes. 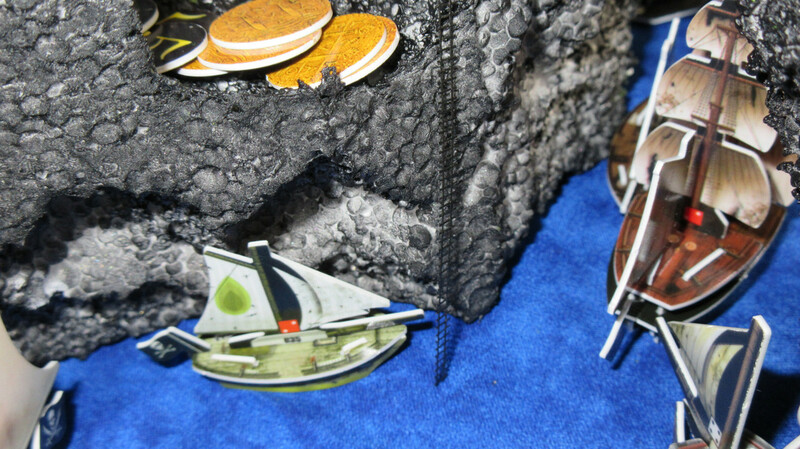 Mission gets another EA and is able to explore the outbound Cassandra, transferring Smuggled Goods, Jade, and Plunder from the Crusher. 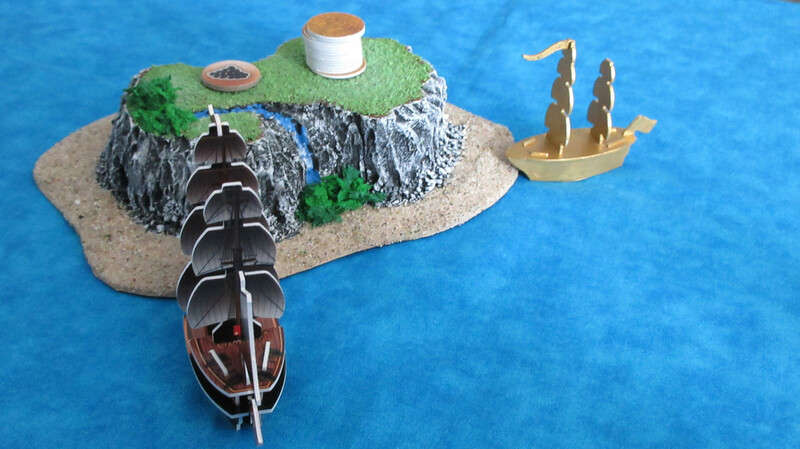 Mission hopes to return to the gold island and plunder it himself, while the Cassandra can maximize resource profits back home with the other runners up north. 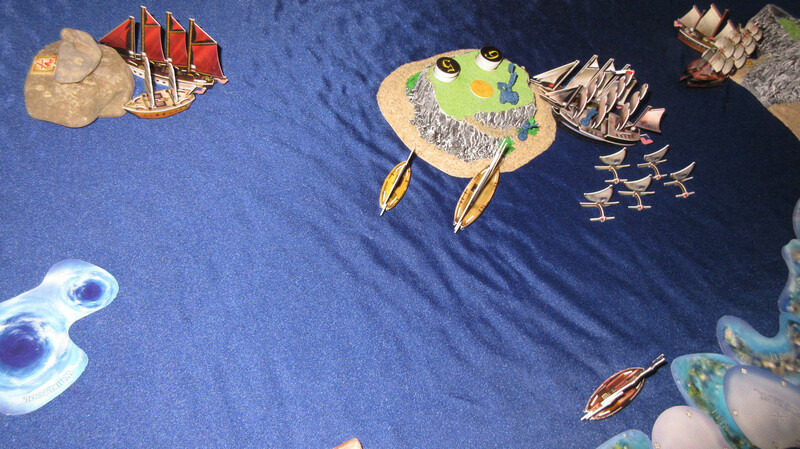 The Grand Wind loads up on textiles, while the Sea Serpent’s crew say goodbye for the time being. 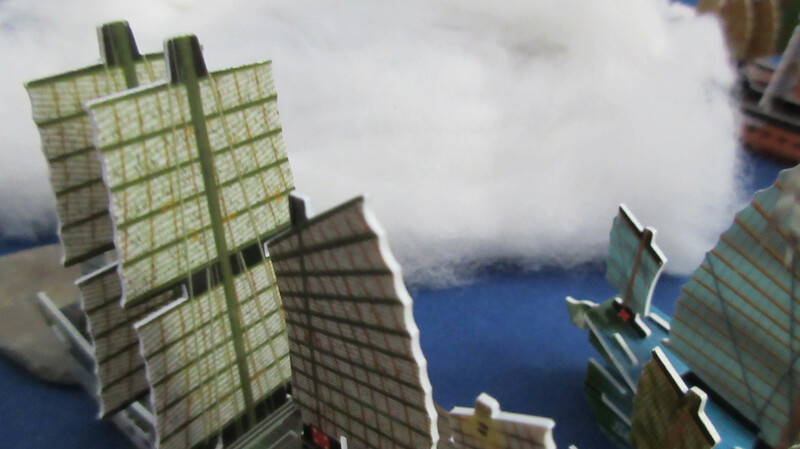 The Virtuous Wind is busy running textiles with the Grand Wind and Sea Snake, but the Grand Dynasty is tasked with defending the home island and investigating the fog to the east of it. 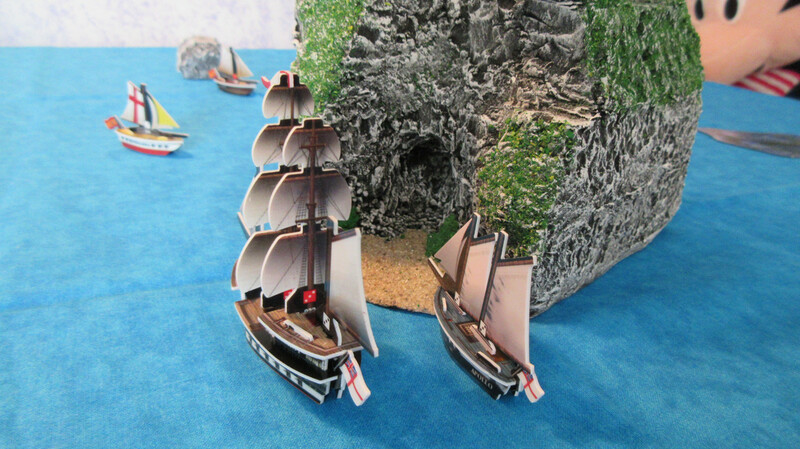 The English depart from Diamond Rock, promising Peter Sharpe and the troops stationed there that they’ll be back with more ships AND supplies before long…. 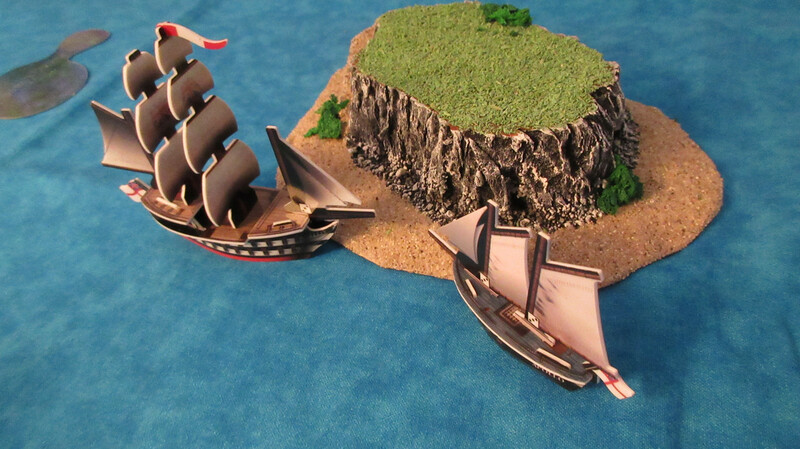 Already a well-defended position, the English have staked a claim on one of my new favorite custom islands. 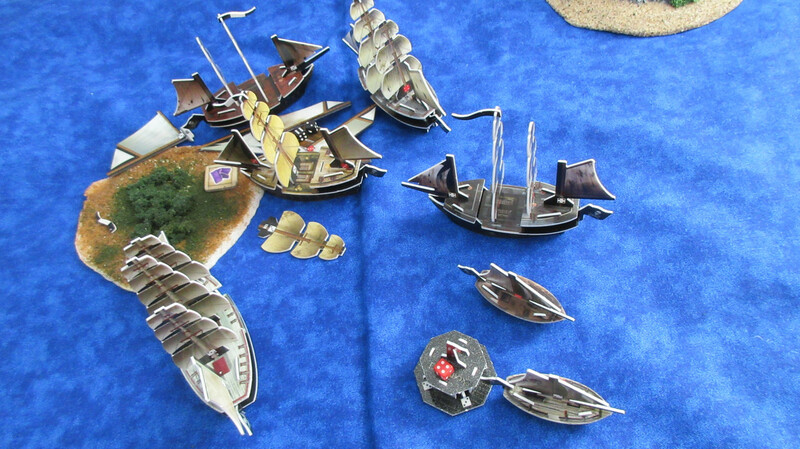 The Spanish bring back a somewhat meager supply of gold from Paradise, but use it to purchase the Armada flotilla. It’s assigned to the Ebro, as Alejandro Malaspina has a plan. 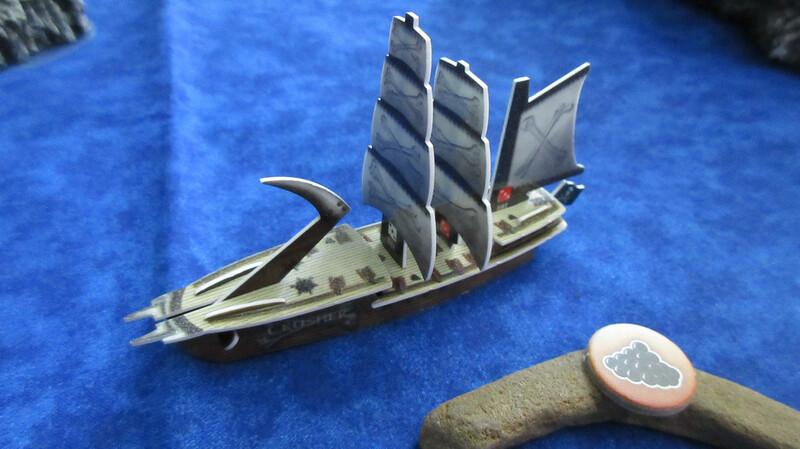 With the metals on Paradise being virtually worthless all of a sudden, the San Estaban can once more sail east in an attempt to find new lands. 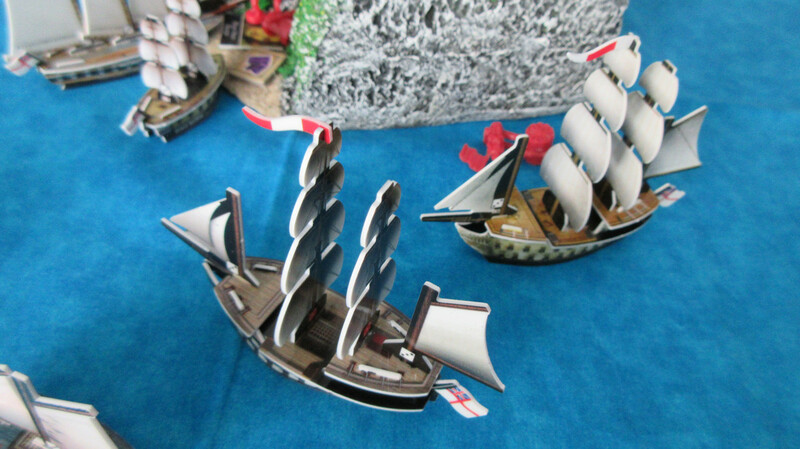 In the meantime, the new flotilla can provide adequate defense for the two sloops in case the English come too close. 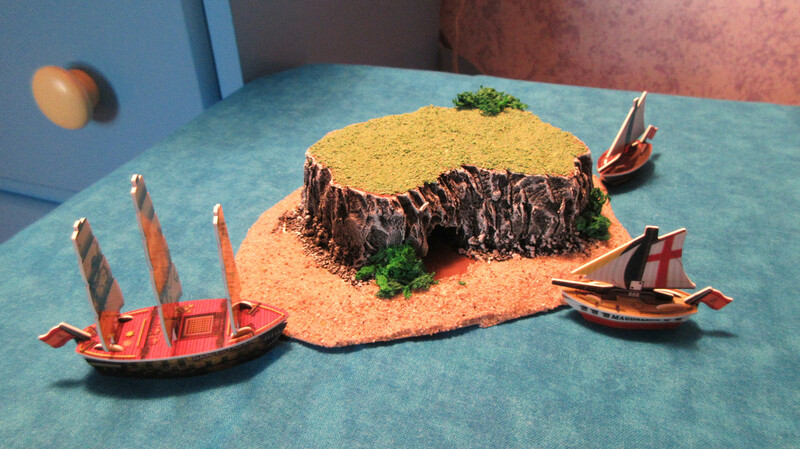 The Soleil Royal sailed past some fog, but now she’s found another island! It looks hospitable, with much greenery. 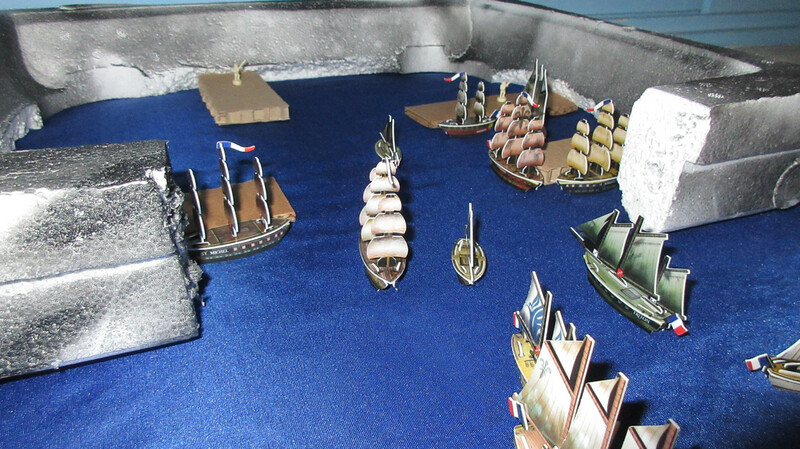 The Bonhomme Richard and Bellevue go for safety in numbers, wondering what they’ll find north of their home island. 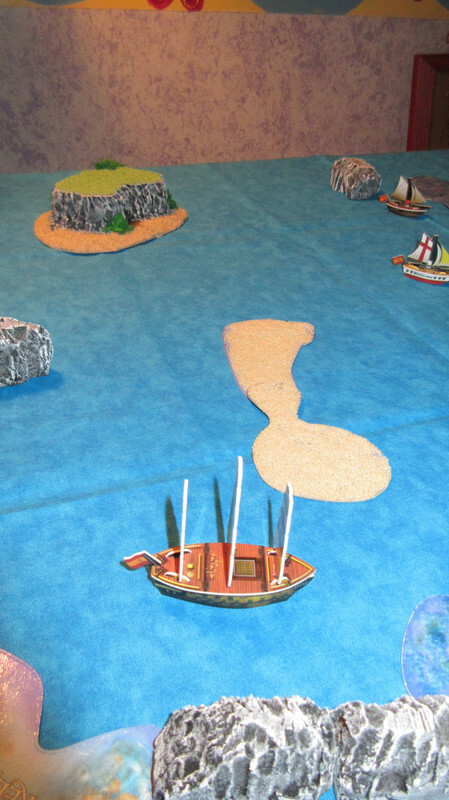 The Cassandra takes off for the textiles island, as it’s now the most valuable resource the Pirates have access to. 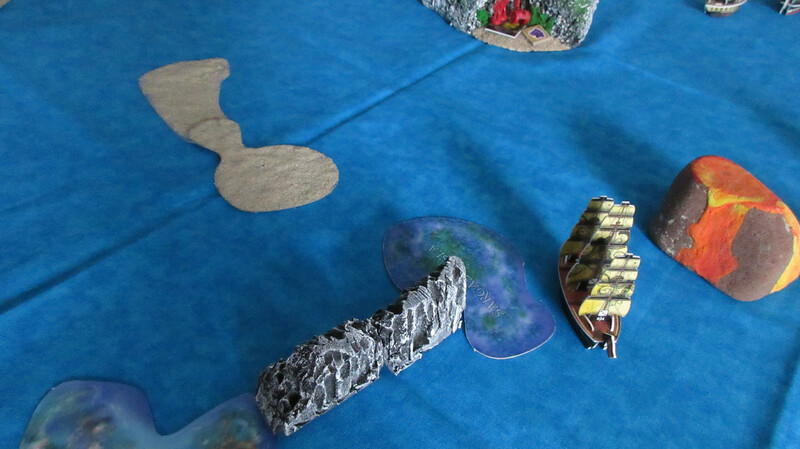 A new area found by the exploring Sea Serpent… what happened here?? 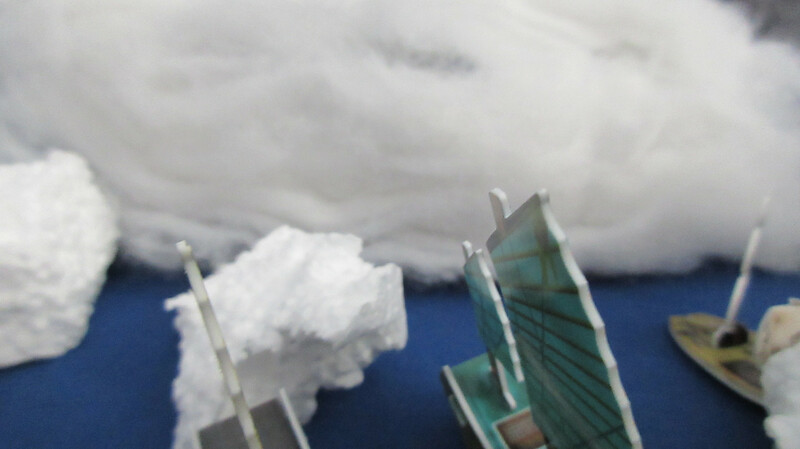 The air became a bit colder, and almost clammy, when the crew aboard the Sea Serpent glimpsed the first icebergs. 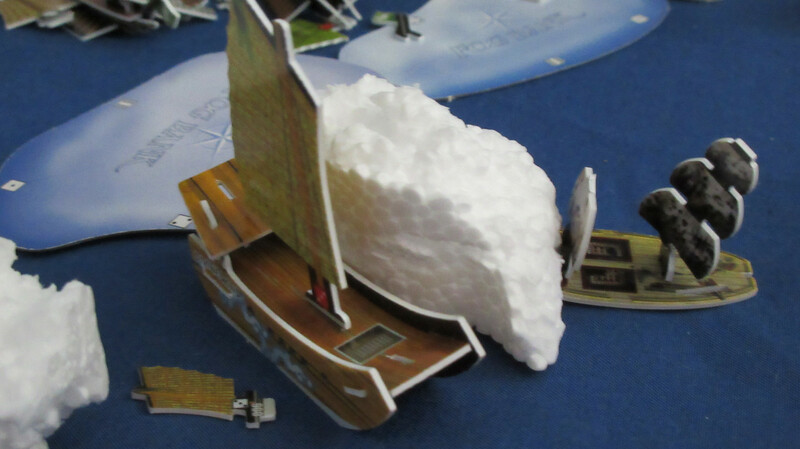 However, it was clear that something had gone very wrong here… there were ships embedded in the ice, as if the ships had crashed headlong into them without warning. 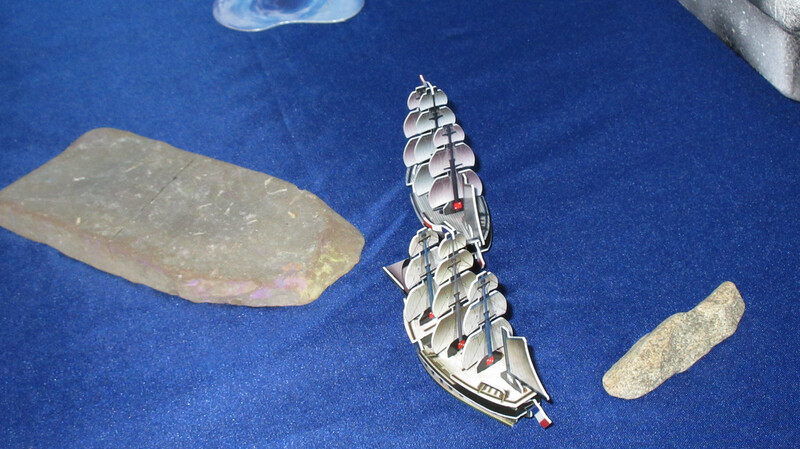 The “icewrecks” (instead of shipwrecks), as the crew called them, appeared to be in a bad state of disrepair, with masts snapped off violently at the base. You can see how the Sea Serpent has only gone a little bit beyond JR territory, but already is in a seemingly different world. With textiles valuable through both resource rolls, the JR’s have simply had no reason to venture very far past their home island in any direction. 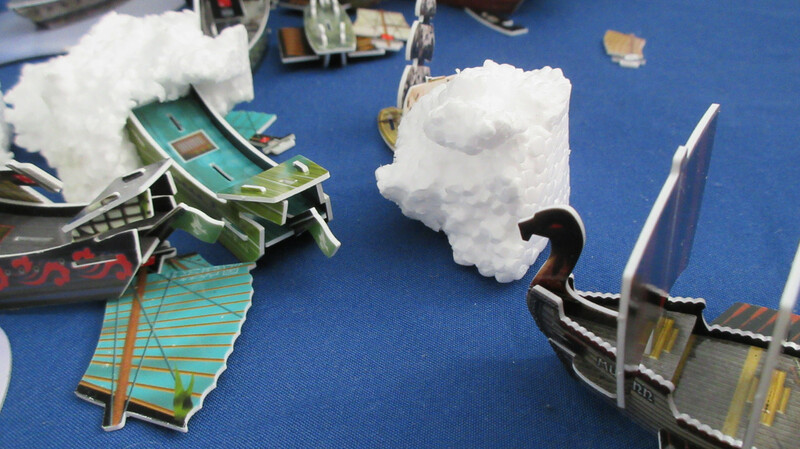 Almost immediately afterwards, and one of the icebergs heads straight for the Sea Serpent!! 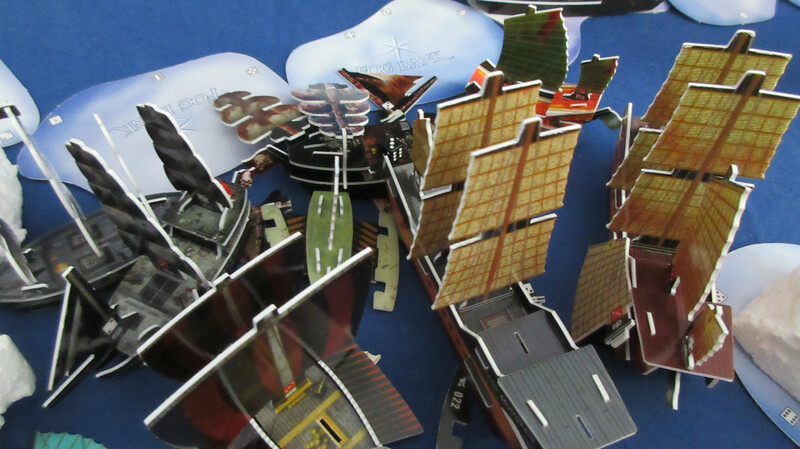 The crew cannot change course fast enough and the ship is hit! 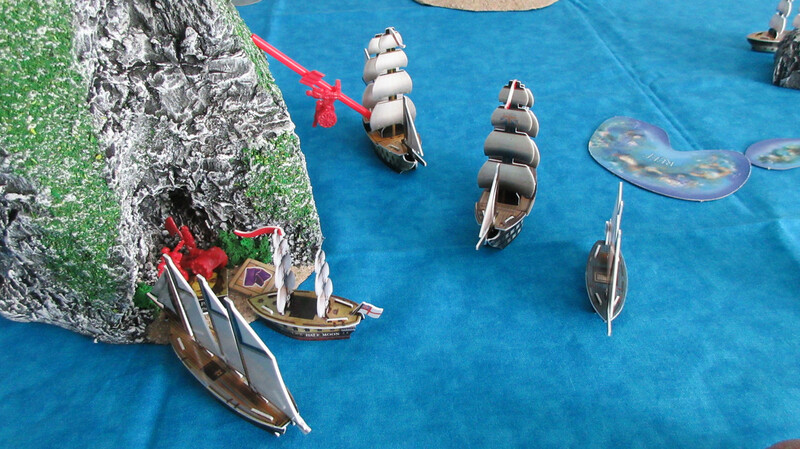 Luckily it wasn’t a fatal blow, as the Sea Serpent only lost her mizzenmast in the collision. 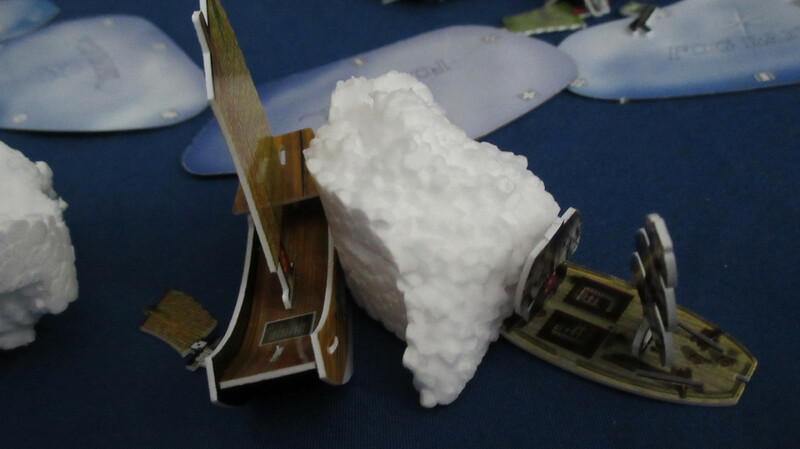 However, the crew remain puzzled by the development, as it seemed as though the “icewreck” had a mind of its own and knew they were there…. 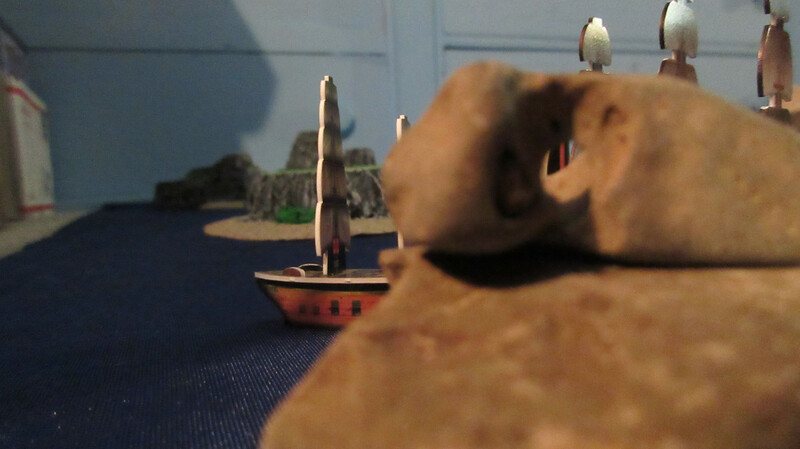 Heeled over to starboard from the sudden impact, the crew of the Sea Serpent were startled for a brief moment. 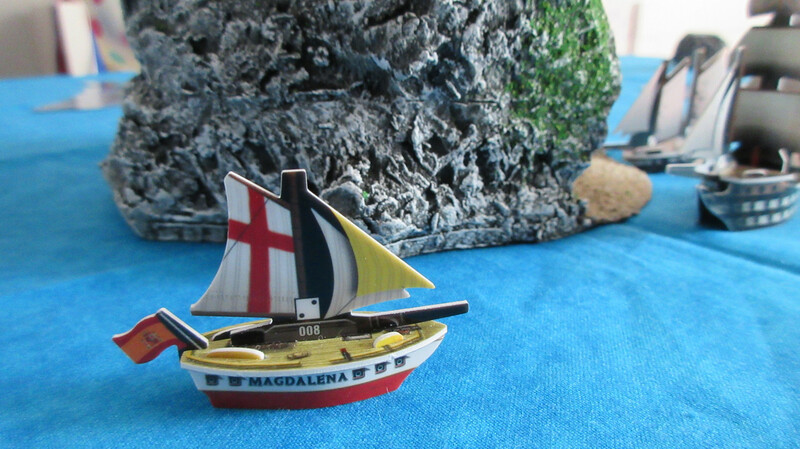 The Magdalena finally returns home, just as the San Estaban sets out to finish her original mission. 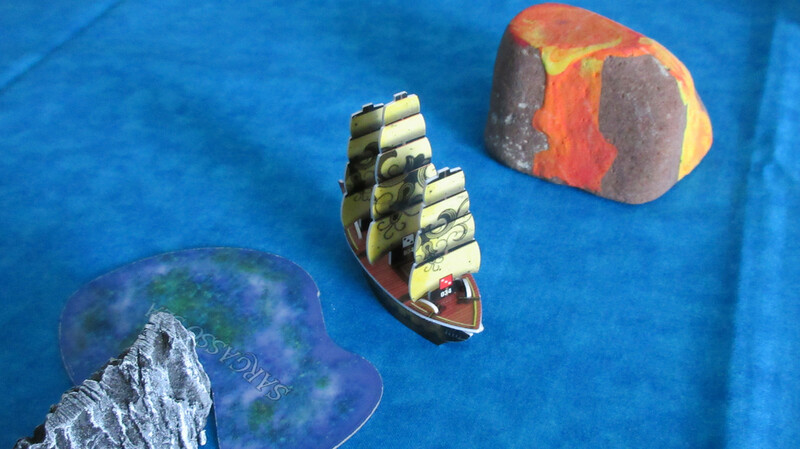 More determined than ever, a few rocks and reefs won’t stop her crew this time! 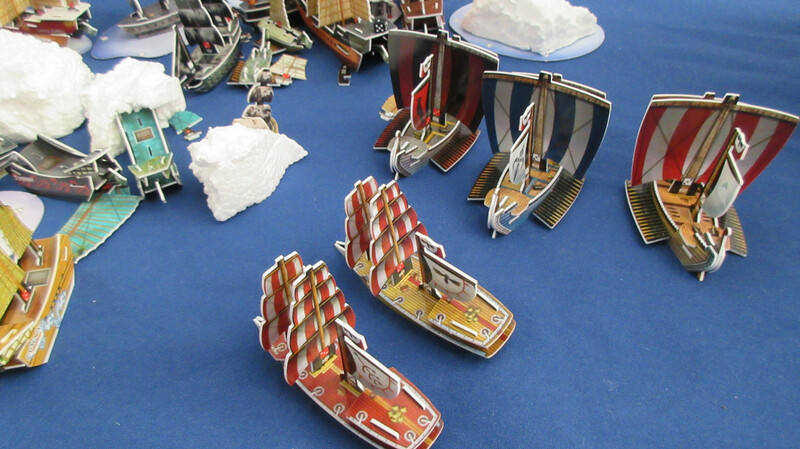 The Spanish hope that Armada is enough of a deterrent for any potential foes. In the meantime, the Bellevue and Bonhomme Richard approach a new island! 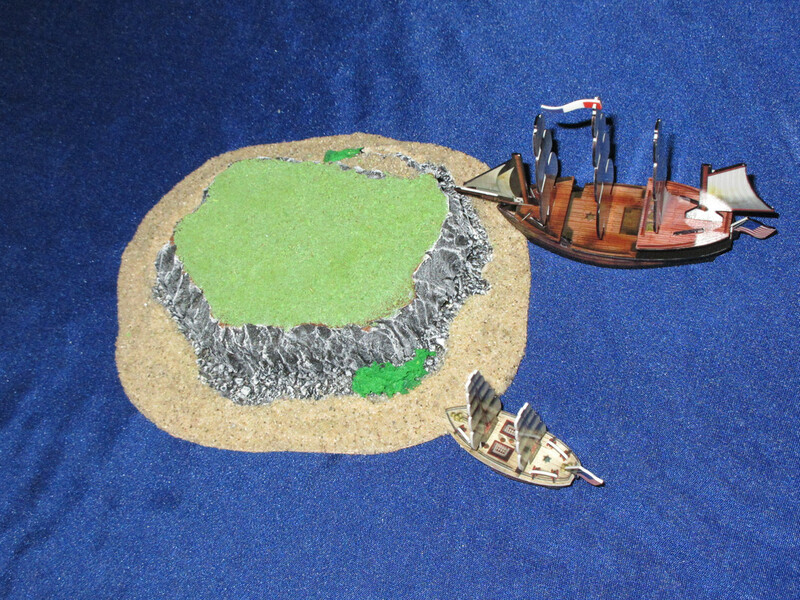 A rare northern view of the Pirate Kingdom, showing the Smiling Jim at an entrance and the other Pirate resource gatherers collecting as many textiles as possible before the resources change again. 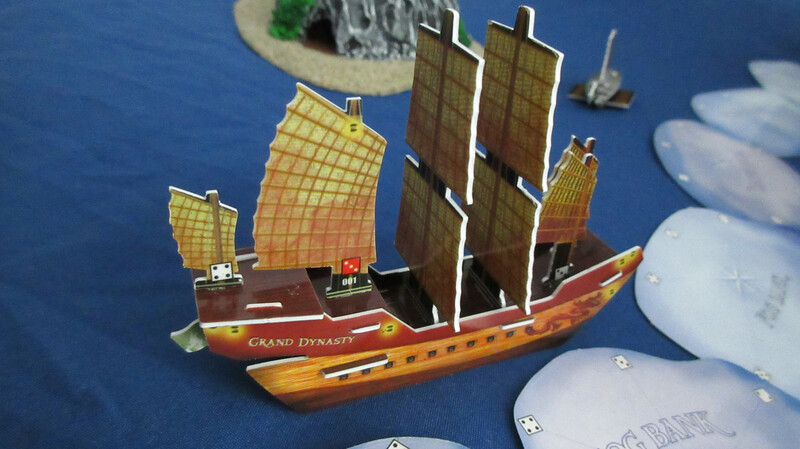 The Grand Dynasty sails east of the JR home island, but simply finds a dense wall of fog as reported by Warlord Cavendish aboard the Grand Wind. The Noble Swan joins her, but she has been tasked solely with HI defense. Field day for the English! 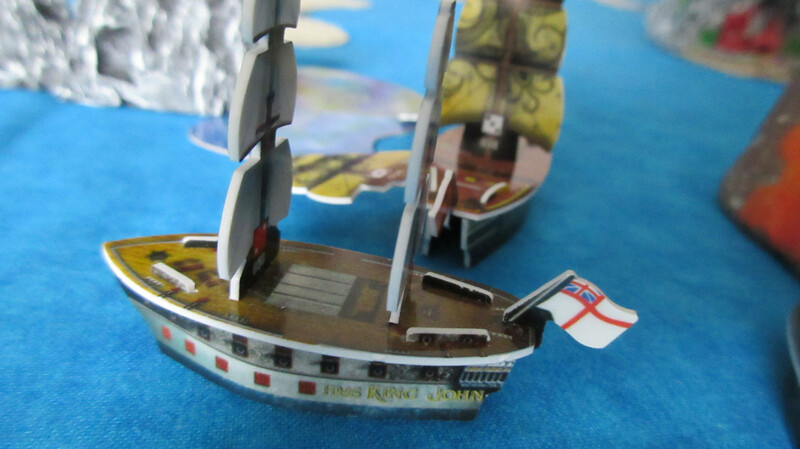 They manage to put 3 new ships in the water: HMS Burma, HMS Durham, and HMS King John. 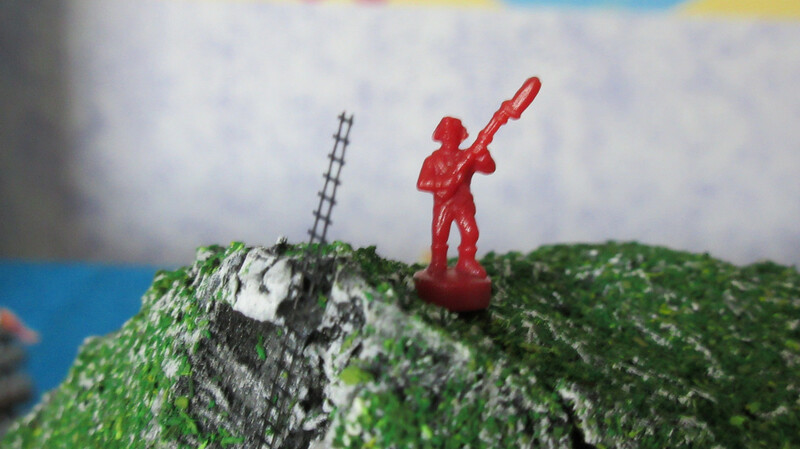 They also repeat their earlier purchase of army units, hiring two more infantry and one more artillery unit. Here you can see what’s on board the new ships. Gunn has a wacky plan for the Burma’s grapple shot…. In a brilliant afternoon sun, the Ebro leads the Spanish back to Paradise Island. 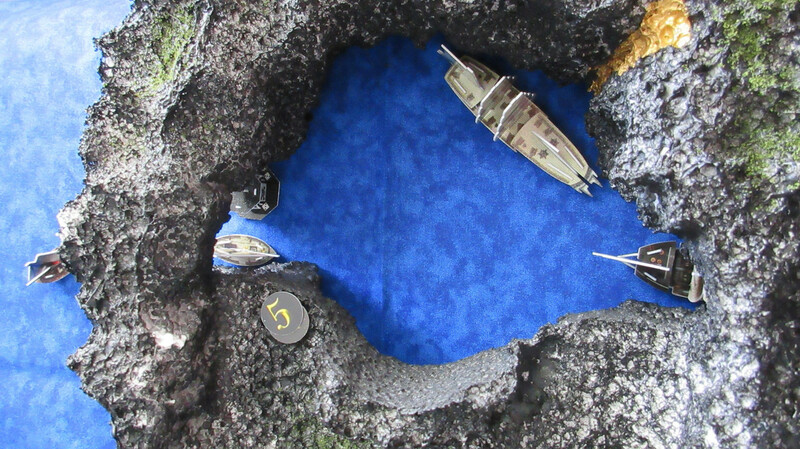 Back in the Sea of Karkuda, the Soleil Royal explores the new island. A round lake surrounds a ring island with a pond on it. However, in a disappointment for the French, more food is found! Not only is the fish resource not currently valuable, but France now has two nearby islands with the same resource, which can be bad since they will not always be able to rely on it. 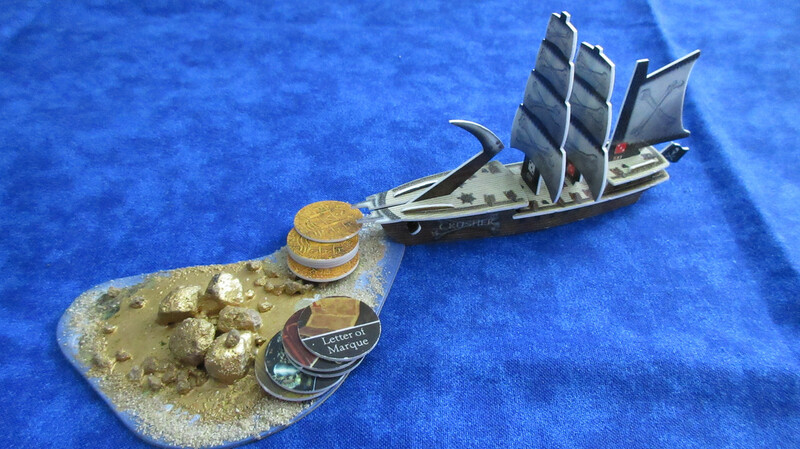 Luxuries are worth a decent 4 gold apiece right now, but with 10 tokens coming in all at once due to the canoes, the Americans consider cashing in a no-brainer. 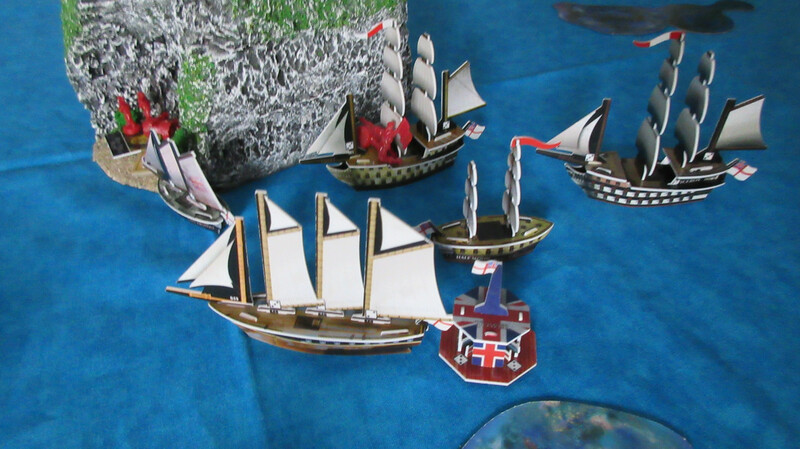 The Roanoke and Louisiana make their entrances, along with their first army unit. 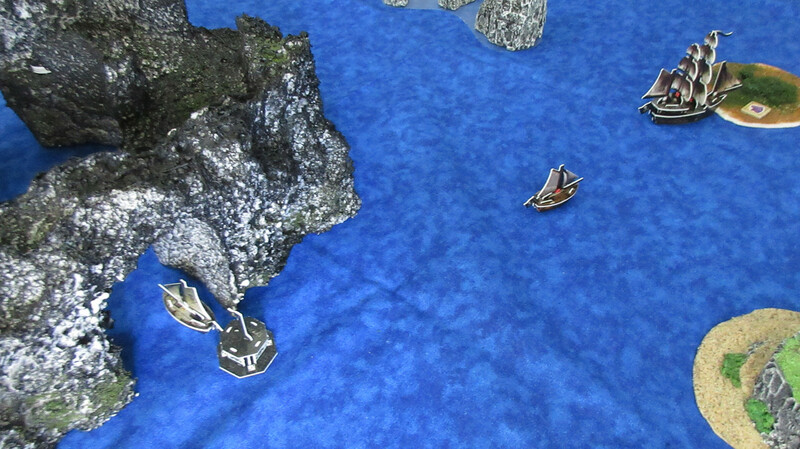 The cautious Brent Rice decides to dock with the Bellevue to confront any hidden dangers at the new island head-on. 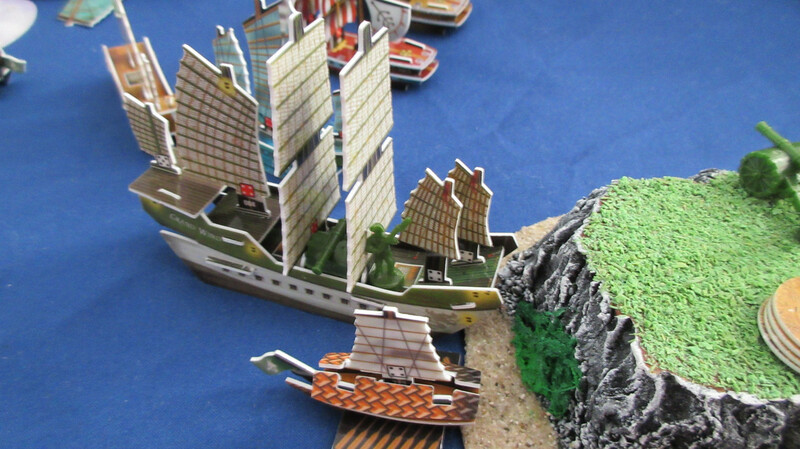 A grand view of the Grand Dynasty, whose crew is puzzled by the prevalence of fog east of the JR HI. 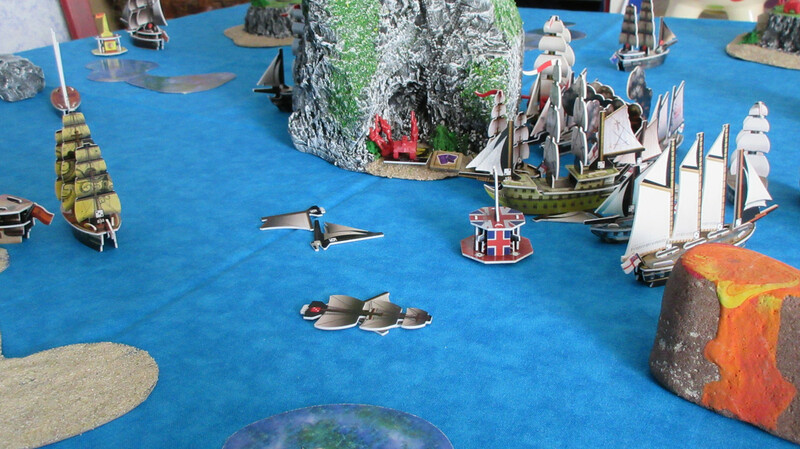 In an early-game mass exodus, the English leave their home island in force. 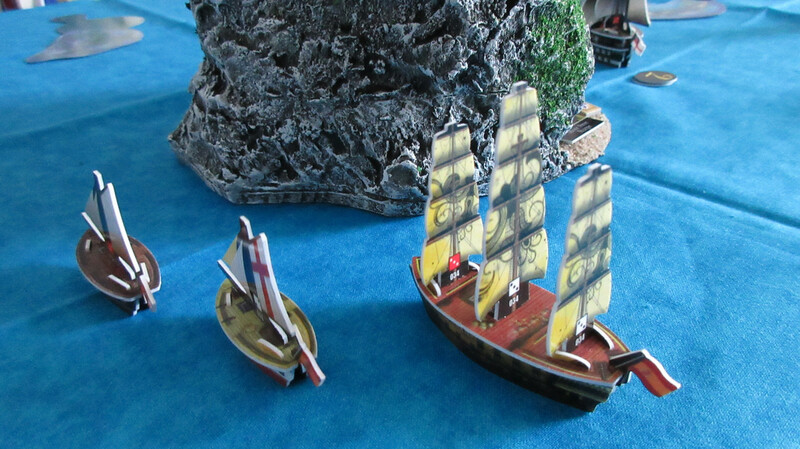 The Burma carries the new artillery cannon after her captain takes up temporary residence in Thomas Gunn’s flagship, the Viceroy. He enjoys his stay in Gunn’s company, but is eager to return to command his own vessel. 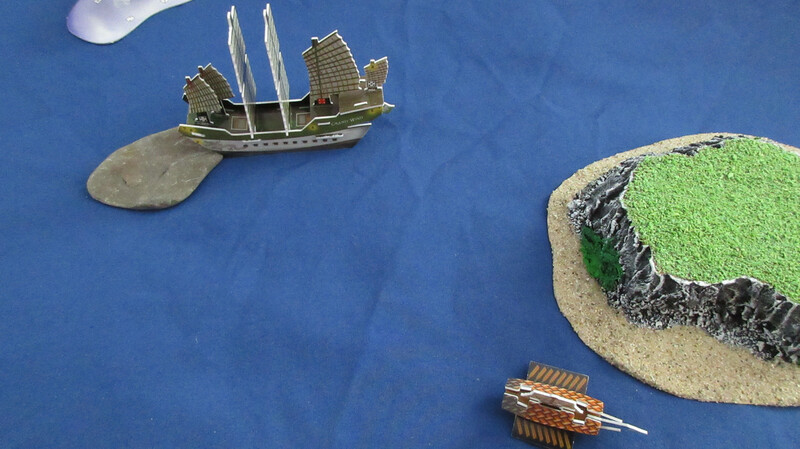 Similar to the JR Sea Serpent, the King John is tasked with exploring areas unfamiliar to the current fleet. The Apollo has a dual mission: shadow the King John in the case of needed backup, but grab textiles from Diamond Rock if all seems safe. 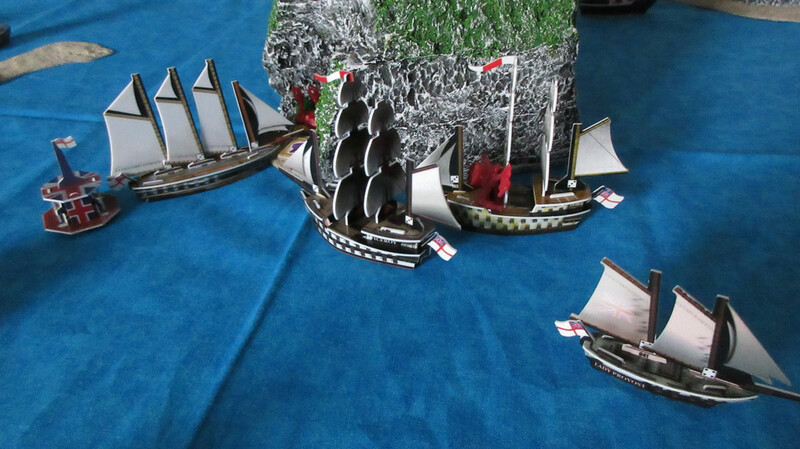 The Half Moon is headed straight for the rock along with the rest of the English fleet. 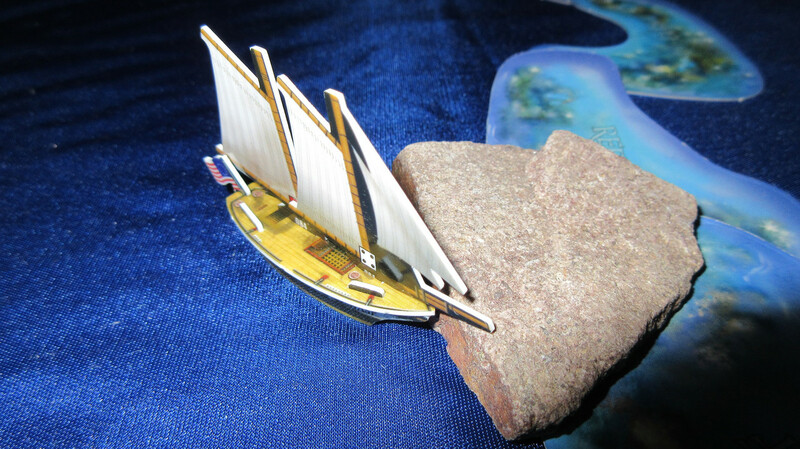 The San Estaban sails around the rocks that had previously stopped her! 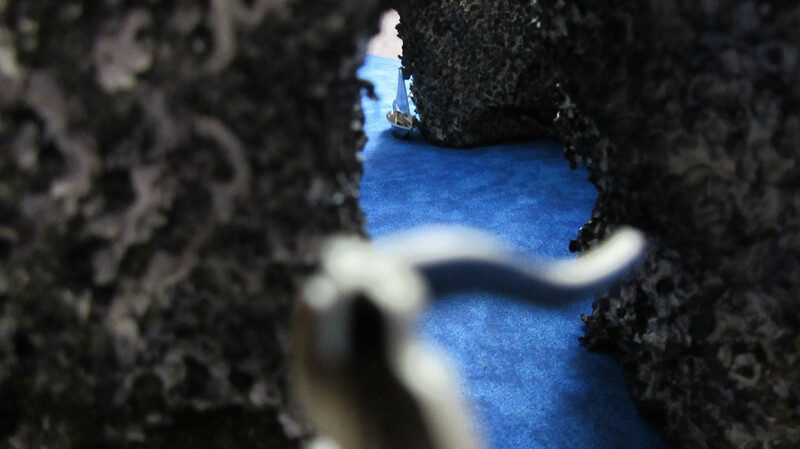 She avoids a sargasso sea, and passes what looks like a somewhat active volcano on her trip through the Caribbean. But will she find anything valuable? 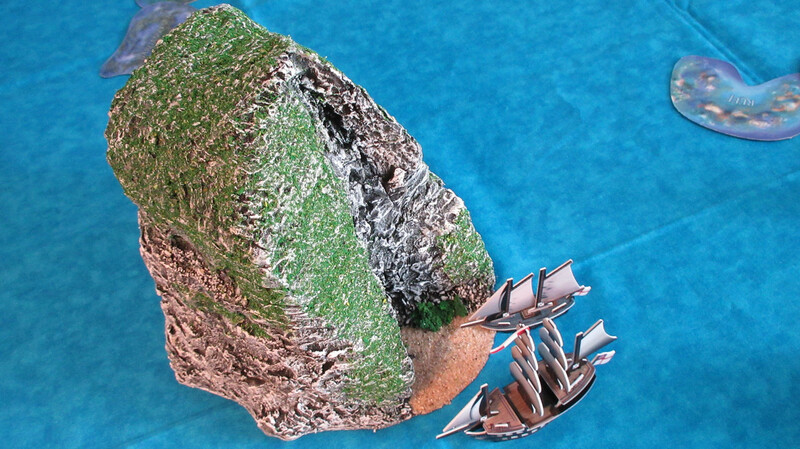 Note: this was a rock I painted a long time ago, possibly before I got into Pirates. It’s a perfect and easy addition to my game here! The Bellevue and Bonhomme Richard explore the beach without difficulties and are happy to find food! This makes fish a popular resource in the Sea of Karkuda, with the French finding it on both of the islands they’ve explored. The Louisiana and Roanoke are headed for a different beach however. This was a fun shot to get. 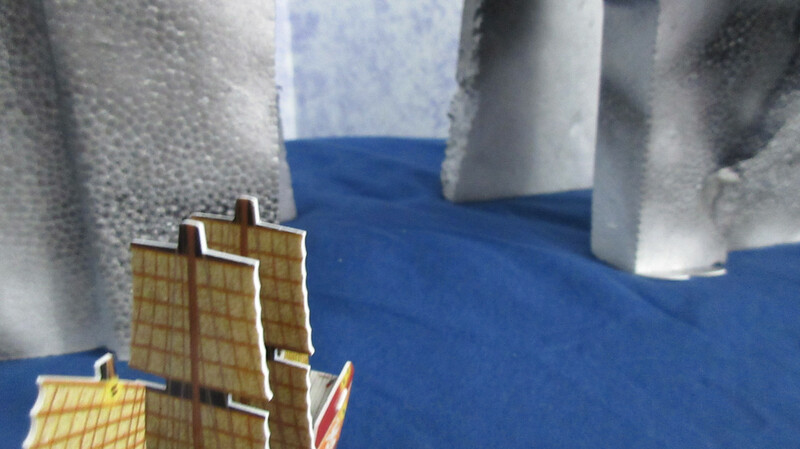 Looking north, you can see the new Pirate launchings in the dual archways. 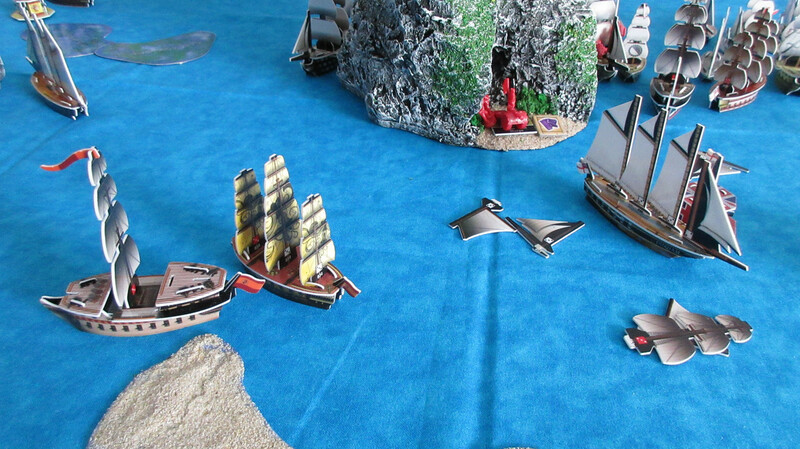 The Crusher and Cassandra docked home on the same turn, giving the Pirates a minor windfall. 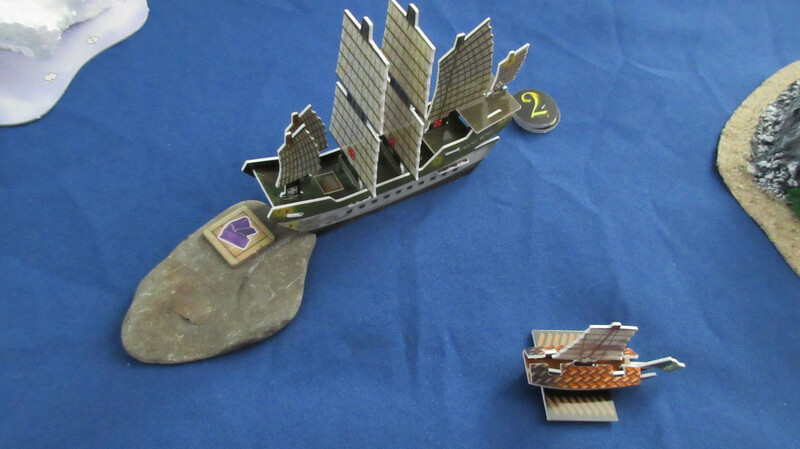 The Golden Medusa is launched with the Widowmaker flotilla in the south, while the far ship facing north is the Fool’s Gold, a ship that is very new to my collection. 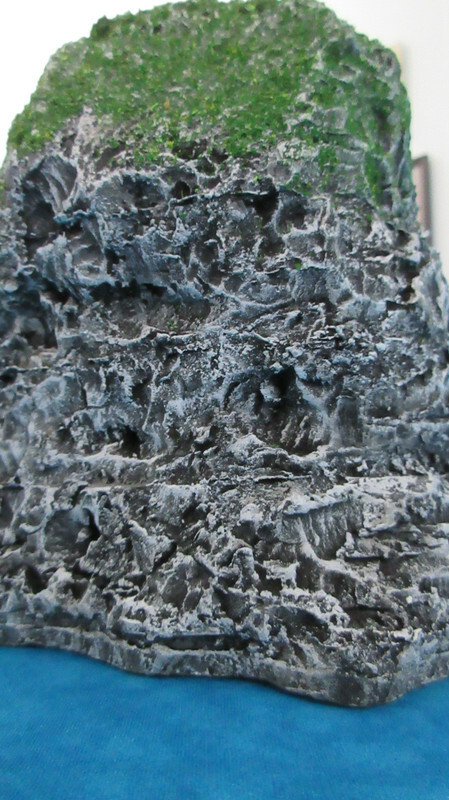 I also like how the picture shows the weathered but weedy look of the rock the kingdom was made out of. 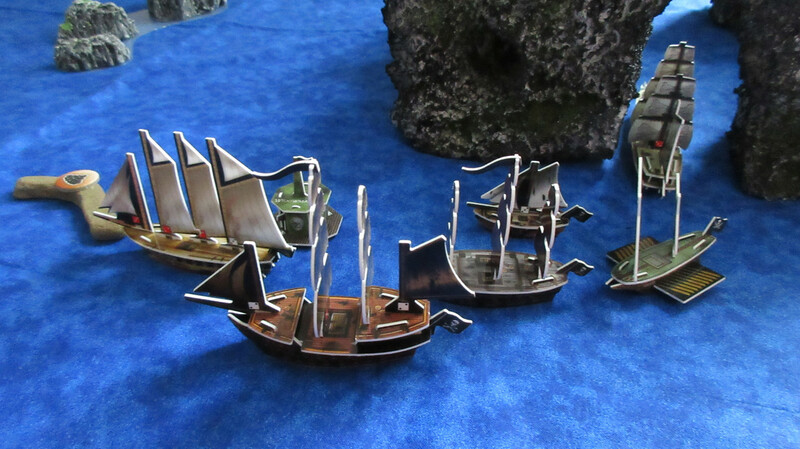 Ah yes – the Pirates also purchased their first army units, but have no current plans to use them yet other than for harbor defense. 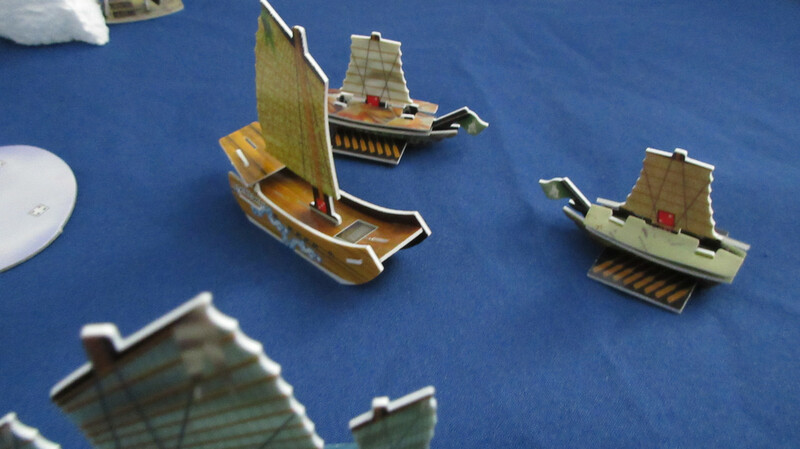 Predictably rich with valuable textiles coming in almost every turn, the Jade Rebels continue their launching run, this time buying the Admiral Yi and Hansan Island turtle ships. 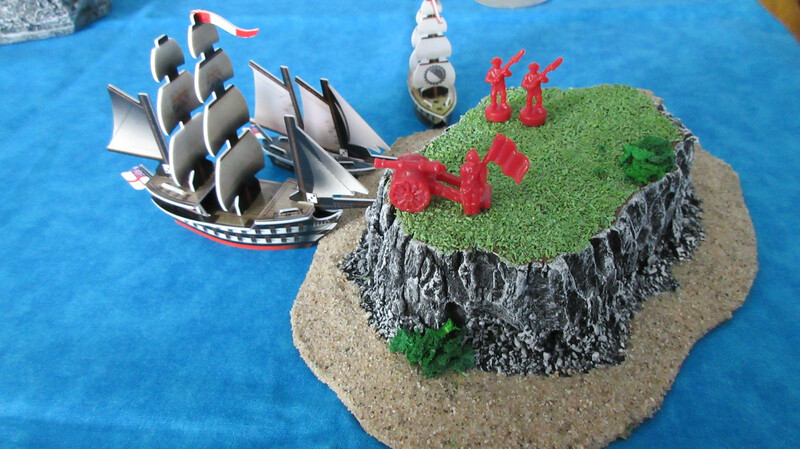 From the mizzenmast of HMS Apollo, a beautiful view of the Caribbean. 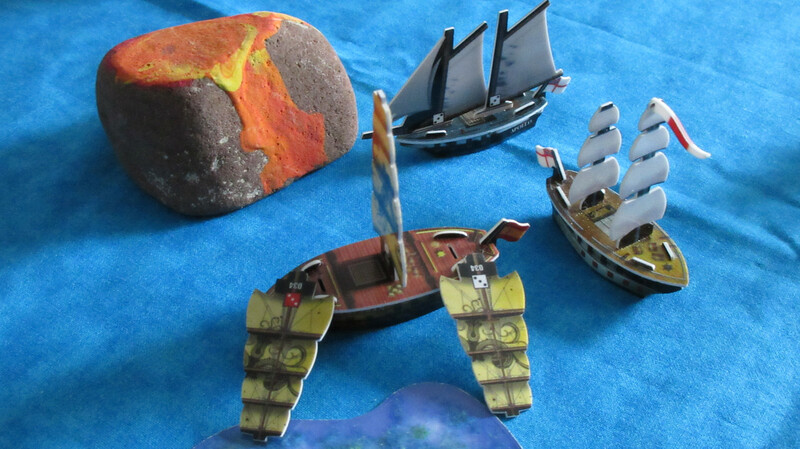 Diamond Rock is about to get crowded, but not all the ships sailing there intend to dock. 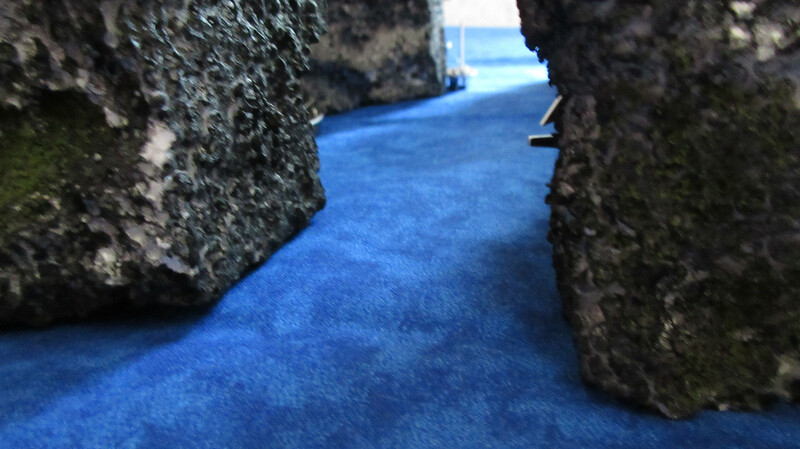 At this point you are welcome to view a little “introductory”/tour video of Diamond Rock. And it is! 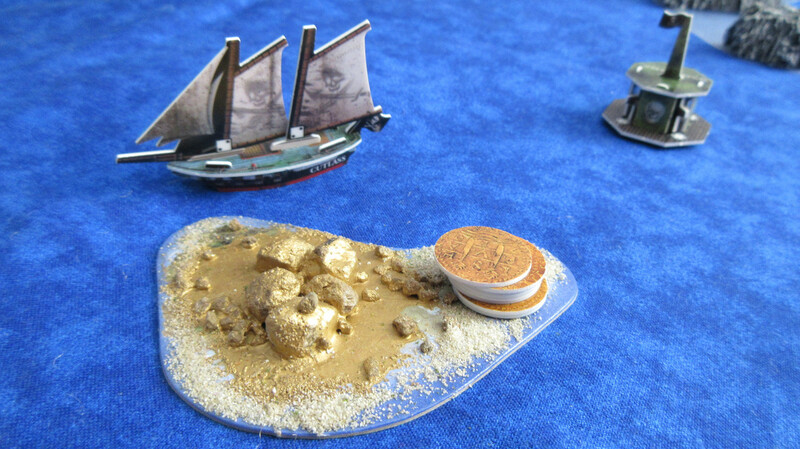 Similar to the golden island in the Sea of Allost, the Duke shipwreck was originally created for my 2015 Economy Edition game, but is such a great piece that it can be reused quite a lot. You can hear a little bit more about the backstory in another short video. 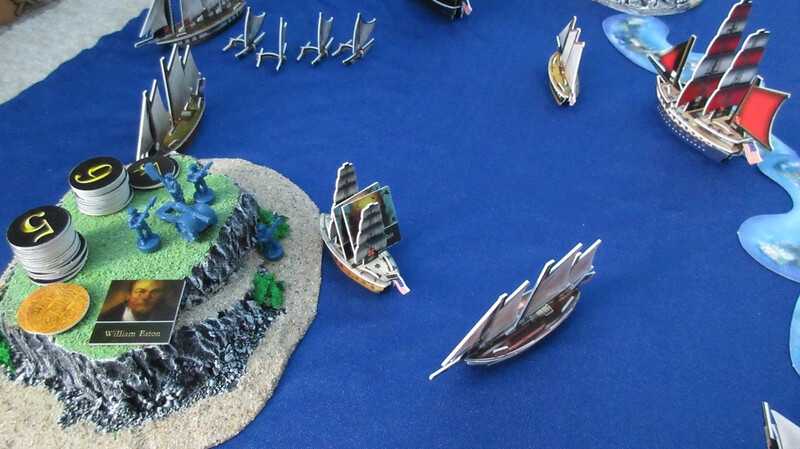 The Americans dock at a gold-laden beach, but will they find anything interesting? After 7 turns, it was time for another resource change!! 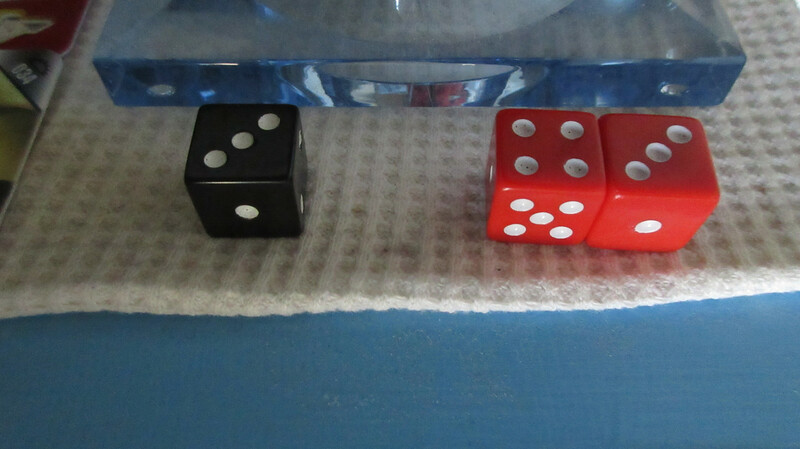 I rolled all three dice at once, with a 5 coming up for value just like the initial roll! 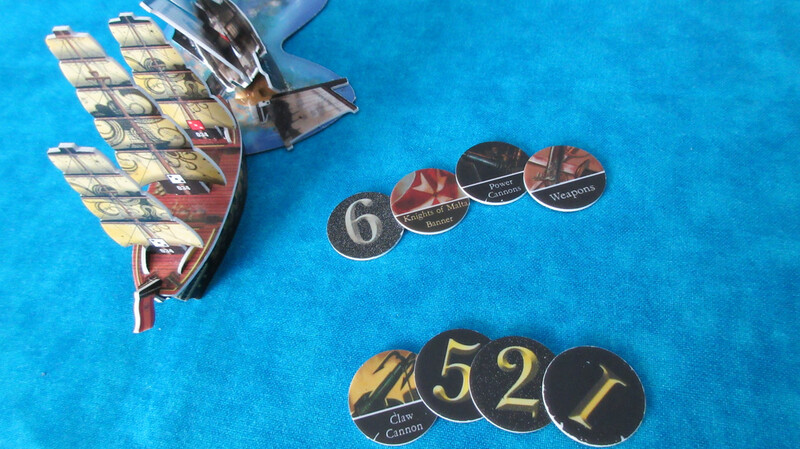 The values of the first 8 turns of the game would now hold for the next 9 turns. The factions who were originally well-off in terms of resources would be happy once more. This hurt the English and Jade Rebels slightly, but textiles were still worth 4 gold apiece. The French were overjoyed, since their food was worth 6 again and they weren’t hurt by having two islands producing the same resource. 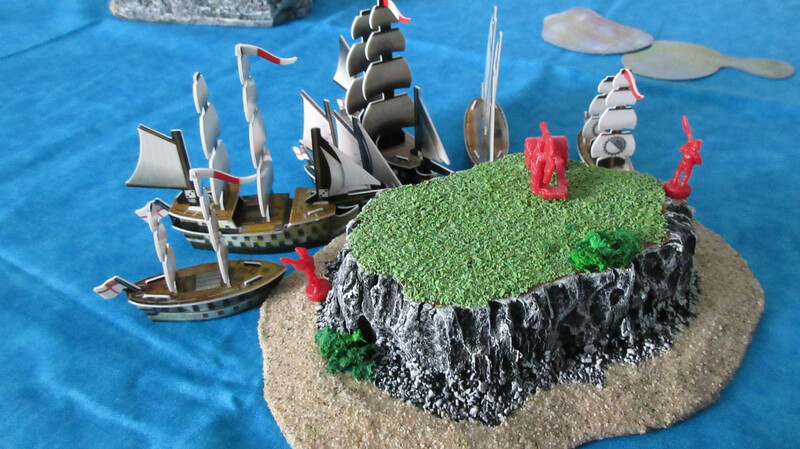 With metals worth 5 again, the Golden Medusa knows where she’s going: Pistol Island. 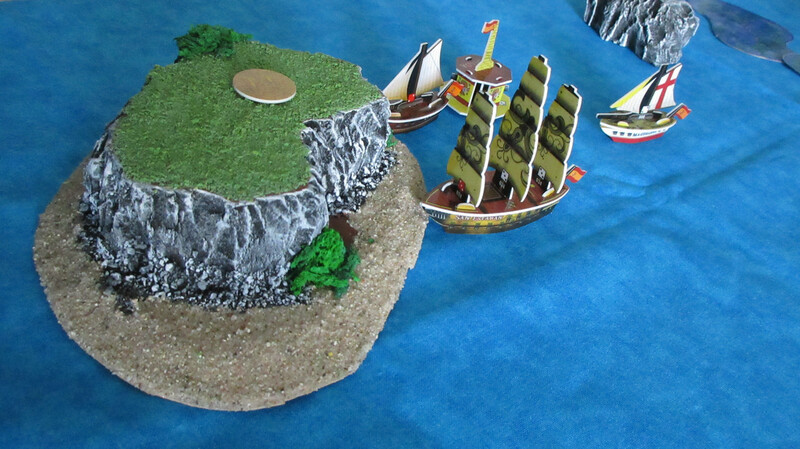 However, Mission is getting a bit of goldlust and sets a course for the golden island. 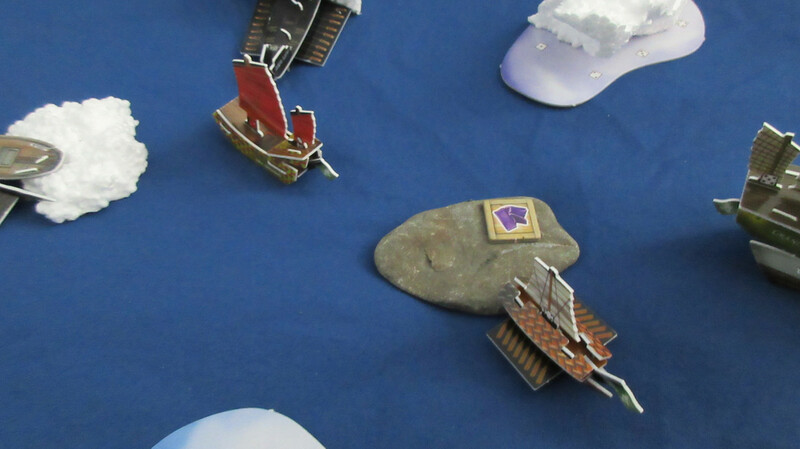 Not even spending all the gold they take in, the Jades launch two more ships. 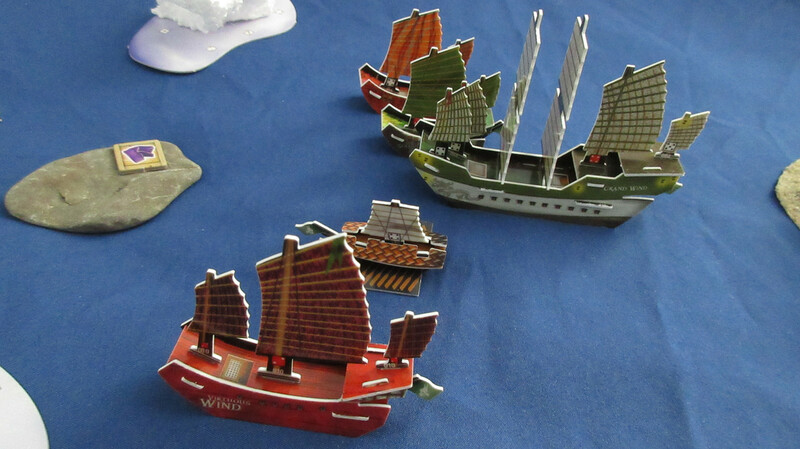 The Sea Wind will be a crewless resource runner, while the Divine Wind is outfitted to be a patrolling warship. 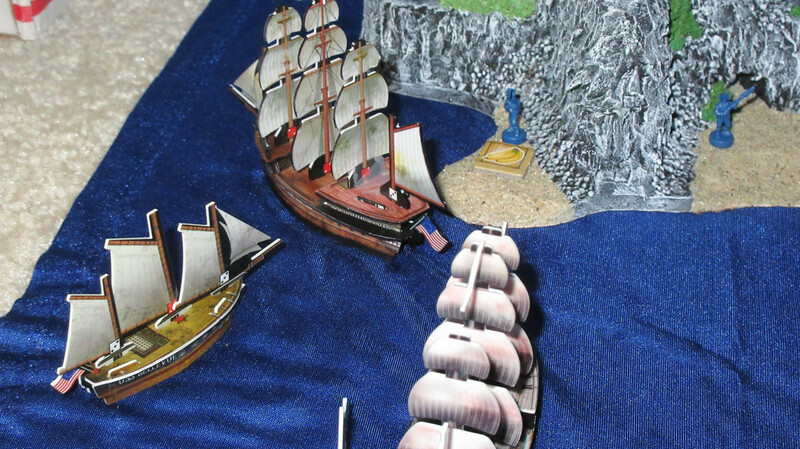 Back in the Caribbean, Gunn’s plan becomes clear! 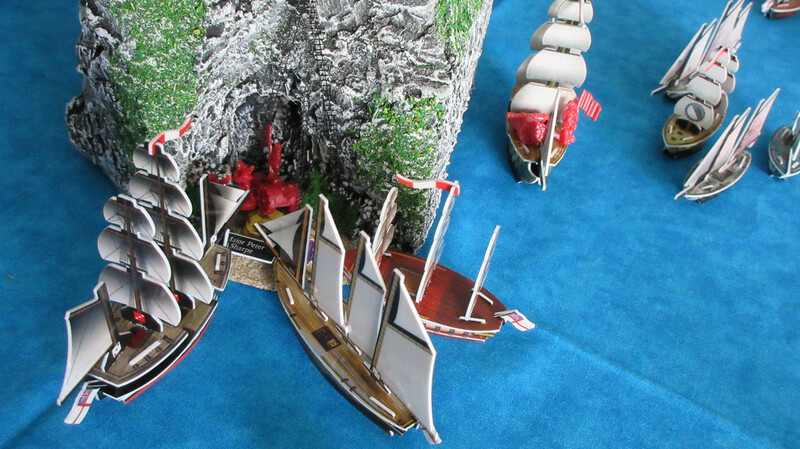 While on their way to Diamond Rock, the crew of the Burma managed to rig a cannon to fire at a dramatic upward angle. 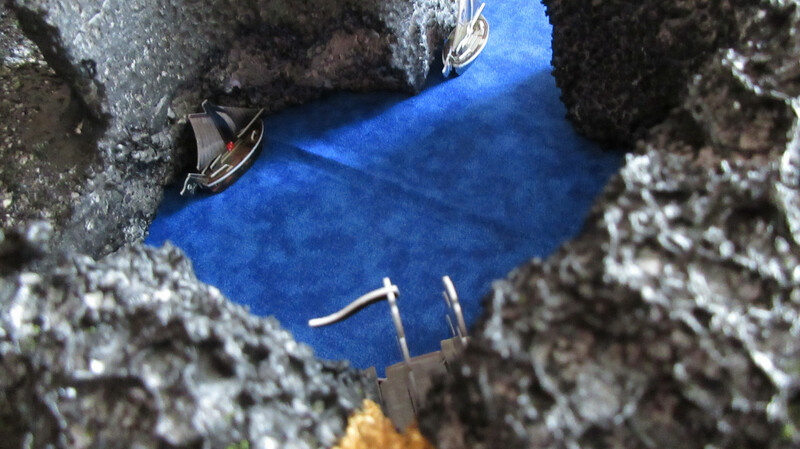 They loaded a grapple shot inside, and shot the cannon towards the cave halfway up the rock! 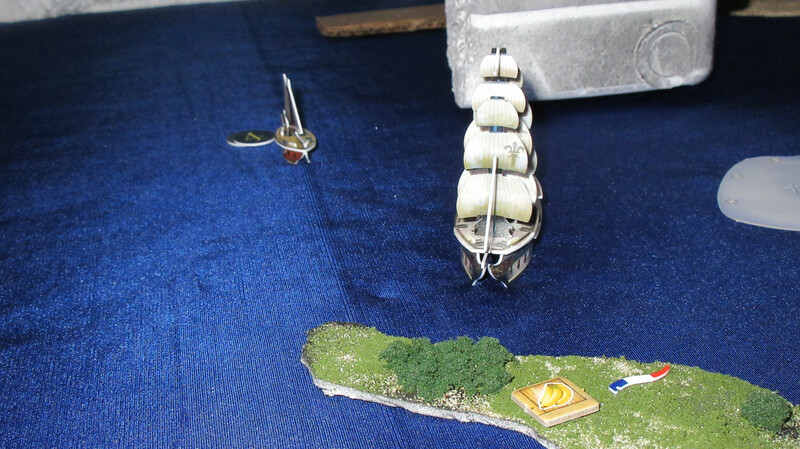 The first part of the plan worked, as the shot hooked onto part of the rock and no one was injured in the process. 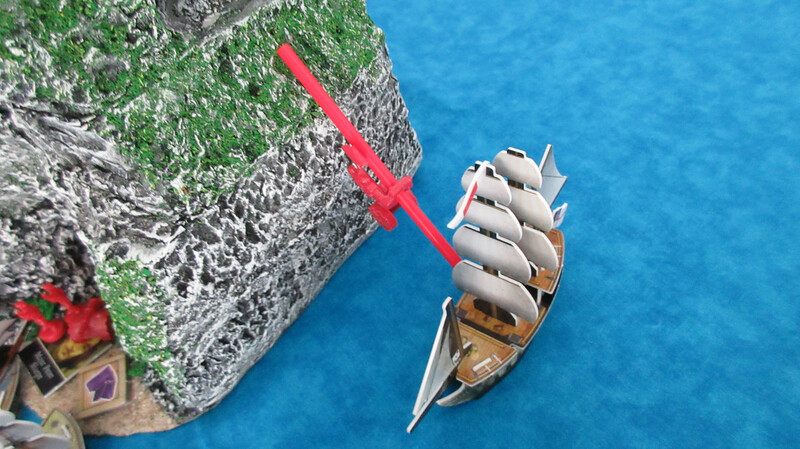 The crew had managed to somehow line a pulley system with the grappling hook, and now attached a hook to the cable in order to fasten the cannon below the line and begin hauling it up after the cable was also secured aboard the Burma. 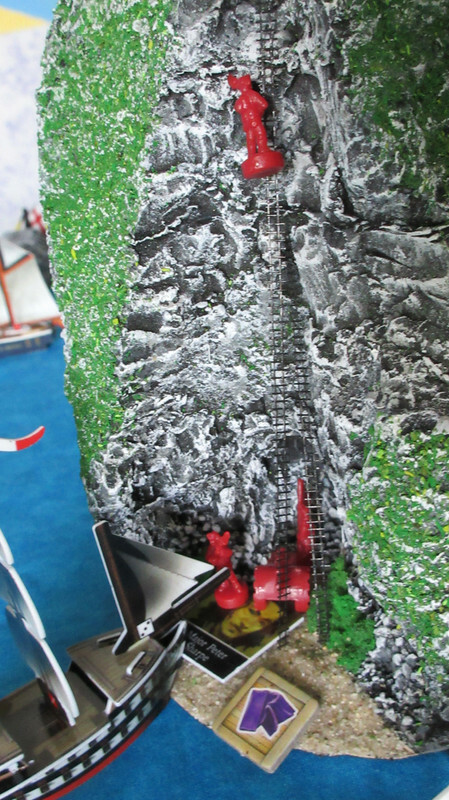 Here the English try to rig a cannon into a cave on Diamond Rock. What a scene. Oh no!! Disaster for the English! 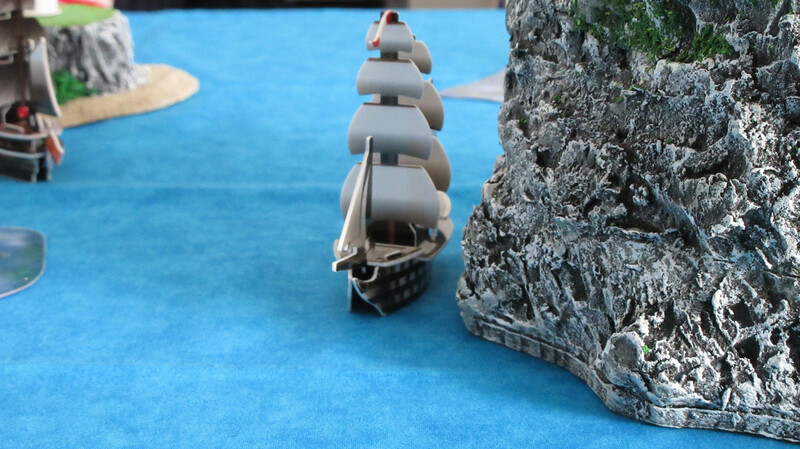 The cable wasn’t strong enough for the 24 pounder cannon, and the line broke, sending the valuable artillery piece into the sea!! 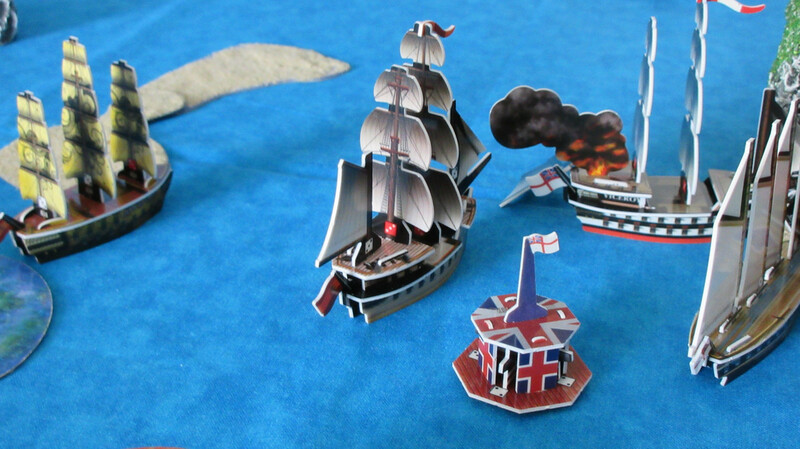 With a resounding splash, the English plan had failed. Gunn frowned, but was still determined to try other methods. He knew the potential long-term strategic value of dominating the rock, and began formulating other plans to make up for this embarrassment. 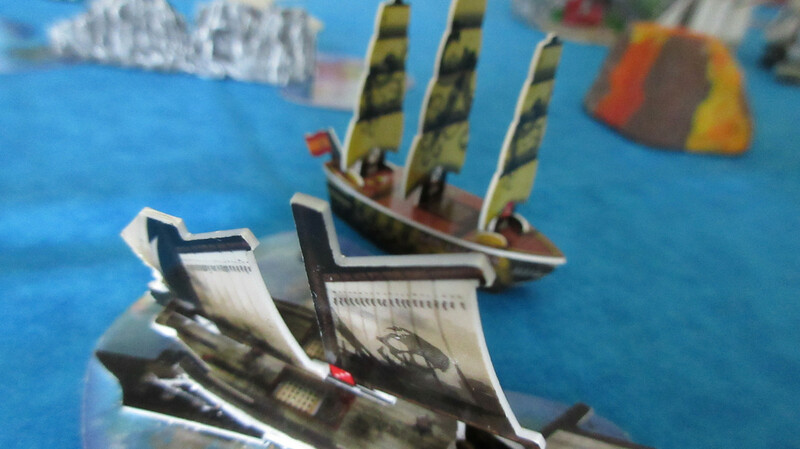 A view from the mainmast of the King John: HMS Apollo has glimpsed the volcano, while the Burma’s crew are lucky the falling cannon didn’t take anyone overboard in the accident. The French use stores of food to get three of their best runners: the Bon Marin, Coeur du Lion, and Vengeance. 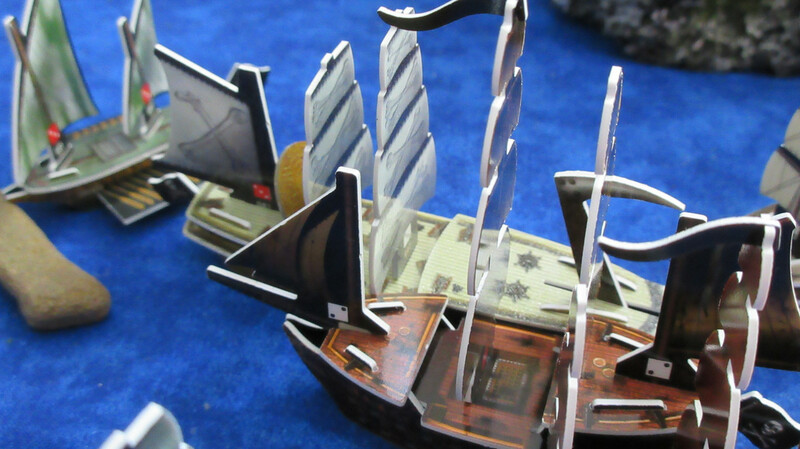 The Americans do some spending of their own, going the opposite route with some lesser-used ships. The Minuteman is assigned to patrol/guard duty, though similar to the Grand Dynasty she will be doing some local exploring to scout the area. 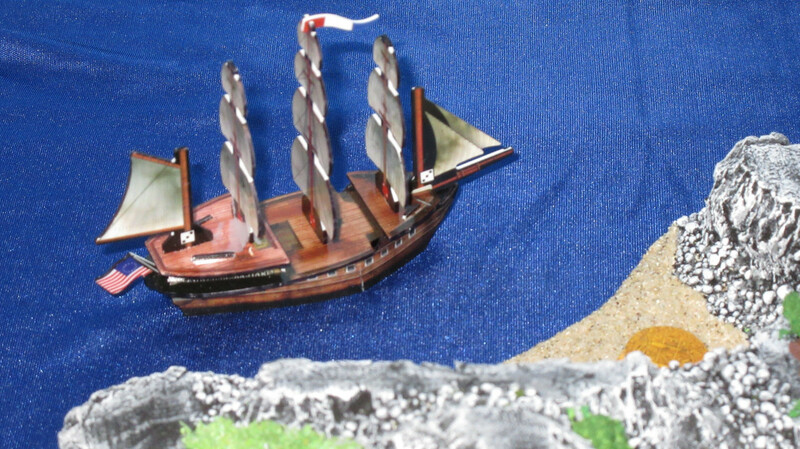 The Colonial Trader will simply make trips to Luck Island at L speed but with 5 spaces available. She joins the Argo, and the Americans are planning to stockpile their spices until they skyrocket in value at some point in the potentially distant future. 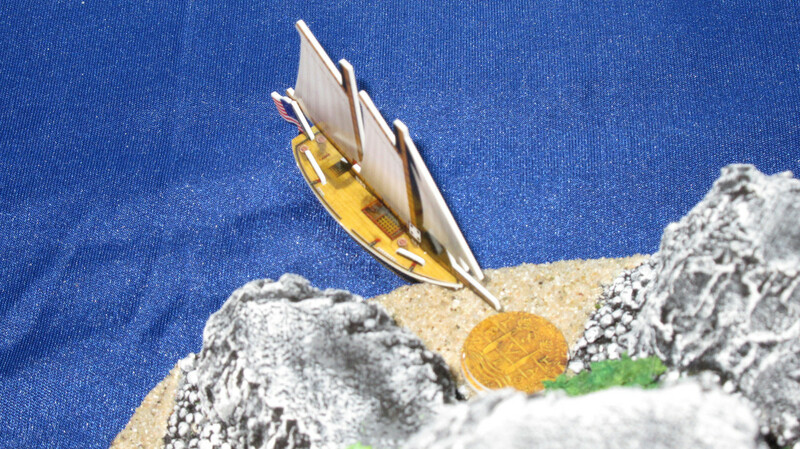 The Roanoke’s crew explored the new beach at the big island up north, but were disappointed to find just 9 gold and no resources there. Annoyed, the Louisiana docked at the fishy beach instead, loading up before the trip home. 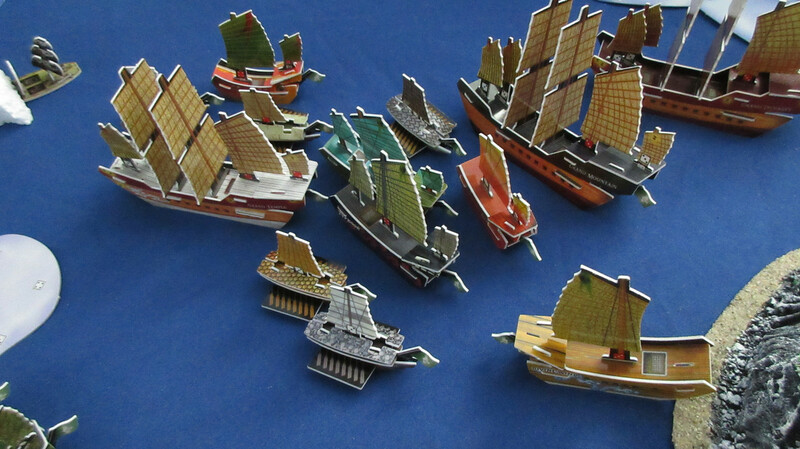 An impressive sight: almost all the Jade Rebellion ships sailing in the same direction. Why the almost part? The Sea Serpent still isn’t back, and Warlord Cavendish is getting worried. 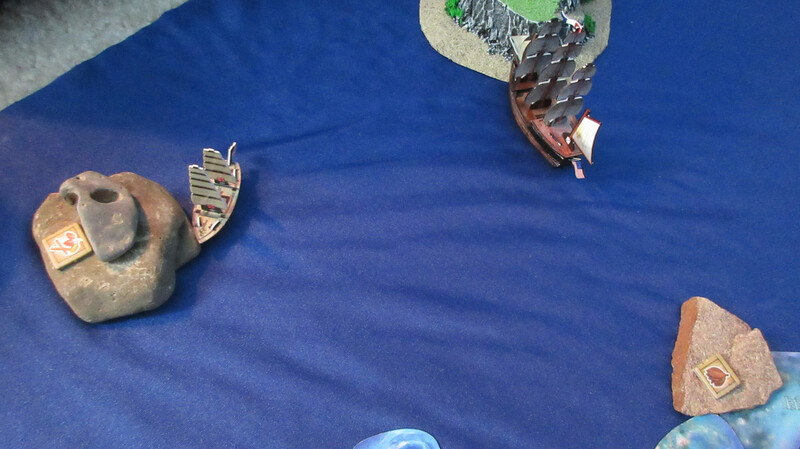 He has assigned a squadron of ships (the Divine Wind, Admiral Yi, and Hansan Island) to go west and find the lost ship. 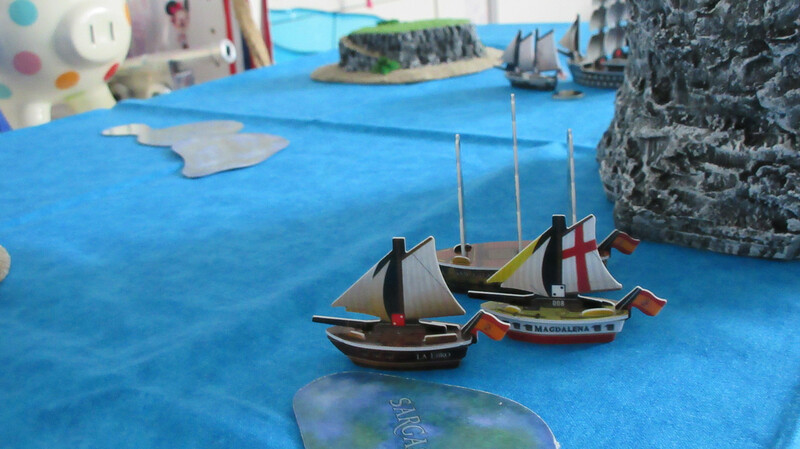 Cavendish fears that the Sea of Allost may be living up to its name after all…. In the Caribbean, the Apollo has nearly taken over exploring duties from the King John, who hurries to rejoin her after being disappointed not to find anything interesting in the area south of the English HI. 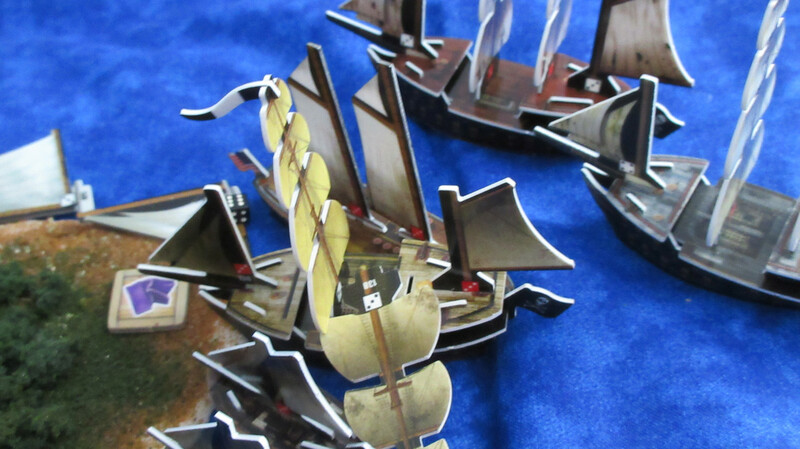 With a relatively minor failure in the books, the English regroup and head home with most of their other ships. 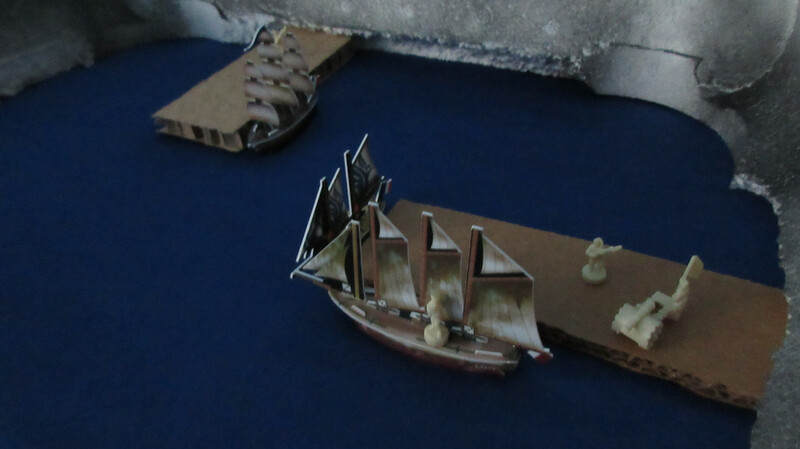 The Burma will need to reacquire a new cannon to implement a different plan Gunn has, while Gunn himself has the Viceroy load some textiles before joining the others. 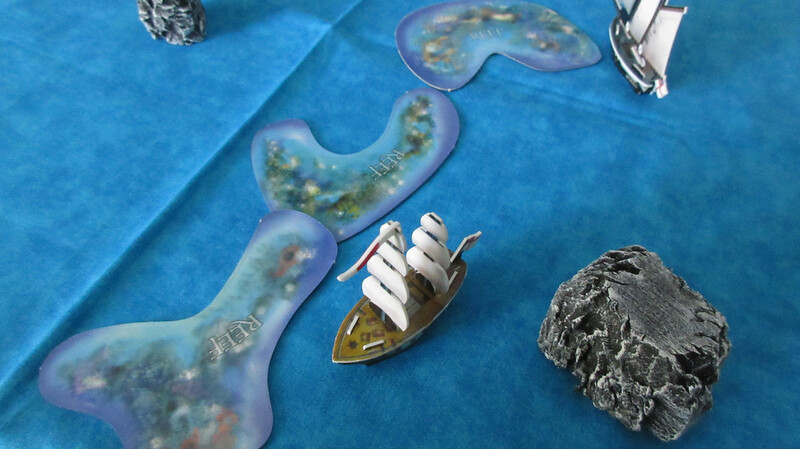 After avoiding reef damages, the San Estaban explores the Duke shipwreck! What an intriguing haul she got. 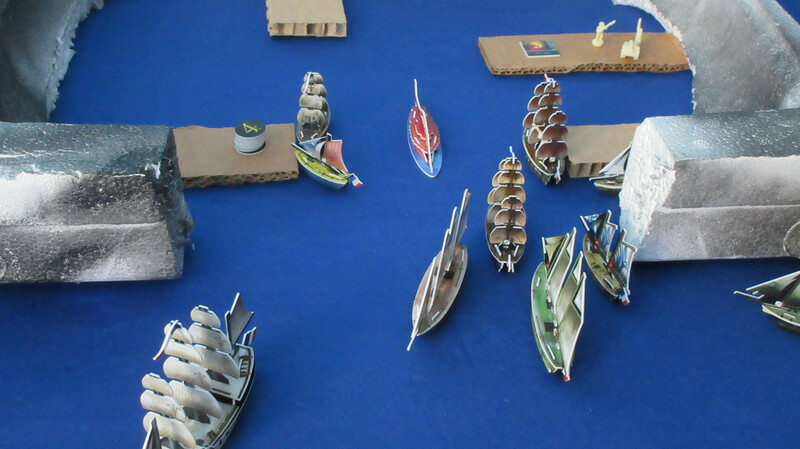 The top row indicates what the San Estaban loaded, as she only had one open cargo space with a captain and helmsman aboard. It remains to be seen just how useful some of those UT’s will be in the Caribbean, but only time will tell…. After the Soleil Royal and Marianne dock, the French can cash in and spend again. 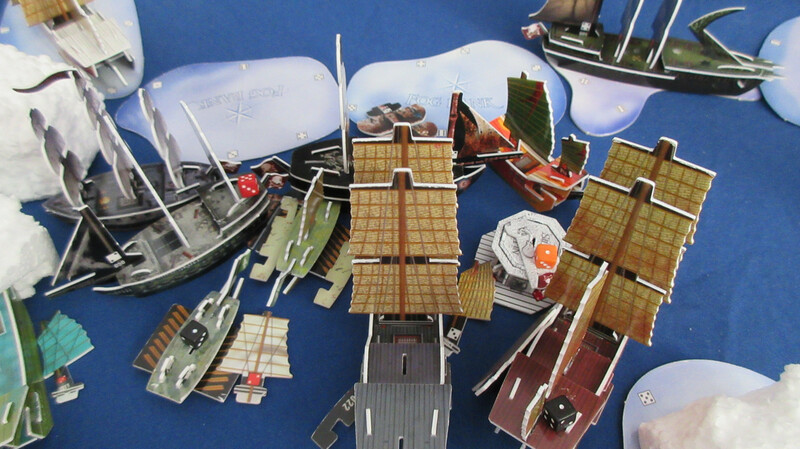 This time the Triton, Amazone, and Jeux are introduced. 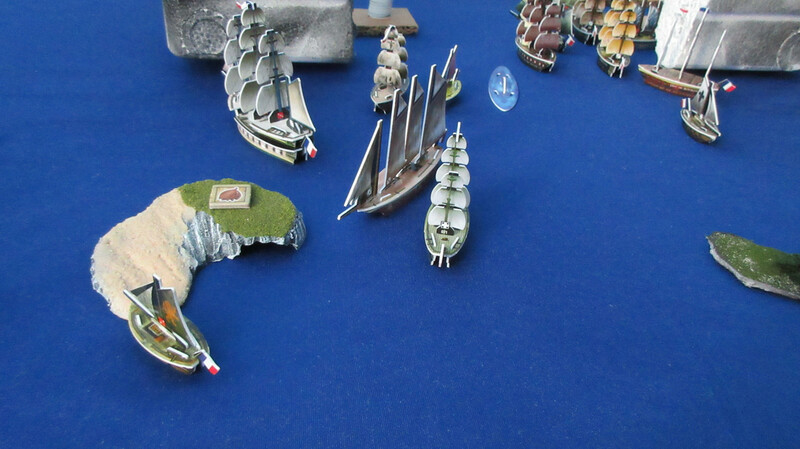 In a span of two turns France has tripled the size of her fleet from 3 ships to 9! The helmsman is for the returning Lyon. 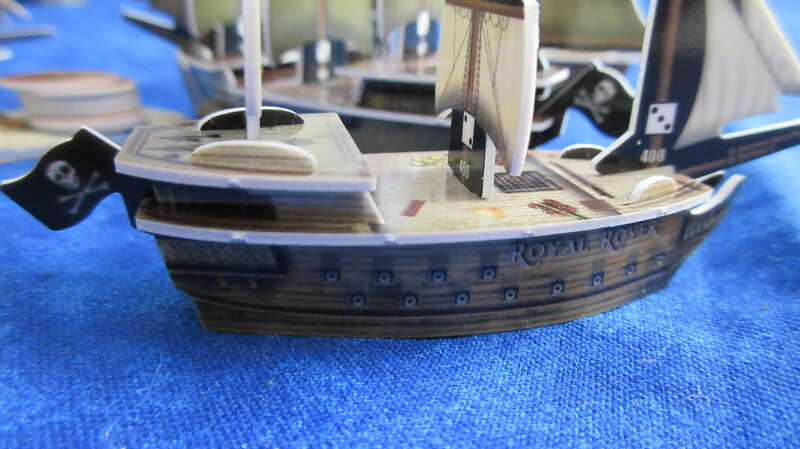 Note the nice dock height and how it interacts with the main deck of the Soleil Royal. 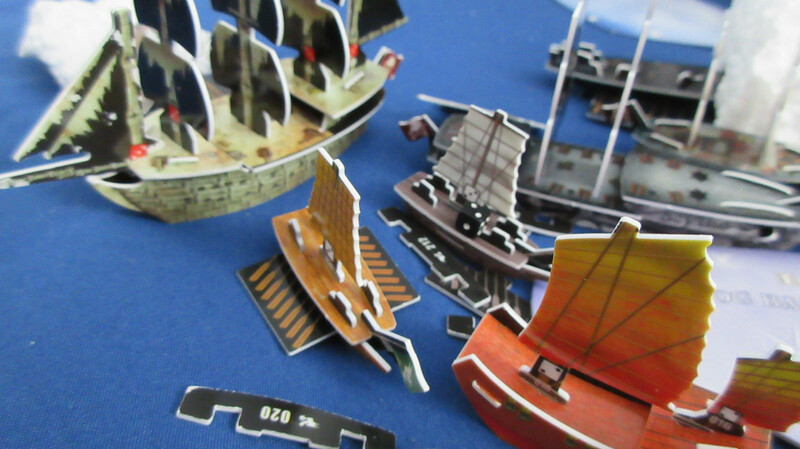 The other types of cardboard I have are higher but look good as well. Part of the English plan is revealed!! No those are not train tracks, but LADDERS! These are special units, considered equipment, that cost 1 gold per L of ladder length. Here the English have spent 3 gold to purchase 1L and 2L lengths of ladder, which they can cut as needed to the desired end length. They are generally rope ladders that wouldn’t look like they do here, but rather they’d be crumpled up to fit aboard ships. 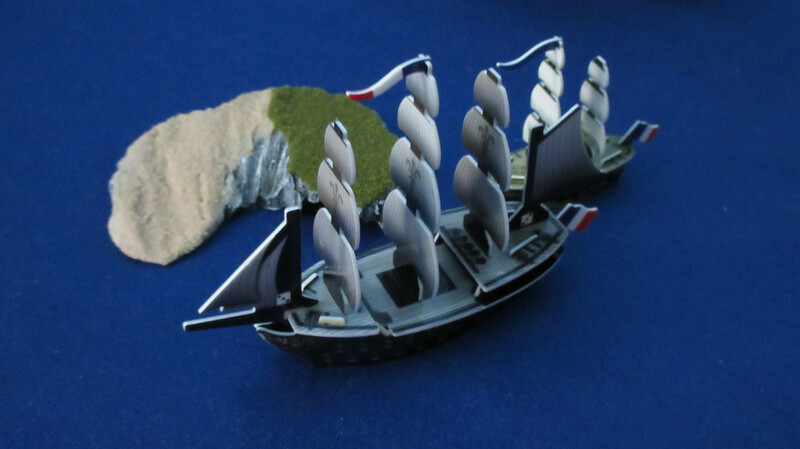 The English also purchase a new artillery unit, an oarsman, and a flotilla. 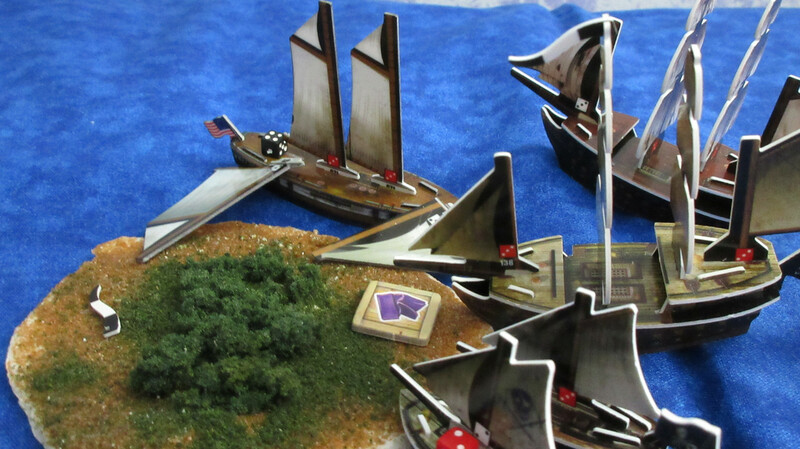 An odd launching turn overall: four different types of stuff, but no actual ships! 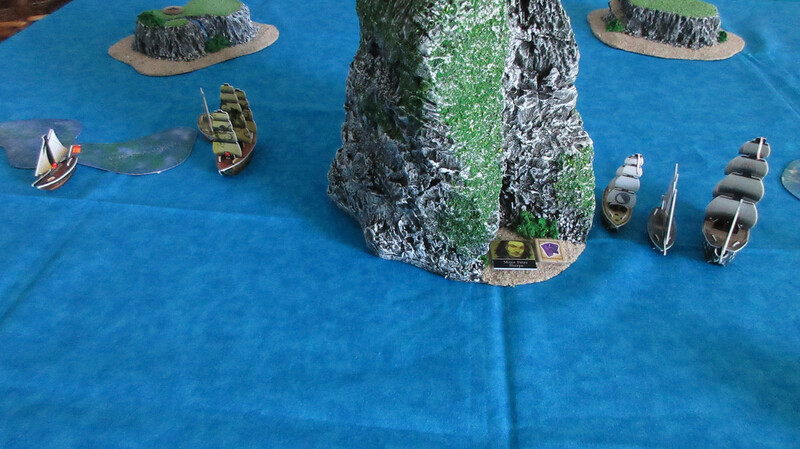 A unique view here, with the Apollo venturing further south as the King John rounds the reef and spots a tall stone pillar. The crew aboard the Apollo see a strange swirling mass of water near them but dare not go closer. 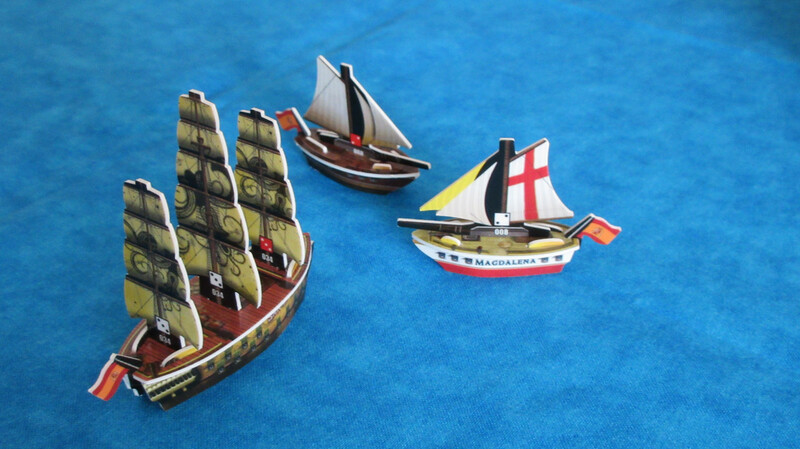 Finally, at long last, the Spanish launch a new ship! 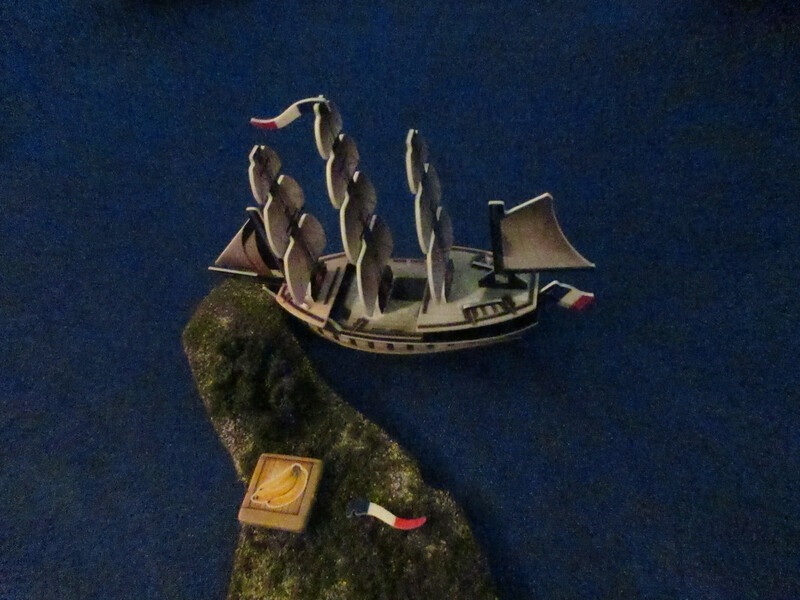 L’Aguila is ready to set sail, and provides a needed cargo and firepower boost to the Spanish cause. She is only crewed with a helmsman for now, since they really need more money. 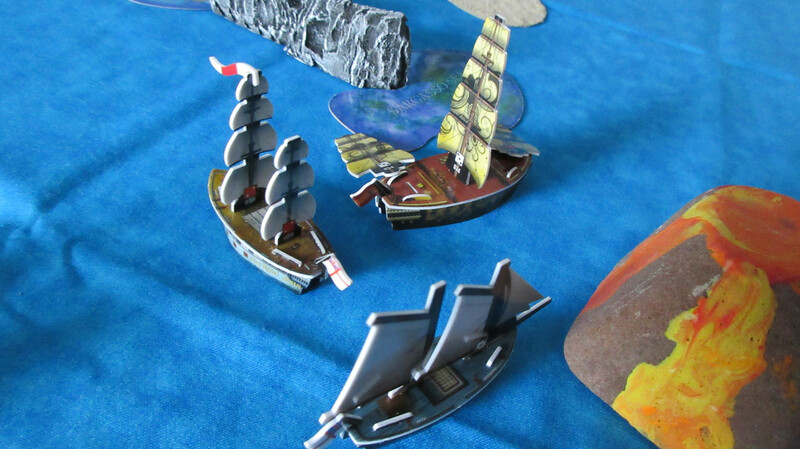 The firepot specialist is hired to complete the crew complement aboard the San Estaban. Malaspina is content to sit in port, especially since his lack of presence on the Magdalena allows the latter to bring in more metals. 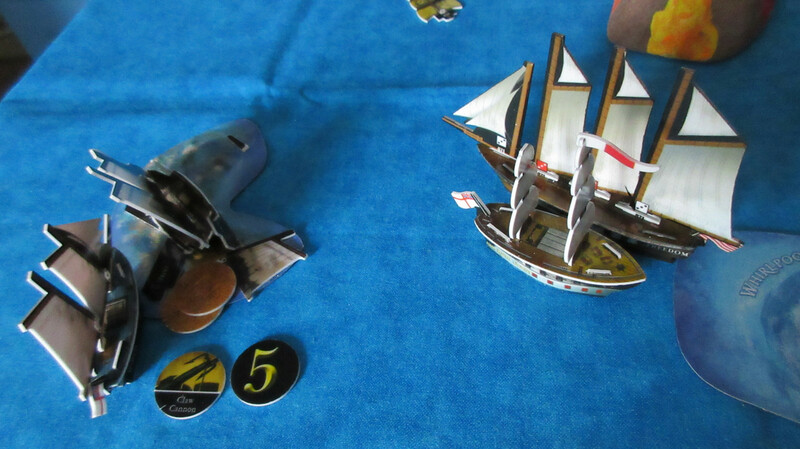 The Americans get gold and launch the President with Commodore Edward Preble aboard! This gives them a rerolling Admiral’s Action, just like the French elsewhere in Karkuda. 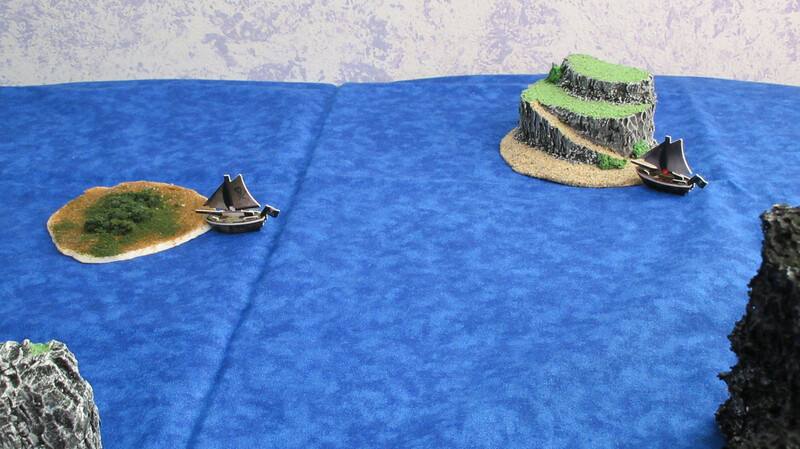 The Minuteman is at the right, but has only encountered a wall of terrain so far, mostly reefs but with a bit of fog. 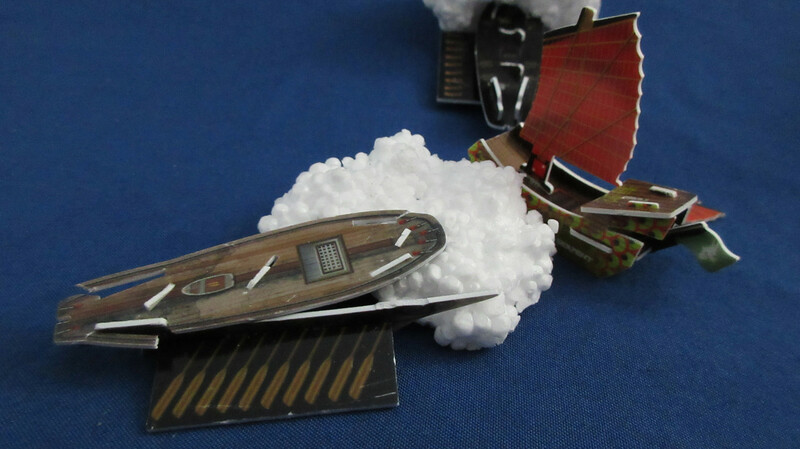 The canoes have altered course to maximize profit, heading for the food beach in the north. Infantry units are loaded aboard the Roanoke and Louisiana. 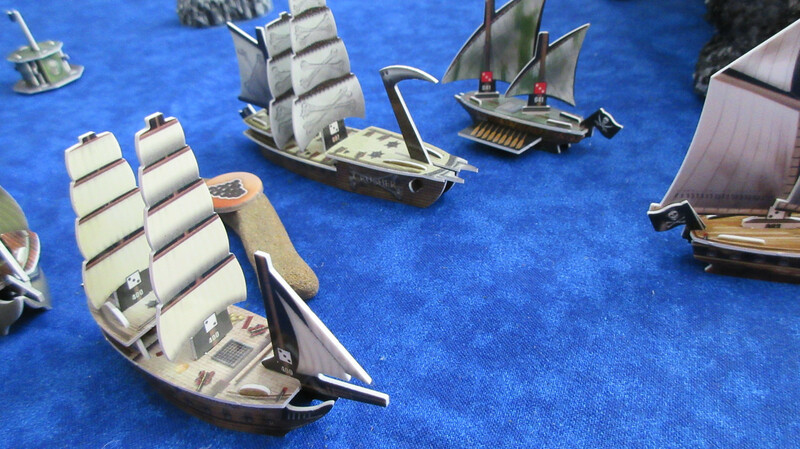 The Americans have done great lately, and it shows with their growing fleet. 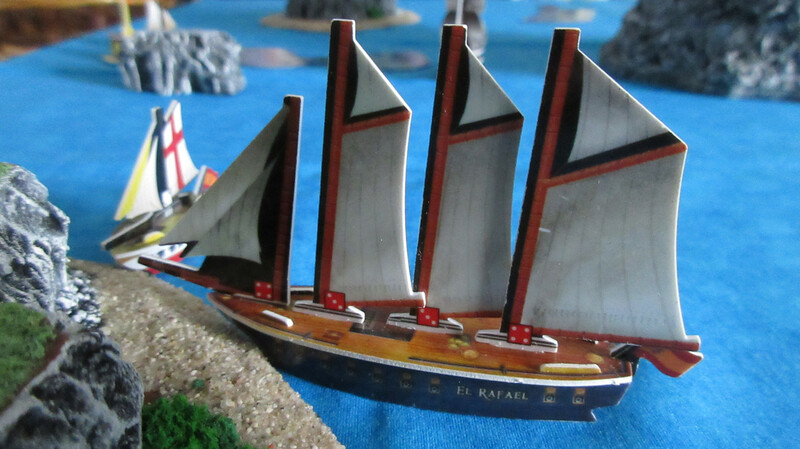 The Spanish are the only faction really struggling, but at least they have a new ship now. The JR and English have done well but each suffered a setback in the day’s action, while the Americans have climbed into the lead and look to be very profitable in the long term. -Forts can now be set on fire. This is a house rule that started in my Experimental cumulative game and continues with the World ruleset. 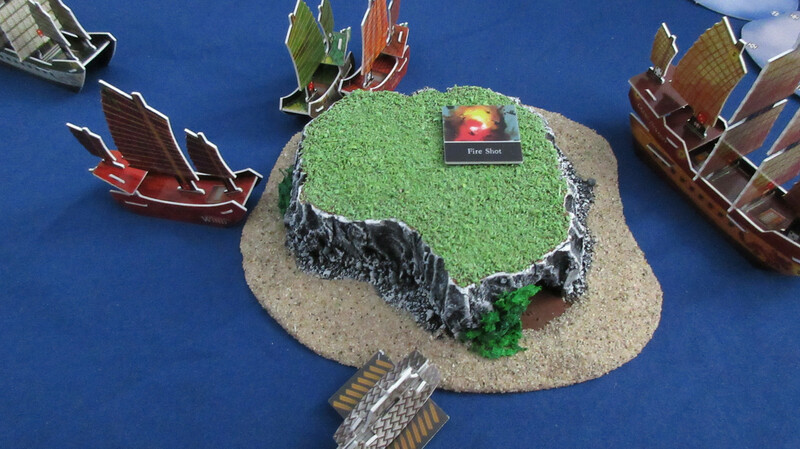 The rules for flaming forts will work like this: instead of the fort rolling for each fire every turn, it rolls one die regardless of how many fire masts it has and regardless of whether the fort is given an action during the turn. 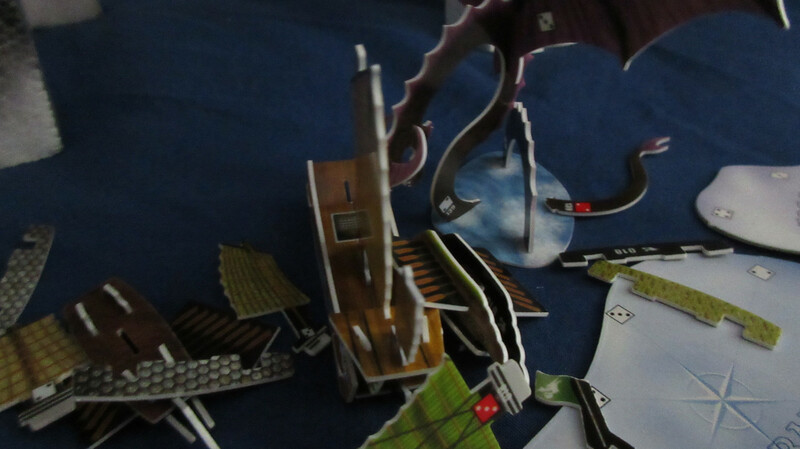 The roll follows the regular rules for fire masts. 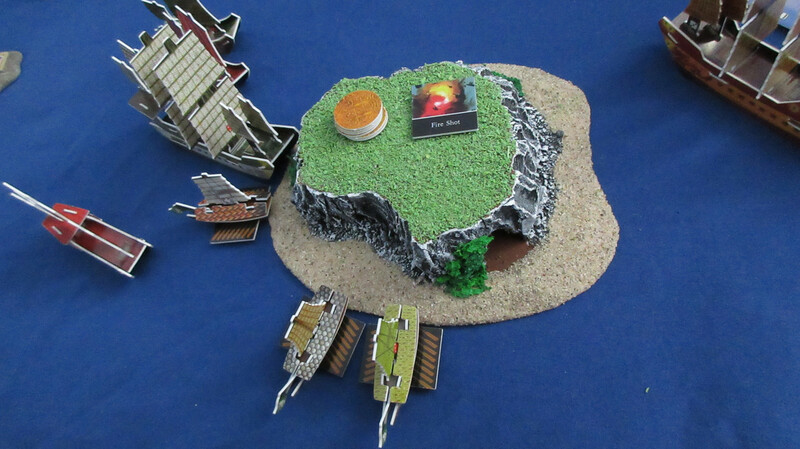 The fort will be automatically destroyed if the fire consumes all 8 areas (not how many guns the fort has). 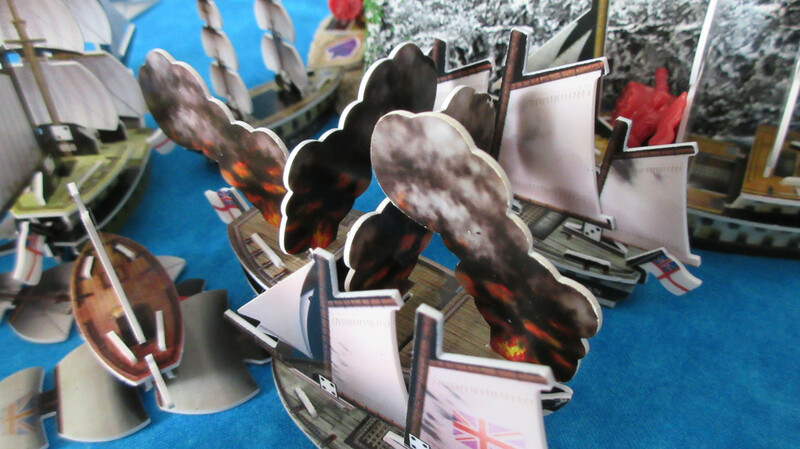 A shipwright can only put out one fire per turn, but no flag is raised in the fire’s place until another repair action is given. 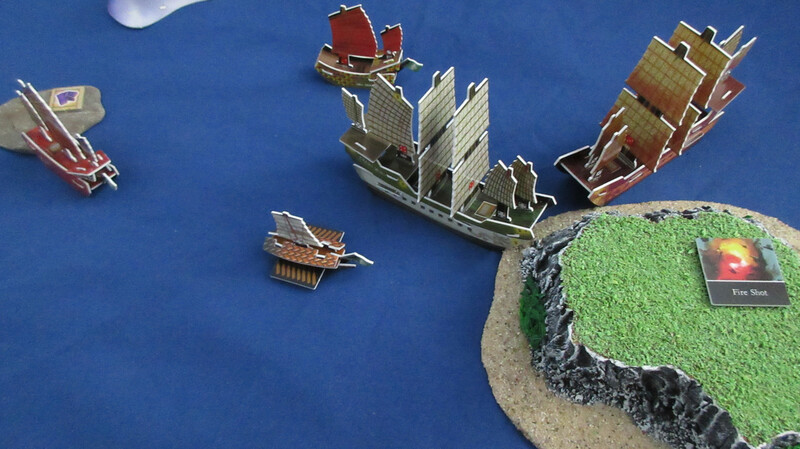 -Unlike the Economy Edition rules, building a fort on an island does not shut down resource production on that island. 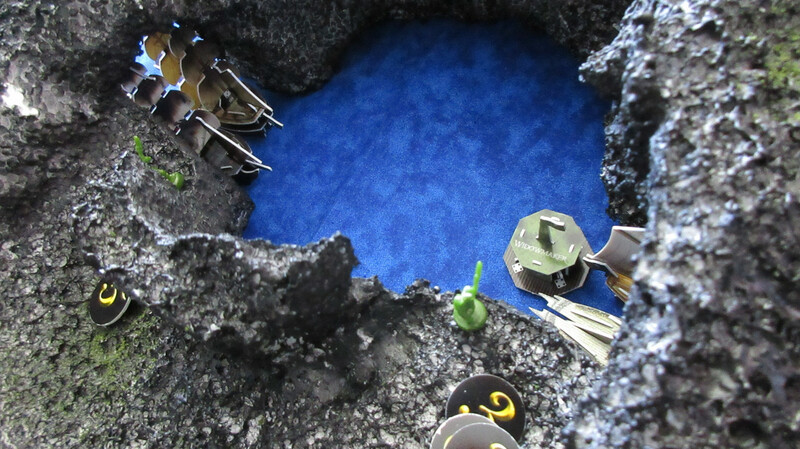 -Infantry units are eliminated by a single hit from a ship or fort, but artillery units follow the naval combat rules and must be hit twice overall to be eliminated. -I am working on figuring out how to have factions launch things outside of their home islands. This could be done a variety of ways, such as a military port from the Economy Edition rules or possibly a fort upgrade for 50 gold that lets a faction launch things from that fort with gold from it. This also shows that the 5 roll keeps increasing in duration each time, while the 3 roll keeps decreasing in duration. Fun coincidences! Logjam! 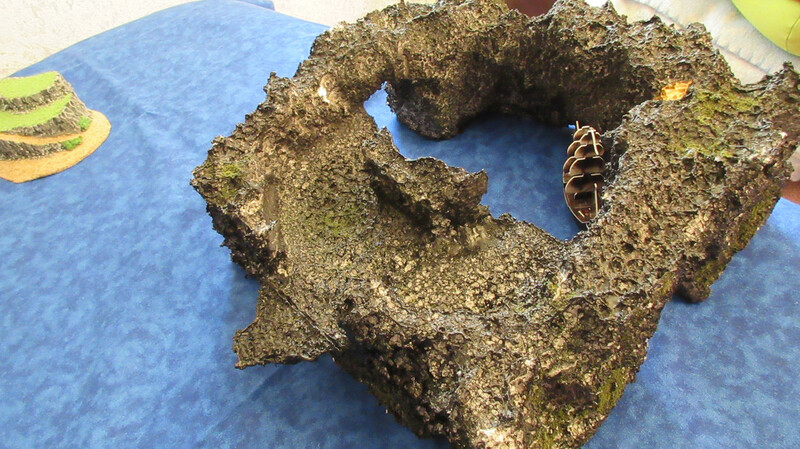 The Foresight cannot fully exit the kingdom due to the Grand Barnacle. 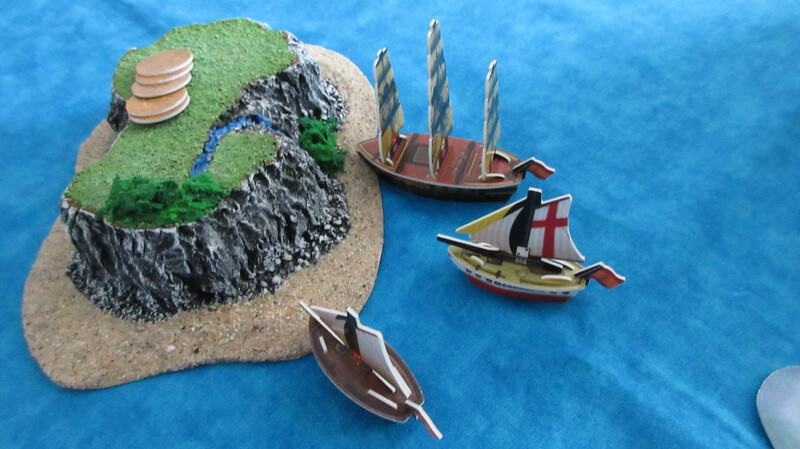 On the northern side of the kingdom, 3 large Pirate ships leave for the super valuable textiles out west. Notice the army unit movements at the lower right: there is some mulling about and getting things “into position”. 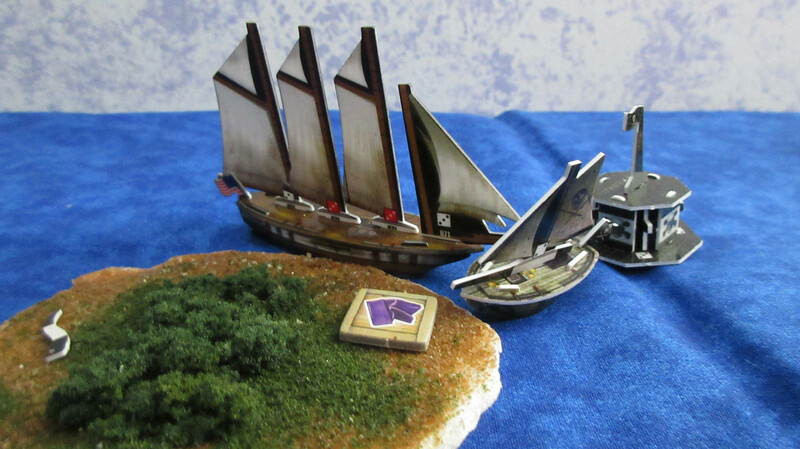 Still aghast at their encounter with Shal-Bala, the surviving crew of the Divine Wind make all sail towards the Jade home island! 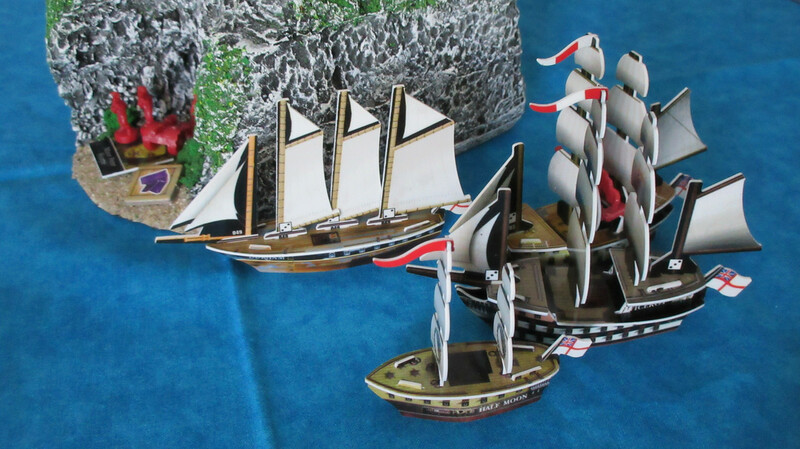 The Proud Tortoise and Dragon’s Talon immediately notice something is wrong, as the ship is missing two masts but more importantly, the crew are wide-eyed and white with fear. Sounding the alarm! 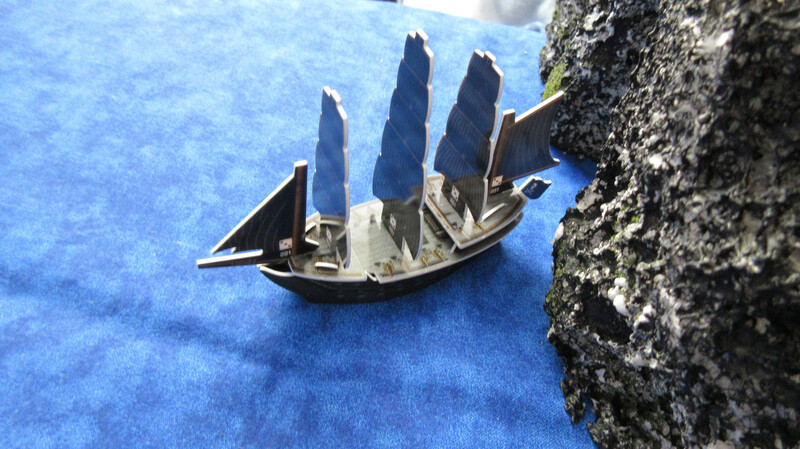 The Jade turtle ships get the report from the Divine Wind, and understand the gravity of the situation. 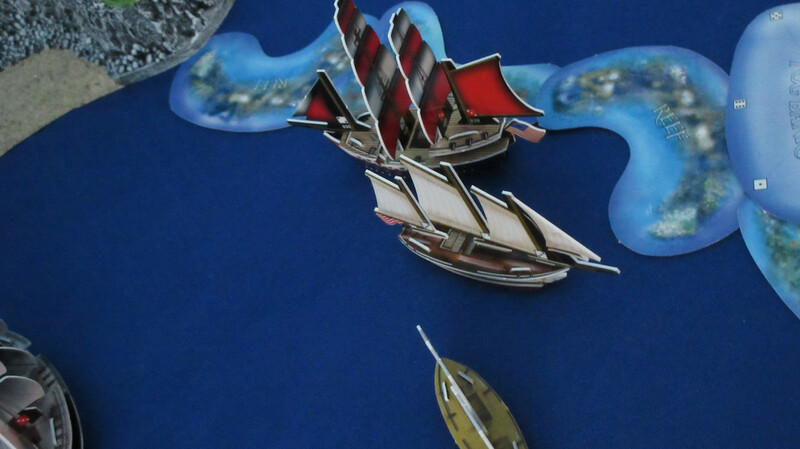 Signal flags are raised, and the chain of messages ends with the Noble Swan docking at the home island and getting people in motion! 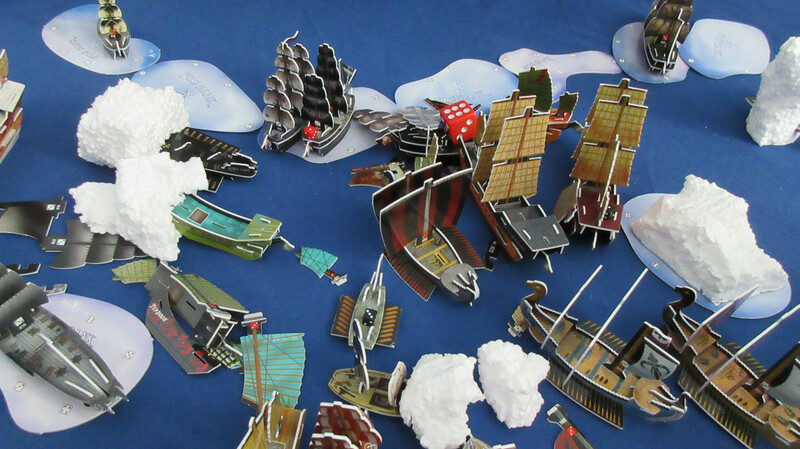 Warlord Cavendish catches wind (pun intended I suppose haha) of the situation, and orders a massive launch. The Jade Rebellion springs into action! 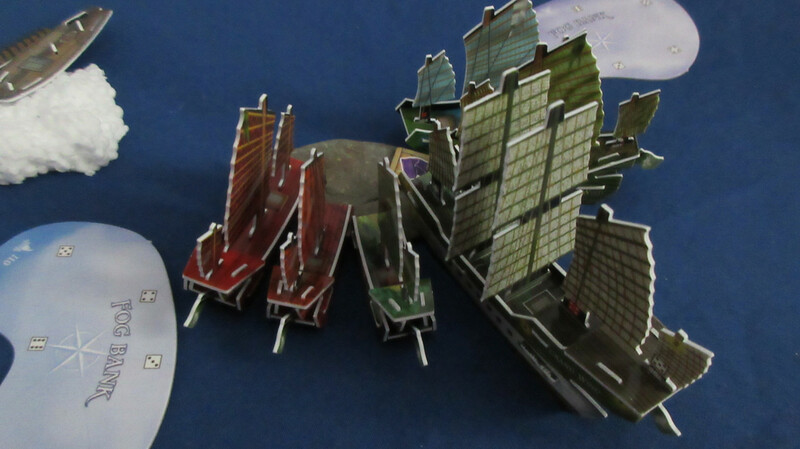 From their gold reserves they launch 7 ships including the Grand Temple and Grand Mountain! 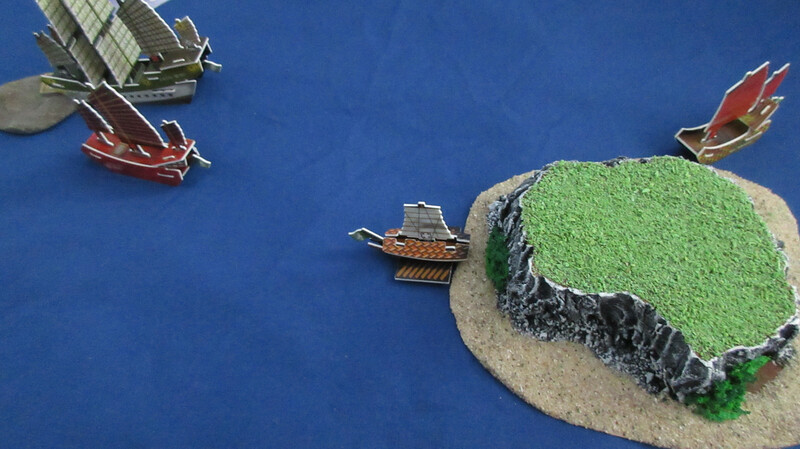 They also hire some infantry and artillery to guard against raids by the beast that killed so many of their comrades aboard the Admiral Yi and Hansan Island. Nearly the full might of the Jade Rebellion! 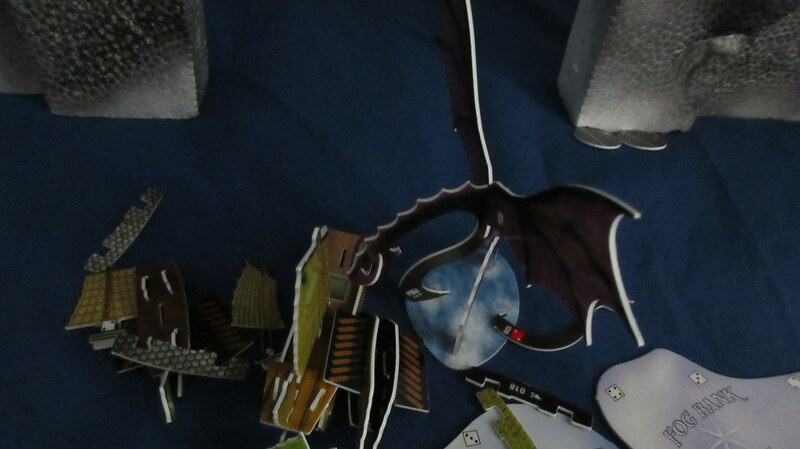 They are preparing for the worst – an all-out fight to the death with an ancient and powerful dragon! The English making some big progress at Diamond Rock! 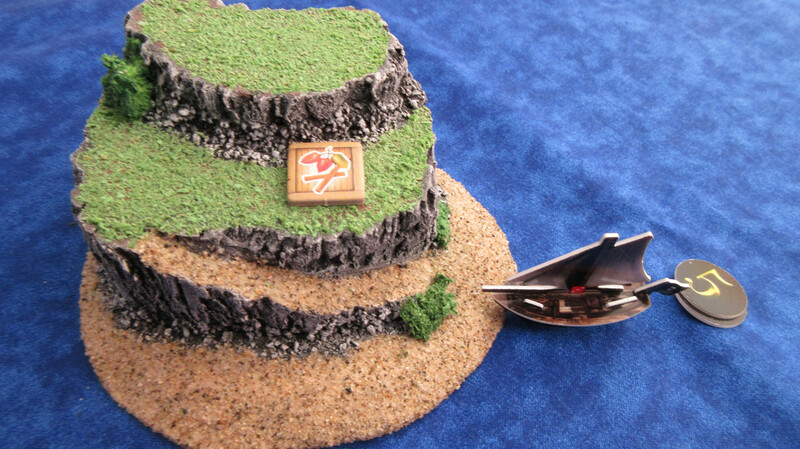 Using the 2L length of ladder from HMS Viceroy, they manage to rig it up to the summit! However, getting people and equipment up there is another story, possibly one that will be fraught with peril. Back at the bottom, you can just make out the two ladders, in addition to England’s newest resource gatherers. With textiles going from 4 to 6 in value, the English will have opportunities to spend big in the coming turns. And indeed they spend immediately! HMS Victor is launched with a captain and helmsman to patrol the waters around her HI, while the Cheshire is a multipurpose asset tasked with both collecting textiles and supporting equipment logistics at the rock. Somewhat confused by their orders from the San Estaban’s captain, the crew of the Matthias Vospero pass near the Tower flotilla, with neither side really knowing what to do. The MV is searching for the King John but doesn’t know the area well. 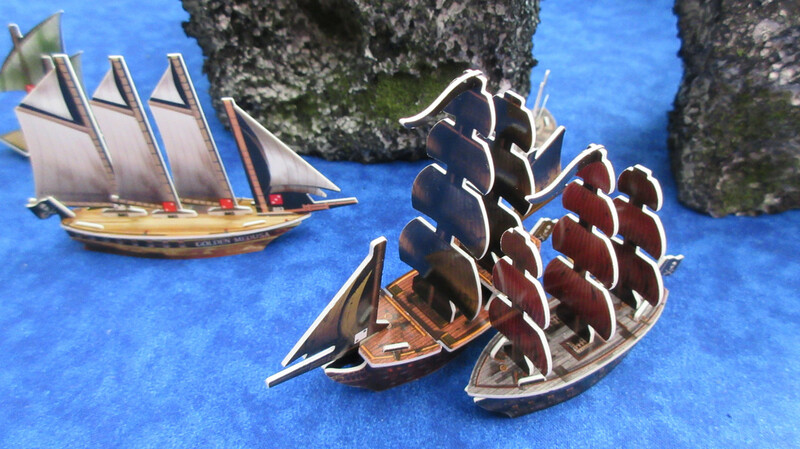 The Spanish were already struggling to put forth new ships, and the latest resource change meant their metals dropped to just 1 gold apiece. 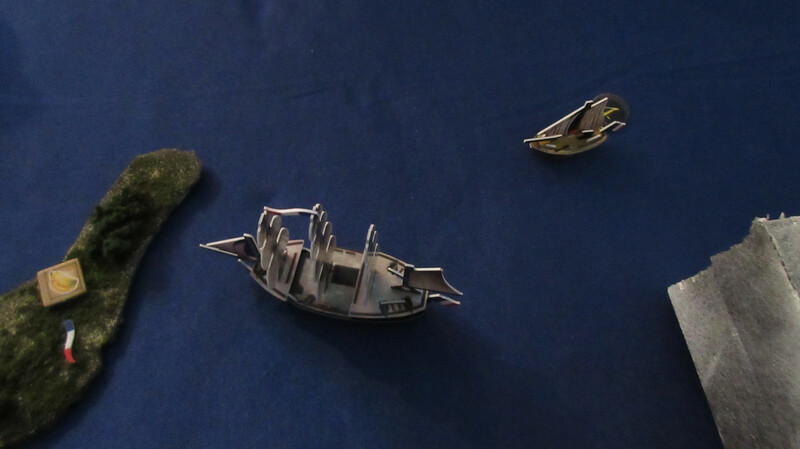 Here they are frustrated, as the Aguila was about to cash in her haul of 4 metal tokens for 20 gold, but now they are nearly worthless. The Dijon finds luxuries! This is great news for the French, since they only had found food until now. 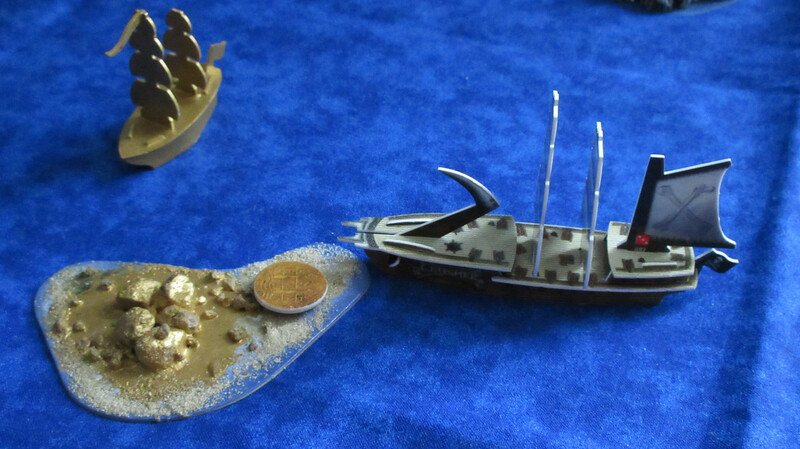 Ohhhh wow… the French have hired Captain Nemo and the Nautilus!! Now you can finally see the American plan!! Dropping a loaded keg of gunpowder over the side, the Americans try to time their fuse correctly! They are trying to blow up the reef and eliminate it!! 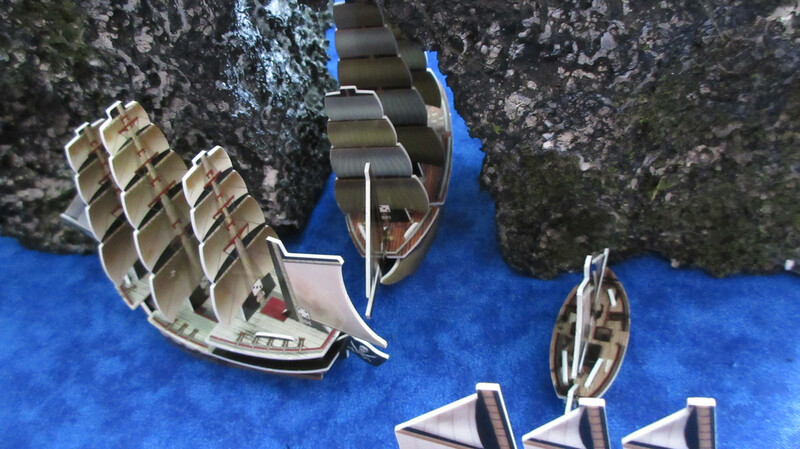 After finding reefs all along their eastern sea area, the Americans have grown frustrated. 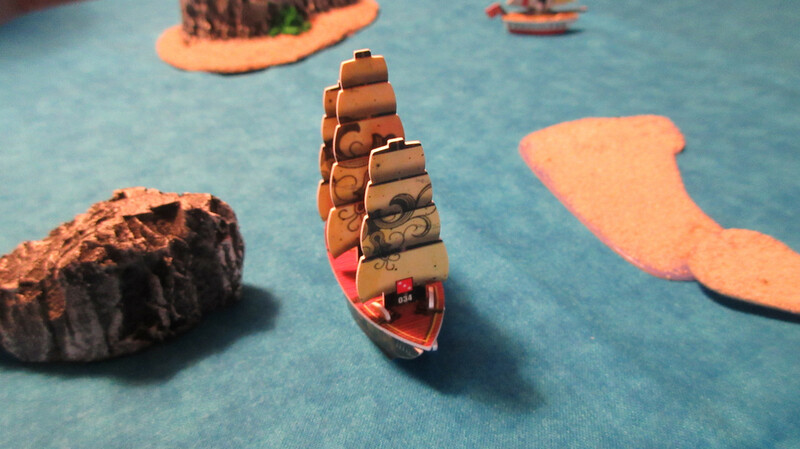 Trying an idea cooked up by Commodore Preble and some of his captains, they have gotten into position. If the lighted fused inside the barrel is too short, it may not reach the coral. If it’s too long, water may seep into the barrel and put it out. 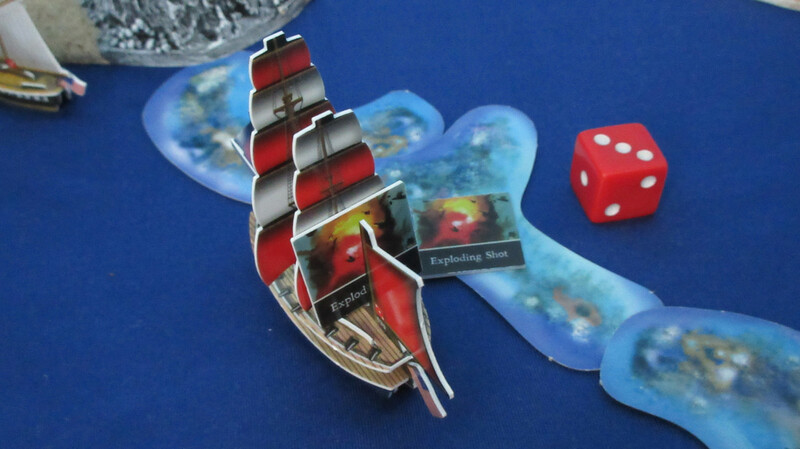 The rules for attempted reef destruction are as follows: If a ship with Exploding Shot is within S of a reef, you may use this ship’s action for the turn to drop a charge into the water. 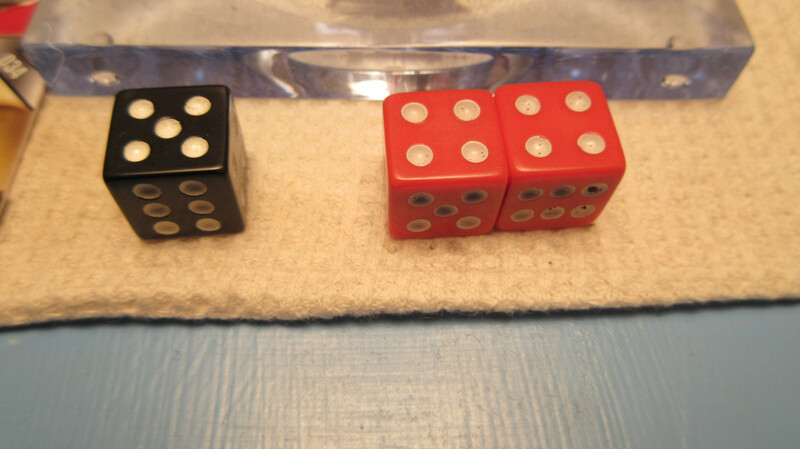 Eliminate the Exploding Shot from the game and roll a d6. On a 1-3, nothing happens. 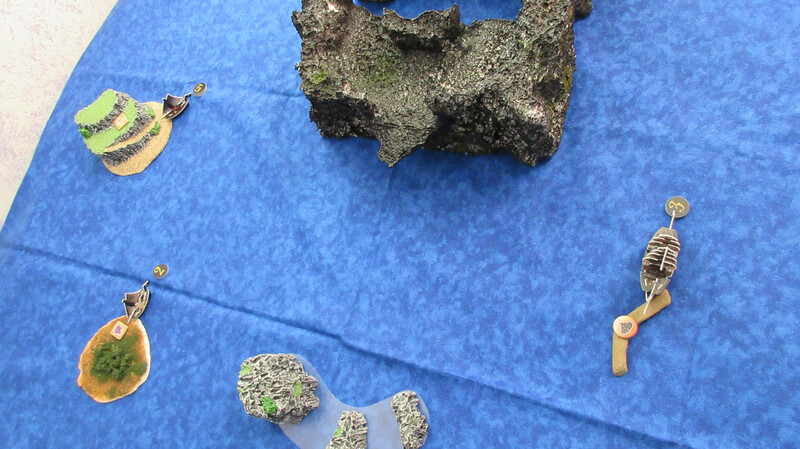 On a 4-6, eliminate the reef from the game as well. 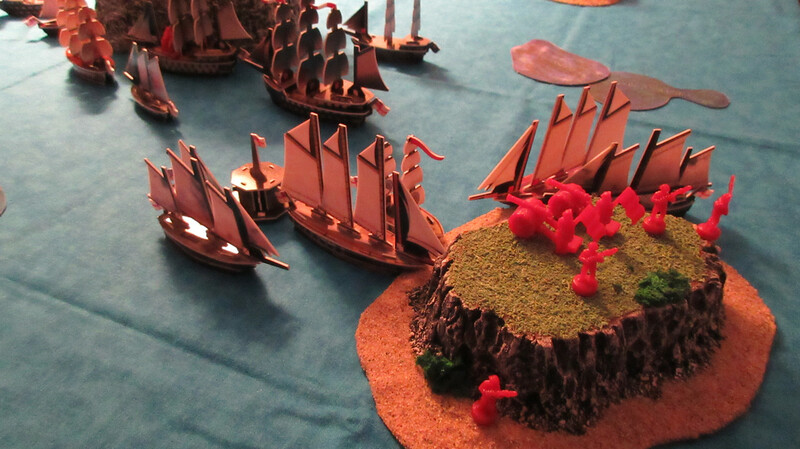 Back in the Sea of Allost, the Pirates have some army units lumbering into positions. 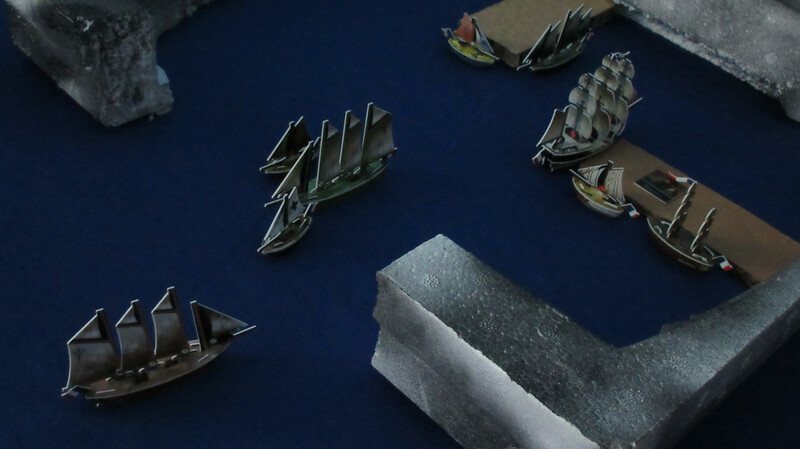 In a very impressive show of force, the Jade Rebellion battle fleet sets out! 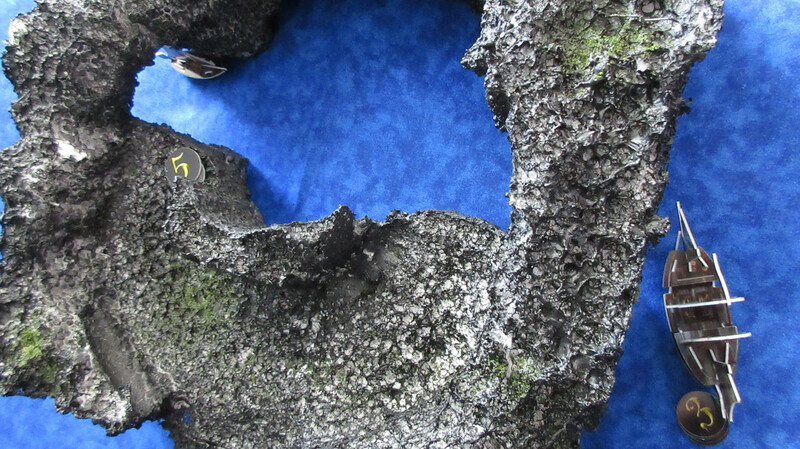 Their goals are as follows: Definitively explore the region northwest of their home island. 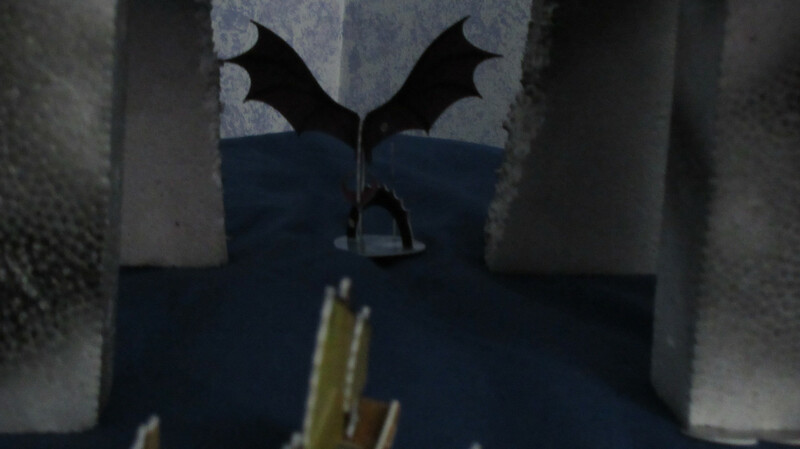 Find the “gates of hell” and defeat any dragon that appears. Establish Jade dominance over Allost! 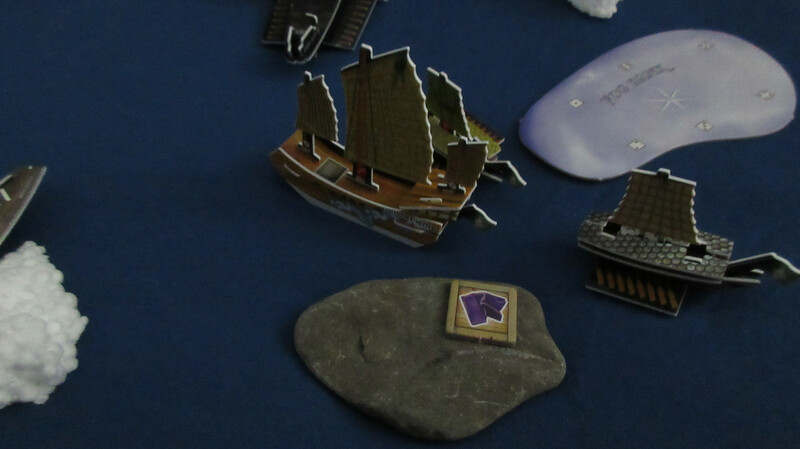 In the meantime, the textile gatherers flock back to the island, which has been very valuable all game (average (unweighted lol) resource value of 5 between the different changes) and the biggest reason the JR’s were able to put forth so many ships immediately after the Divine Wind reported on the stunning developments. 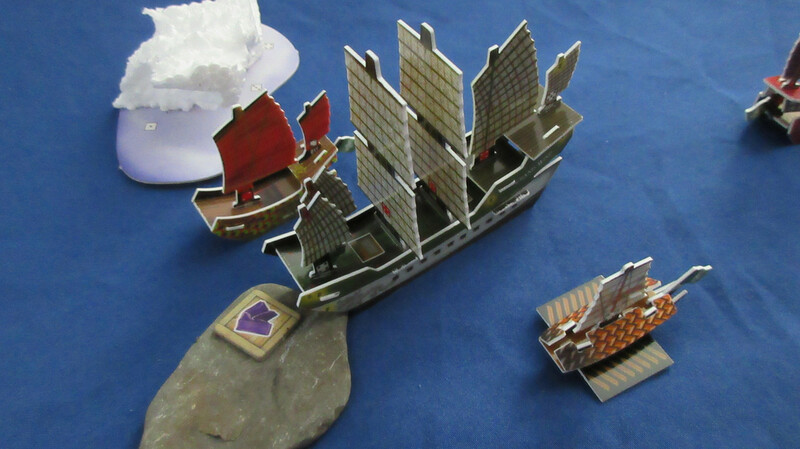 The Grand Wind unloads more textiles for 24 additional gold, allowing for massive fortification of the Jade home island! They are extremely determined to be as prepared as possible for any dragon attack. 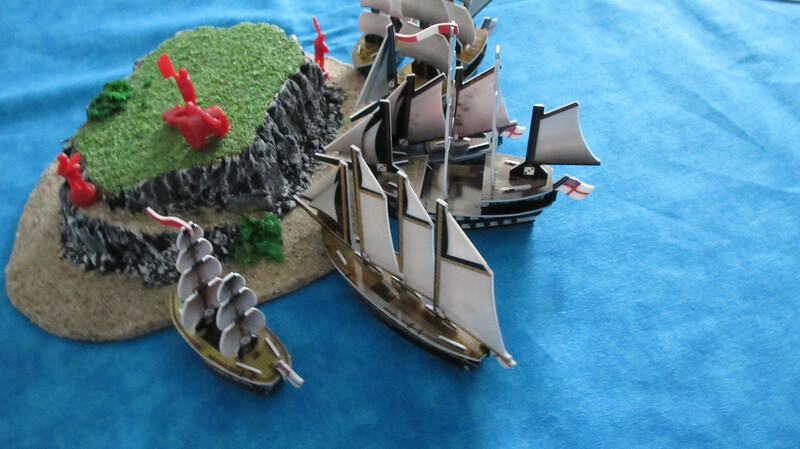 The home island is turned into a veritable fortress, with guns bristling everywhere and large amounts of musketry corps on alert. 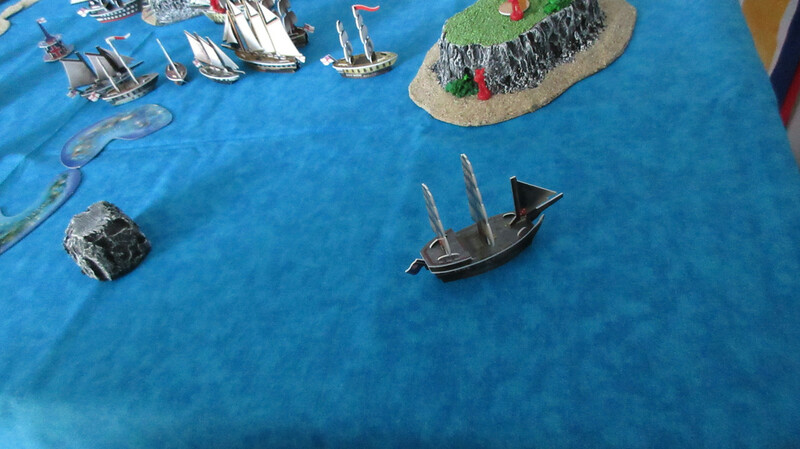 Speaking of alerting, the crew of the King John relay information about the Spanish attack to other ships in the English fleet. 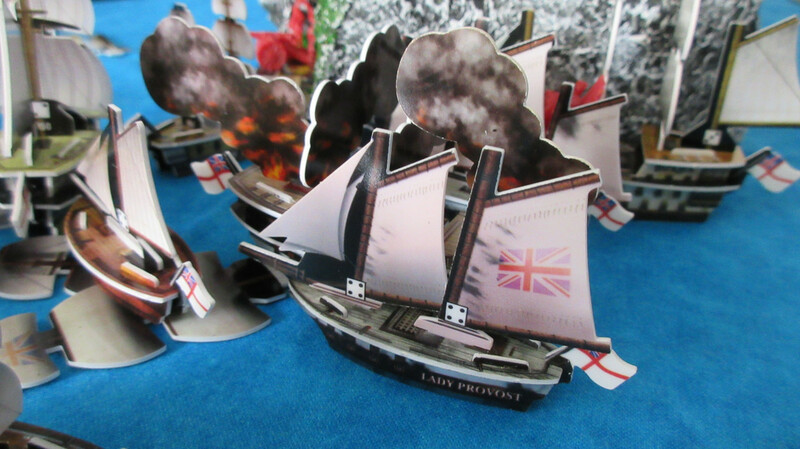 The news is received with some interest but little concern, as the English are growing confident in their considerable fleet operations, which seem to grow by the turn. 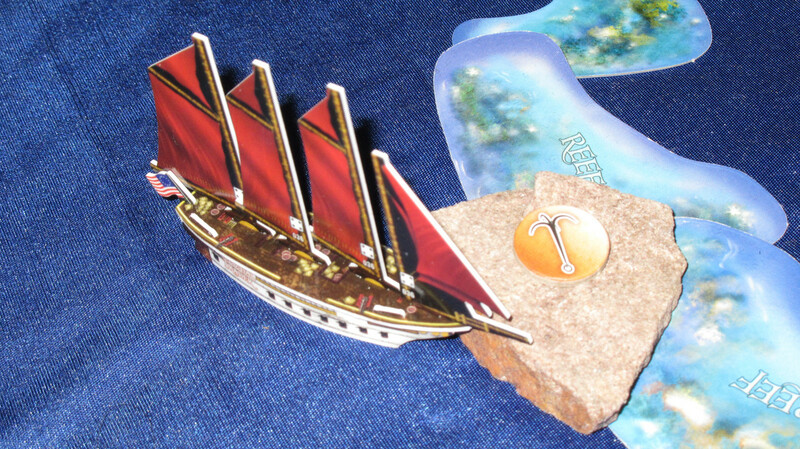 The Victor patrols the far southeastern reaches of this Caribbean, but sees nothing of importance, value, or danger. Oops! 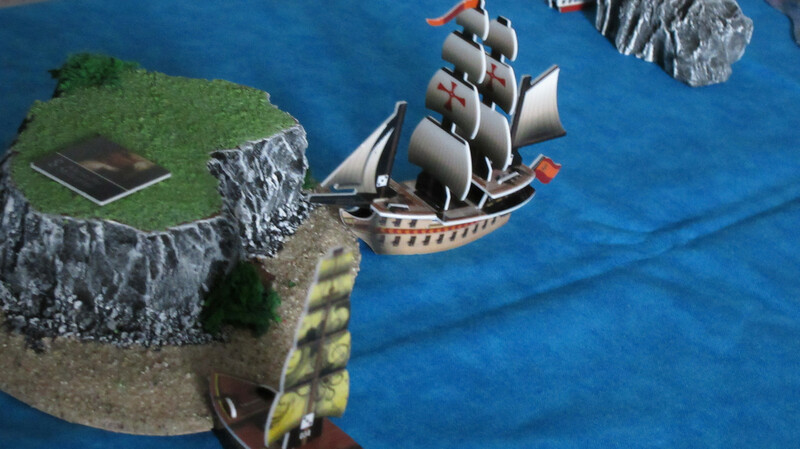 In her haste to catch up to the Matthias Vospero and get revenge on the English, the San Estaban gets stuck in a sargasso sea! 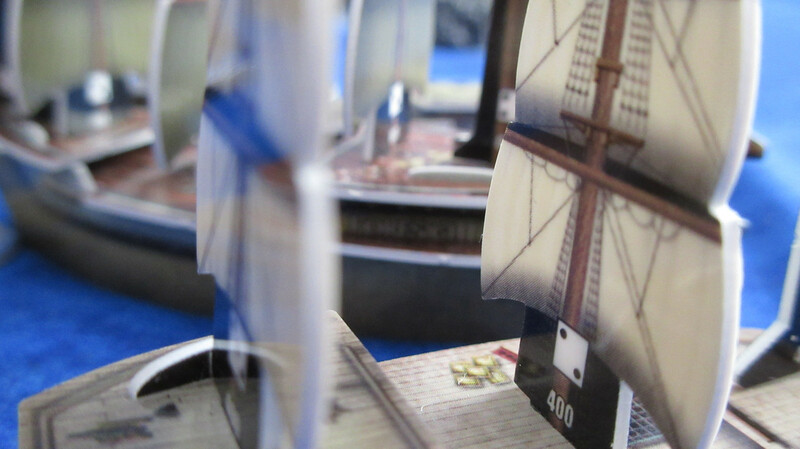 However, it could actually be for the better, since the Tower flotilla has some accurate extra-long-range cannons…. 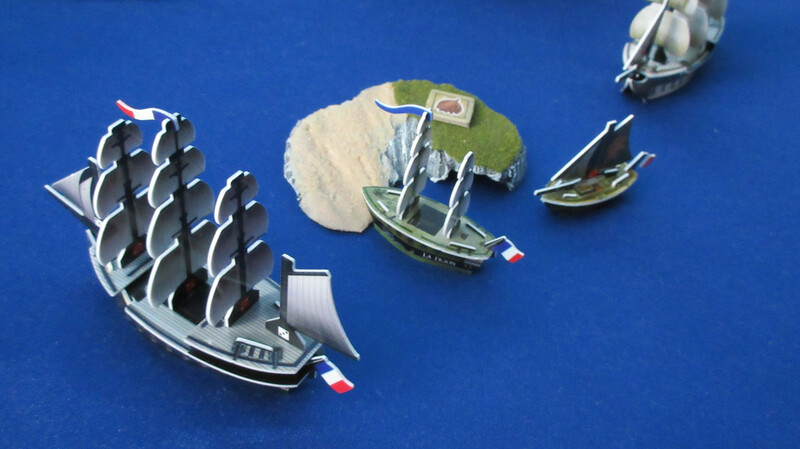 With food plummeting in value but the new luxuries worth 4 gold apiece, the French concentrate their efforts at the new island. 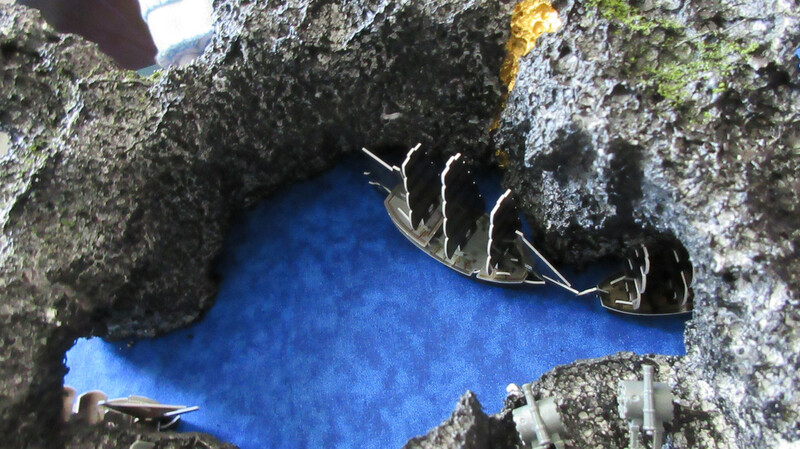 The Nautilus has submerged and begun moving. This is what Brent Rice found for the Americans on a northern beach of that big island. 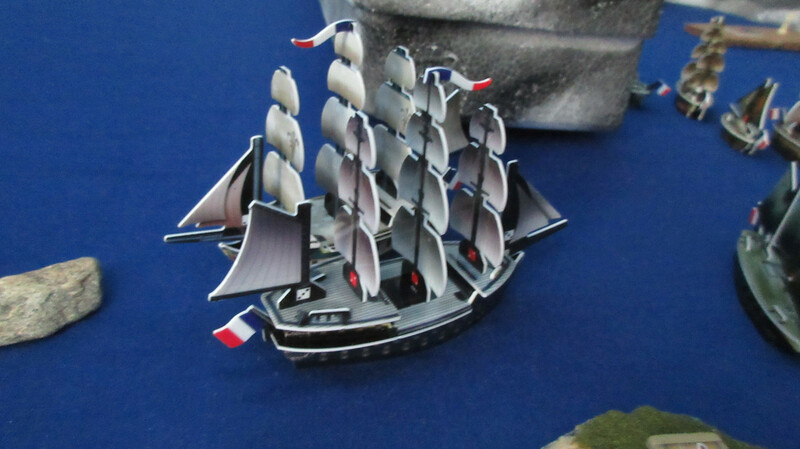 However, the Bonhomme Richard only had room for the shiny silver 3, which would be worth a cool 9 gold. The anti-reef operations continue, with the Argo preparing to deliver two loads of exploding shot to the Congress. 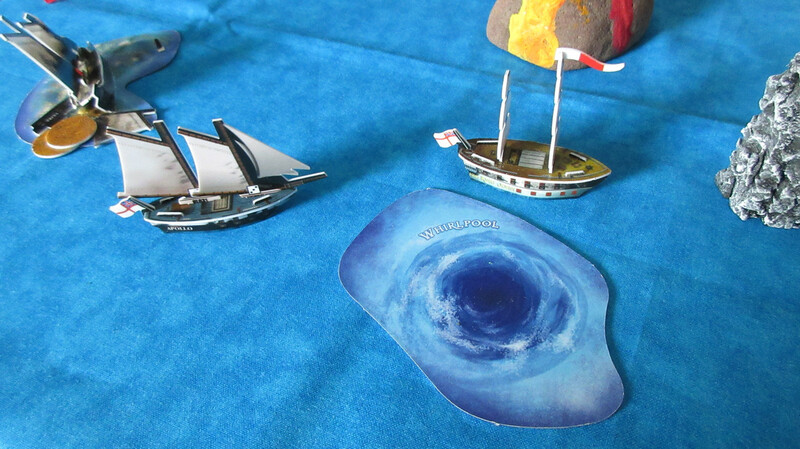 The Colonial Trader (at the bottom) has sailed north after the apparent demise of Luck Island. 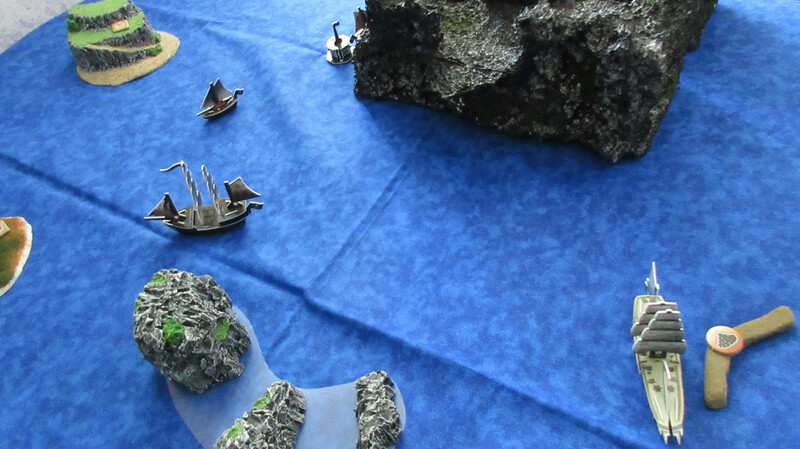 In territory completely untouched by ANY faction, the crew of the Freedom pass by a shipwreck. 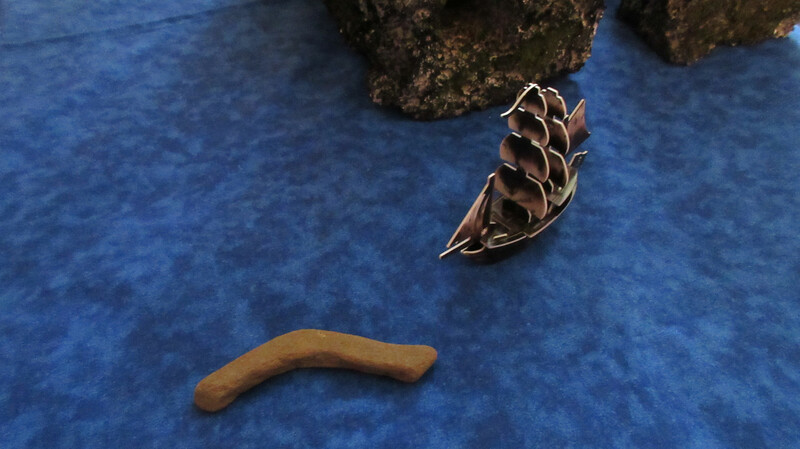 However, Ralph David has no time to waste finding trinkets! Ouch! 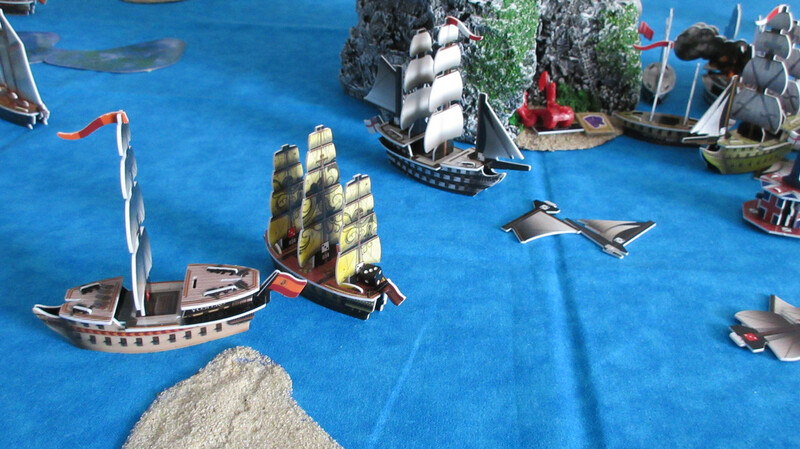 Ralph David’s sudden attack looks like a big mistake, as the Pirates arrive at the scene! The crew of the Smiling Jim smartly redock to allow some shots from the Doombox before the 4 masters take over and pummel the Freedom. 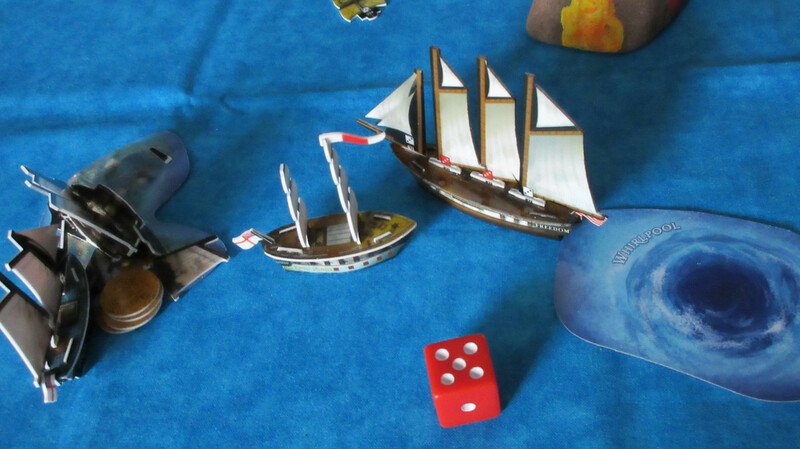 Note: the tiny dice are used as damage counters, and the ones on ships don’t matter which facing they have since it takes two hits to eliminate a mast. 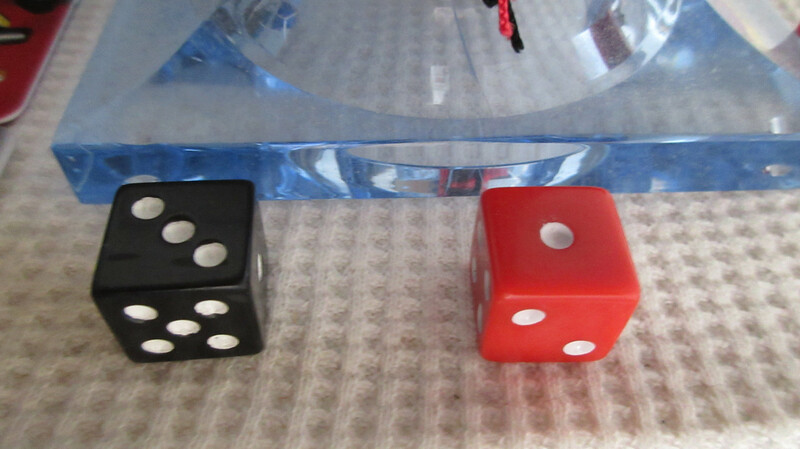 However, the die on the Doombox should be at 1 (1 hit out of 4 required to take out the flag) instead of 6. 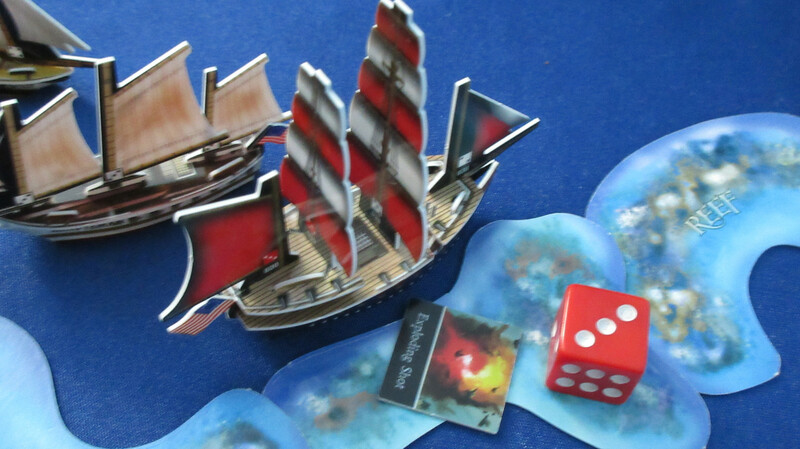 It is very difficult to maintain this as ships are picked up and the dice constantly fall off and whatnot. The counter is more important for derelicts, since that number is how many hits the derelict has taken. 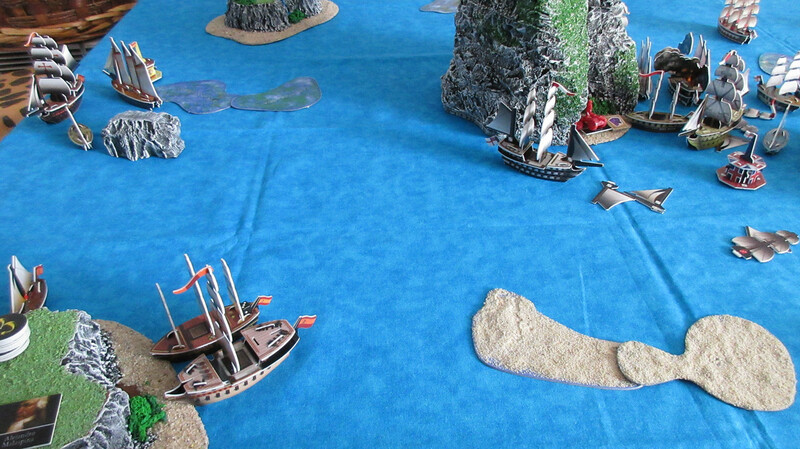 RD arrived at a terrible time, just as fresh new Pirate hybrids were entering the area and right when the Pirates’ textiles island became their most valuable producing asset. 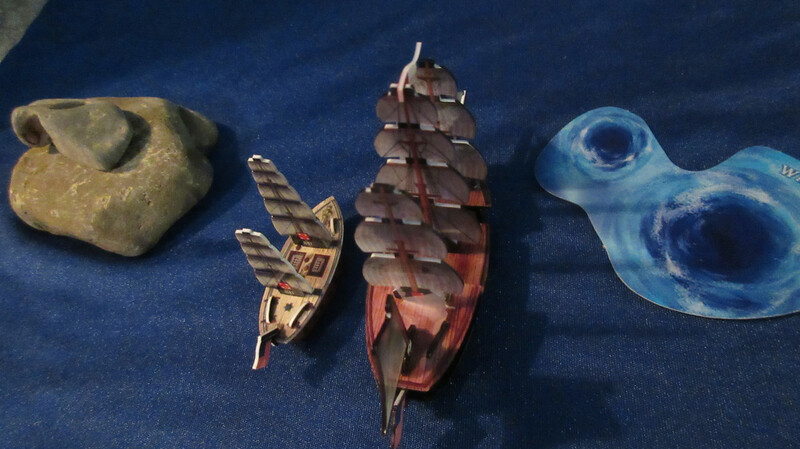 New Pirate ships near their gold waterfall. 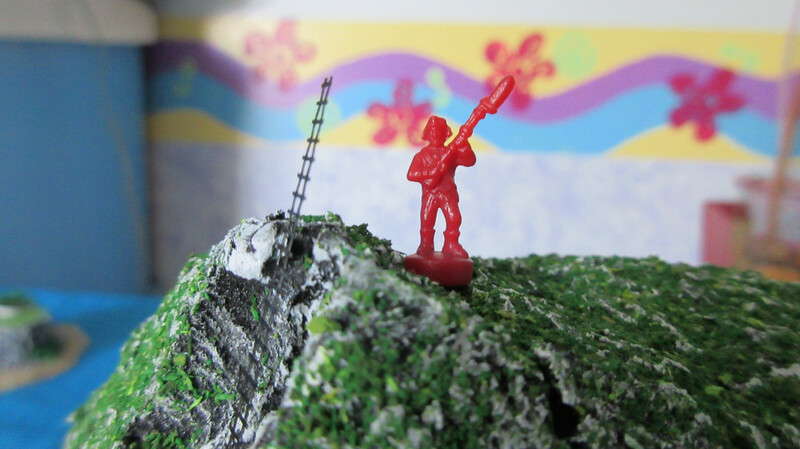 The Fool’s Hope and Recreant enter play under the watchful eyes of the artillery troops. The Jade Rebels charge ahead! 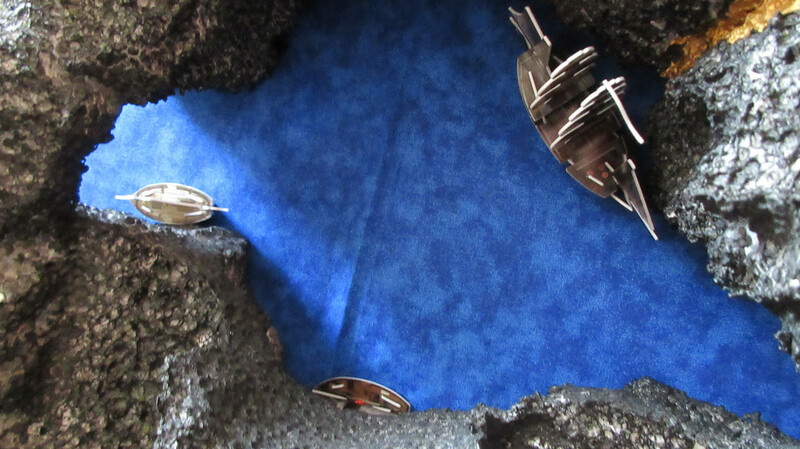 In a serious mood, they are eager to discover what has been plaguing their ships. 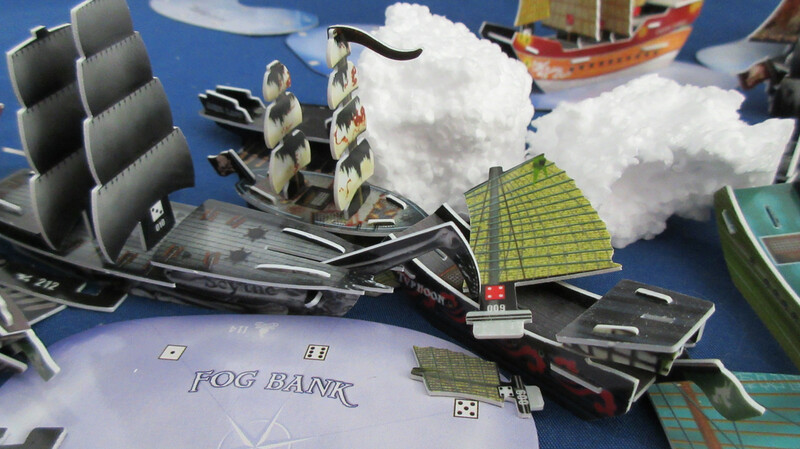 Two turtle ships become engulfed by fog, while the Typhoon is overeager and hits an iceberg. Trepidation sets in as the Grand Temple disappears…. With a sudden whooshing sound, A BLADE DESCENDS FROM THE GLOOM!! The Typhoon is hit by what looks like a giant ice pick! Hissing and screeching accompanies the sound of splintering wood, and the Scythe spears her prey!! Ahh!! 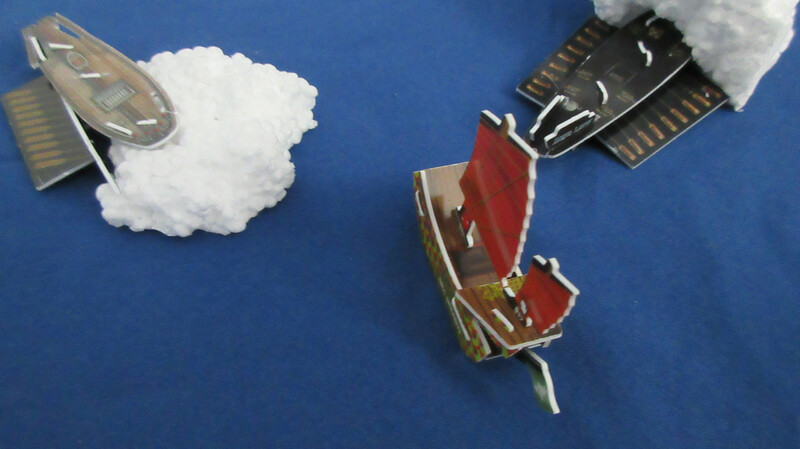 At the left, an ice shipwreck surges forward and rams a regular iceberg, pushing it into the Clear Wind like a chain of dominoes!! 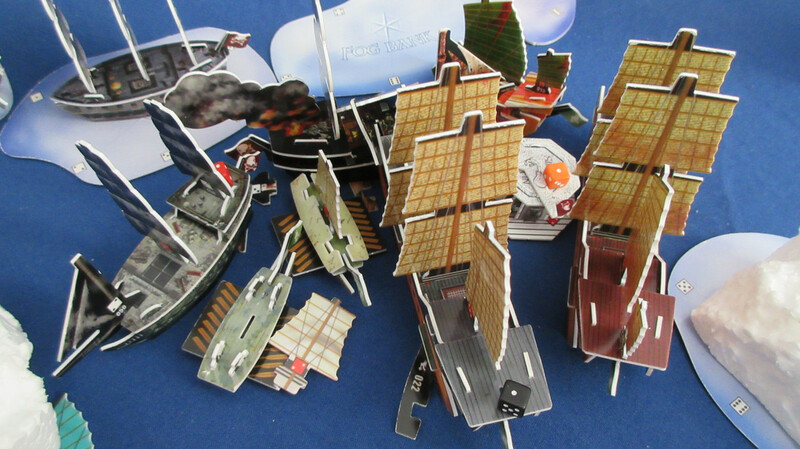 The bow of the ship is splintered by the impact, but another icewreck suddenly slams the ship’s starboard quarter! 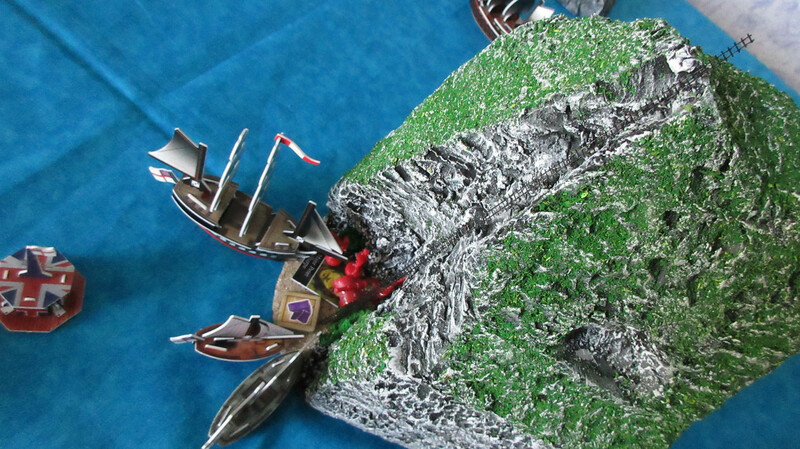 The Clear Wind is smashed up, but it only gets worse as the Crushed Skull appears! 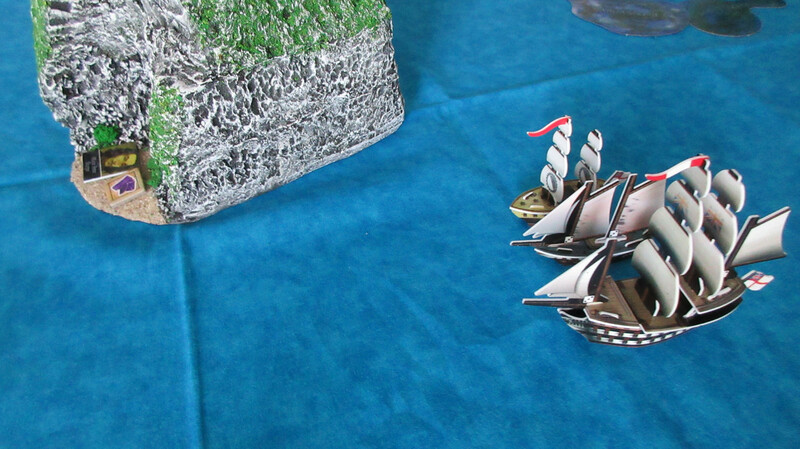 Sailing in from the north, the Samedi’s Curse appears with the Silver Coffin in tow! However, the flotilla scores no hits. I’ll let you make of that what you want…. Back to the Caribbean! 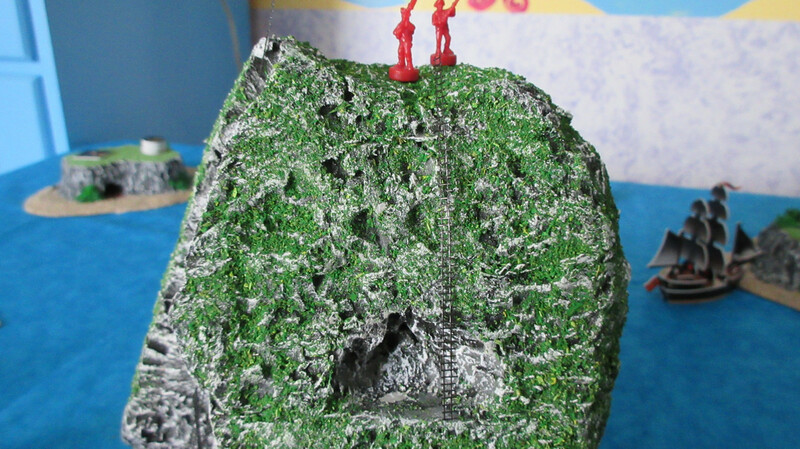 In a daring maneuver, the first men climb the ladder to the summit of Diamond Rock!! And they’re there! 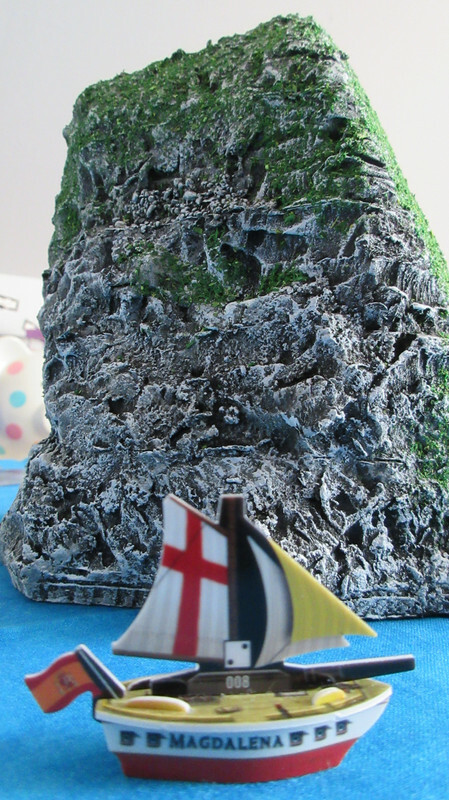 The English claim sovereignty over Diamond Rock! 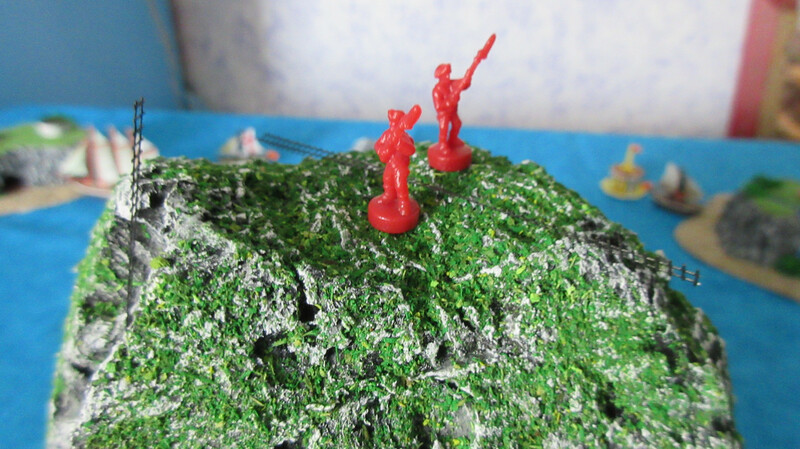 It wasn’t easy and it took some time, but the English have found a way to get their troops up on the rock. Excited by the development, the English spend a bunch of new gold back home. 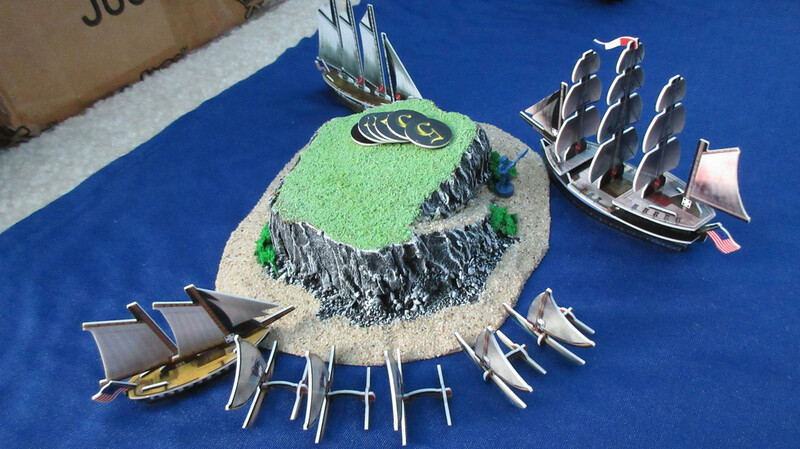 They launch the Bretwalda, Sultan, and Honu Iki. 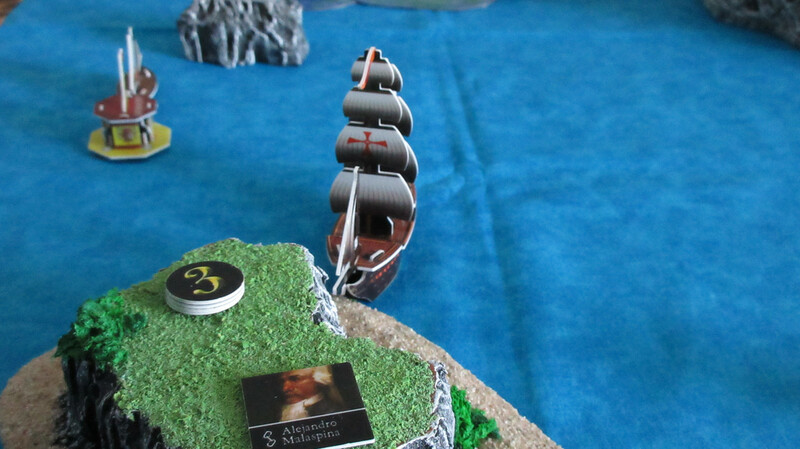 The sympathetic crew of the Matthias Vospero nearly hook a line to the San Estaban to get her out of the sargasso sea, but the SE’s captain warns them away from getting stuck themselves! 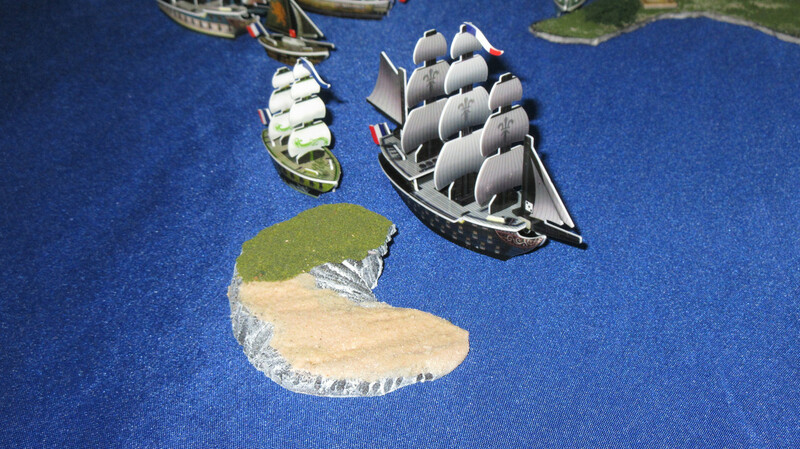 The French flagships find a rocky piece of terrain, but it doesn’t look hospitable to anything – resources or humans. Ignoring common sense and any notion of sanity, Ralph David loses his mind and attacks the Fool’s Gold! 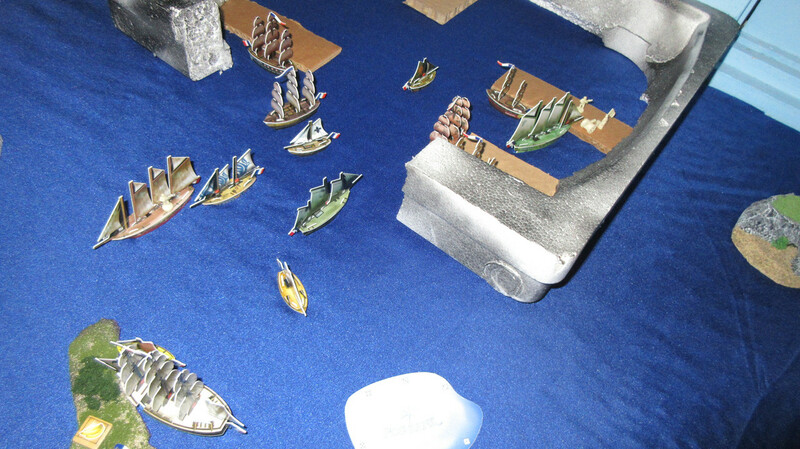 The Pirates take their turn after the Americans once the next round starts, and here you can see they’ve taken care of the Freedom easily. It seems like they would want to capture her, but Ralph David completely refuses to surrender. 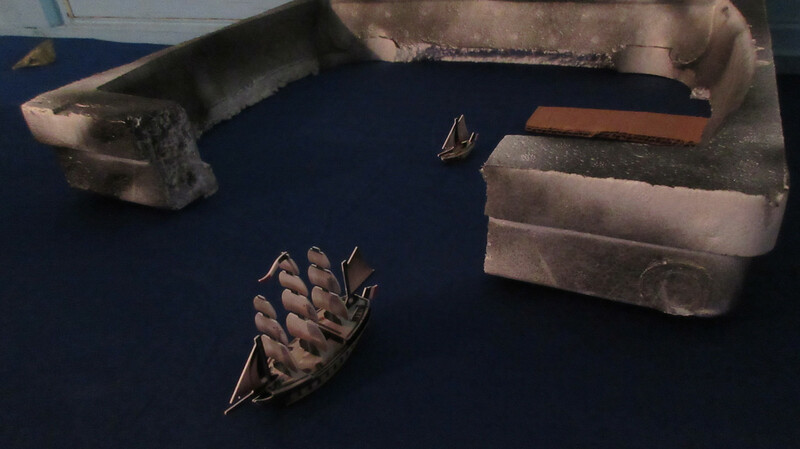 The Grand Temple finally emerges from the fog, but finds herself alone and facing the so-called “gates of hell” described by the crew aboard the Divine Wind! Scared for their comrades and hearing screams to the southeast, the Tsai has the GT turn around and head back the way they came. 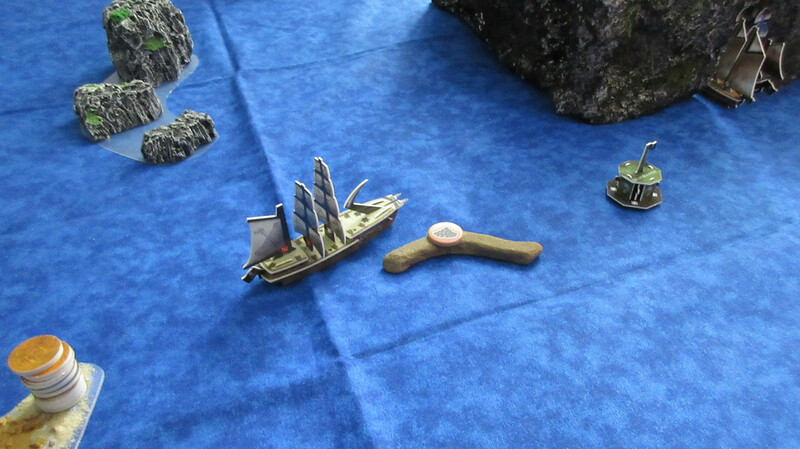 She loses her larboard oars in the maneuver, but the Floating Stone manages to knock a mast off the Scythe! 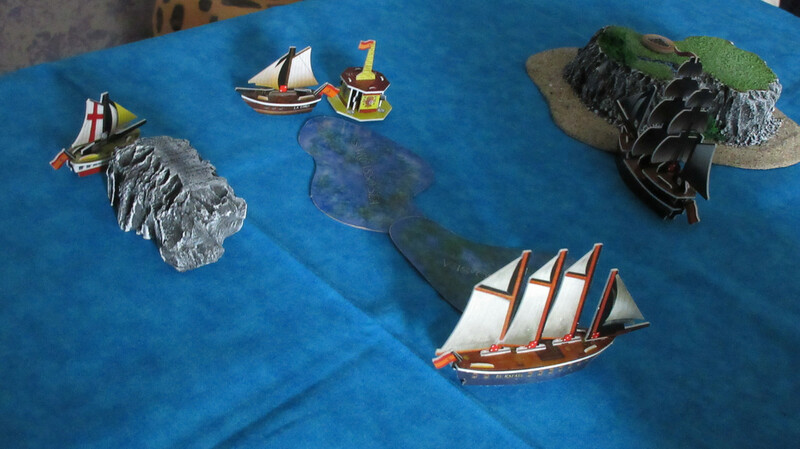 The Crushed Skull is damaged as well, but the Jade 6 masters manage to sink the Samedi’s Curse! With desperate cries for help heard to the northwest, the Jades take in an IMMENSE quantity of textiles (19*6=114 gold) all at once and spend it all! 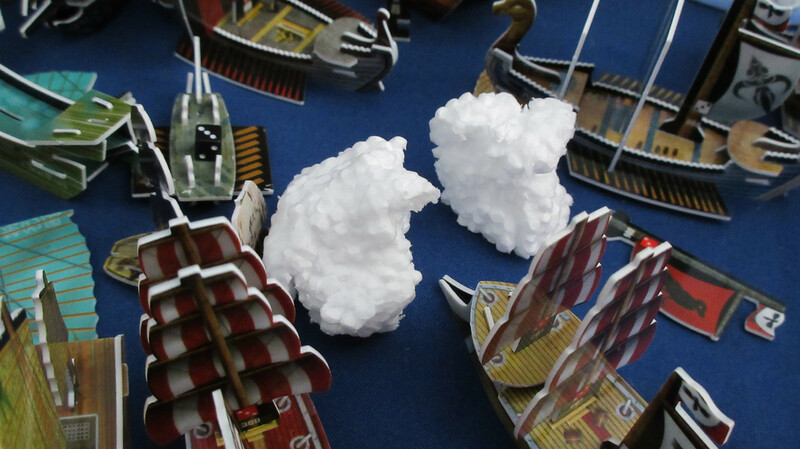 They have nearly run out of ships to launch from their own faction already, but here they turn to another minor faction: the Vikings! Sigurd Andersen boards the Polaris and offers Norse help to the Jades in exchange for payment. 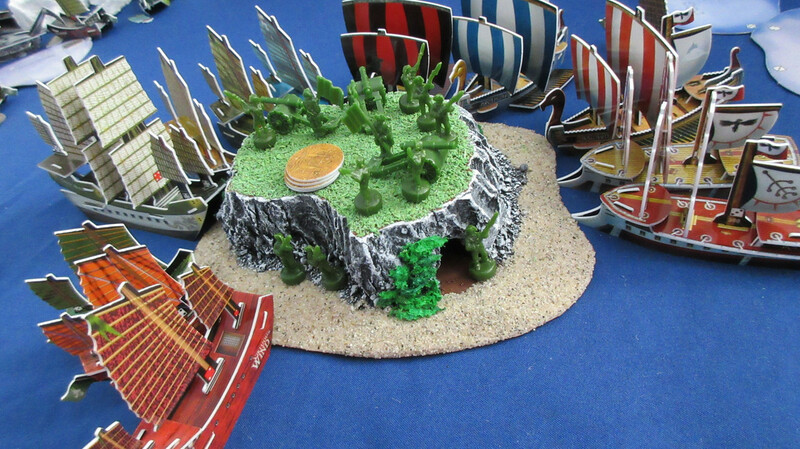 In this way the Vikings function like mercenaries or privateers for this game. 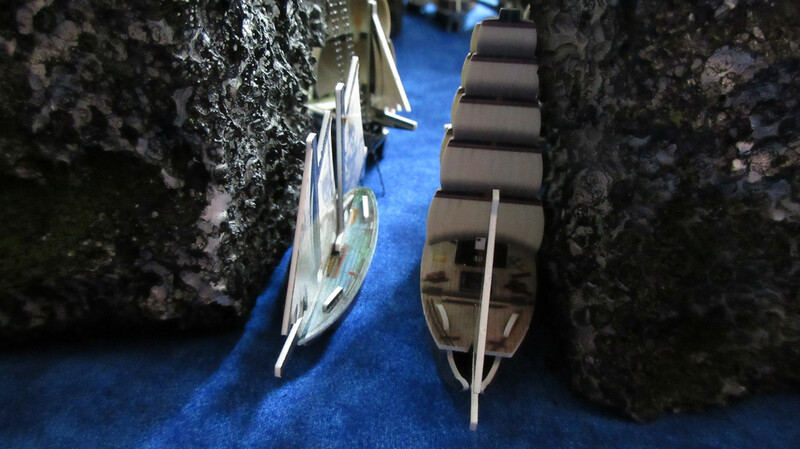 Both Viking icebreakers are launched for obvious purposes, and 3 impressive longships are also purchased. Ouch! 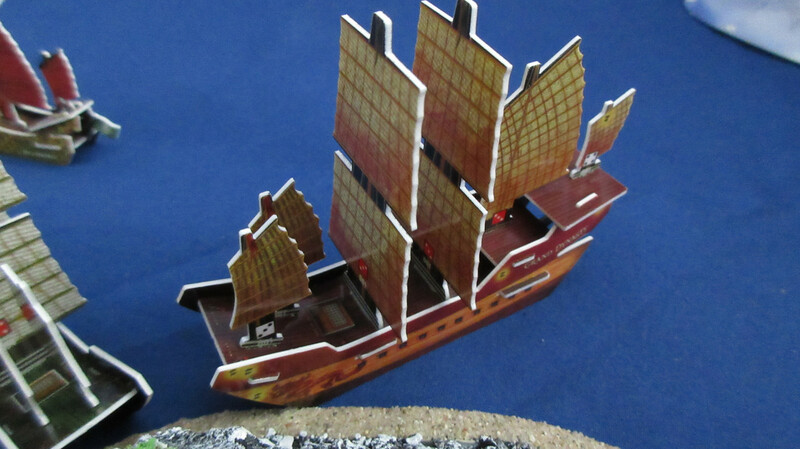 With a thunderous broadside, the Monkey’s Paw officially enters the fray and blasts all the panels off of two turtle ships! 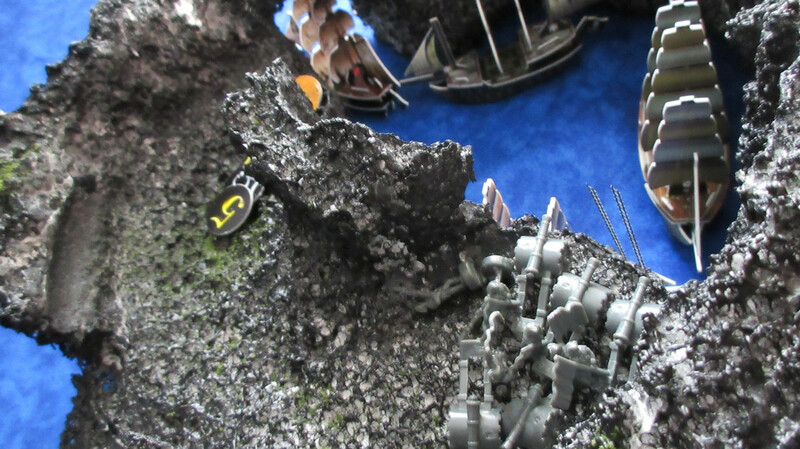 After another action given to another infantry unit, the English have more troops atop Diamond Rock, in addition to a ladder. You can just barely make out all three ladders the English have on the beach, though only one reaches the summit. The Cheshire loads resources for the first time while at the right, you’d have to believe the Burma will try again but possibly with a different tactic this time…. Whoa! 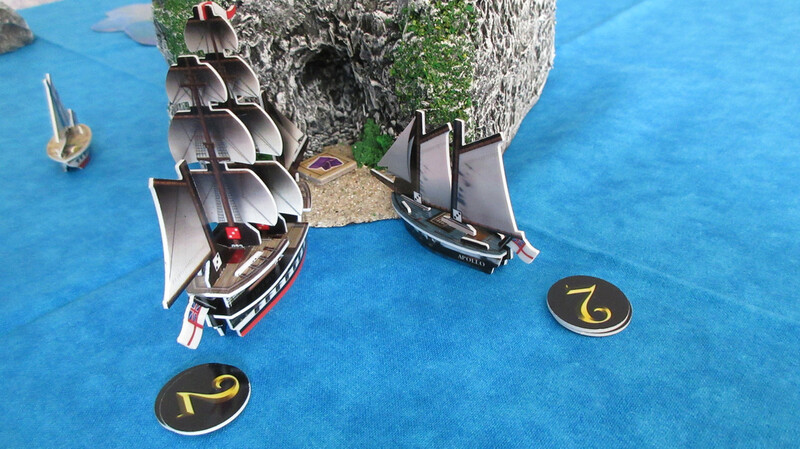 Out of nowhere, the Matthias Vospero sails near the Viceroy and hits 2/2, with the second hit coming from fire shot! 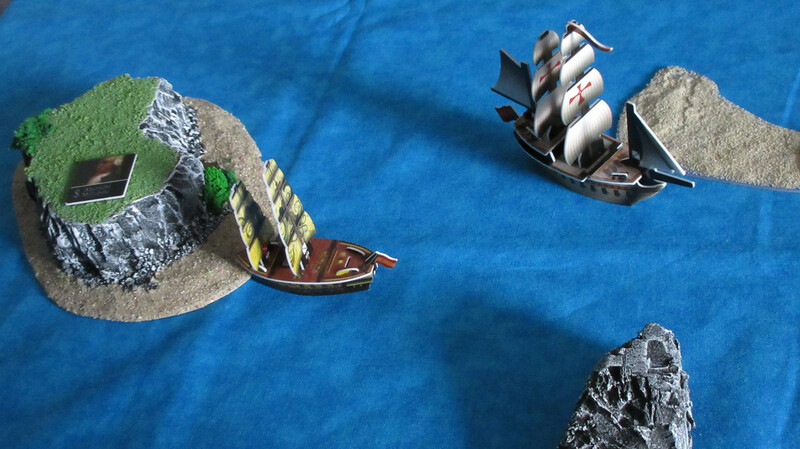 The other two Spanish shots missed the Tower flotilla. At the left you can see why the Spanish attacked: the San Estaban is free! Note: fire follows the 2 hits per mast rule for shooting, but follows the fire mast rules for spreading/elimination. 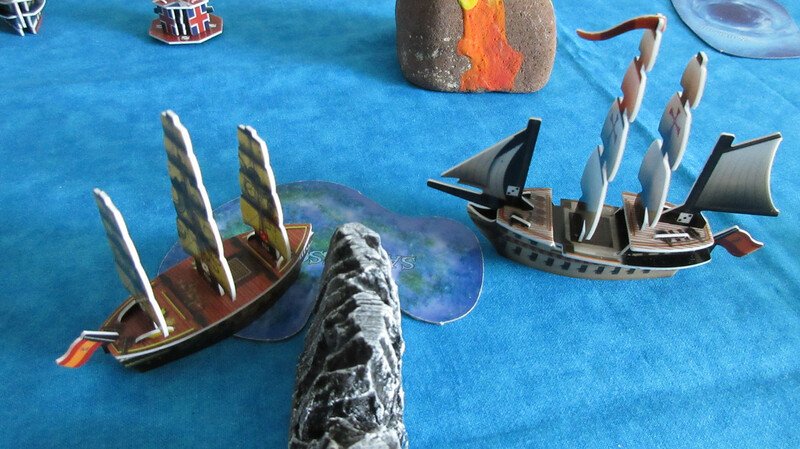 Basically, to set a ship on fire it has to be the second hit that actually eliminates the mast. However, if a fire mast spreads it spreads normally – it doesn’t cause a damage marker or need a second bad roll, it just spreads like it would under the normal rules. 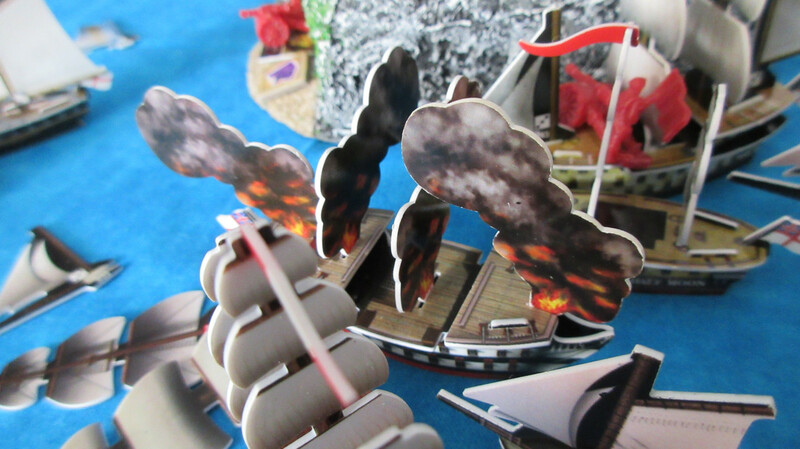 This way fire isn’t a cheap way to ignore the 2 hits per mast rule, but it can still spread and be very effective. 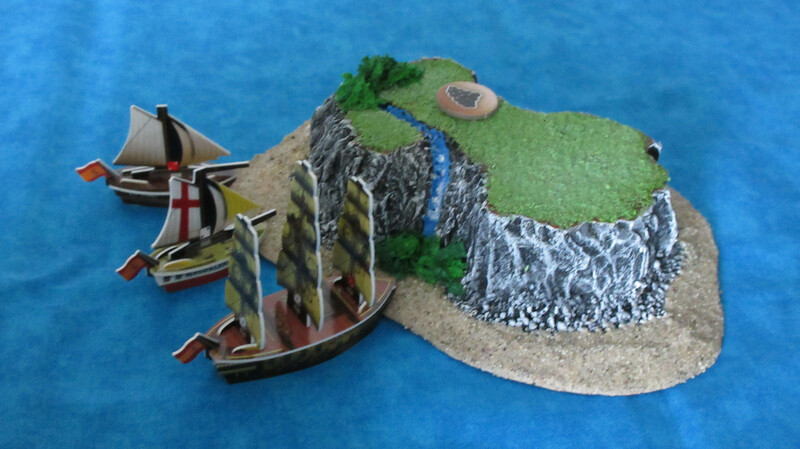 Just when the Spanish think their resource situation can’t get worse, the GOLD ship appears! Paradise Island lives up to its name once again! Back in Karkuda, a meeting of the minds. 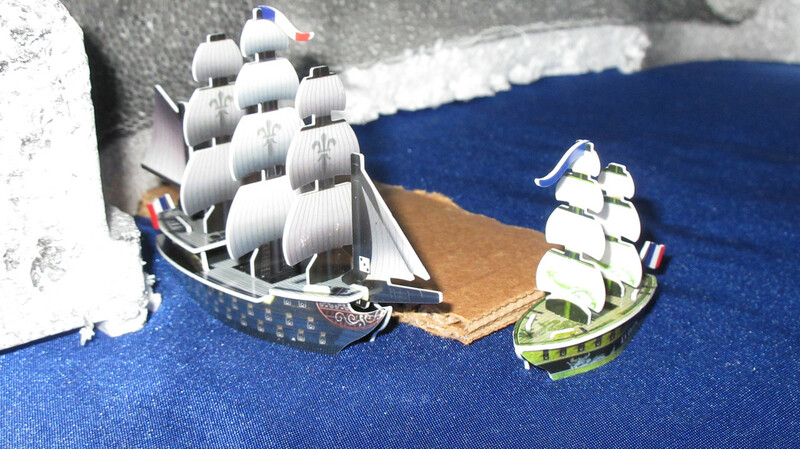 Gaston, the French admiral aboard the Soleil Royal, consults with Lenoir, the commander of the Dauphin Royal. 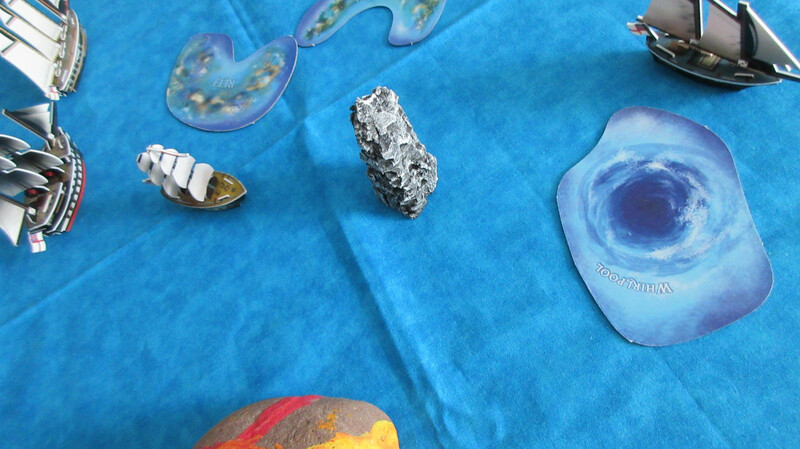 Topics of their conversation include exploration, resources, and how far to venture into the unknown. To the far west, the Americans fail again! 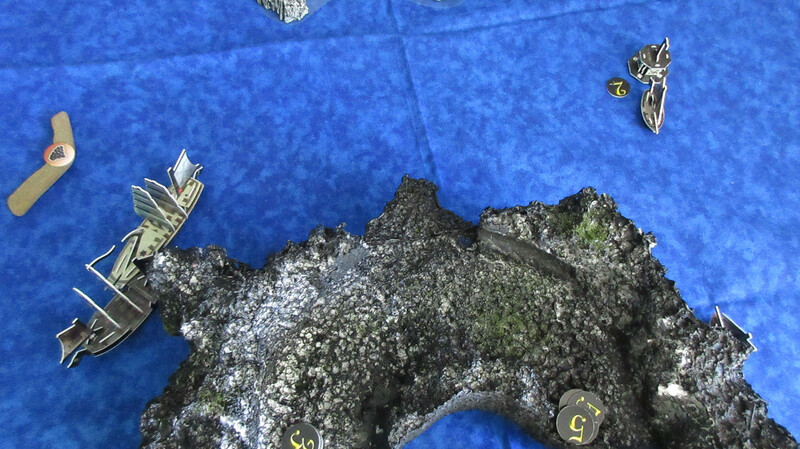 The Congress drops another exploding shot on a reef, but to no avail. 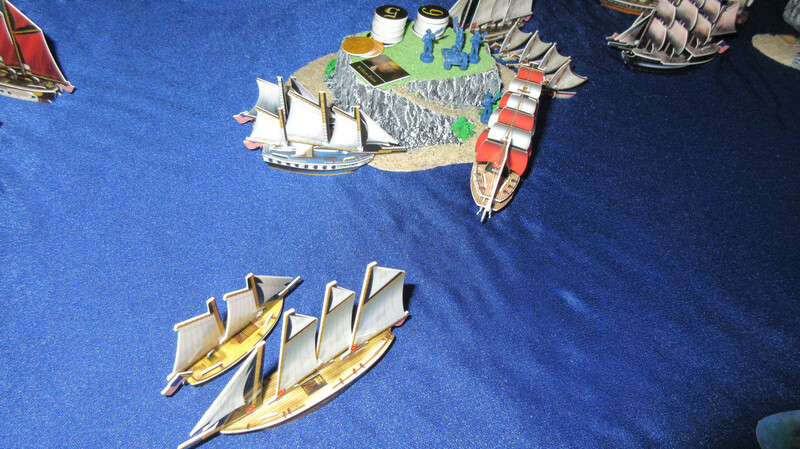 An impressive wide shot of the American fleet, which is entirely north of their HI since Ruby and Luck Island ran out of resources. Teamwork! 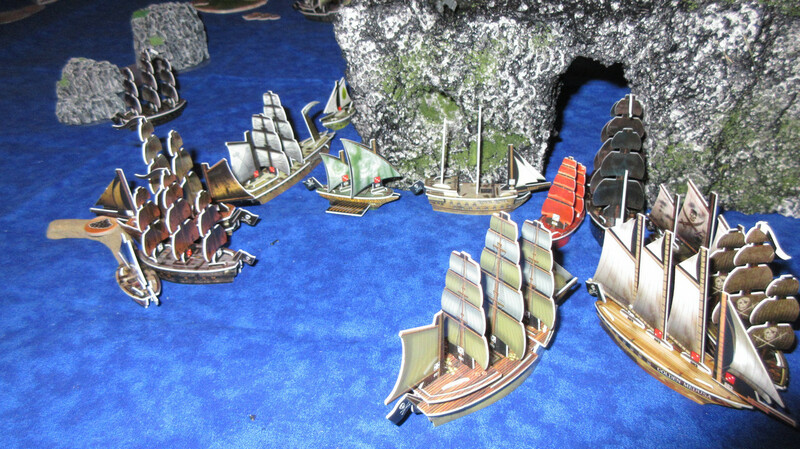 Back in darker waters, Jade ships swarm the Monkey’s Paw to eliminate two masts. The Last Hope comes under intense fire, from the Dragon’s Talon and Grand Mountain. The Mountain scores a hit with exploding shot! 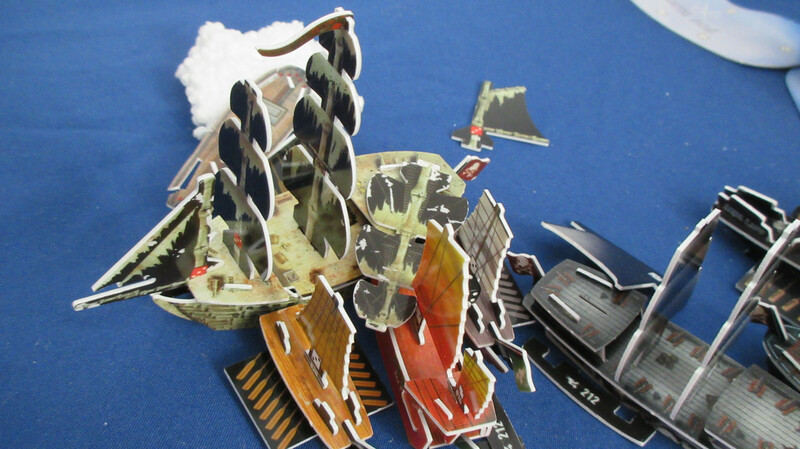 … leaving her attackers strewn with wreckage! 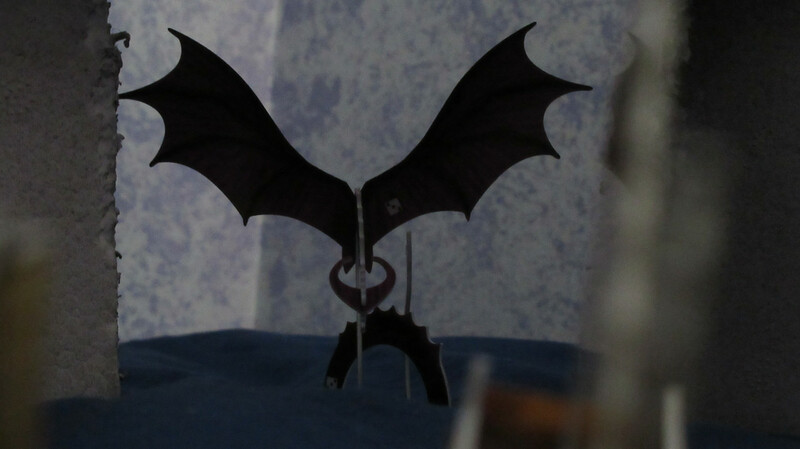 With very loud creaking and groaning, the Scythe makes yet another blade attack on the Typhoon. 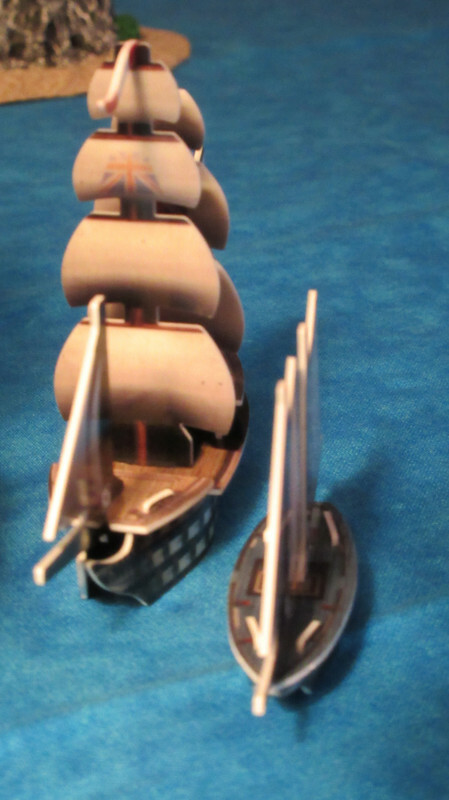 Incredibly, this time the blade actually begins to splinter the deck and hull of the ship! Like a great beast rending bone from bone! Oh no! The Clear Wind has spent too long near the iceberg! 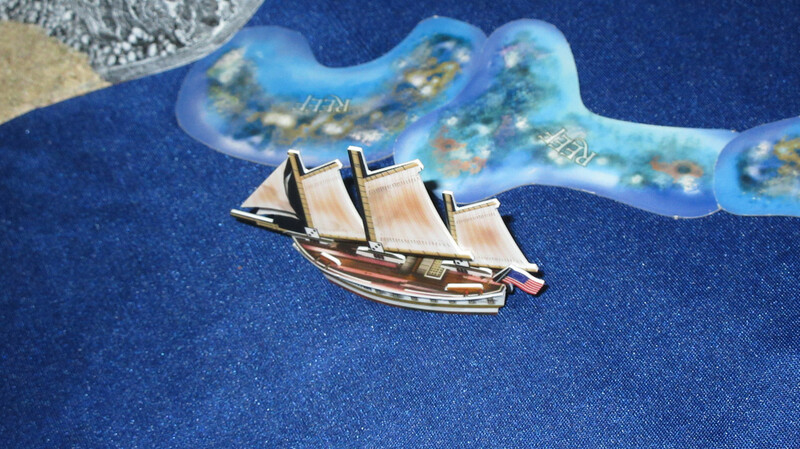 The ship seems to slip into an abyss, and becomes an icewreck herself! 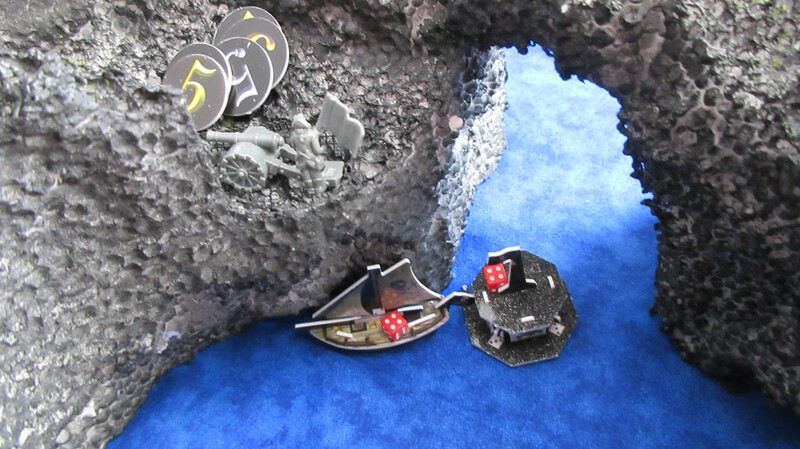 The Cursed fight back, inflicting several hits on the Grand Mountain but still failing most shots with the Silver Coffin. 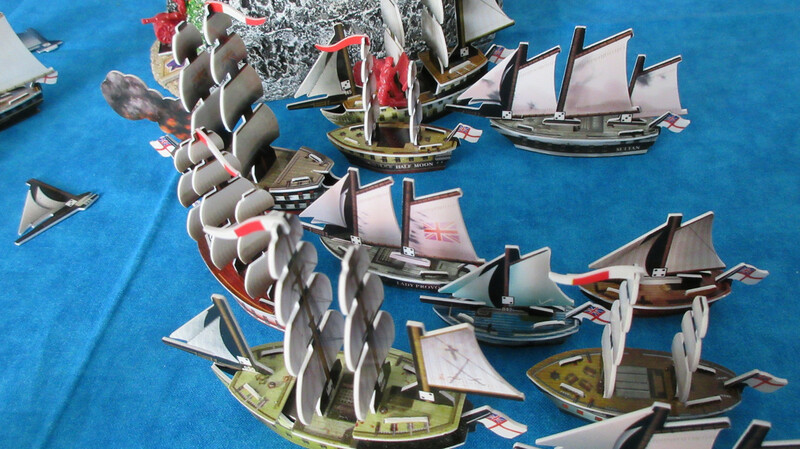 The horde of English ships part, making way for their flagship. 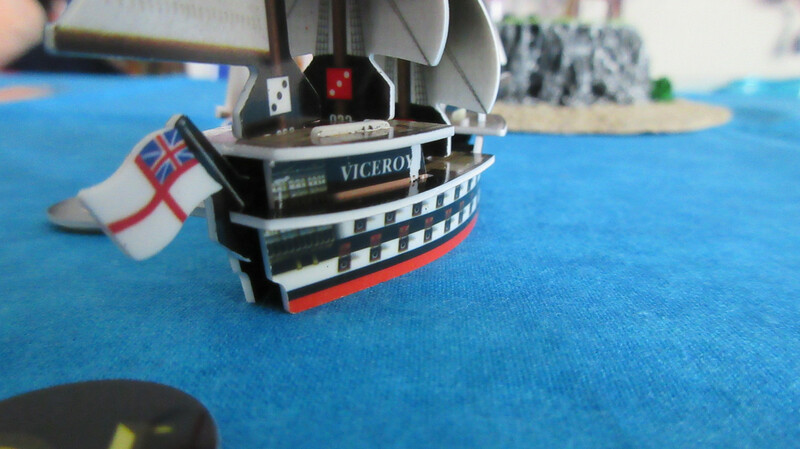 HMS Viceroy is Thomas Gunn’s favorite, and is abandoning operations at Diamond Rock in a desperate attempt to get home. 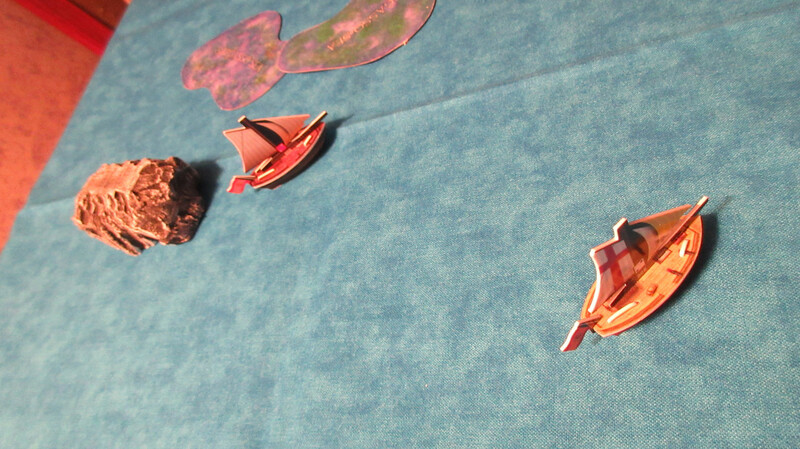 The concerned sailors aboard the other ships look on helplessly. 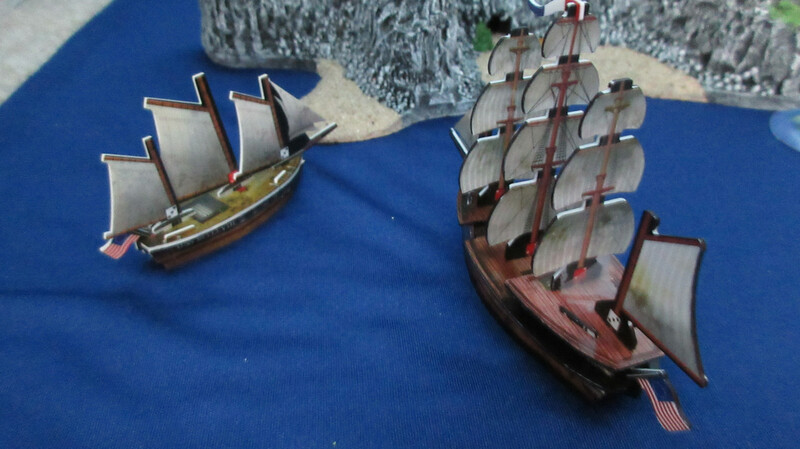 In fact, the Viceroy should have two fire masts here – I took the foremast out but forgot to add the fire. The English get some measure of revenge! 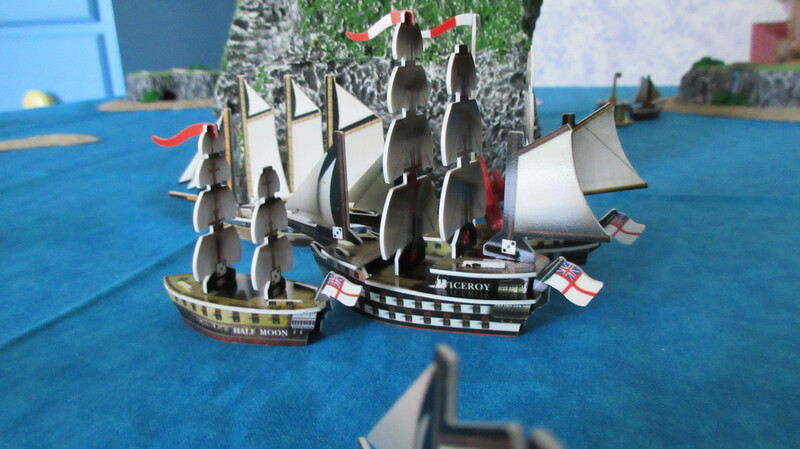 The flotilla shoots and is followed by HMS Durham, sending three masts overboard in an effective display of English gunnery! 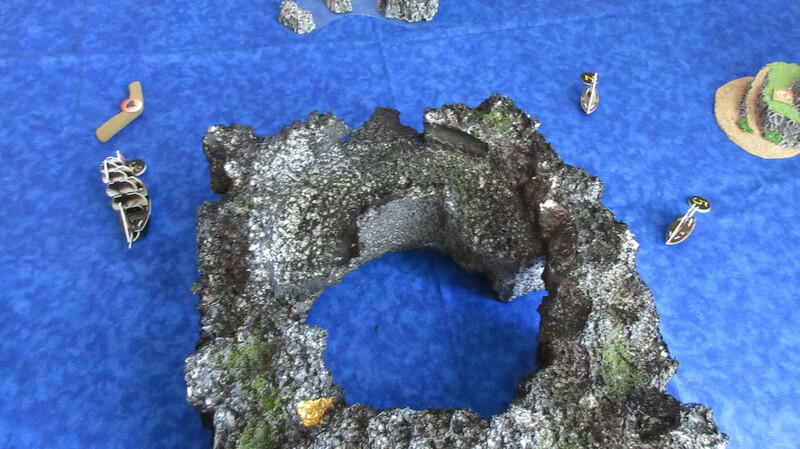 In the first army unit shoot action of the game, one of the 24 pounders on the beach of Diamond Rock dealt the sixth and final hit of the turn! An ominous sight: hearing the gunfire, HMS London rounds the rock. Seeing their inspirational leader in danger, the English troops are spurred onward by a desire to fulfill Gunn’s wishes. The ladder on top of Diamond Rock is lowered into position to reach the cave halfway up. 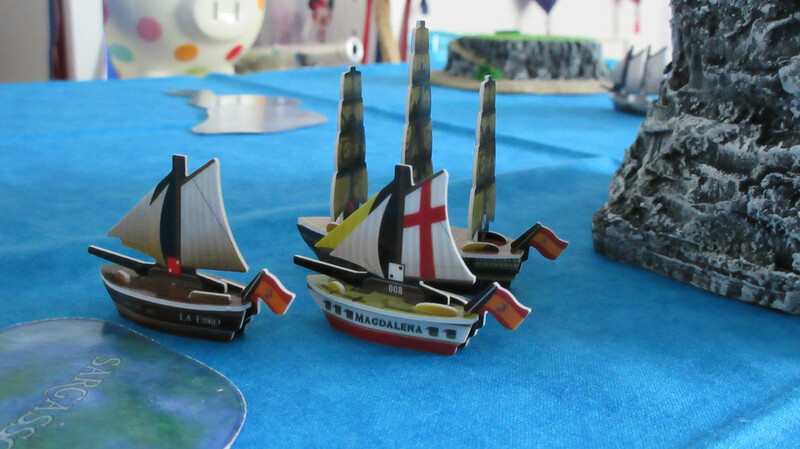 Fearing the worst, Spain’s resource ships sail as far away from the London as possible. 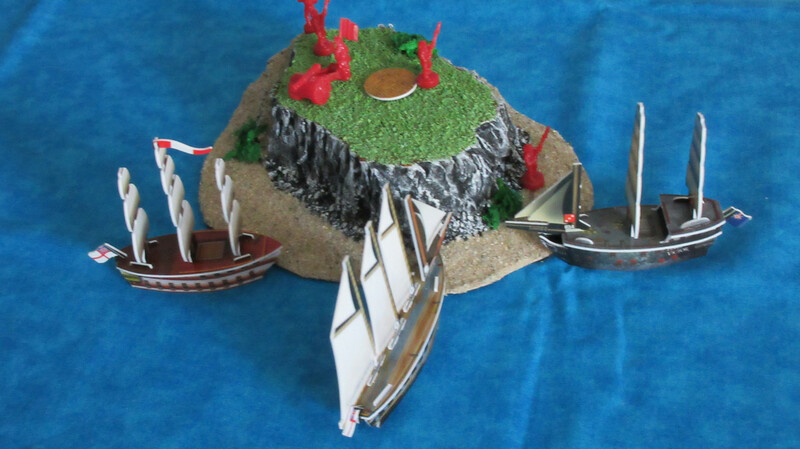 The Ebro drops off her flotilla so it can guard Paradise Island. The Aguila and Rafael are content to go the long way if it means they get home safely. 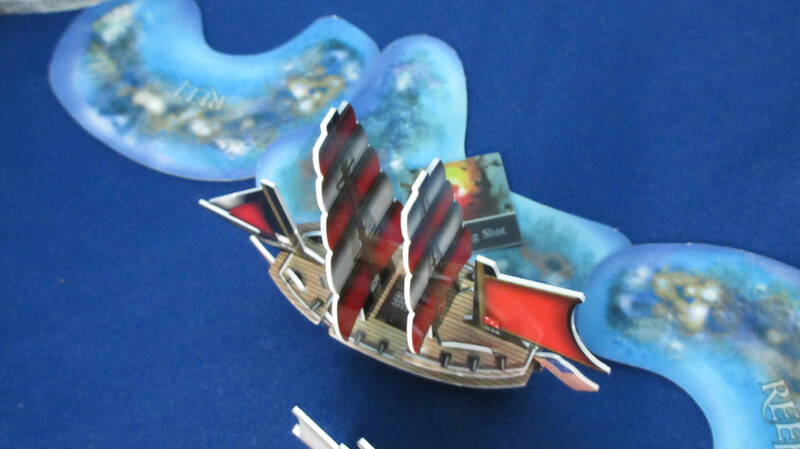 The San Estaban was originally going to join the Matthias Vospero in the attack, but with the MV taking major damage, the Spanish decided to flee. 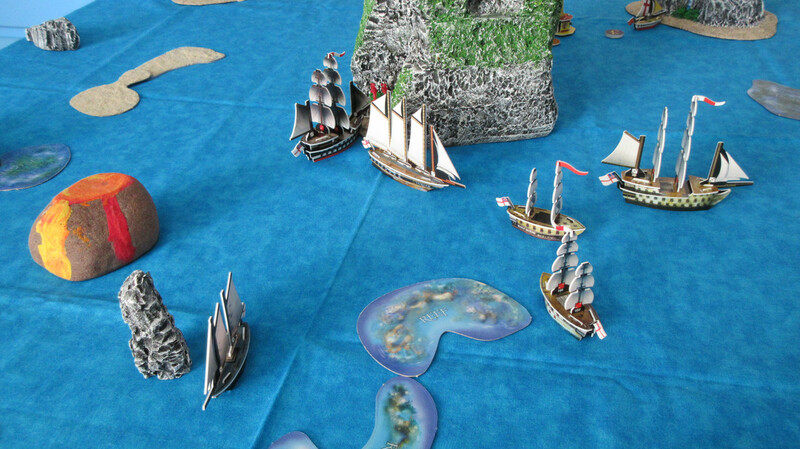 One of the widest shots of the game so far, with action finally erupting in the Caribbean. After yet another failure, the Americans buy more exploding shot. 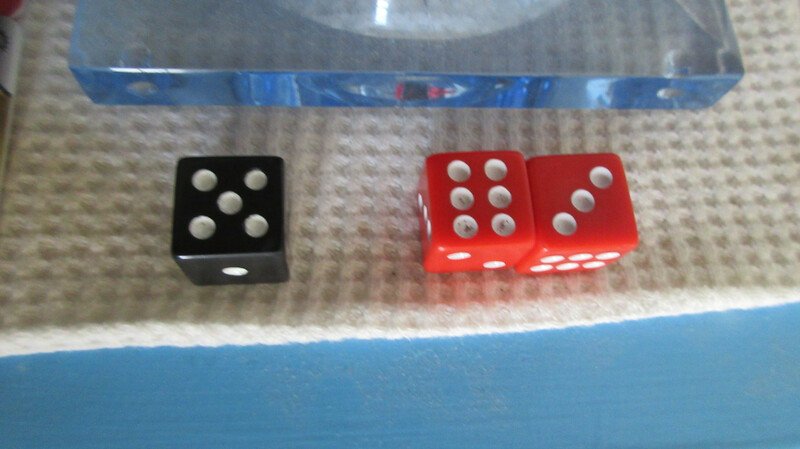 The third attempt was their third 3 in a row, meaning they have just missed rolling the 4-6 every time. 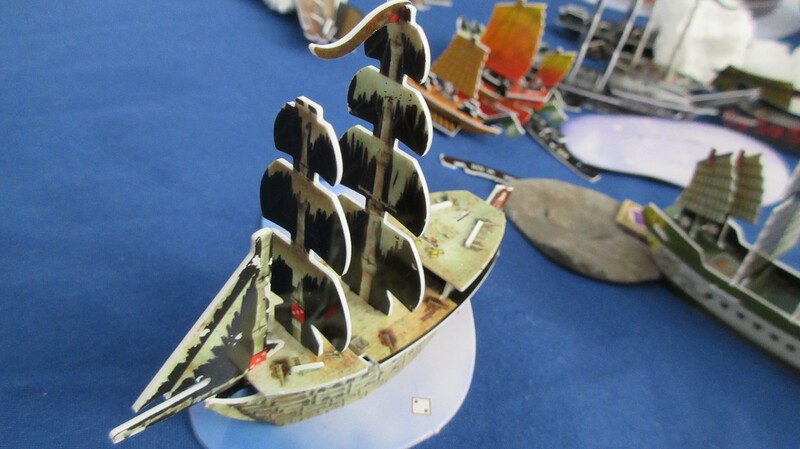 Preble orders the Colonial Trader to turn around and go check on the southern islands to see if they’re producing anything valuable. Last turn of the day! With one more turn until another resource change, I was determined to finish strong and complete an entire resource duration round in one day. 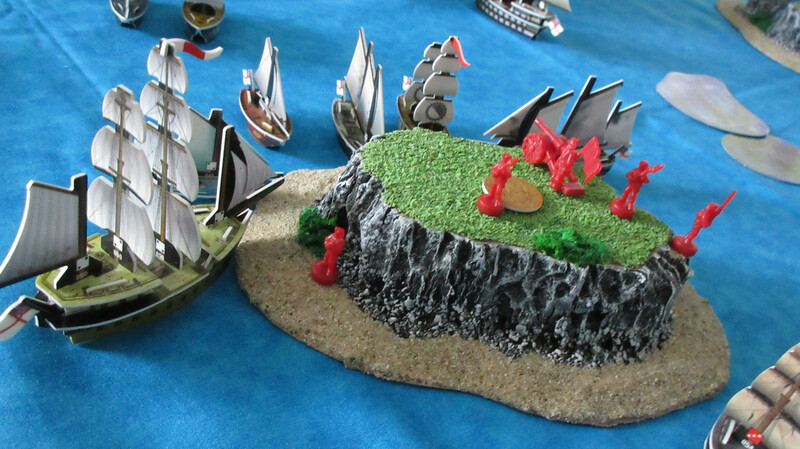 With the Widowmaker flotilla nearby, the Cutlass guards the gold island and has orders to fire upon the gold ship and capture it if possible. Mission has gotten over his shock and wants that ship for himself! 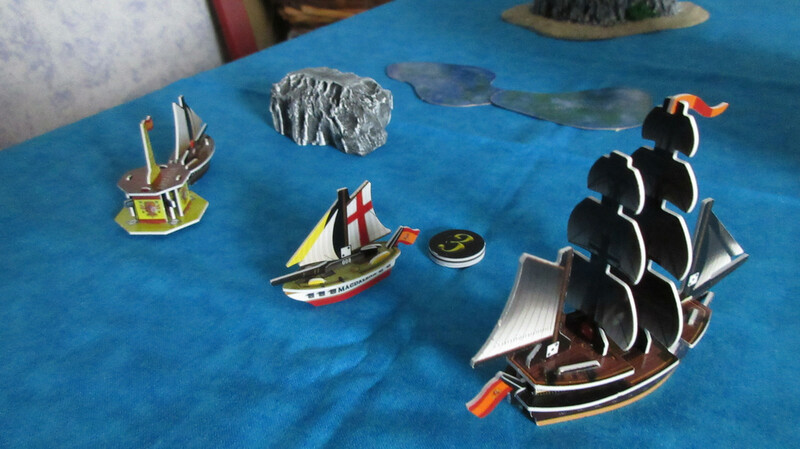 Mission’s latest mission was to get the Widowmaker out to a spot where it can defend Pirate territory but not be a hindrance to fleet logistics (aka getting in the way of move actions). He is now satisfied with its positioning. He then signals Bartholomew Roberts on the Royal Rover to return to the kingdom with all haste. The two pirates are planning to hire someone with great capabilities. 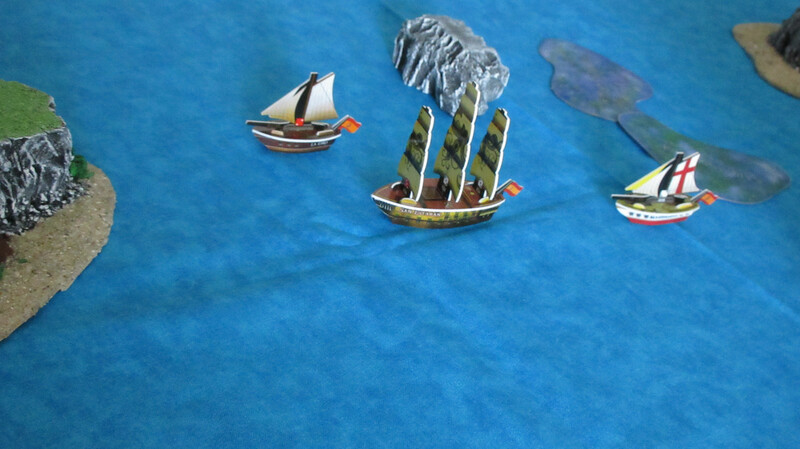 After sinking the Freedom, the Pirates go back to their usual business of gathering resources. The Smiling Jim receives an AA from Jean Laffite in order to move deep within the kingdom to repair. 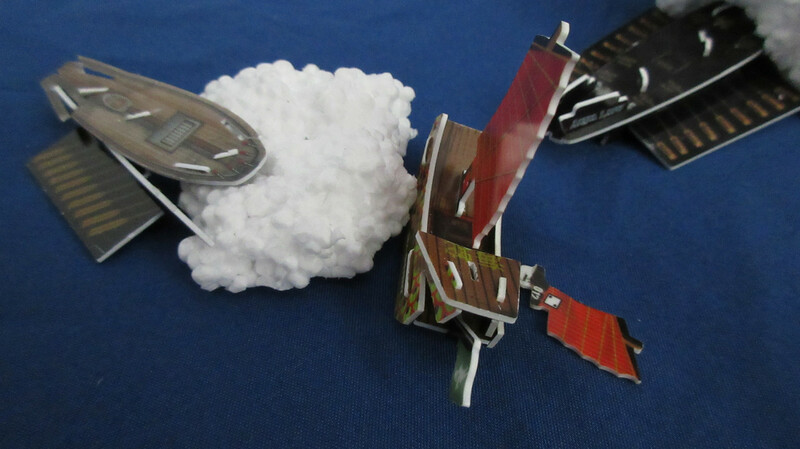 As you could expect, ships can repair their partial damage as regular repair actions. However, if a ship is missing masts it can also repair those as normal. 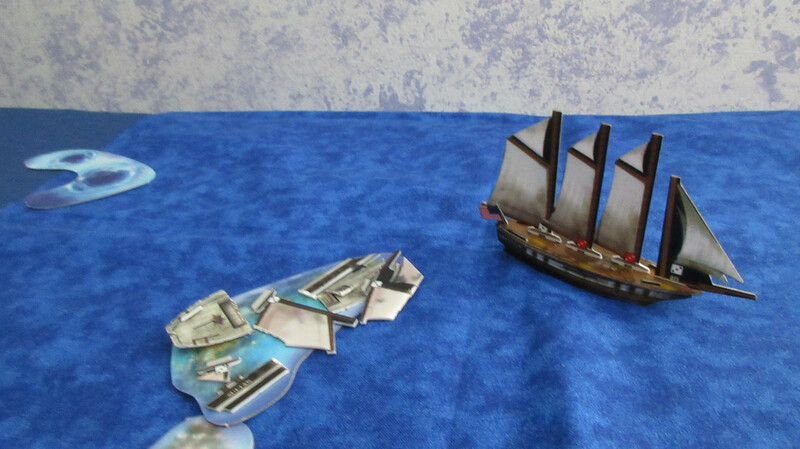 The flotilla can repair its damage as well without having to lose its flag first. 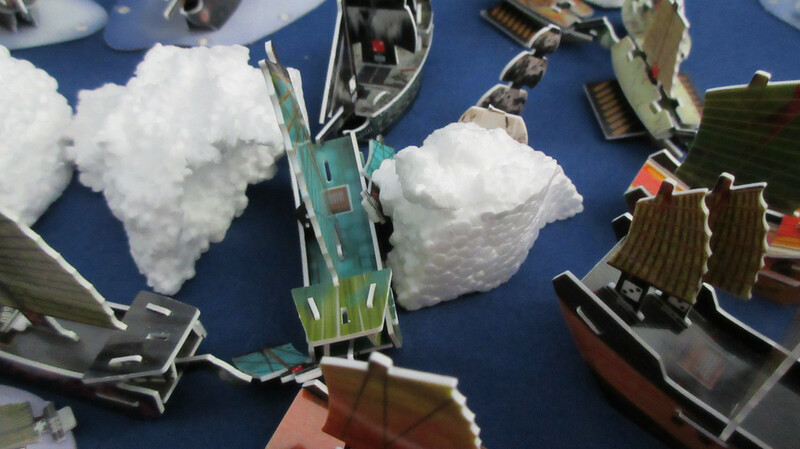 Damaged JR ships make their way past stunned resource runners. The realities of war and combat become evident. At the right, note that the Divine Wind has repaired and is returning to the northwest area. A truly horrendous scene, with bodies and blood everywhere. Never had a Jade Rebellion ship met a more gruesome end. 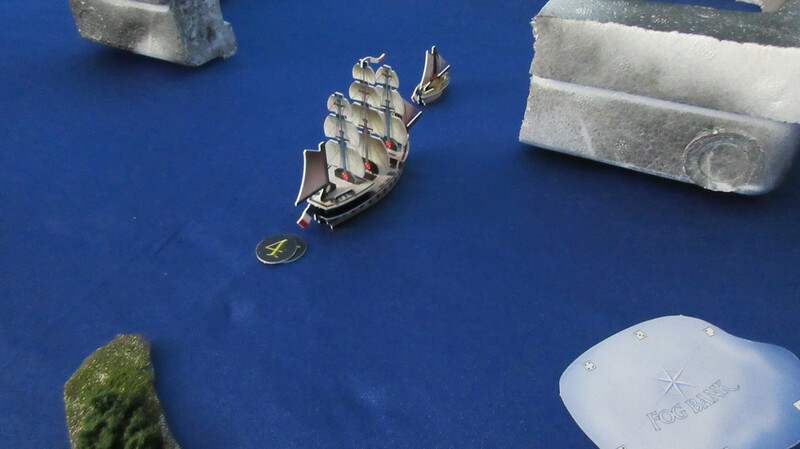 An icewreck hits the Muninn! Notice the Clear Wind in her new state at the left. Complete and utter disaster for the English!! 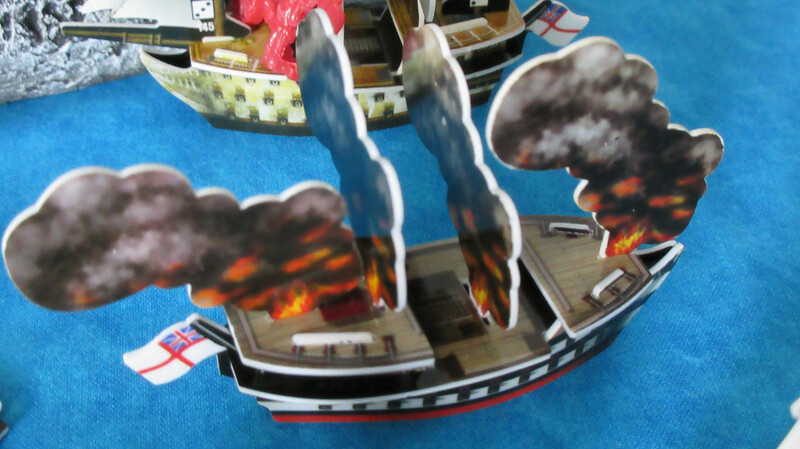 In a total shock, both fire mast rolls were 2’s, resulting in the ship becoming totally engulfed by the flames! Gunn’s flagship will be no more. 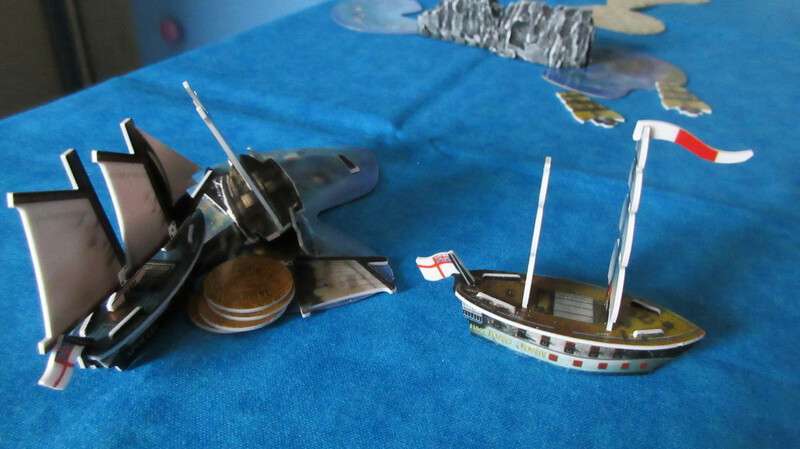 Not only did this stun the English fleet, it was also an utter shock to me. 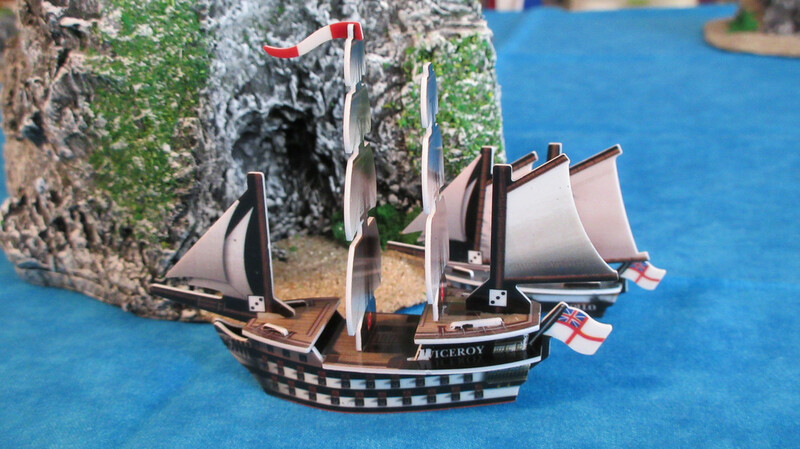 The Viceroy was the English flagship and the first ship selected for their fleet, and even this game possibly. She was Gunn’s favorite as well as being one of the most recent English acquisitions in my collection. After just two lucky hits from the Matthias Vospero, she was set alight, and now has rolled badly 3 times in a row to be completely doomed. The thick smoke nearly obscures HMS Sultan, who is trying to reach Diamond Rock and unload some brand new artillery units. 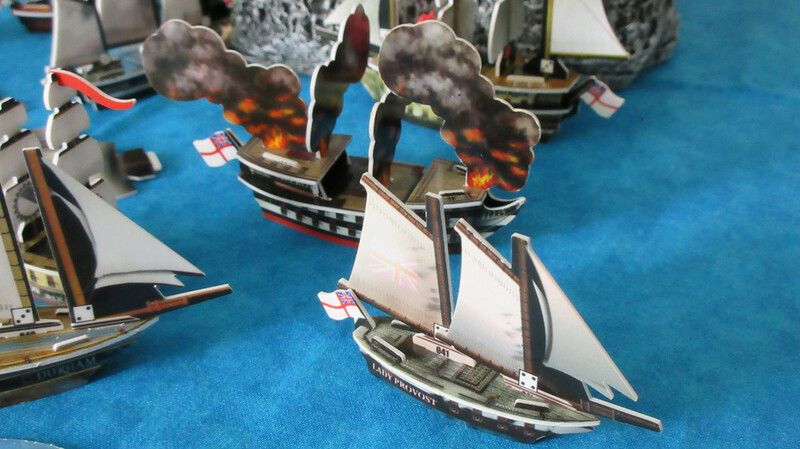 The English vow revenge, with HMS Bretwalda replacing the Viceroy and Durham at the scene of the skirmish. 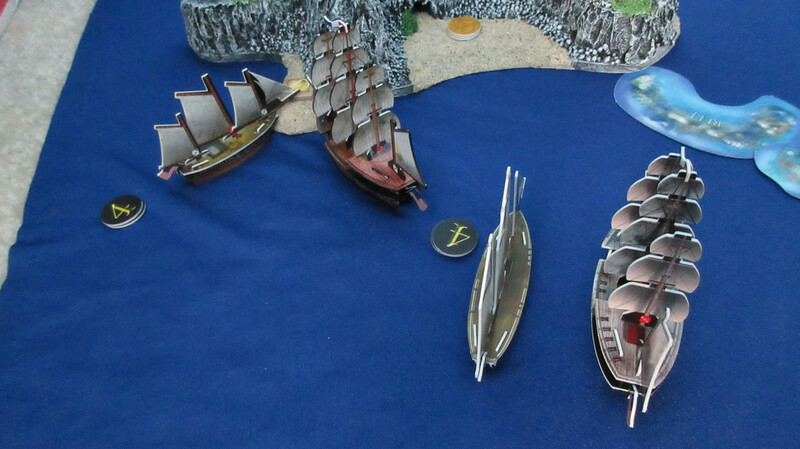 Both Spanish gunships hurry home to repair their damages, but clearly a nasty conflict is likely just beginning. The Spanish had won a major upset, but also made the English extremely angry. Knowing the resources will change again soon, France is simply busy getting as many luxuries AND fish as possible. A familiar scene, as the Argo loads exploding shot in order to supply the Congress. In a fitting end to this report, Ralph David’s journey is NOT at an end! His Eternal keyword has warped the Freedom back home. I almost changed the Eternal keyword to be less powerful in this game, but I decided I didn’t want to start messing with keywords in addition to changing many of the core rules. 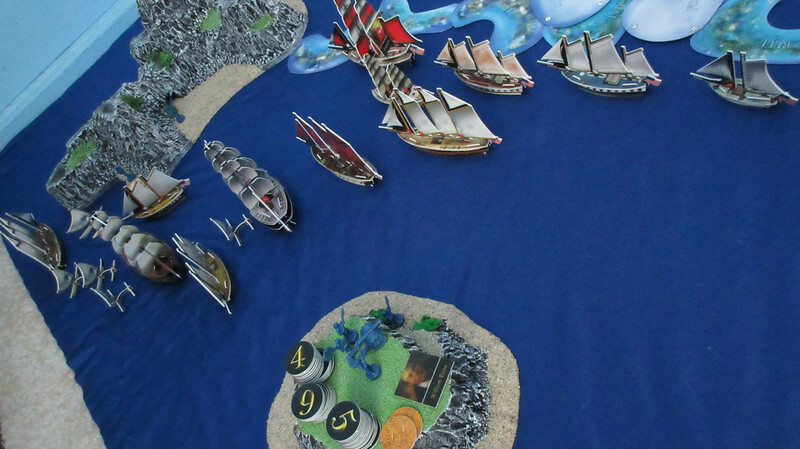 A very interesting day of Pirating! 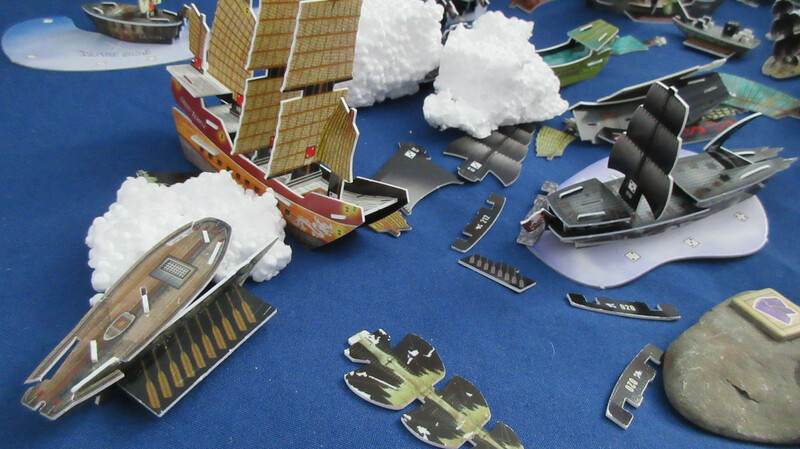 Clearly the bloodiest day yet, with conflicts erupting in the Sea of Allost and the Caribbean. 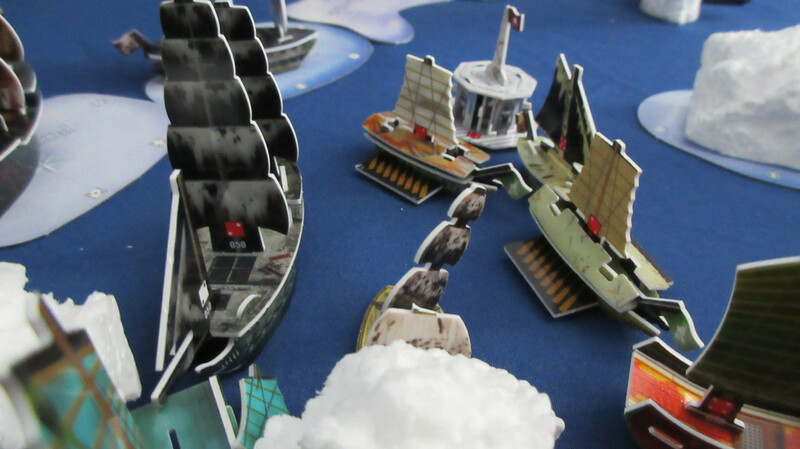 The arrival of some Cursed warships is an ill omen, while the rash actions of Ralph David and the lucky heroics of the Matthias Vospero provided some truly stunning and bizarre moments. So many questions remain unanswered. Who knows what the future holds? Well, here is the latest ship and point count. 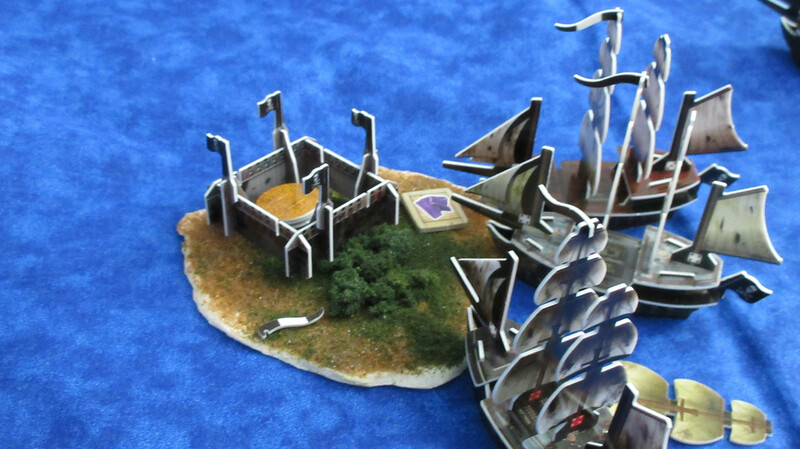 I have decided to just count deckplate areas, so this includes ships and crew but not army units and things on home islands. 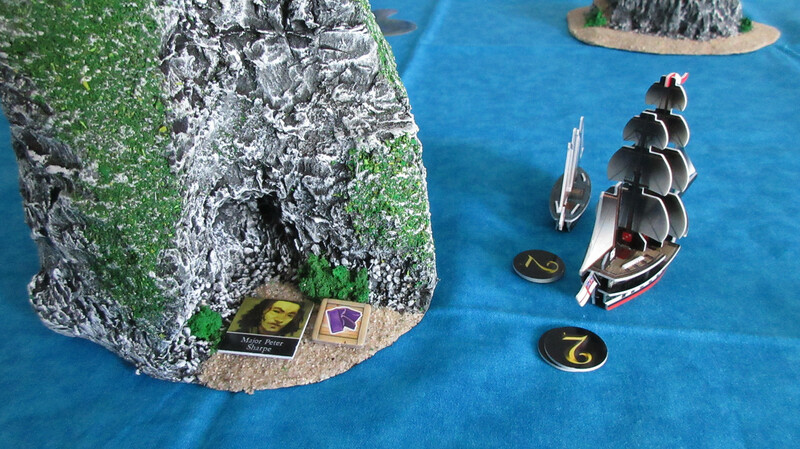 The Jade Rebels climb into the lead, but most of the other factions are quite impressive as well. -Which faction(s) are you rooting for? A warning: I will not be able to play nearly this much over the next 4 or so days. However I’d like to play at least one turn per day and report on the developments as they happen. I may be able to ramp things up next Wednesday-Friday again like I did this week. Turn 31 was played today! 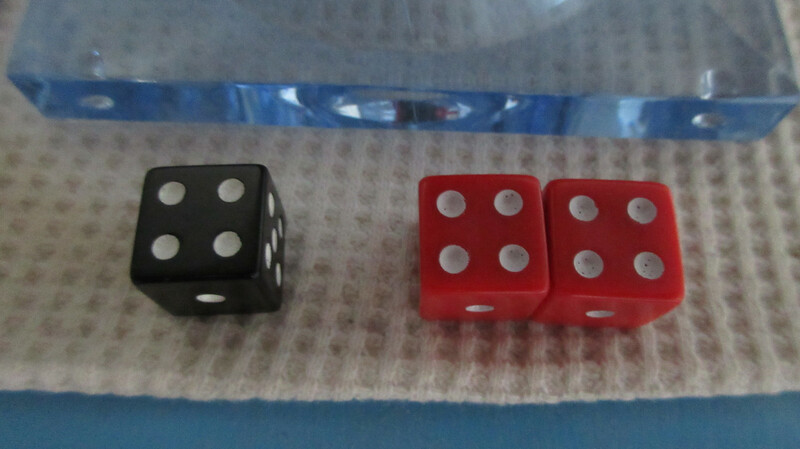 Indeed, the first 4 resource rolls came to exactly 30 turns total. My Economy Edition game peaked in terms of points on Turn 33, and only lasted 45 turns, meaning that not only is this game progressing at a slower pace points-wise (but a faster pace in terms of turns obviously, with 22 happening in the last 3 days lol), but it also has the potential to be LONG in terms of how many turns occur. However, now that the game is well into “huge” territory (1,000+ points), turns slow down considerably and take a long time for just a single turn to be completed. Another resource change was needed! 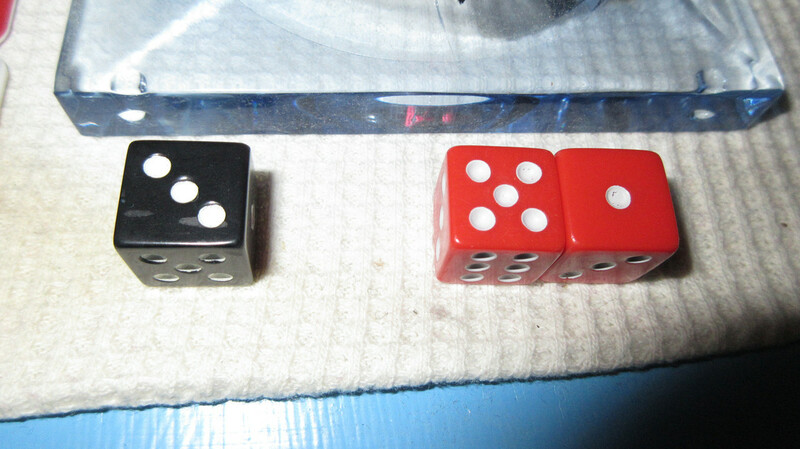 With odd luck, I rolled three 4’s! Metals went from being the least valuable resource to the most valuable! 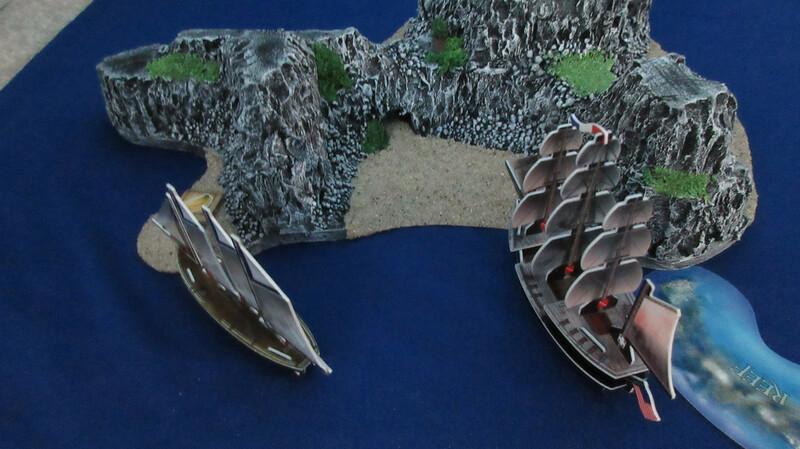 This greatly benefits the Spanish and Pirates, the only factions to have found metals so far. Textiles remained the best overall resource in the game, going from 6 gold to 5 gold, meaning it has always been in the upper half of resource values through all 5 of the first resource changes. Food (fish) fell to a new low of 1, meaning the French and Americans would have to suffer through another drought. 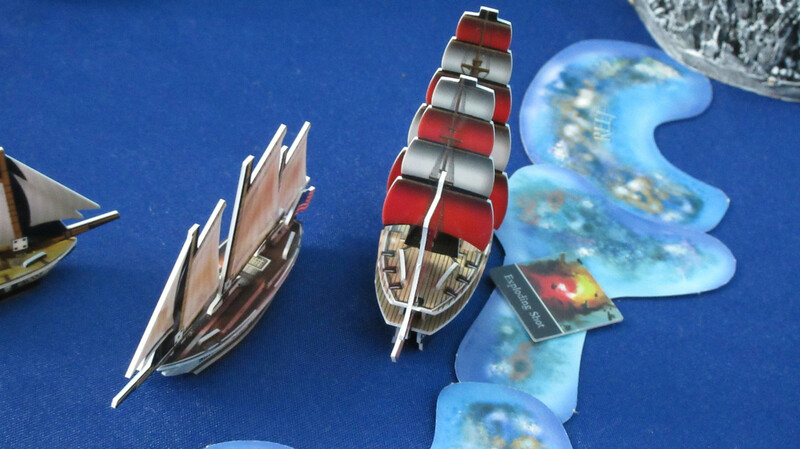 At this point in the game, the duration becomes more important because turns are taking longer and more events happen on each round of turns. 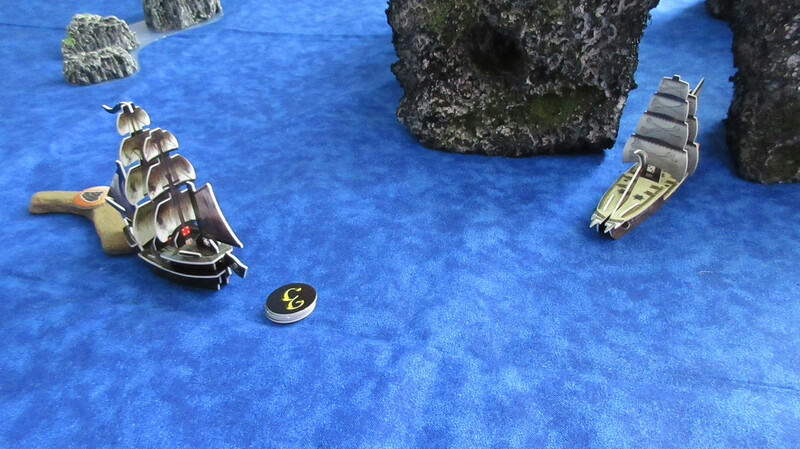 As planned, the Darkhawk II gives a ghost coin to Mission’s flagship, the Crusher. 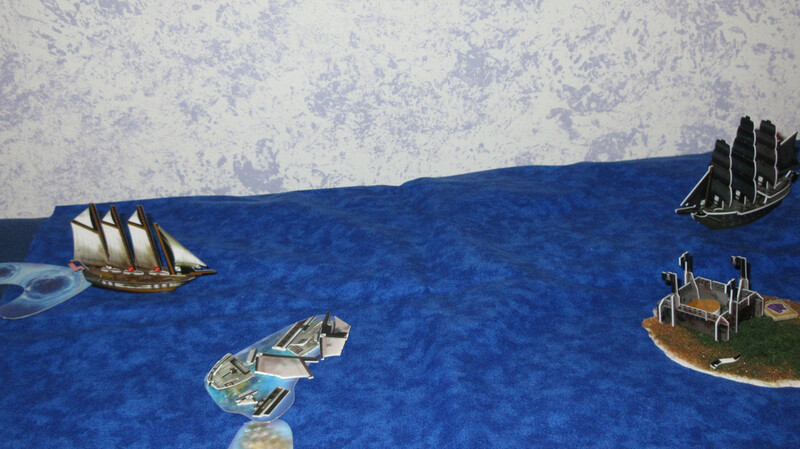 This means that Mission will be able to make the Crusher ghostly whenever he wants as long as the coin is still aboard. 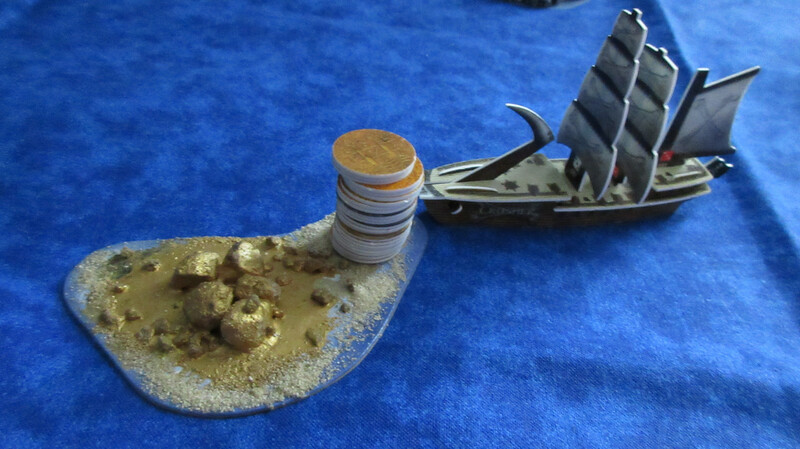 Combining their handful of now-valuable metals with some saved-up gold, the Pirates spend 86 gold! 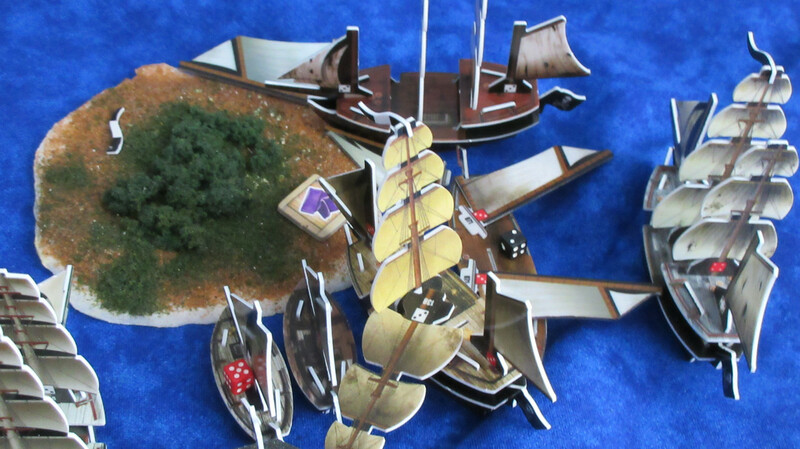 This includes the 18 spent on the fort, but they also launch the Deliverance (with sac captain Havana Black, a helmsman, and oarsmen), Adventure, Paradox, and Nancy Nox. 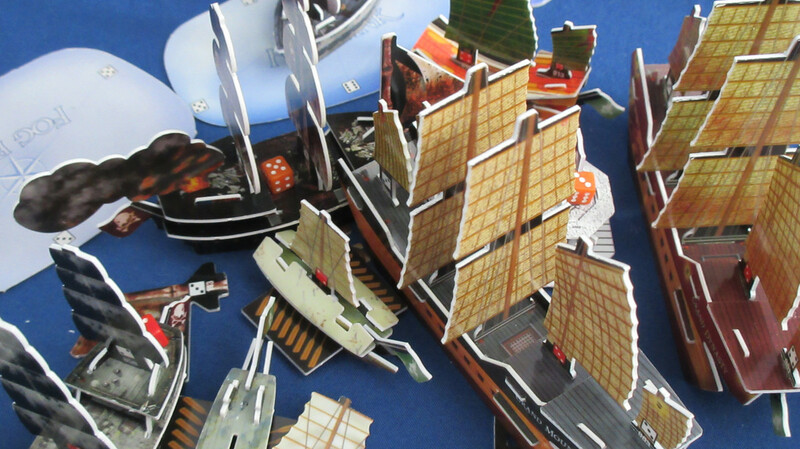 Capacious ships, even with a base move of S, can be pretty valuable in the long run in games like these. 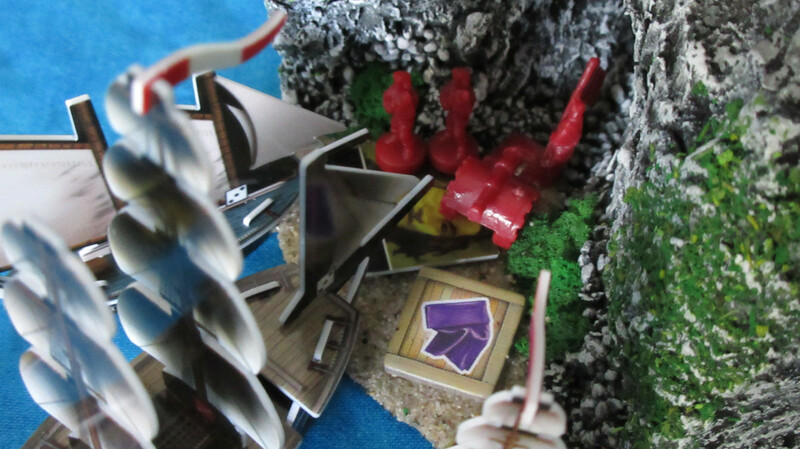 At the bottom of the frame, notice the Smiling Jim and Doombox have moved to a deep point of the kingdom to repair without blocking the entrances for other ships. A wider shot of the general Jade Rebellion situation. 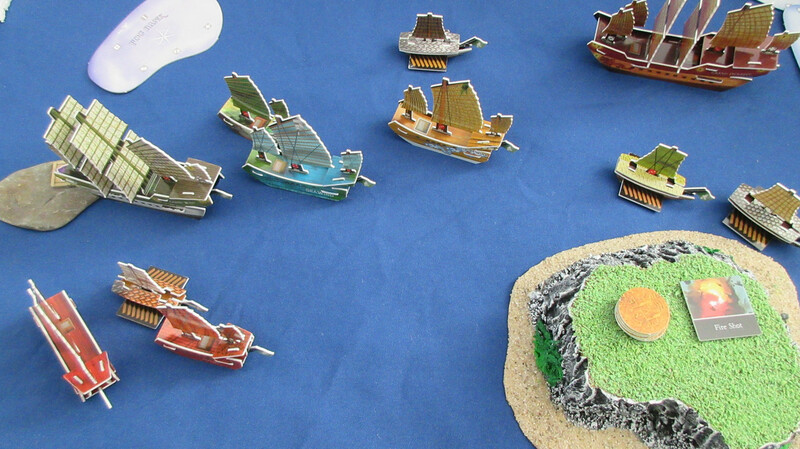 In the left foreground, 3 ships join the textile gatherers in going to the home island, but they are there for repairs. Closeups of the action in the next few pictures! The Grand Temple finally gets a favorable fog roll, and comes out guns blazing! 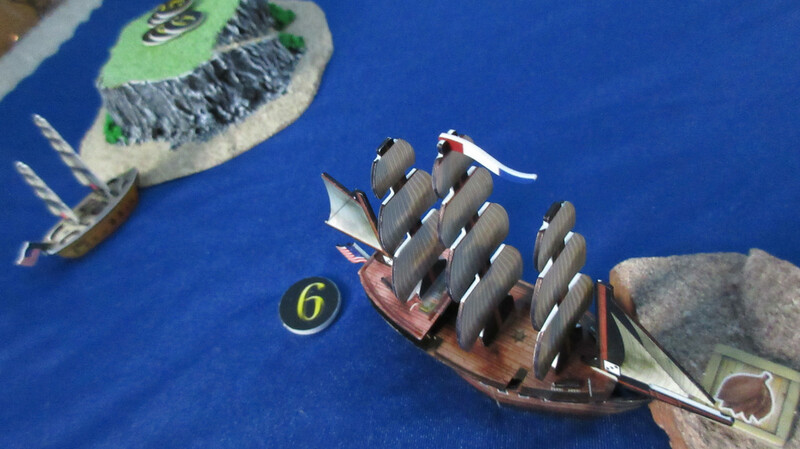 Her shooting is reasonably effective, taking a mast off the Jikininki and Scythe. Smash! 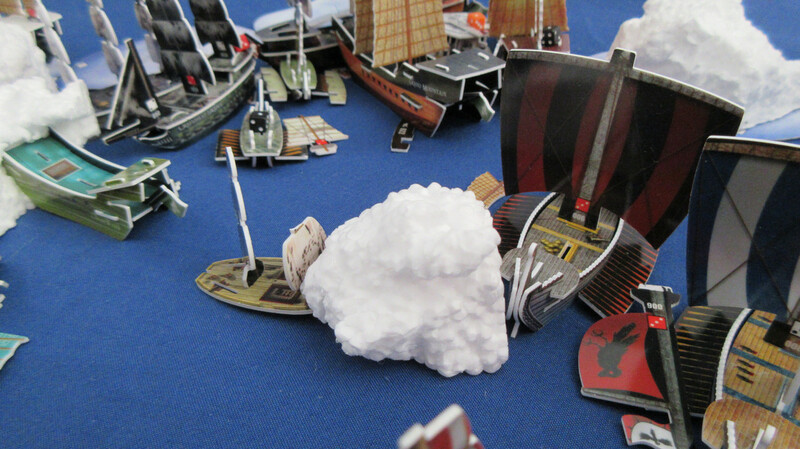 The Beowulf rams an icewreck and breaks the iceberg in two! 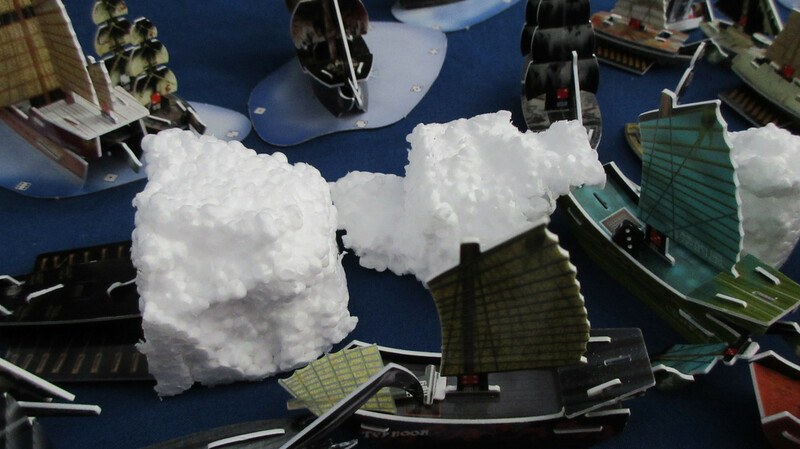 I love how I’m *actually* breaking icebergs! How cool is that! LOL. 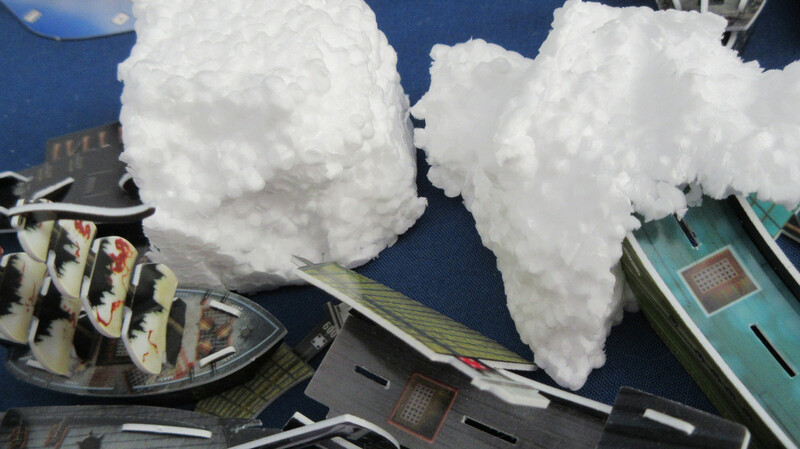 I would definitely suggest that players get some random chunks of foam for use as real icebergs, since they are extremely easy to use (no painting or anything required – just rip some off and literally throw it on your map!) 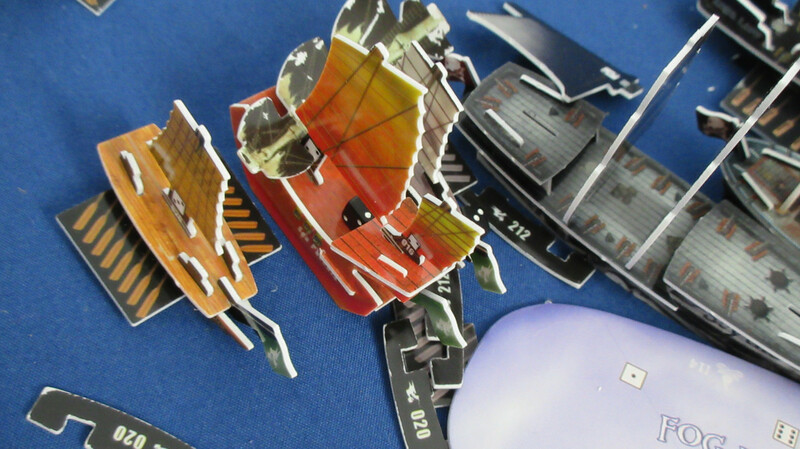 and obviously they look fine and can even be broken when you have icebreakers in play. So practical and awesome! 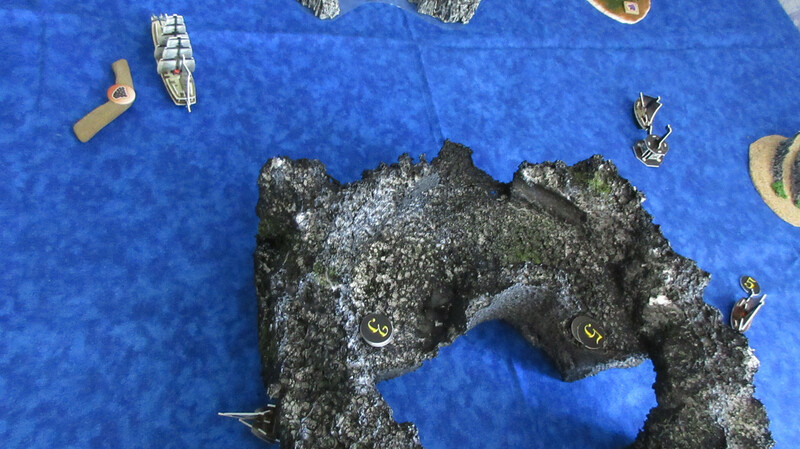 The Muninn makes her entrance! Both shots miss! 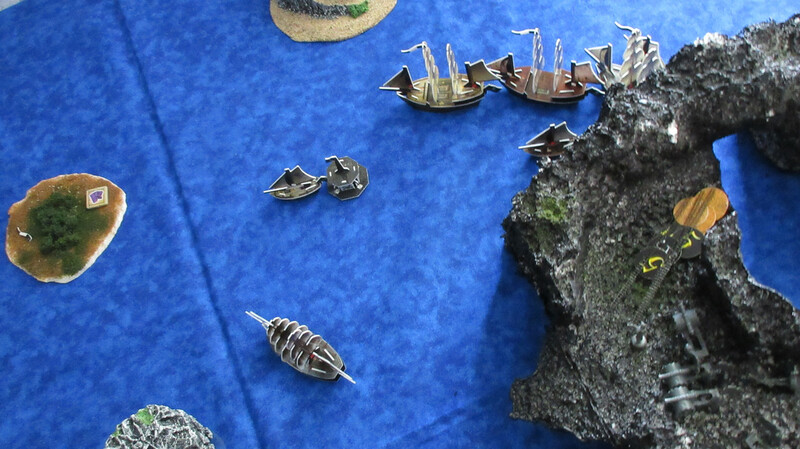 XD However, check out the stuff happening on her starboard side: the Last Hope has been dismasted, and the Silver Coffin was sunk! 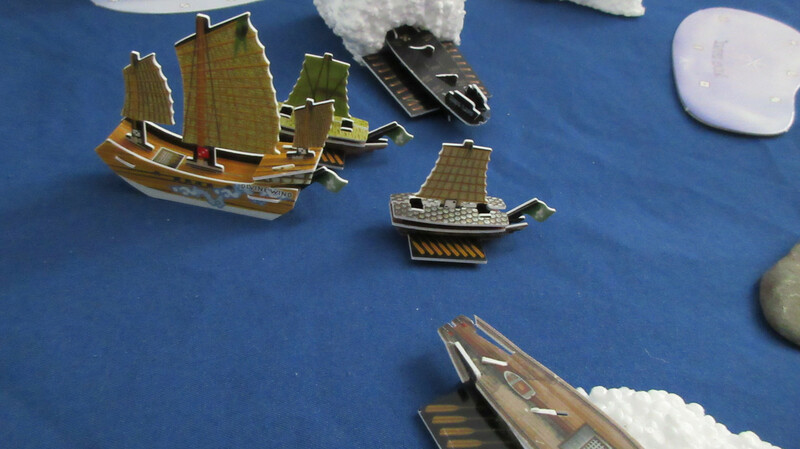 I should have mentioned in the first post that not only do forts and flotillas not follow the no-duplicates rule, they also can be relaunched as many times as a faction wants, unlike regular ships. 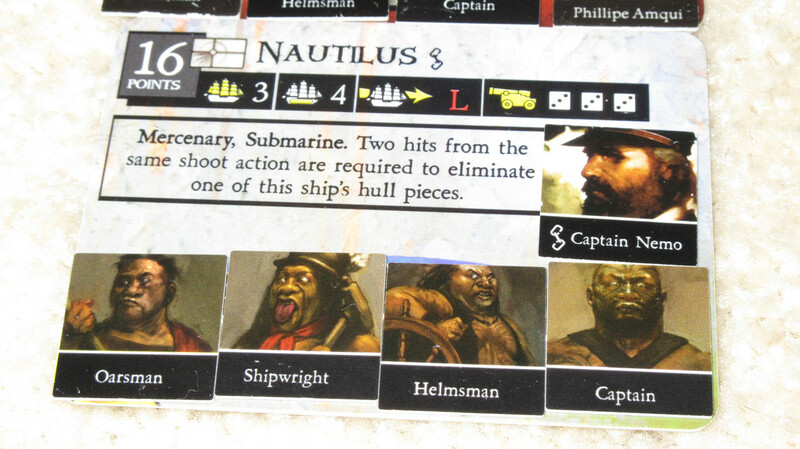 Named crew must be unique, but can be rehired for different versions if the first version is eliminated or removed. 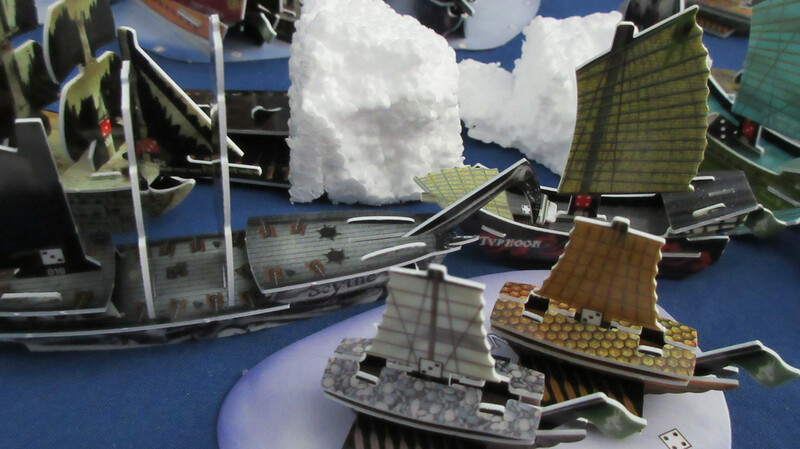 Clearly the Jade Rebellion is winning their battle against their strange foes, but it comes with a cost: the Clear Wind and Typhoon are lost, and major repairs will be necessary for the battle fleet to return to full strength. 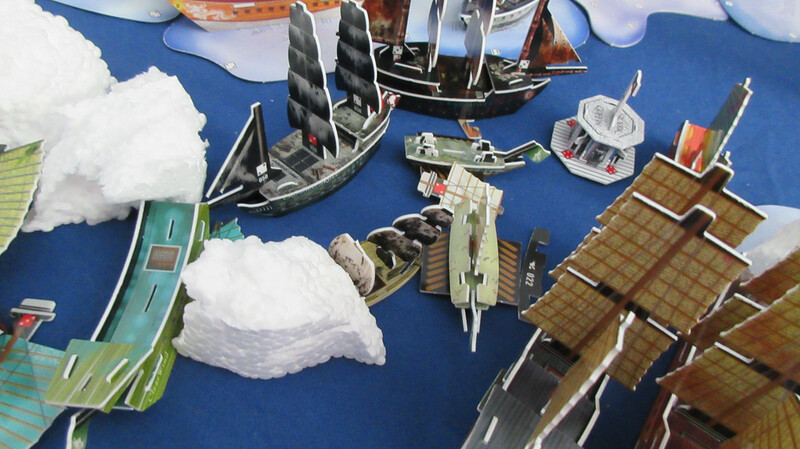 At the lower left the Polaris has rammed the shipwreck stuck in the iceberg, mostly in a futile attempt to allow the Divine Wind to shoot at the Scythe and/or get to the dismasted Glorious Treasure. What a messy scene! A seemingly possessed icewreck rams the Grand Temple! 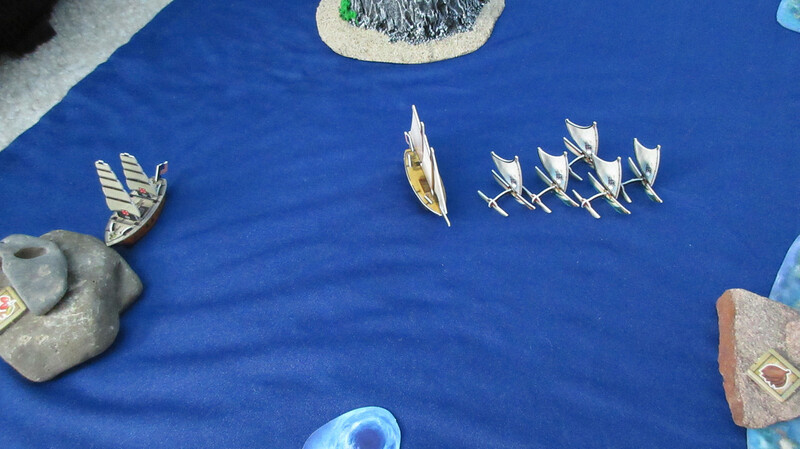 However, notice that the Cursed vessels that came out of nowhere appear to be disappearing just as quickly…. 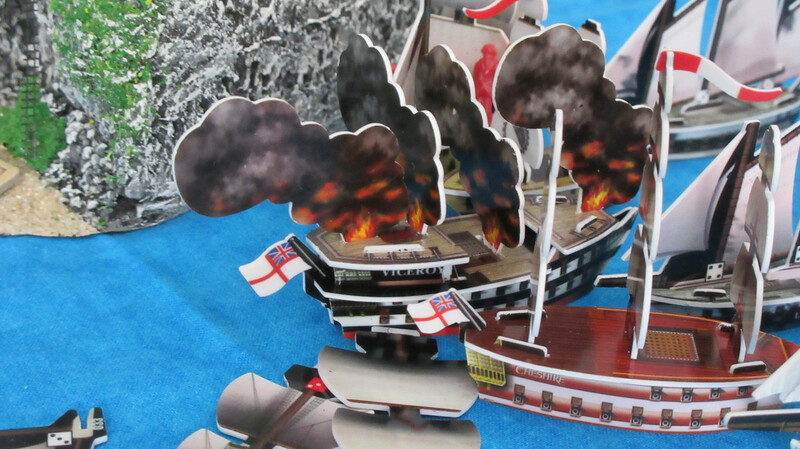 A sad scene, as HMS Viceroy burns to the waterline. 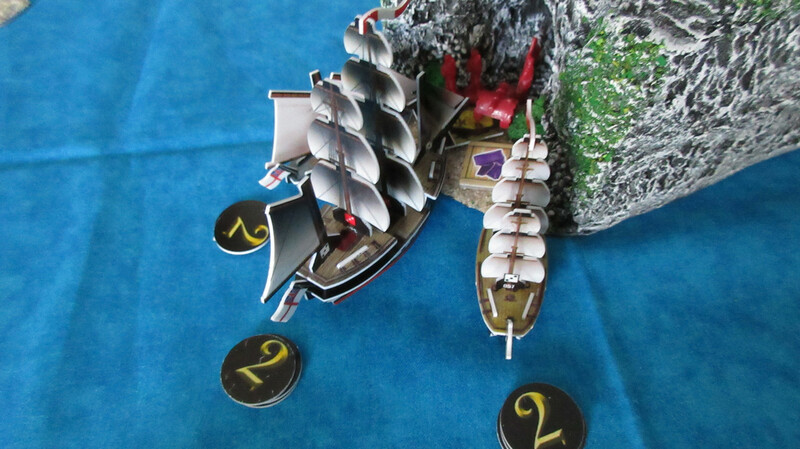 The Lady Provost rescues Admiral Thomas Gunn and the Burma’s captain. And she goes under. 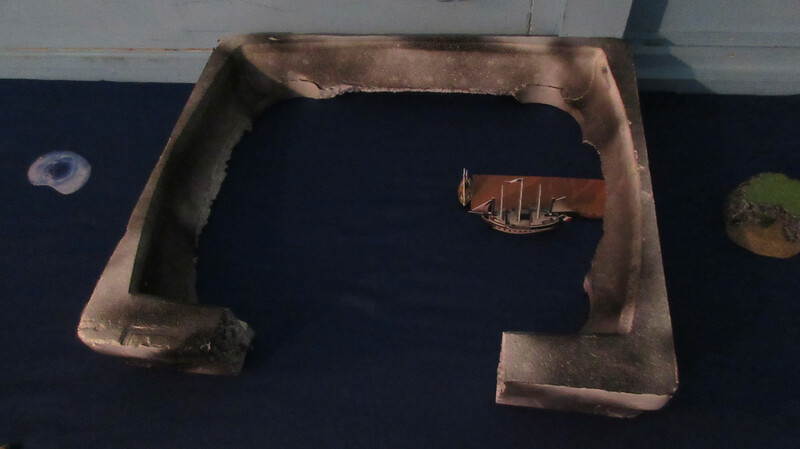 England’s flagship is no more. 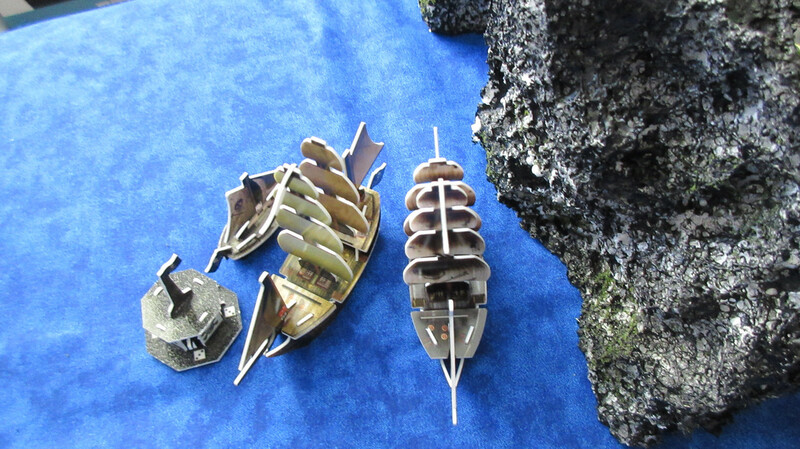 HMS Sultan unloads two artillery units at Diamond Rock, which is now even more crowded! 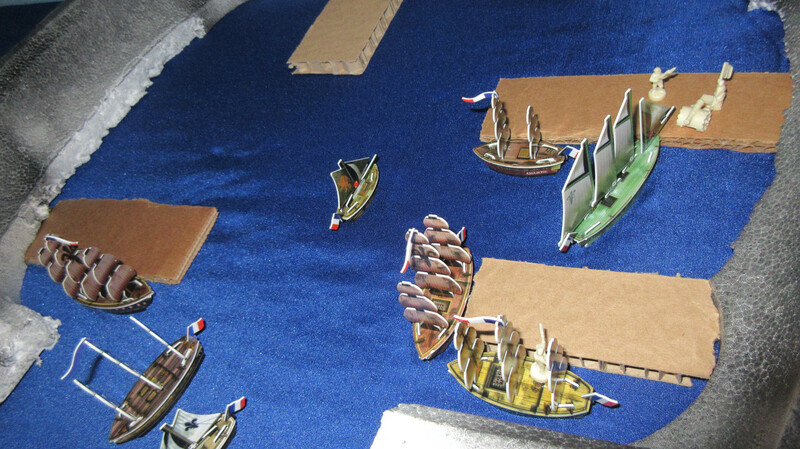 Sloops sail in to grab textiles, while the London and Bretwalda patrol the waters, scanning the horizon for hostile Spaniards. Saddened but vengeful, Thomas Gunn needs a new flagship. 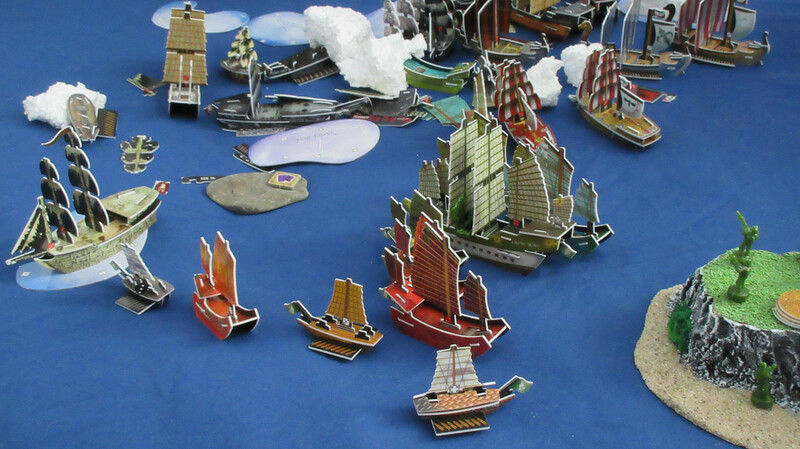 He considers a wide variety of options, mostly 5 masted juggernauts. 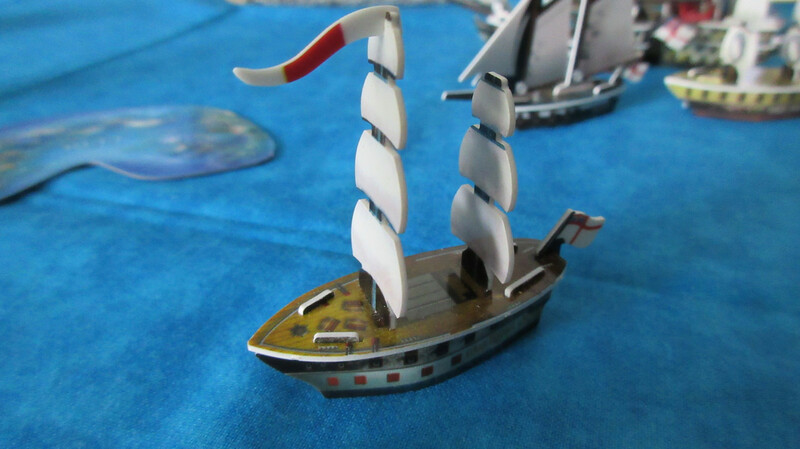 In the end, I couldn’t resist choosing the perfect ship for the situation: HMS Lord Algernon! How’s that for the perfect flavor text, eh? There she is! What a beauty! 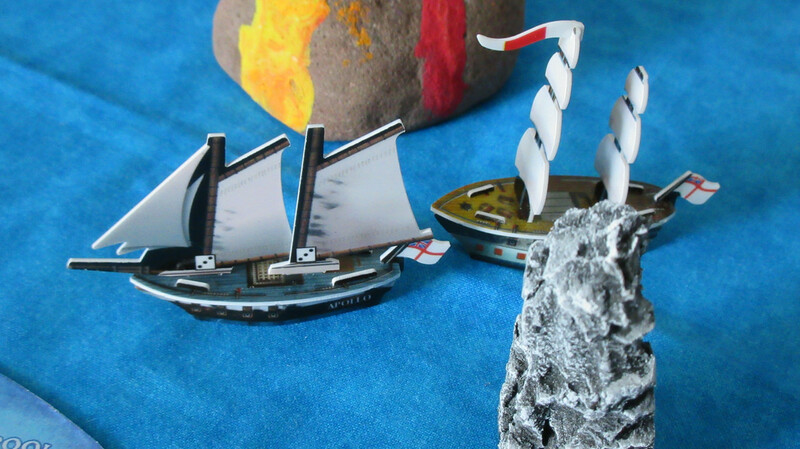 HMS Lord Algernon was my most-wanted ship for many years before I acquired her in 2011. She has been my favorite ship since then. Not for gameplay necessarily, although I love how her armament, speed, and ability are reminiscent of what real ships-of-the-line would be like in this game. 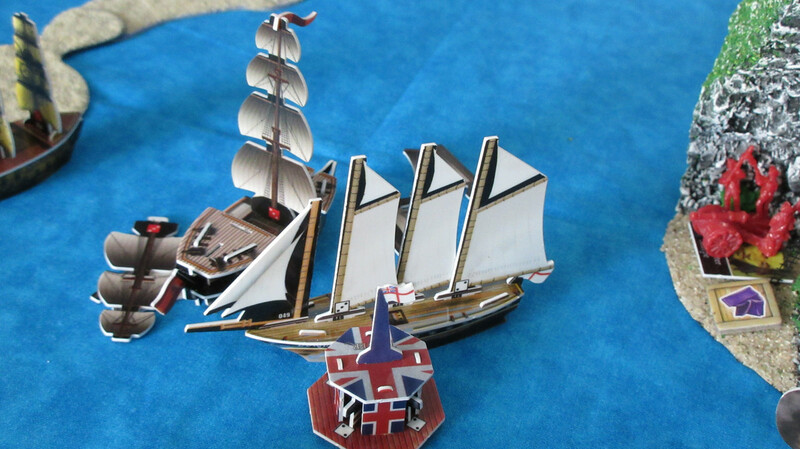 She looks more similar to HMS Victory and other Royal Navy flagships than any ship in the game. Due to somewhat lackluster in-game stats, and my extreme cautiousness in handling my favorites, she has barely ever been used in my games, which is a rarity for me in general since I play so much and love using different ships than what I’ve used in the past. However, it is time she gained some experience! Too long has she sat in her box in perfect condition! 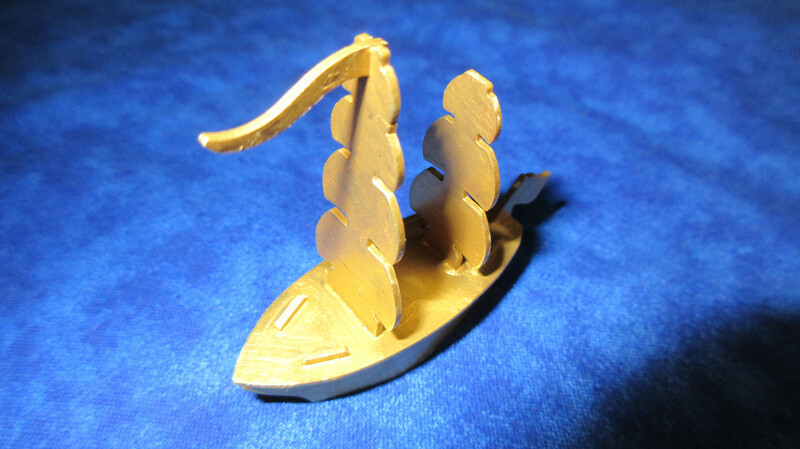 HMS Lord Algernon will set sail!! My favorite ship in the game. 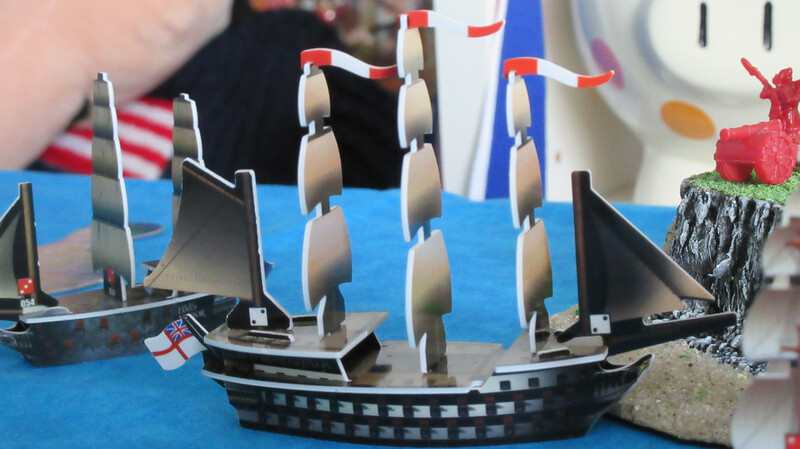 Here she is in all her glory as England’s new flagship. I also think this is the perfect situation for her, as I hope to make this game my grandest and most epic personal campaign game EVER. Only such an epic would call for a ship like this. 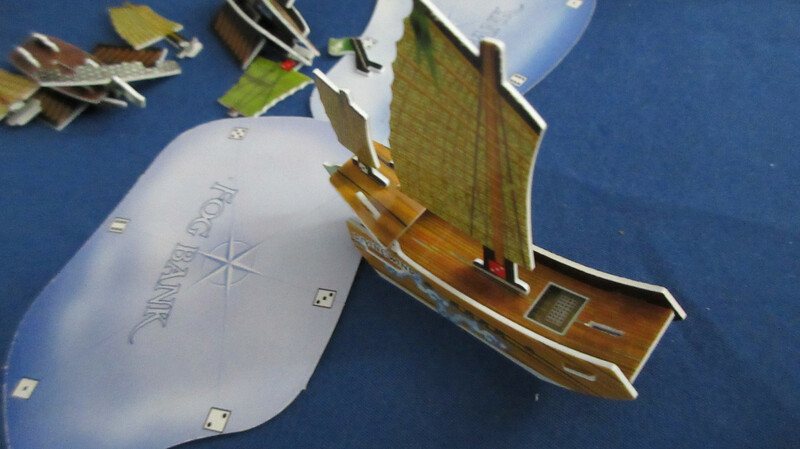 It is fitting that she appear at such an amazing time in my Pirates CSG experience, with so much moreamazing stuff to come in this game of Command the Oceans! She will be crewed by Thomas Gunn (once he arrives from the Lady Provost), LE Griffin, a firepot specialist, and an oarsman. 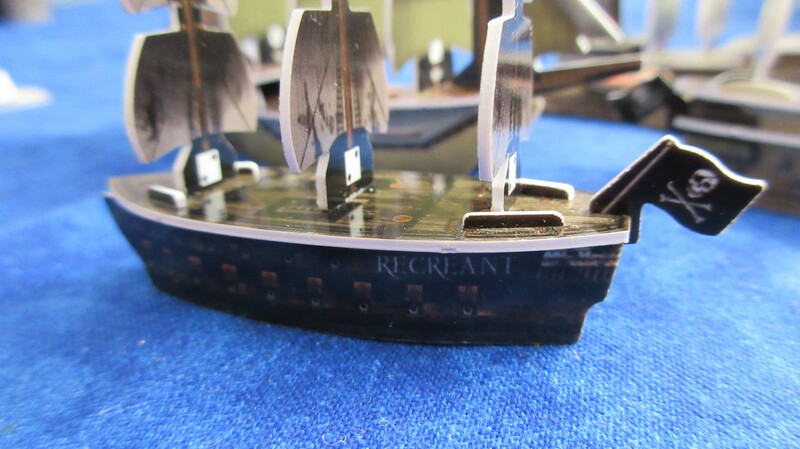 In this way, she will be capable of S+S+S speed with rank-1 cannons firing firepots and boasting her defensive ability along with the oarsman for protection against capture and crew elimination. HERE WE GO!! The Spanish go from despondent and weak to excited and rich in just a couple turns! 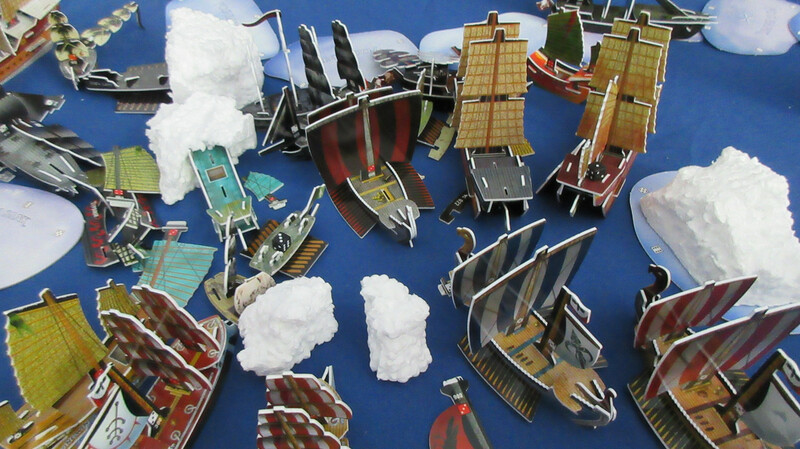 With metals skyrocketing in value from 1 to 6, they spent a windfall in gold to get 78 points’ worth of stuff!! 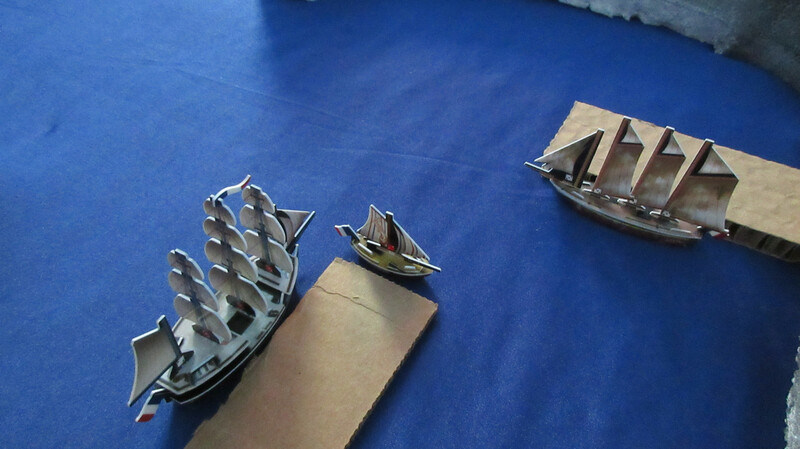 From left to right, the additions are the San Francisco, Alquimista, Diablo flotilla, and La Tartessos. The San Estaban and Matthias Vospero are busy repairing. 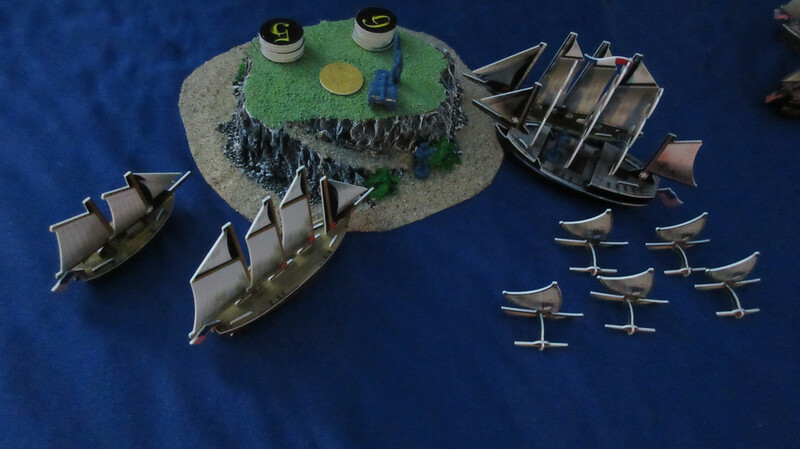 Spending a whopping 30 gold, the Spanish make a huge move and build their best fort, Fortaleza Dorada, on Paradise Island! 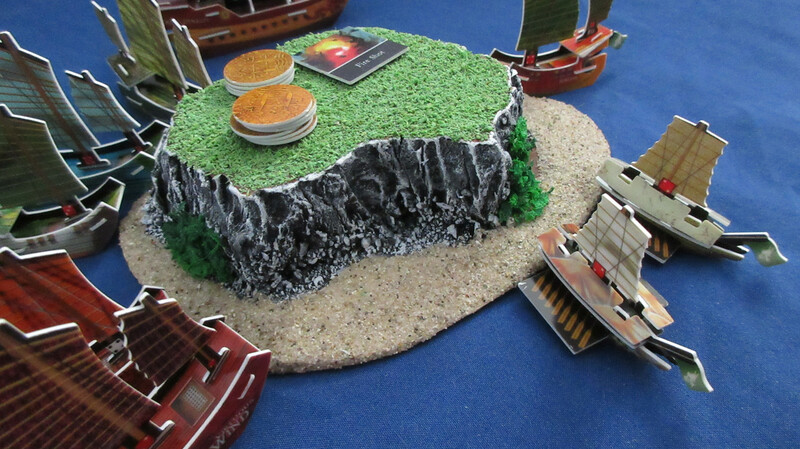 This gives them sole control over the island’s now-valuable metals, not to mention the immense pile of gold courtesy of the Gold ship! Looks like paradise to me! 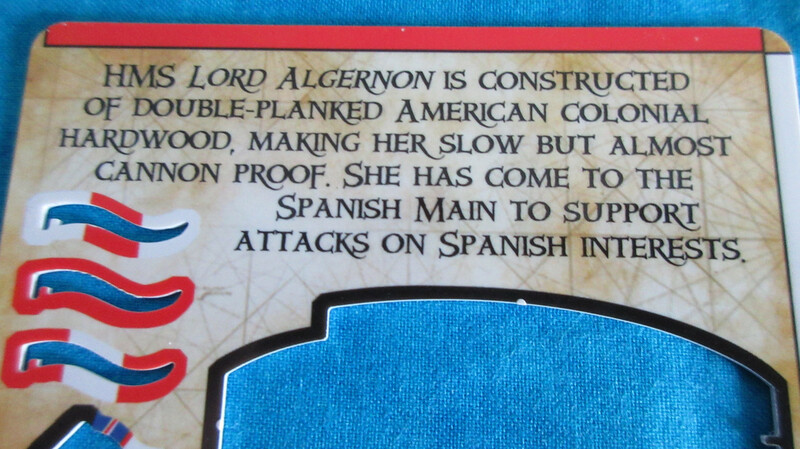 Once again, just insanely perfect flavor text: The Spanish claim it doesn’t exist. Yet natives can be persuaded to speak of the “Golden Fortress,” the apparent source of the Spanish gold flowing along the Crimson Coast. O_O Golden Fortress indeed! 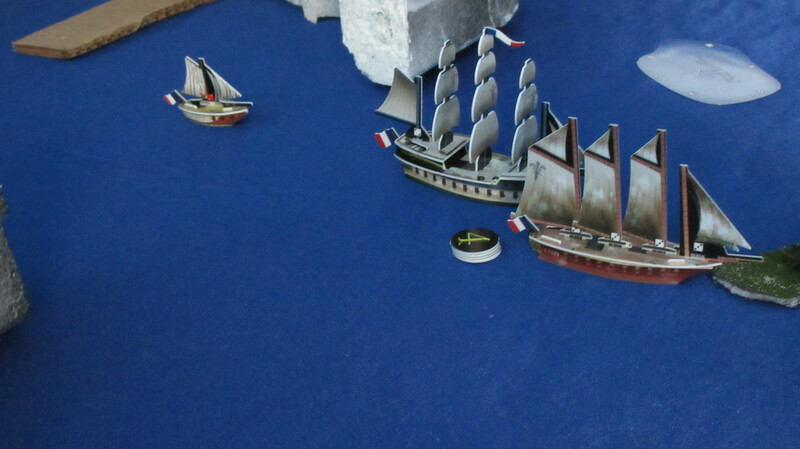 And now we are back in Karkuda, where the French flagships continue to cautiously venture further west, and the French have no good resources around. Similarly, the Americans have stockpiles of the 3 resources that aren’t currently valuable: food, spices, and luxuries. However, with a fortuitous change, the Americans could become extremely wealthy in time. For now they are trying to maximize their returns from the big northern island and destroy reefs in order to go east without danger. Notice the Freedom heading straight back to the whirlpool. I wonder what Ralph David is thinking? XD Also, Brent Rice is curious to learn from his fellow fleet mates that Luck and Ruby Islands are no longer producing resources. 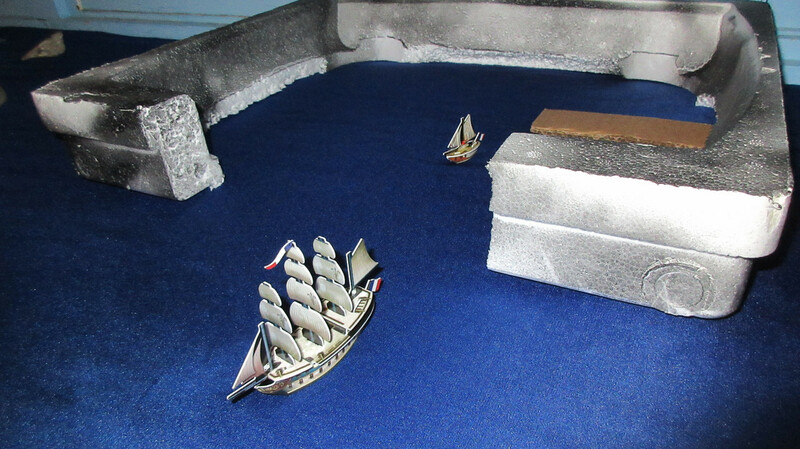 He is aiming the Bonhomme Richard south to investigate, while Commodore Preble aboard the President sends the Colonial Trader to Ruby Island. Preble is of higher rank, but listens to the wise Rice on making decisions. With that, another turn ends. This BR is a great example of just how much can happen on one turn, and the game will only increase in size from here. The JR battle seems to have ended, while the Caribbean is becoming very interesting. With both the English and Spanish out for revenge (the Spanish are mad the English started the conflict, but the English are p*ssed about the loss of the Viceroy), it could become a war zone very quickly. -With really interesting developments happening in the Sea of Allost and the Caribbean, Karkuda feels quite boring by comparison right now. This is mostly a coincidence of the resource change, but it’s a funny thing I noticed. -Lumber is nowhere to be found. Of all six resource types, lumber is the only one to not be discovered on an island yet. I hope to play a turn a day for the next 3 days, and hopefully more after that. Much more to come! Thanks for reading, and feel free to comment your thoughts! Turn 32 passed without incident, and this will be the shortest report so far. 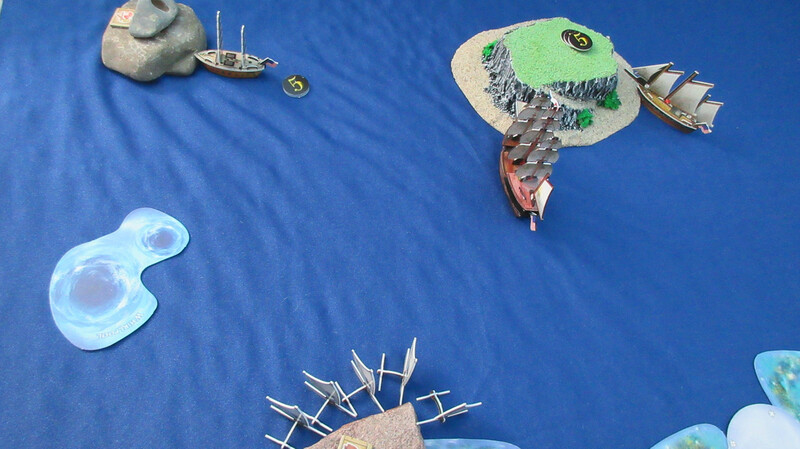 The Pirates have a logjam, with 5 ships leaving the kingdom from the southern entrance while two ships are delayed in getting in. 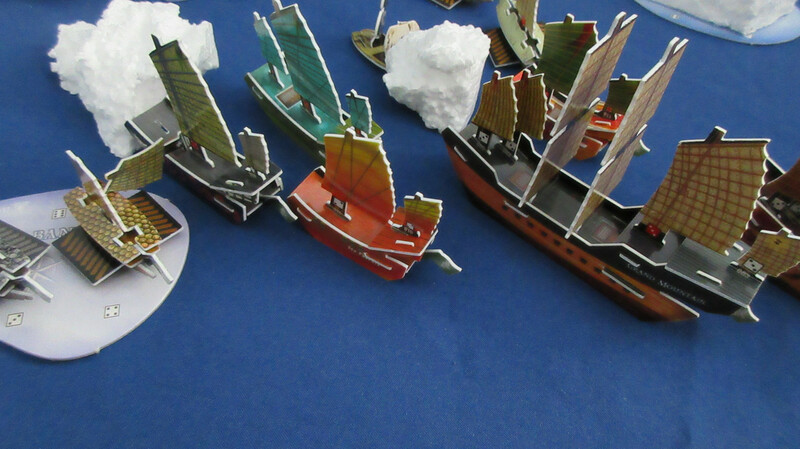 Jade Rebellion ships returning home for repairs and to unload textiles. At this point, in order to save time and not find and re-find coins over and over again for launchings and saving gold, I have begun to record HI gold tallies on an index card. As of now the Jades have 112 gold saved up in addition to those coins on their home island. The Battle of Fog and Ice is officially over, with the Jades victorious. However, the Jades have a lot of repairs to carry out, thus why they’re returning to their HI rather than pressing their attack against an unknown enemy of unknown strength. 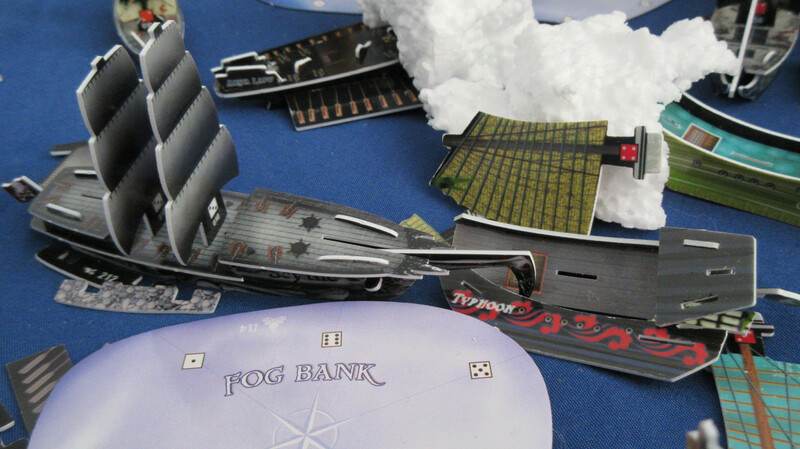 Notice the icewrecks “fleeing” into the fog, including the newly possessed Clear Wind. This is the somewhat complicated English crew logistics situation. 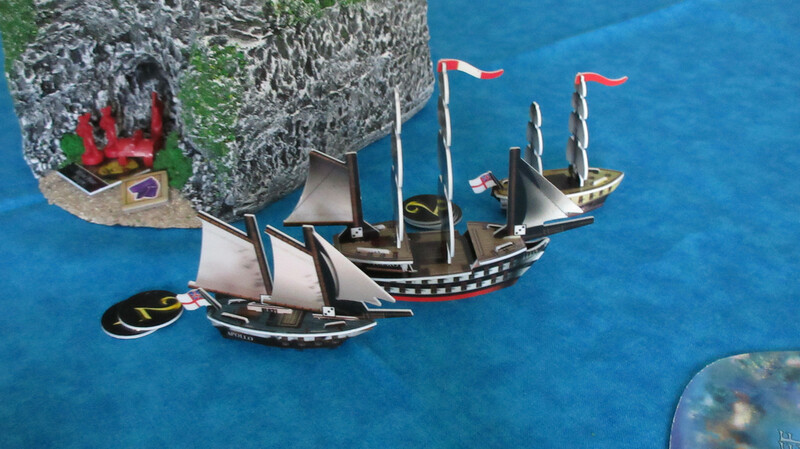 The Lady Provost has docked at their HI, and Thomas Gunn has taken the helm of HMS Lord Algernon, the new English flagship whose crew complement is now complete. 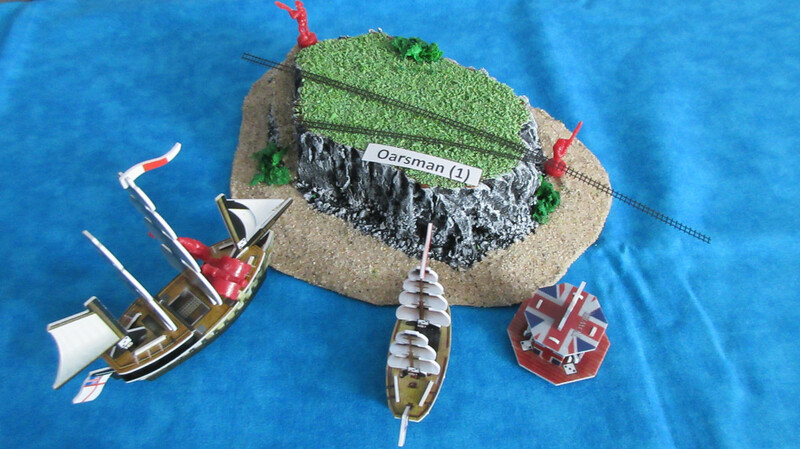 The Lady Provost still has the Burma’s old captain aboard, and he has now spent far more time as a passenger on the Viceroy and Lady Provost than as captain of his own Burma! XD The Starbuck is carrying a rope/cable with L length, which cost the same as the ladders. 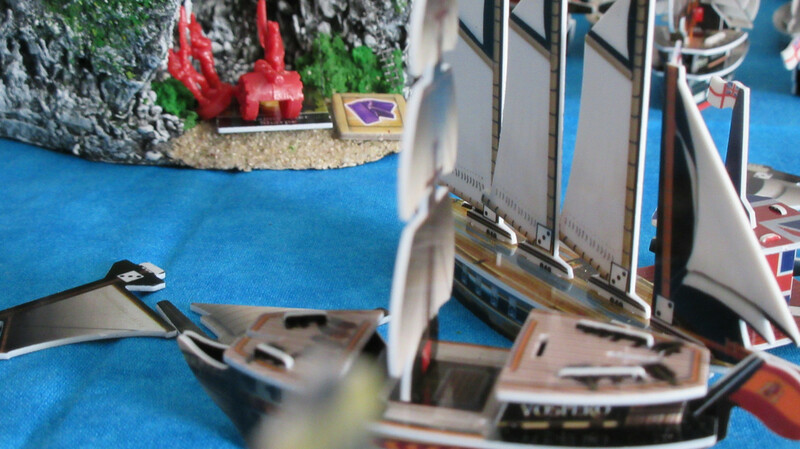 The Burma has used an explore action to take one of the strong cables and temporarily given her helmsman to the Starbuck. Those crew changes are represented here, but also notice how the English have gotten troops down the ladder from the summit of Diamond Rock to the cave halfway up! 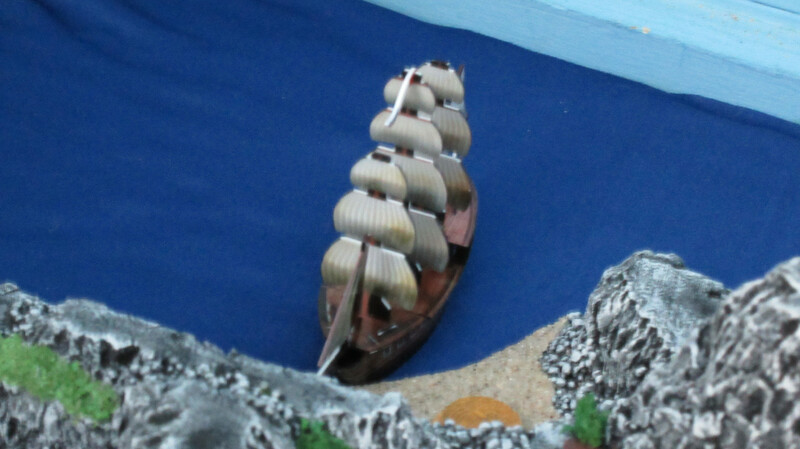 The Aguila docks home 4 metals, netting the Spanish 24 gold which they use to purchase El Galeon de Gibraltar with a captain, helmsman, cannoneer, and exploding shot. 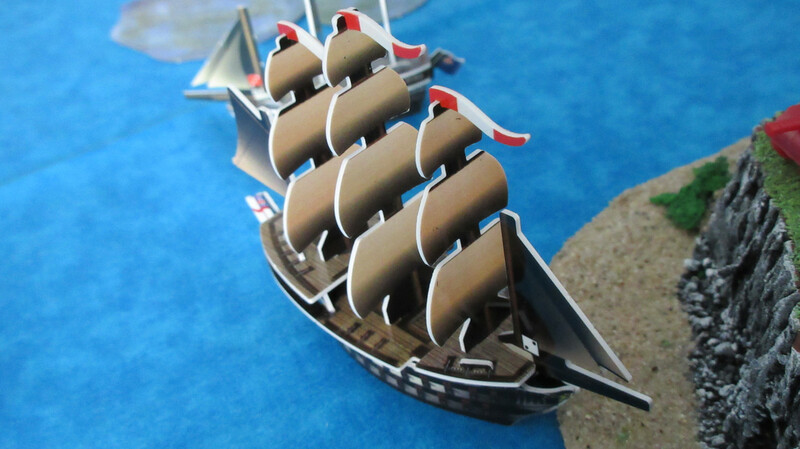 The Matthias Vospero will finish repairing next turn, at which point the Spanish will have 4 healthy warships ready to sail out. Nothing of note happened in the Sea of Karkuda this turn. 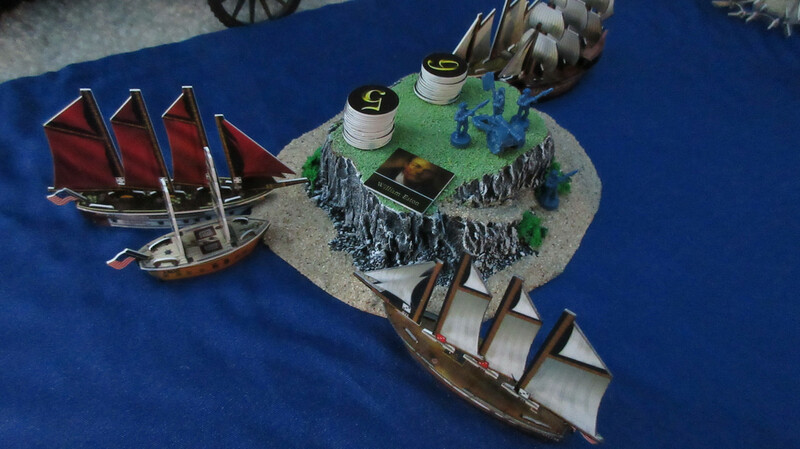 I hope to play two turns tomorrow and one on Tuesday. 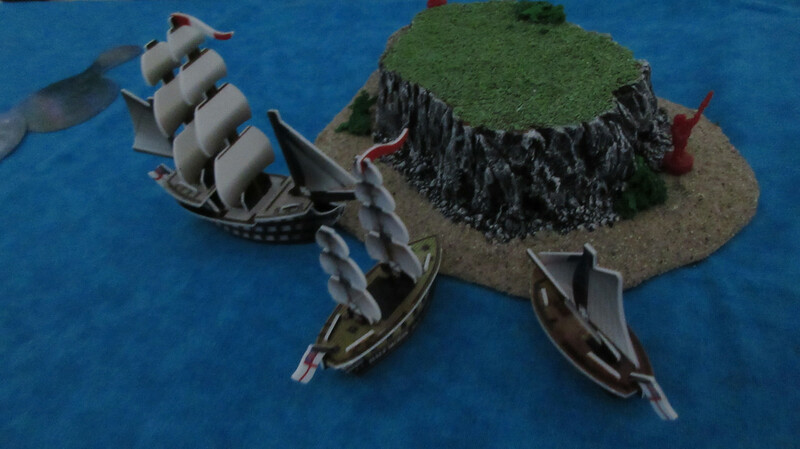 With essentially nothing of note happening in the Sea of Allost, we jump straight to the Caribbean, where the English have spent 49 gold for HMS Galapagos, HMS Serapis, the Gibraltar flotilla, and another artillery unit. 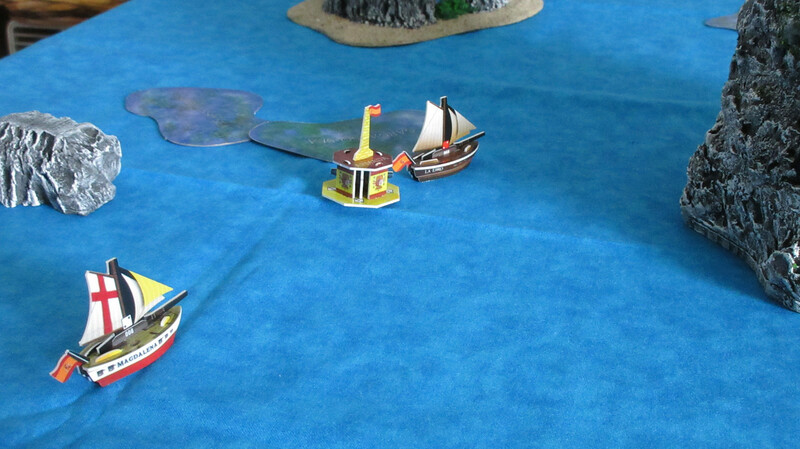 In the background, HMS Algernon has set sail. 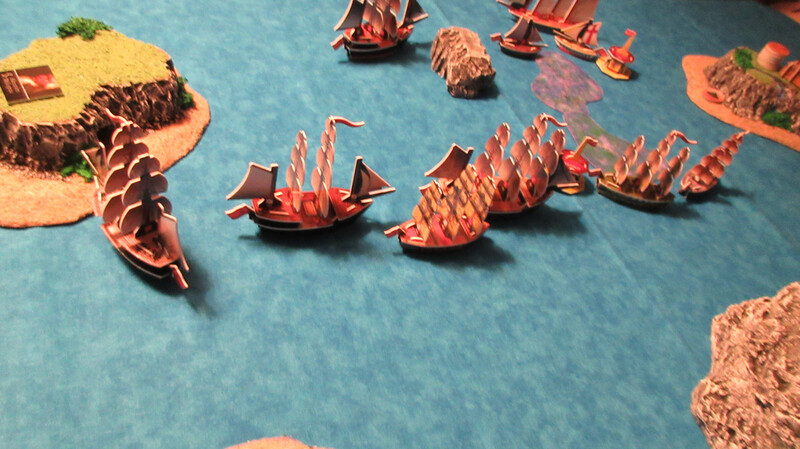 Mostly a coincidence, but the Spanish are sailing in line of battle formation. 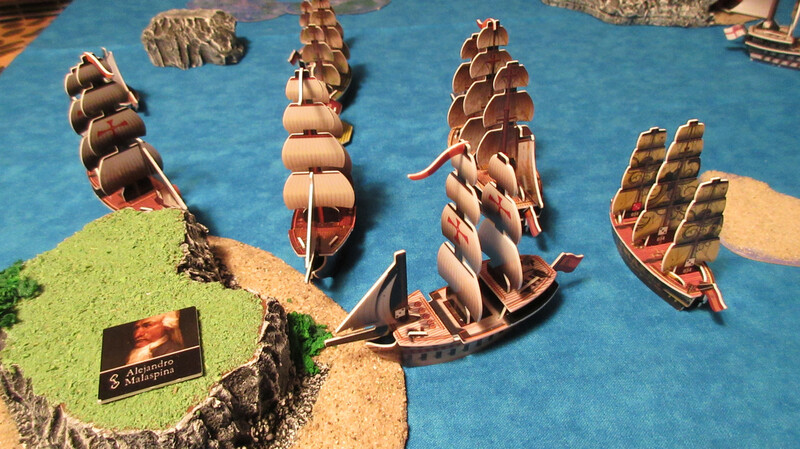 At the right and head of the line, the San Francisco and Alquimista head for Paradise Island, while the Tartessos, San Estaban, and Galeon de Gibraltar wait for the Matthias Vospero to finish repairing. The French discover The Flat!! 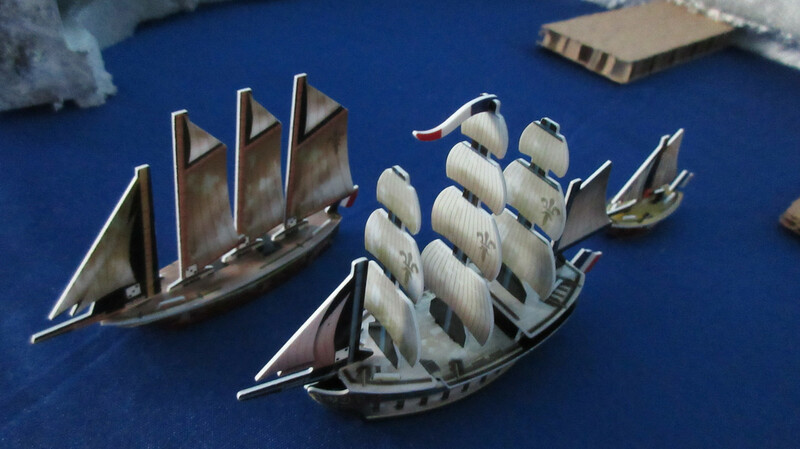 The French admirals aboard those two flagships are excited to tell the rest of the fleet and get some cargo ships out there. 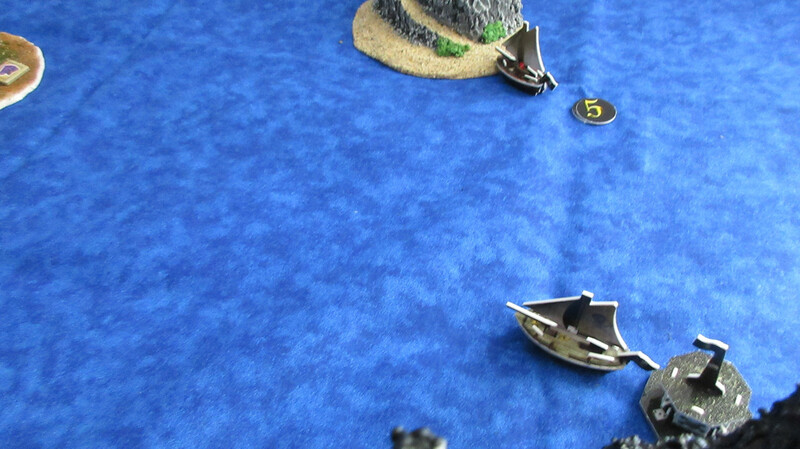 Ralph David steered the Freedom right back to the whirlpool near the American HI, and went through it to emerge with a lucky 2 from the same whirlpool that allowed RD to attack the Pirates from earlier! Now the Americans have a direct link from their whirlpool to this one, and will not have to roll for location when traveling between the two. 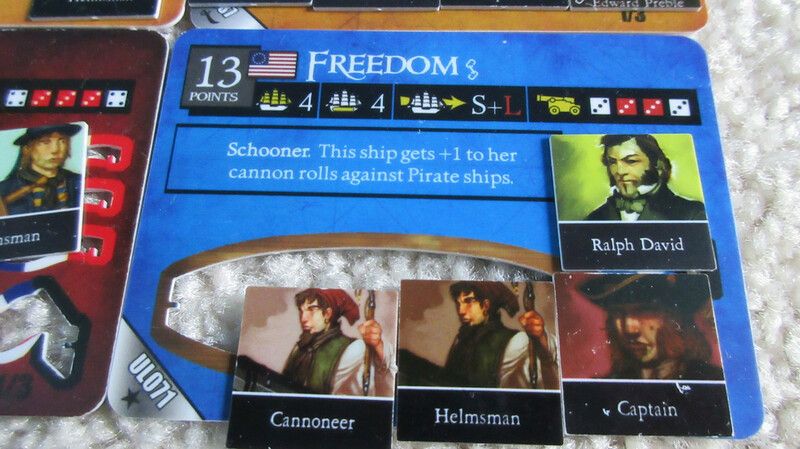 Now the main question is: can Ralph David instill his hatred for Pirates in other American officers? 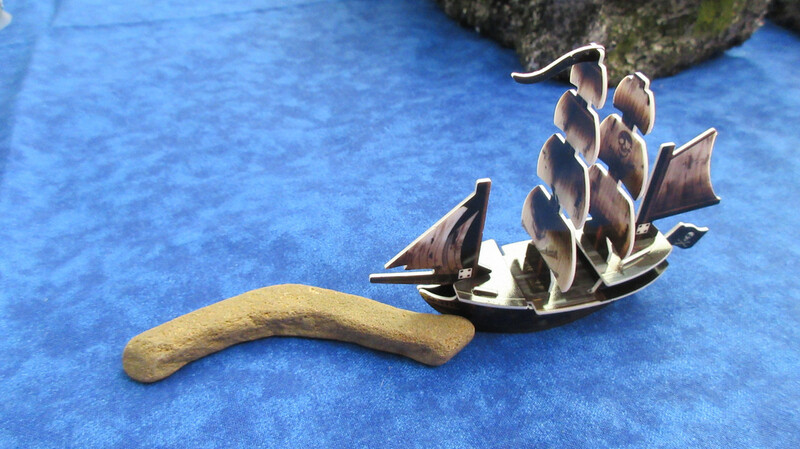 The Wasp doesn’t find any gold on the beach previously explored by the Bonhomme Richard, so her crew bravely ventures east and finds gold on an adjacent beach! 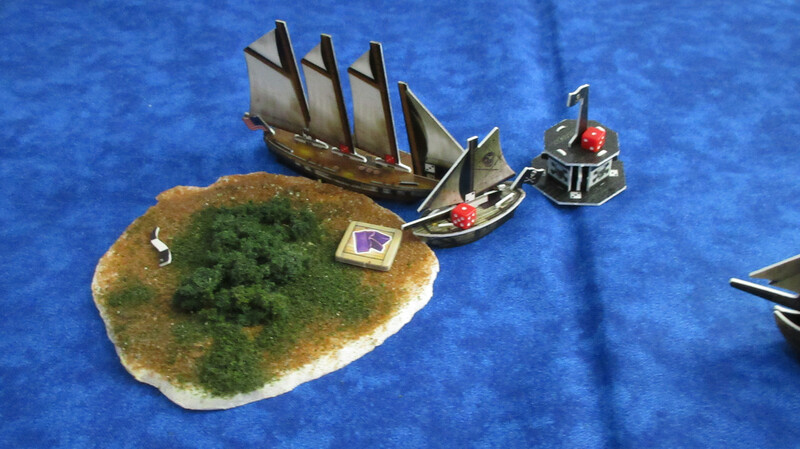 The Colonial Trader reaches Ruby Island, where her crew finds metals, a brand-new resource to the Sea of Karkuda! 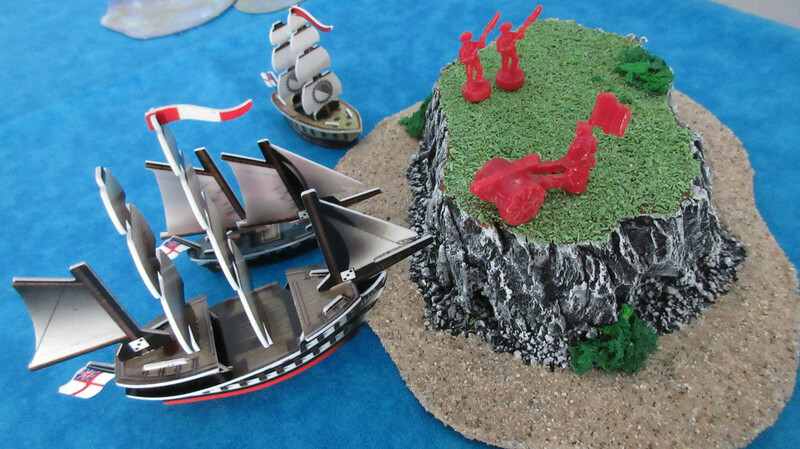 Similarly, the Bonhomme Richard finds luxuries on Luck Island! This resource was previously on Ruby Island and hasn’t been a valuable resource for much of the game, but the Americans are happy to have productive islands south of their HI again. 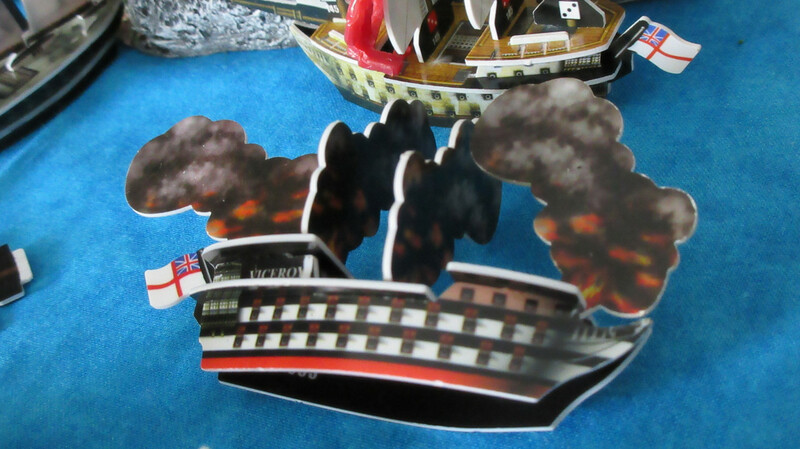 Even more importantly, the Congress finally succeeded in blowing up a reef!! This first-ever occurrence looks like it will change the dynamic around American waters, as the rest of Karkuda (possibly…) will now be open to American exploration without danger! I won’t be able to play more than a turn tomorrow, but I’m generally hoping for at least 2 turns a day Wednesday-Saturday.